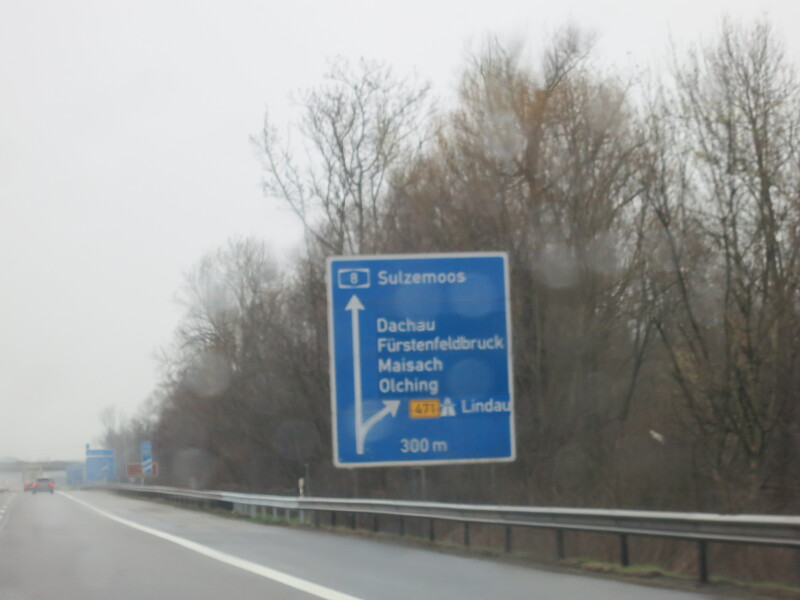 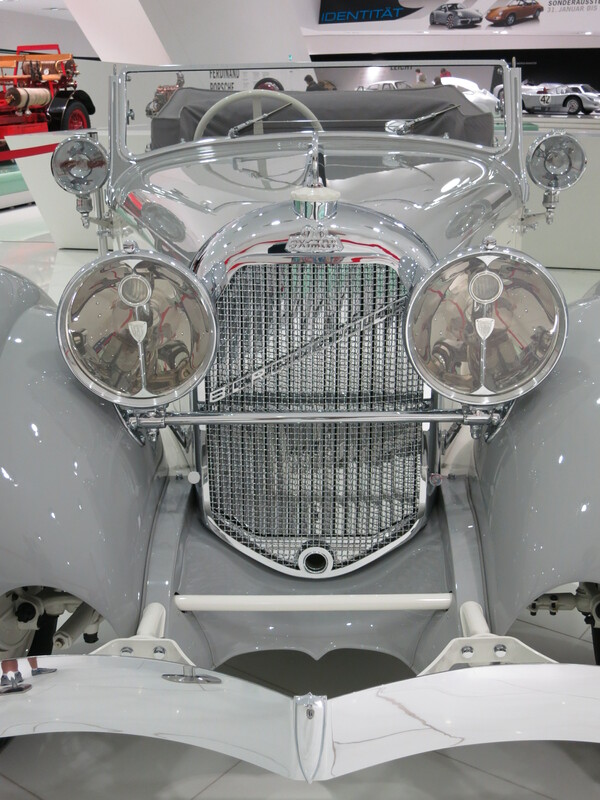 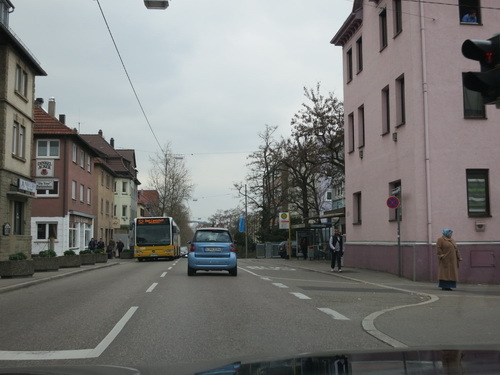 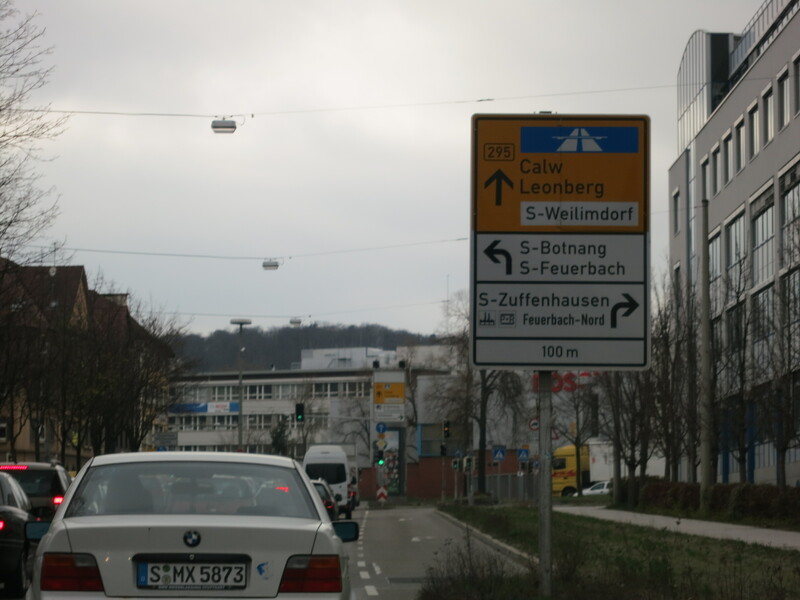 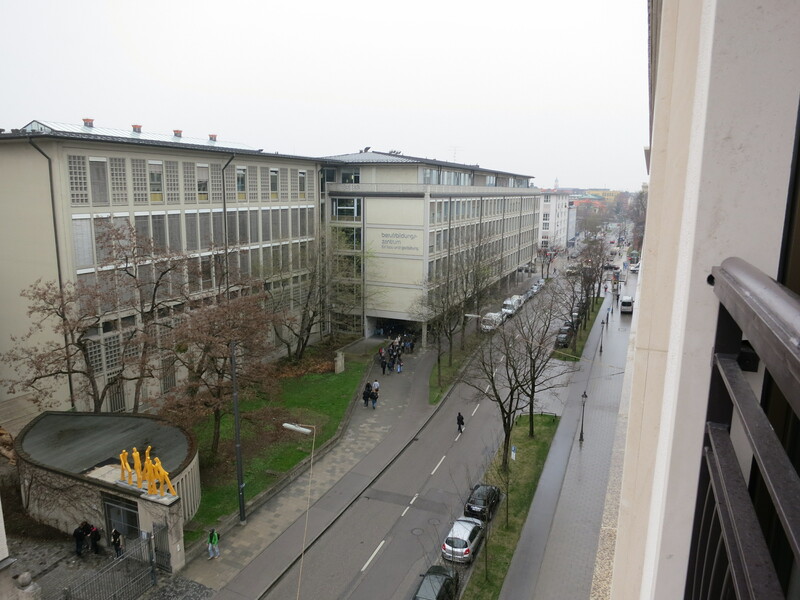 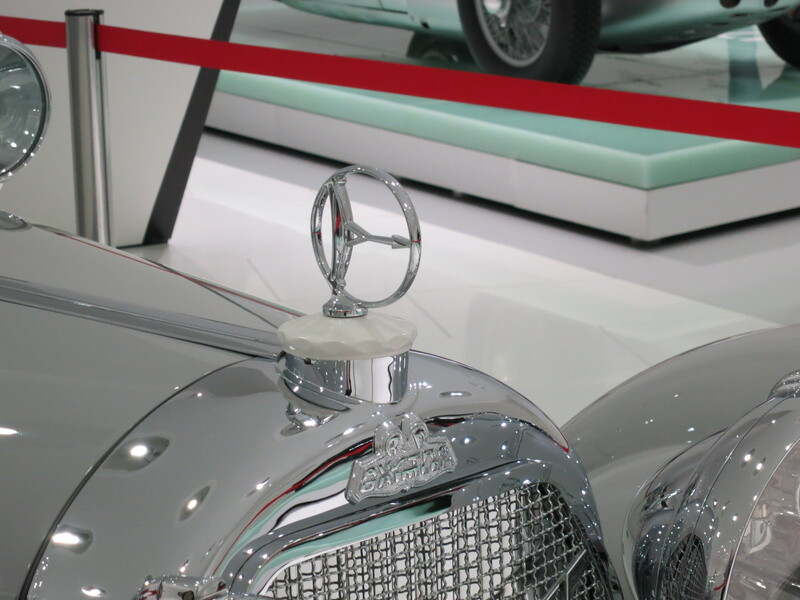 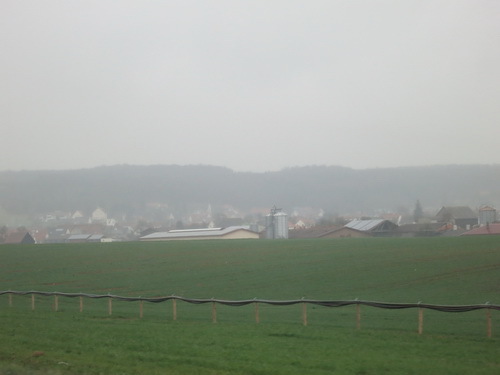 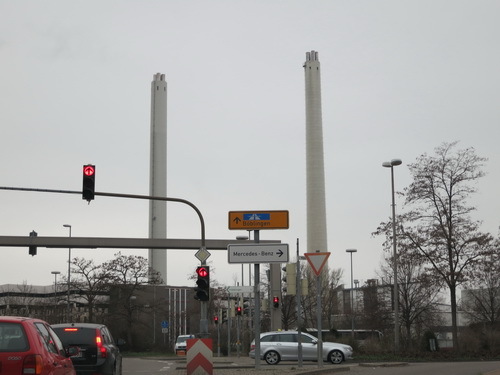 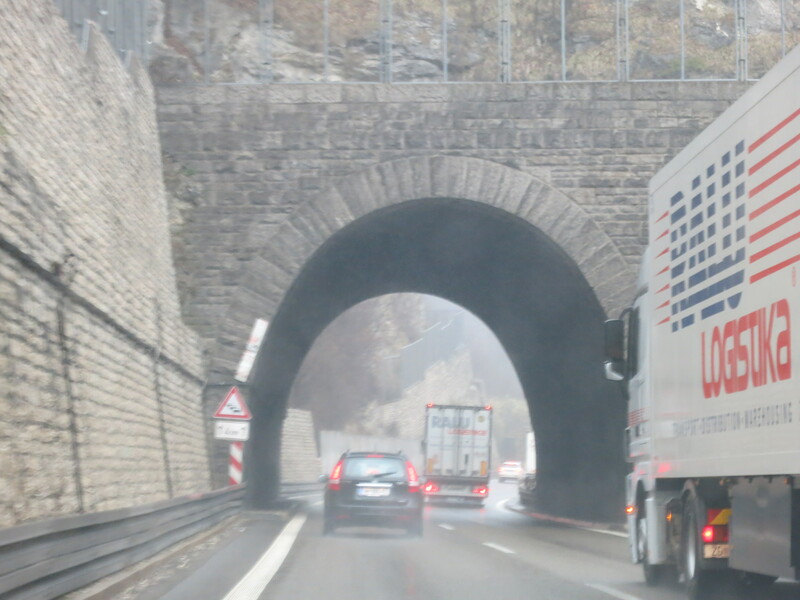 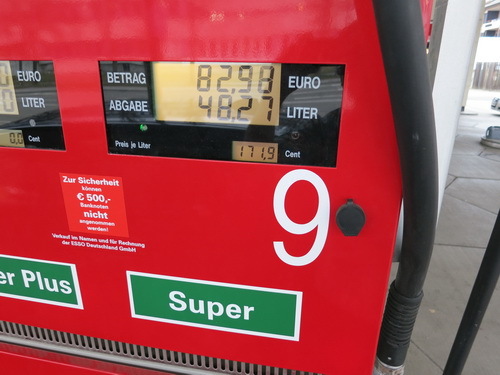 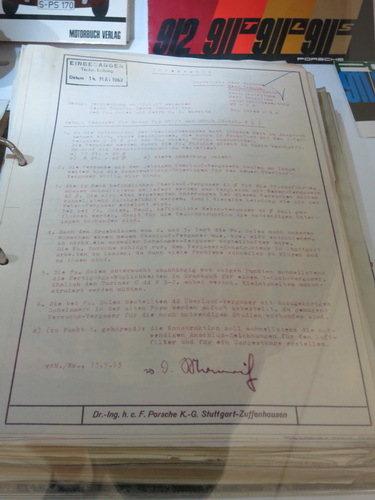 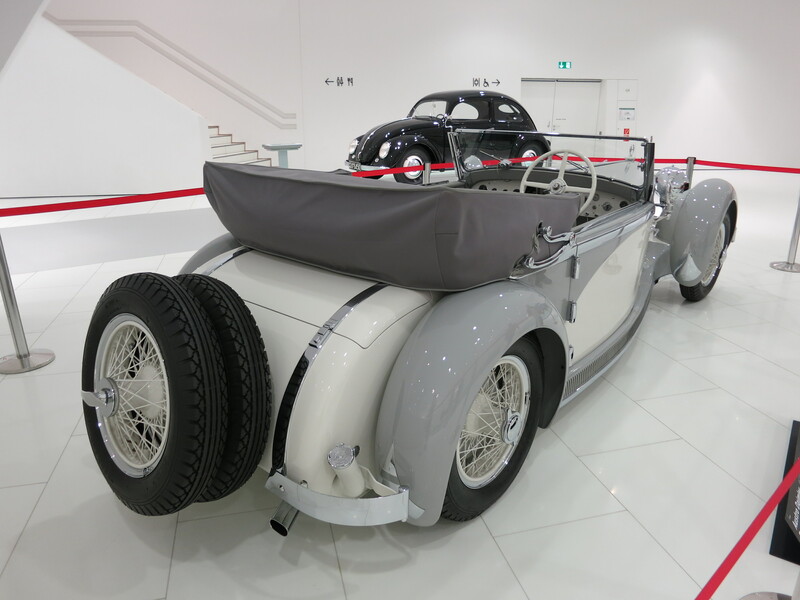 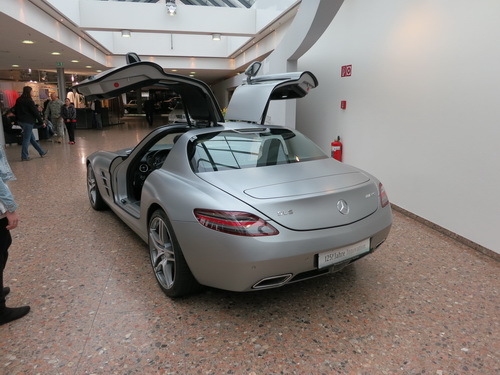 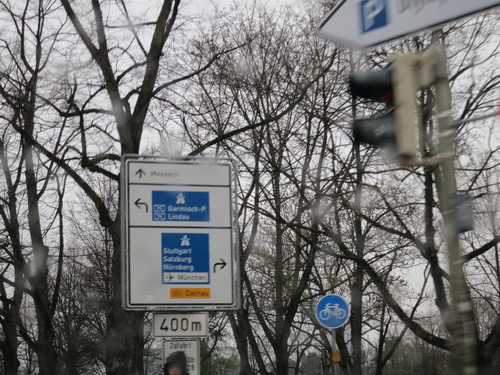 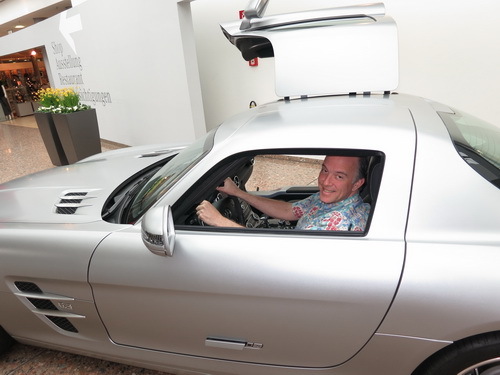 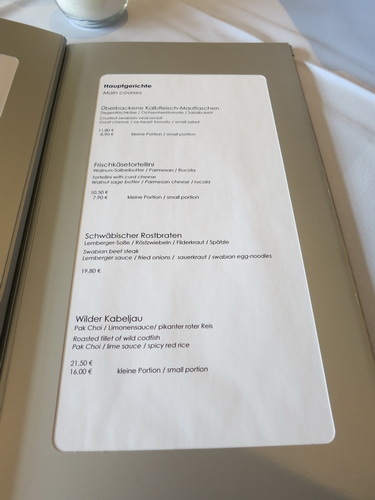 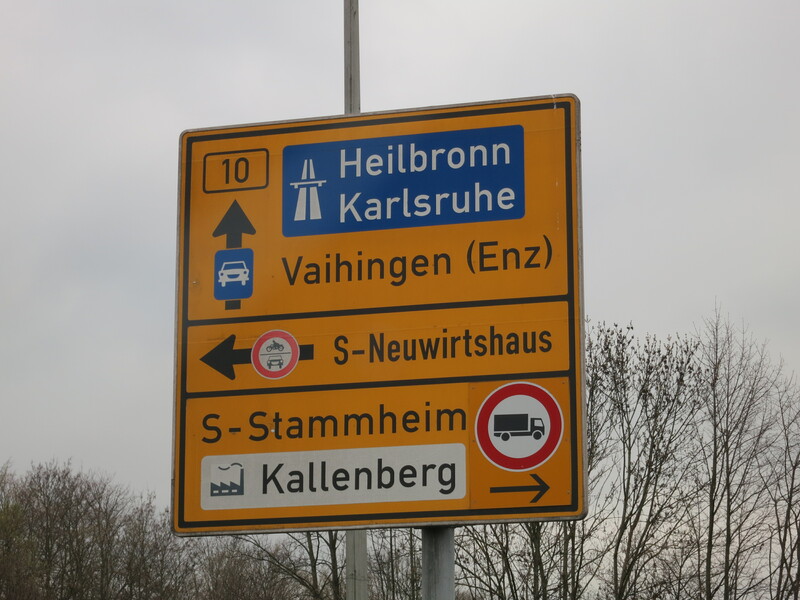 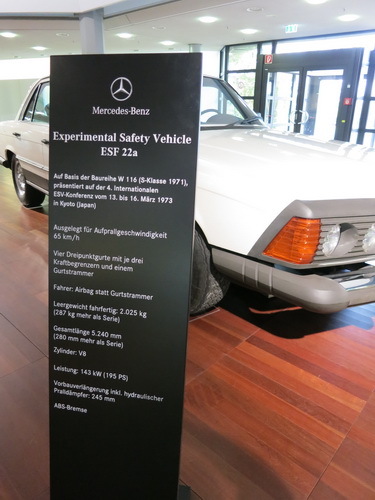 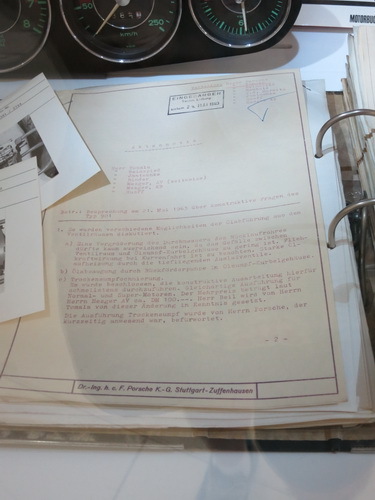 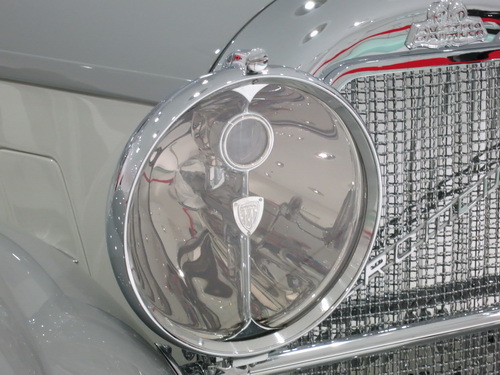 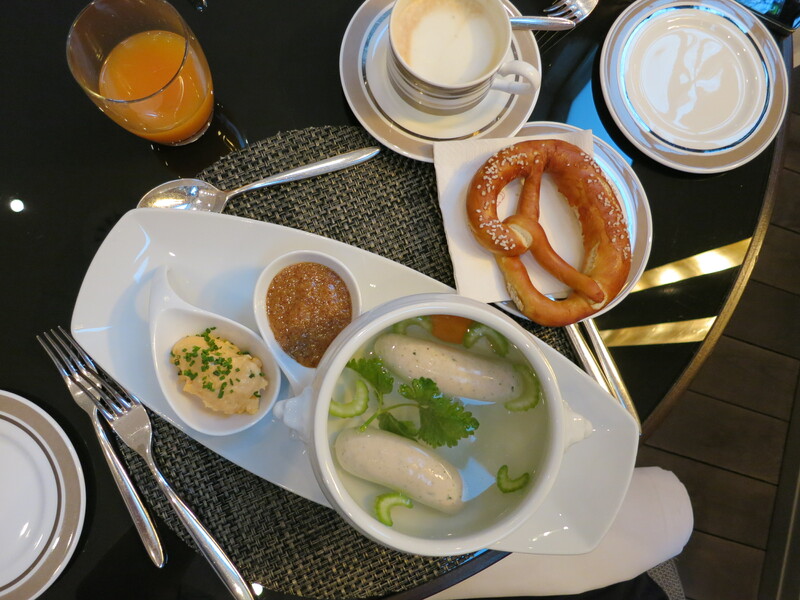 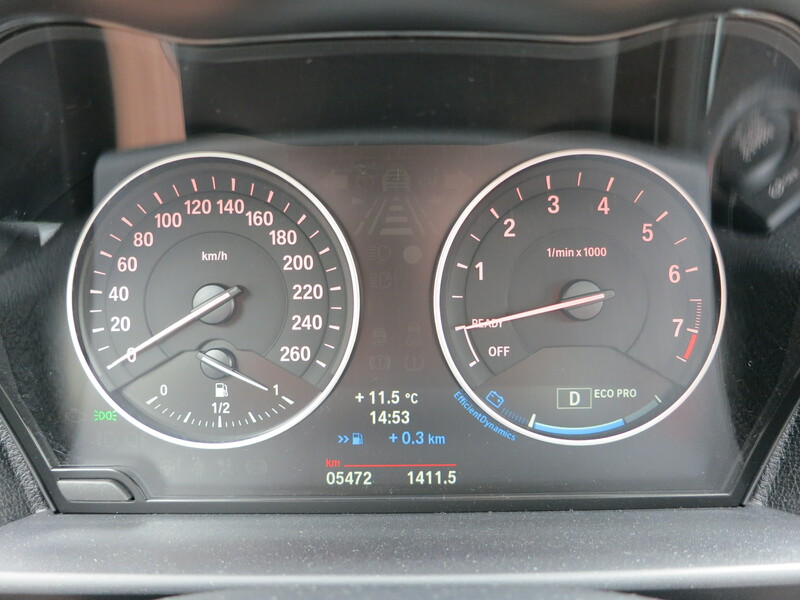 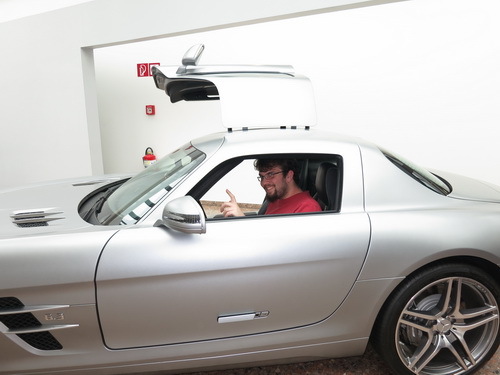 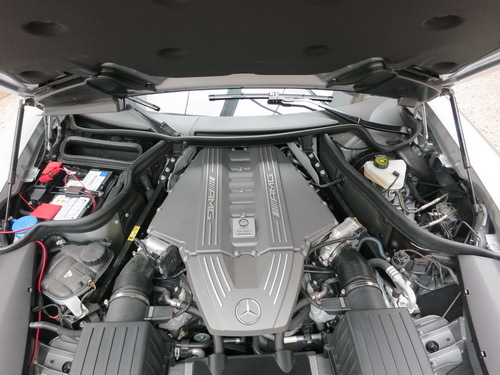 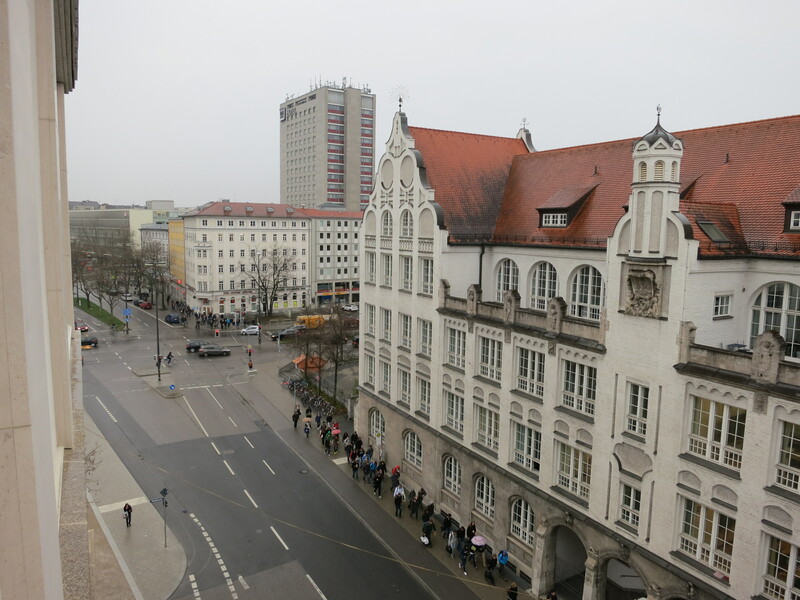 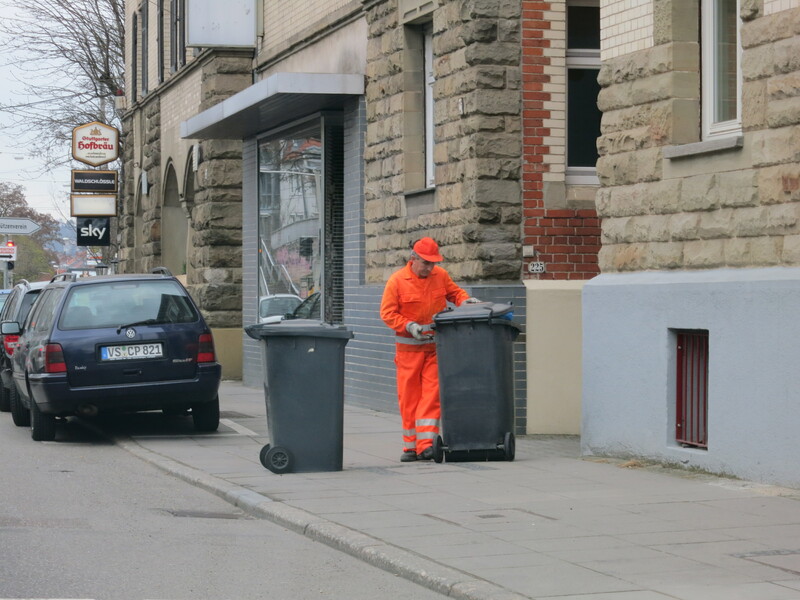 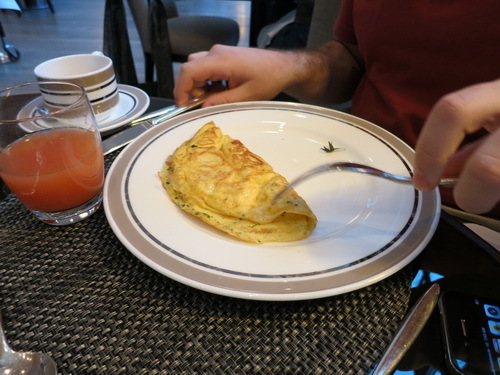 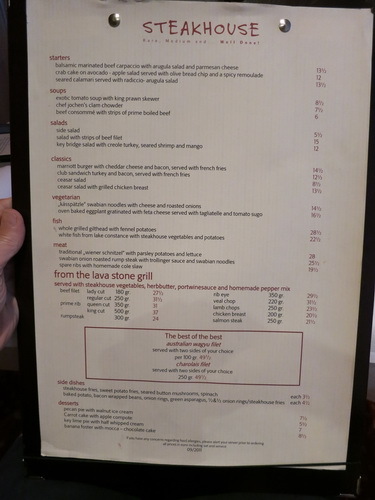 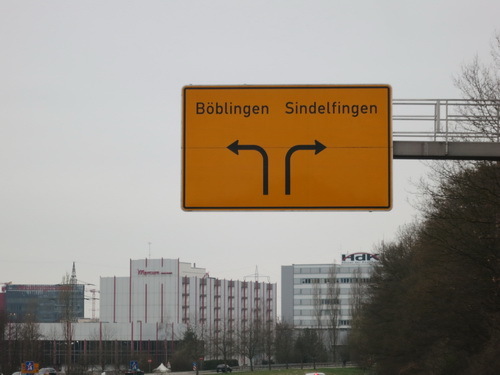 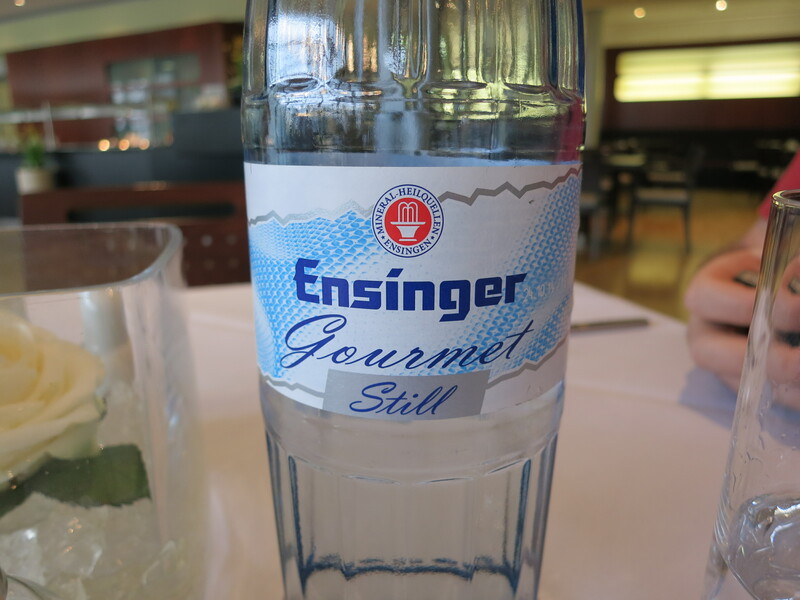 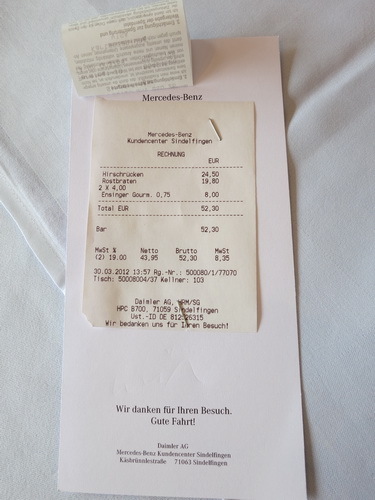 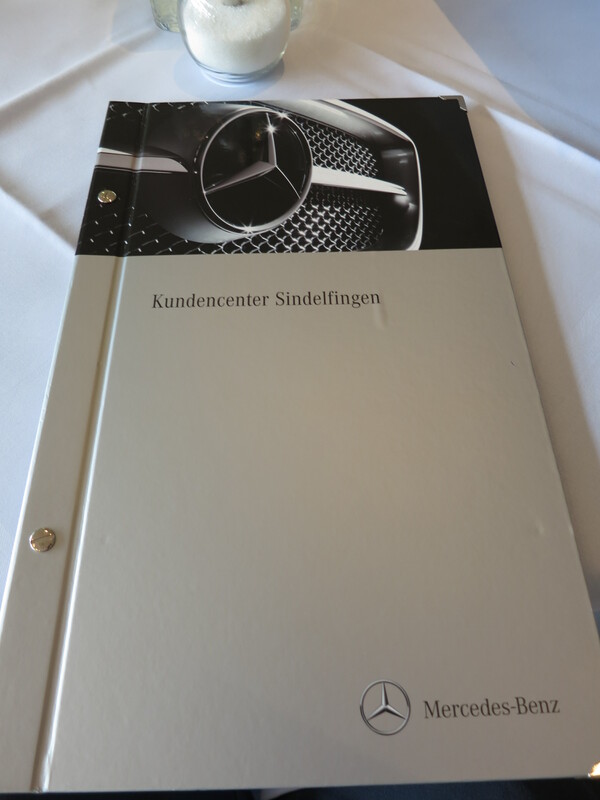 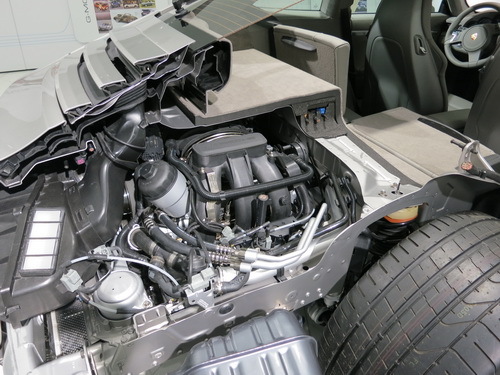 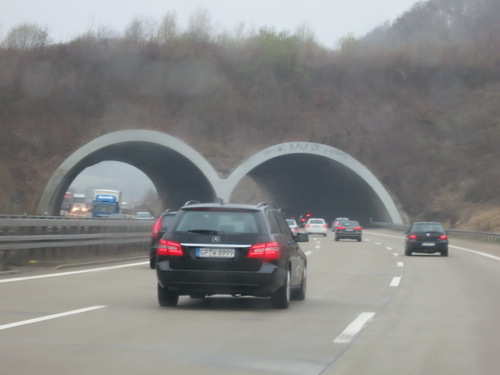 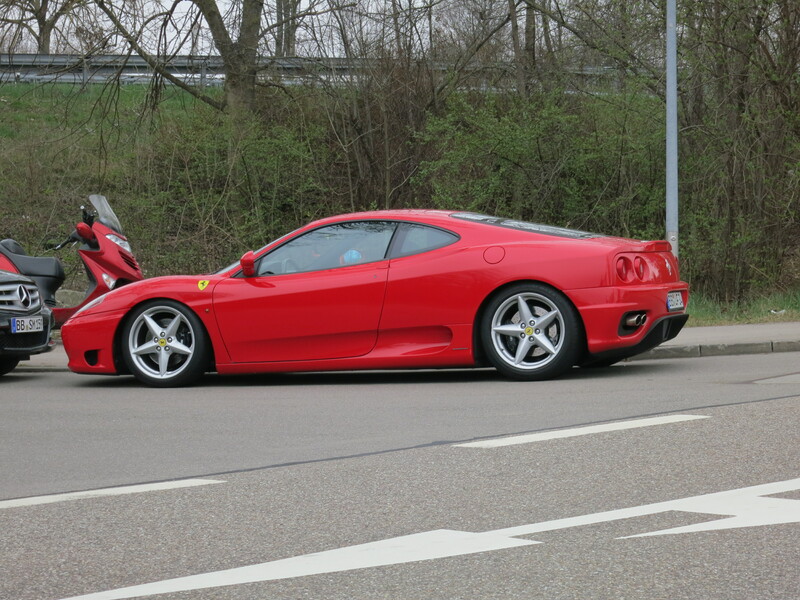 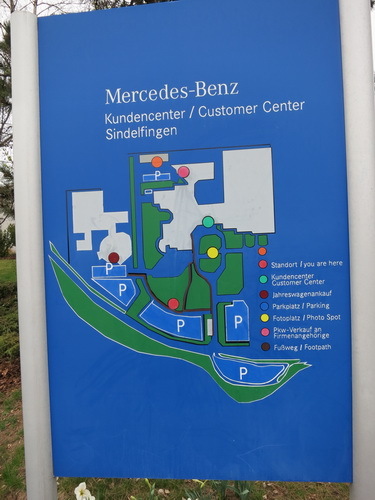 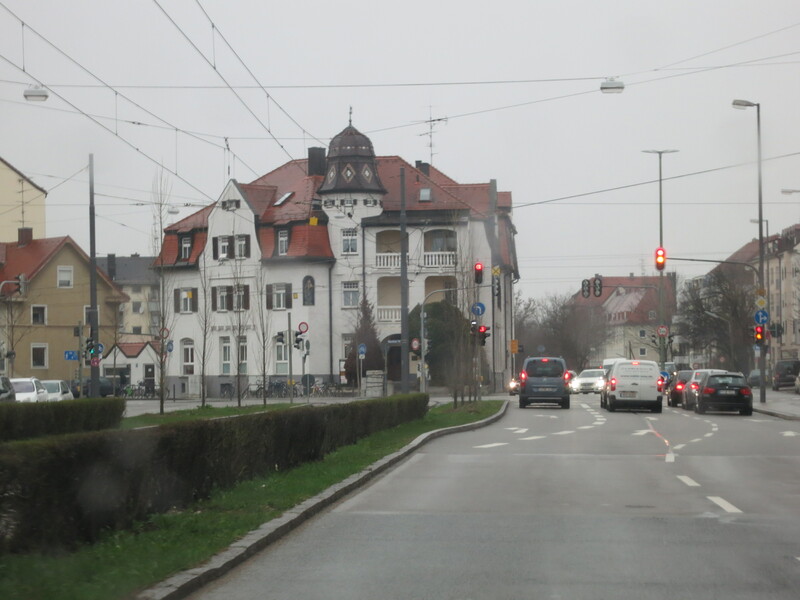 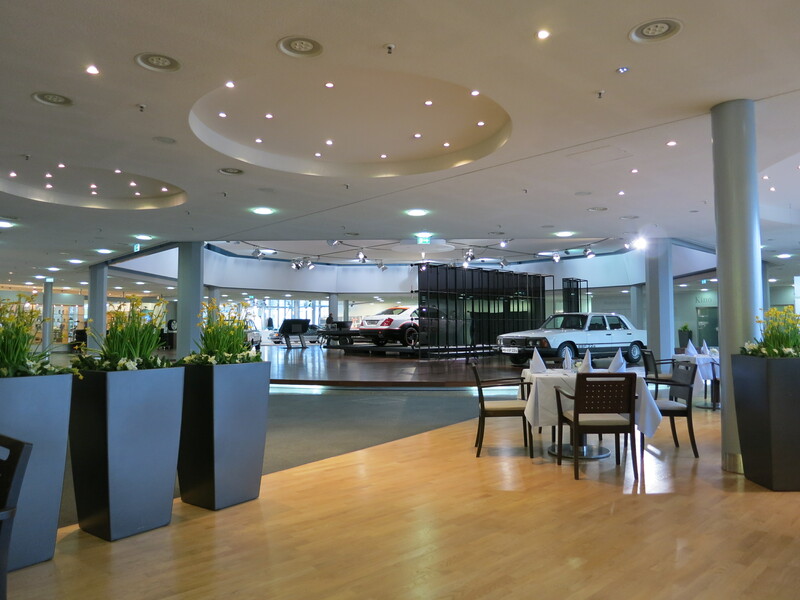 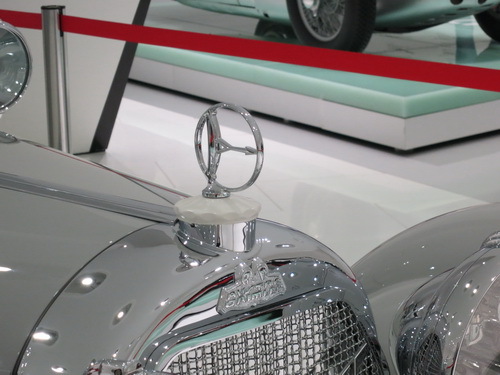 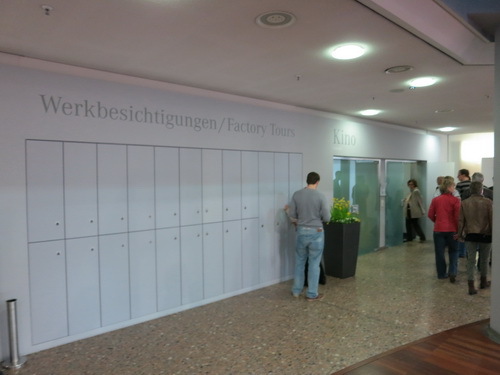 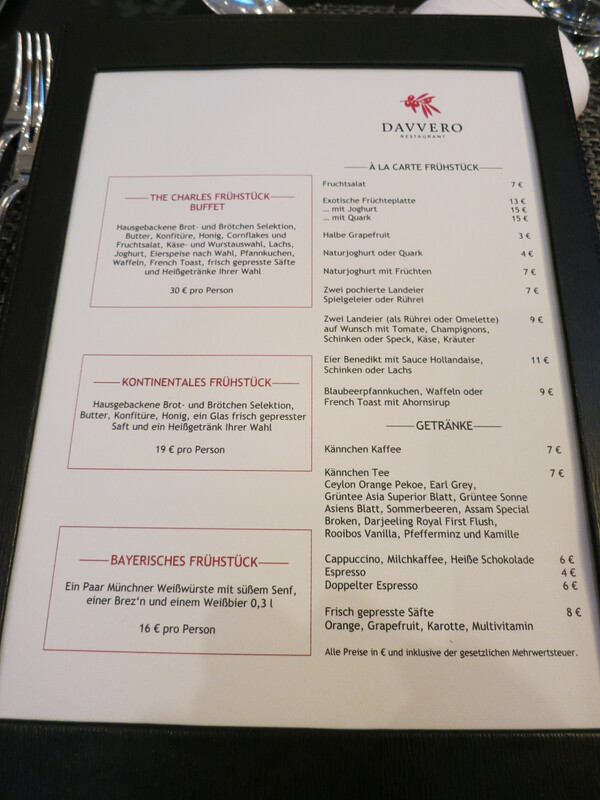 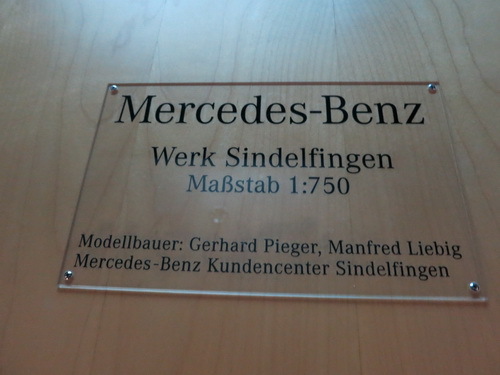 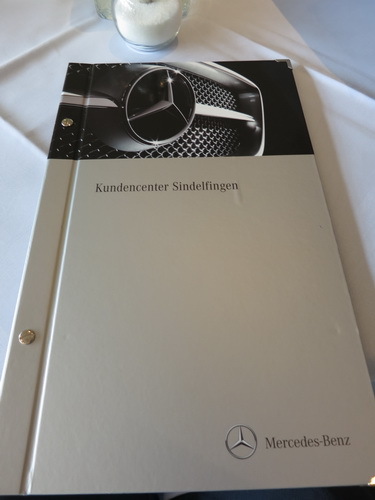 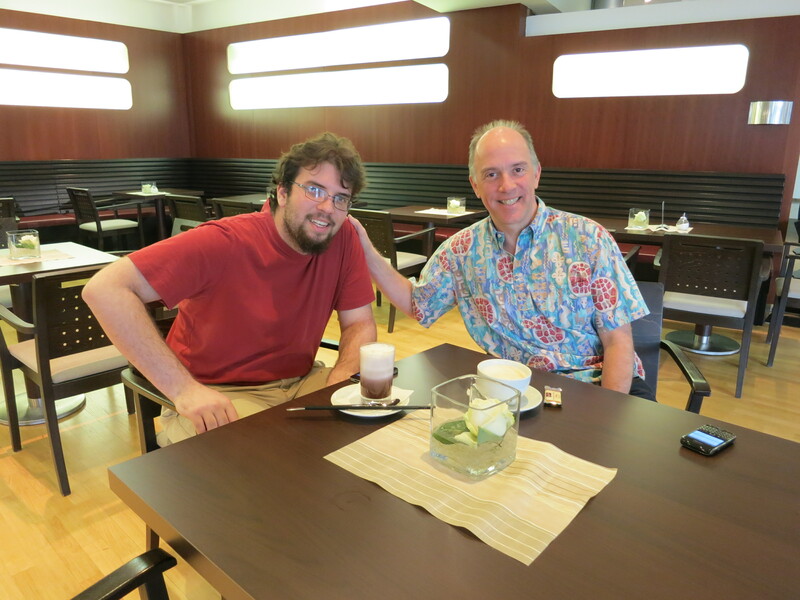 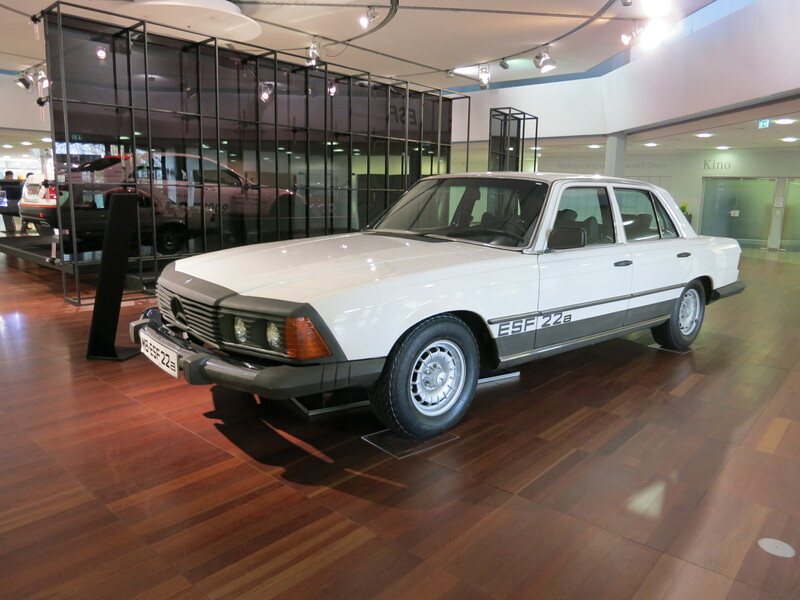 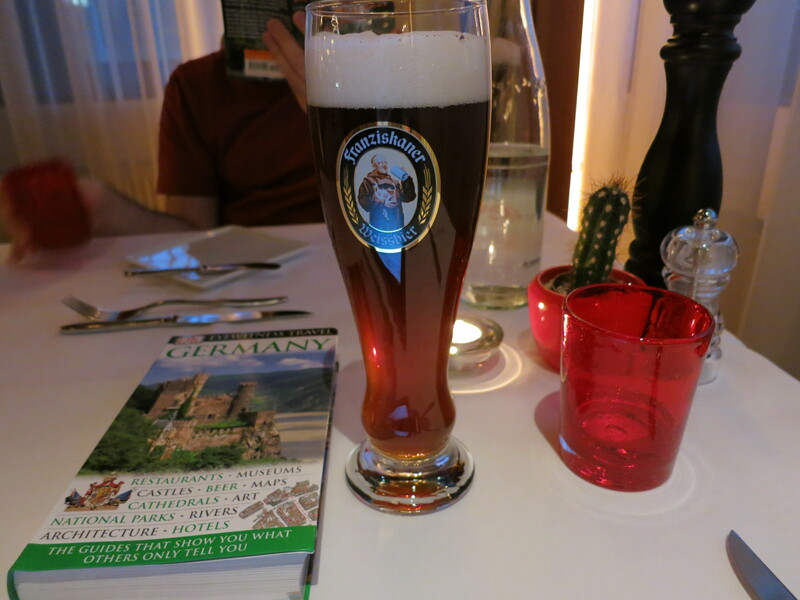 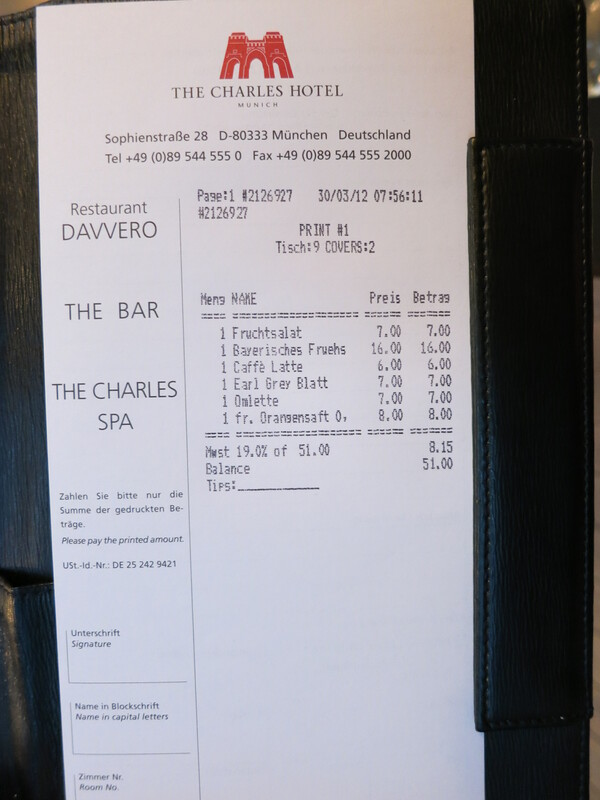 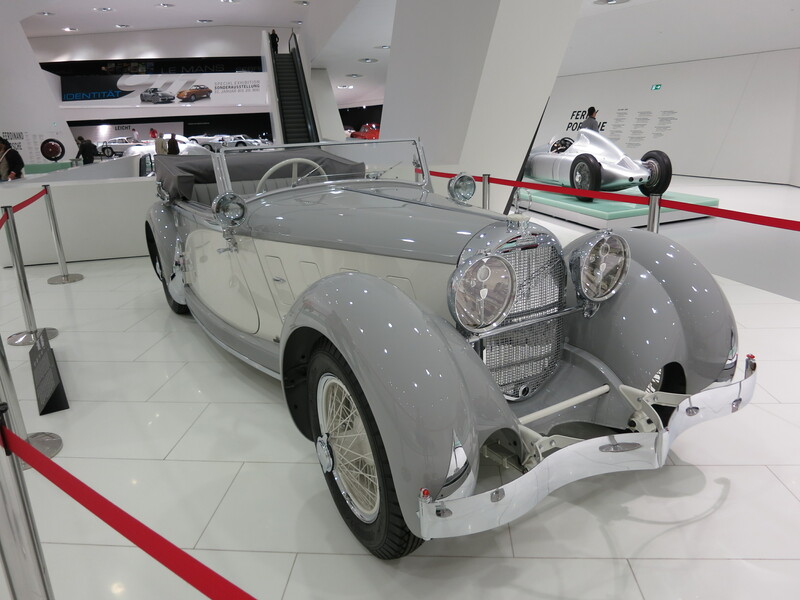 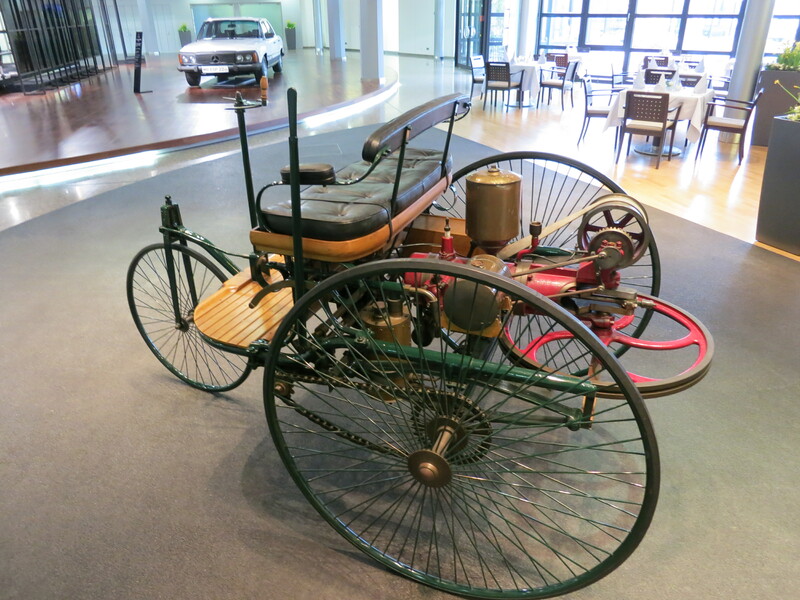 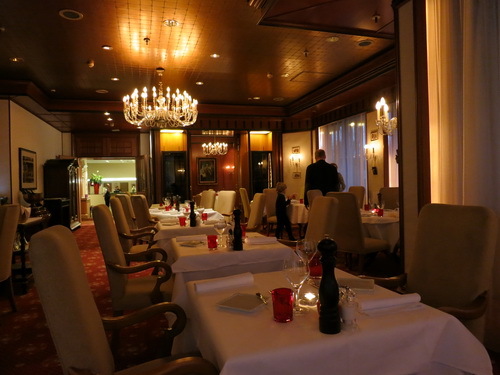 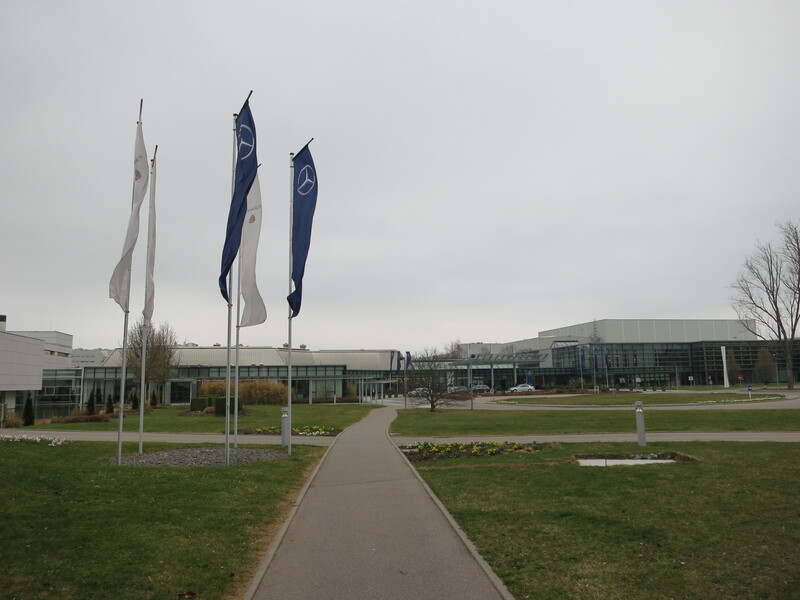 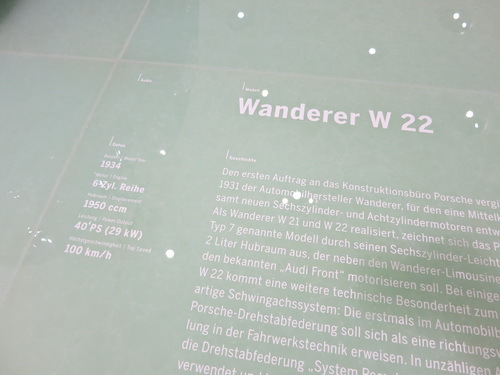 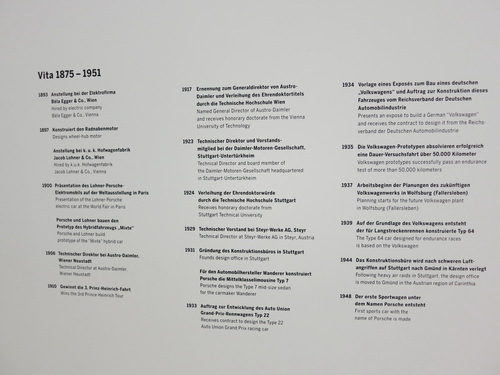 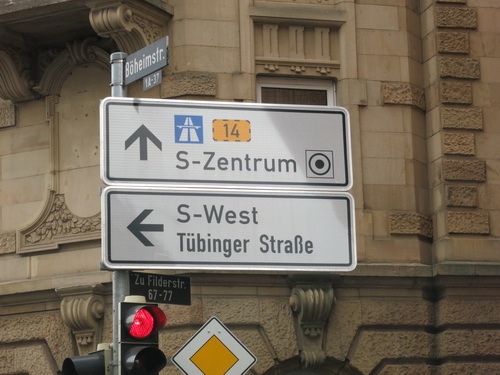 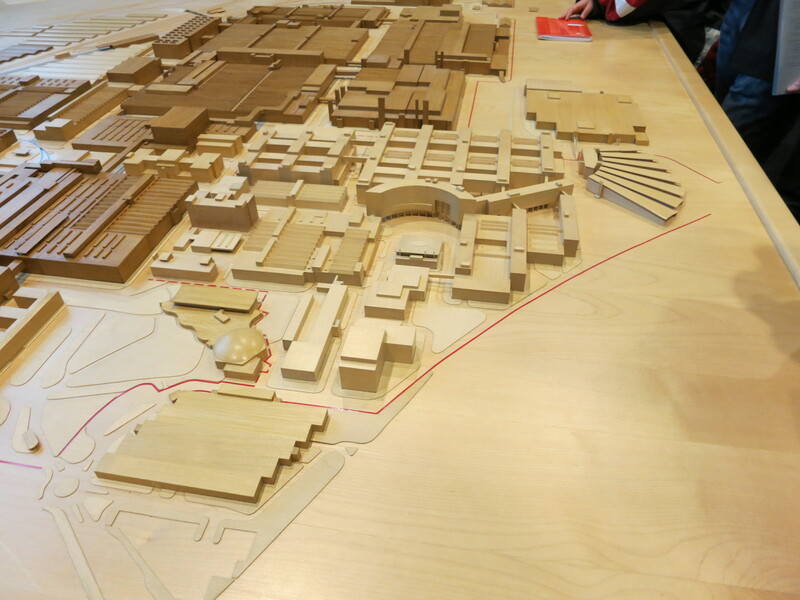 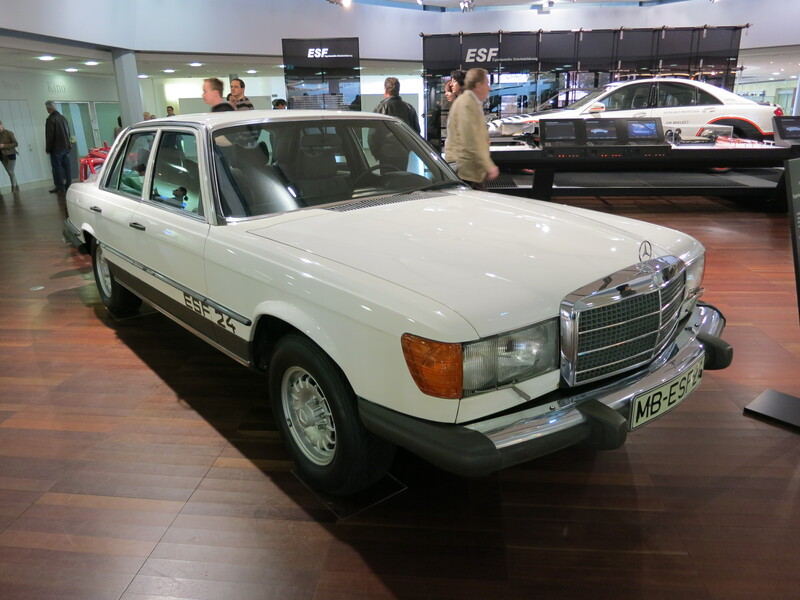 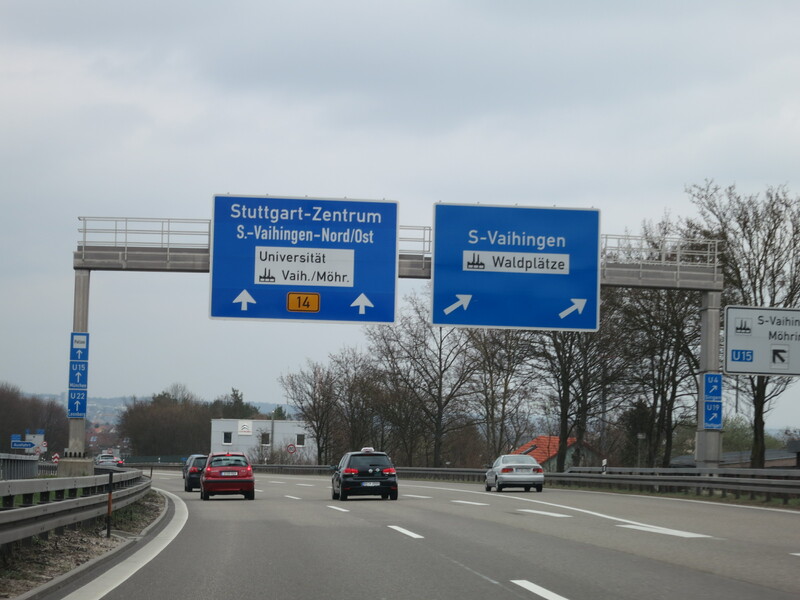 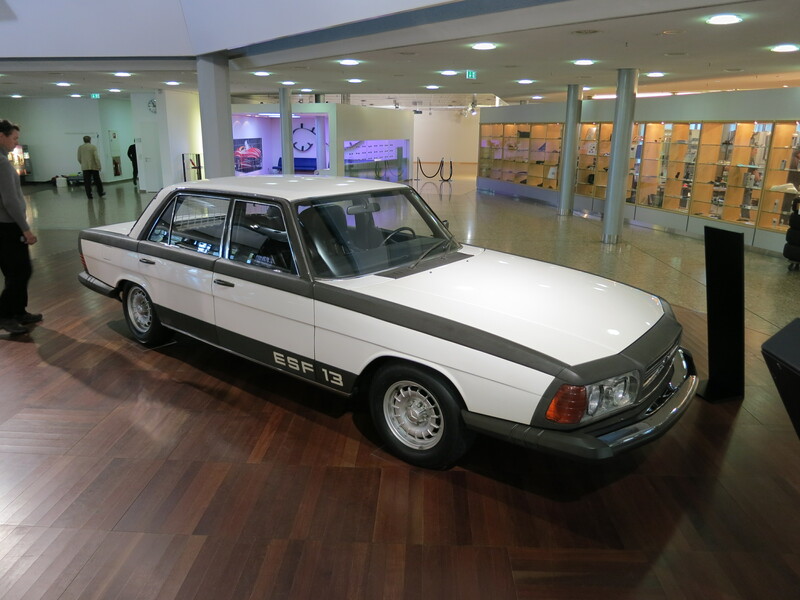 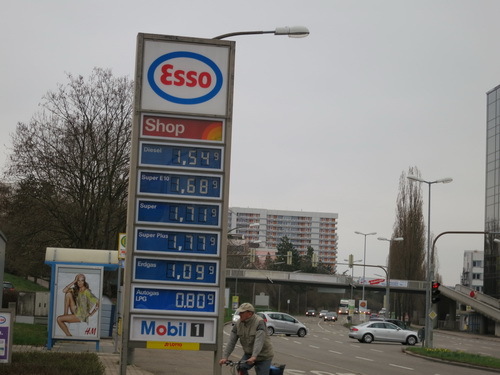 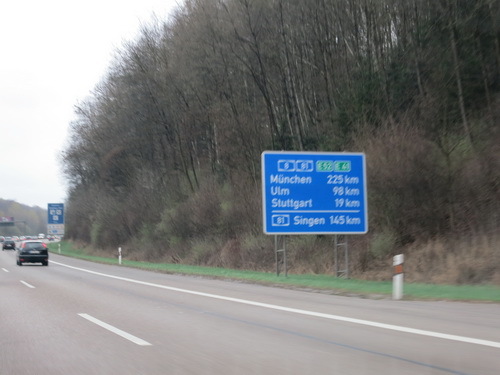 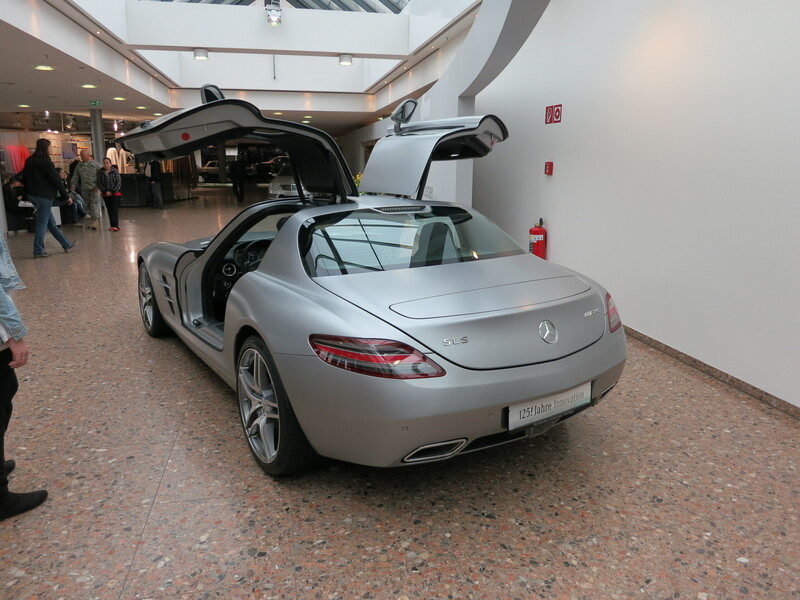 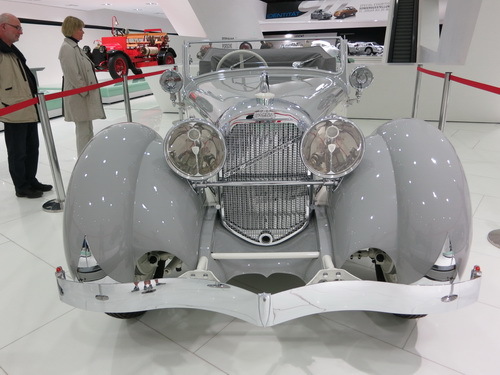 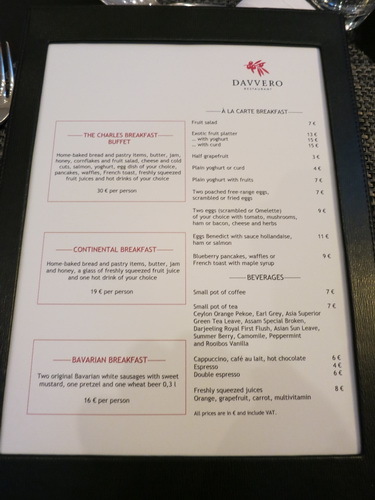 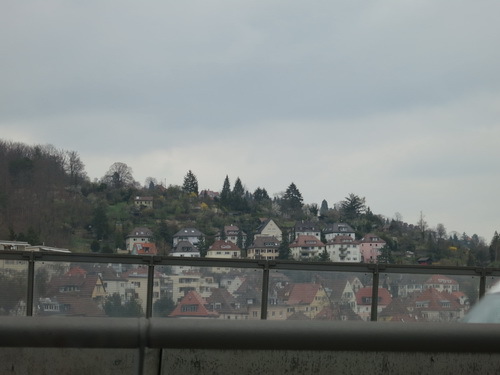 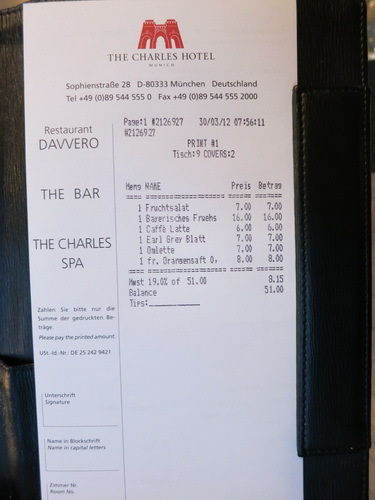 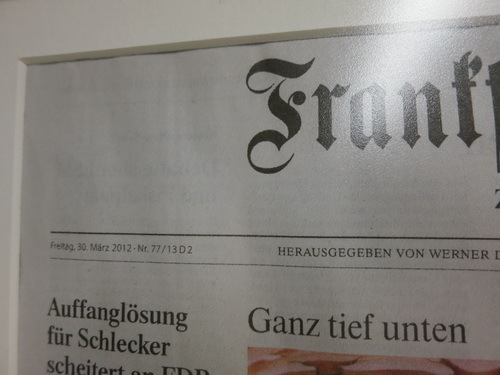 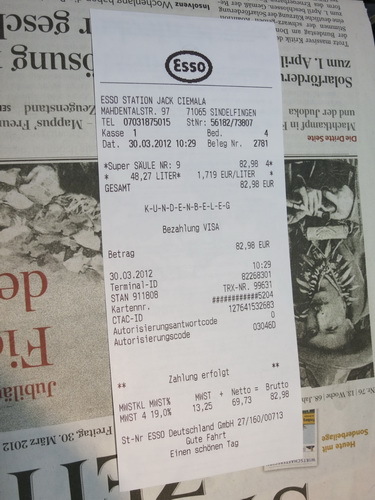 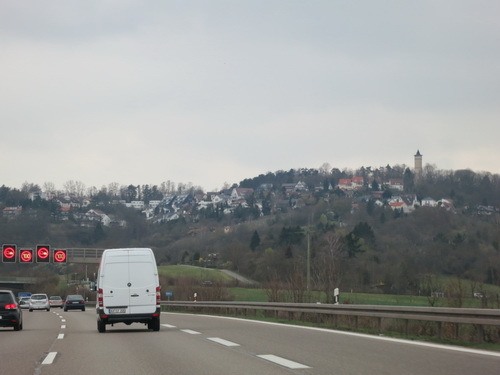 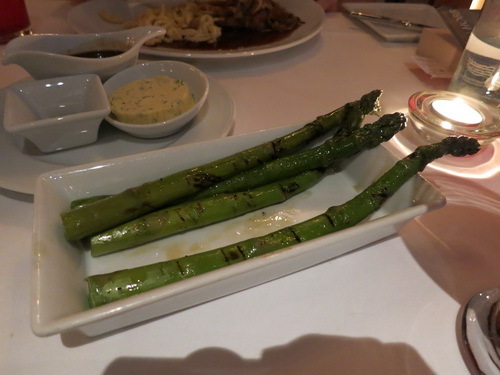 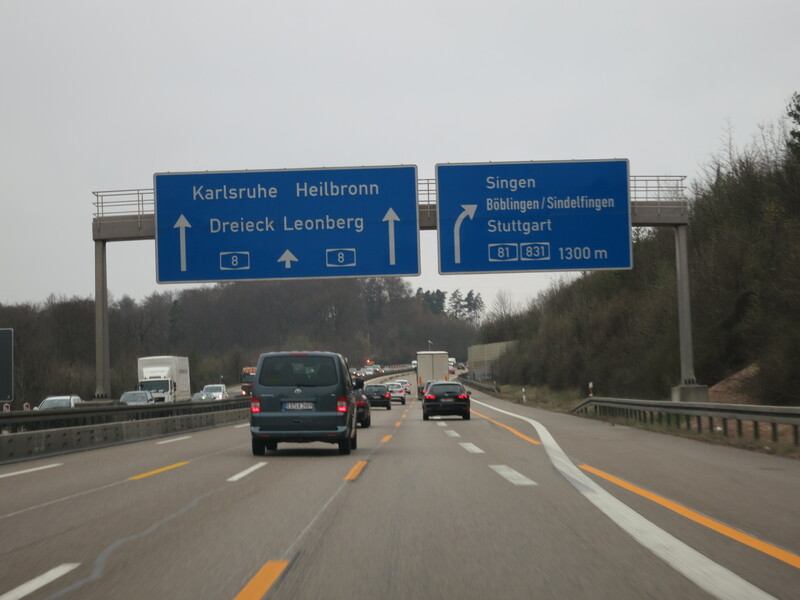 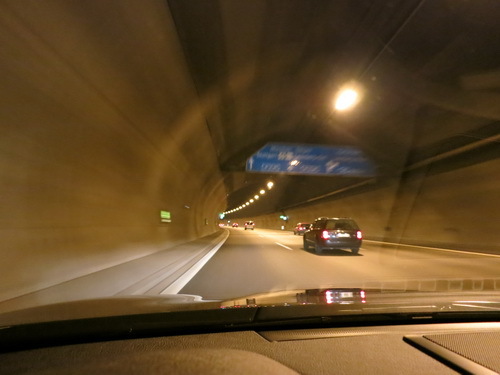 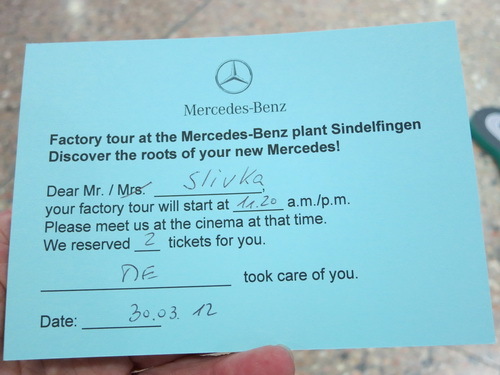 We got up early for breakfast at the hotel and then we checked out and hit the road at 8:15 a.m. for the 136 mile drive (through light rain) to Sindelfingen where we had an 11:20 a.m. appointment for a tour of the Sindelfingen Mercedes-Benz Factory. 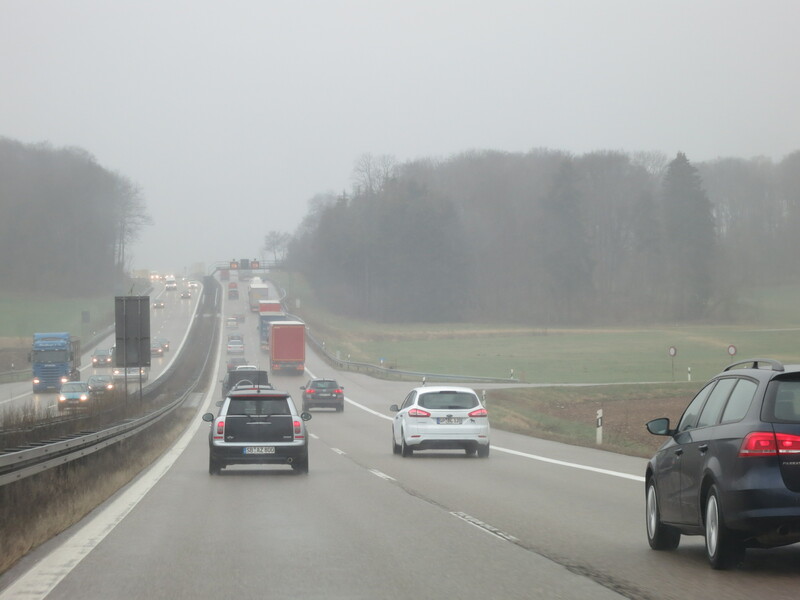 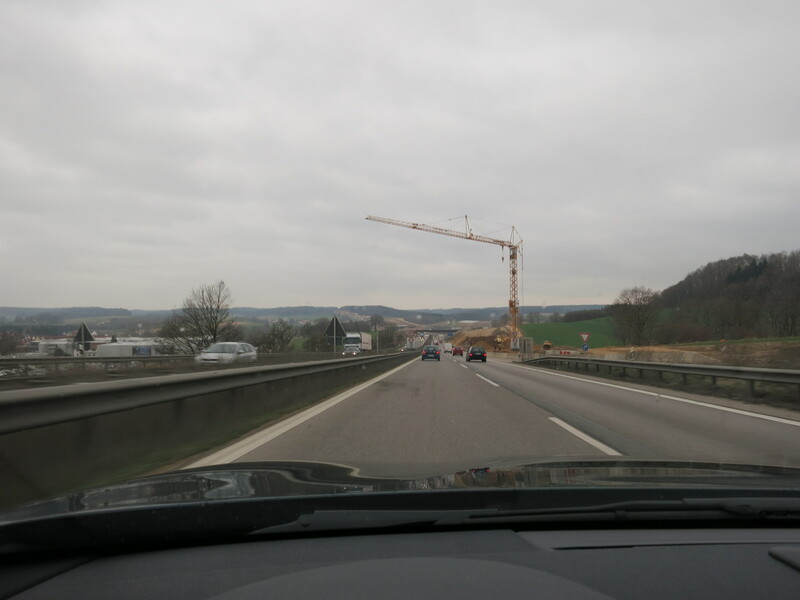 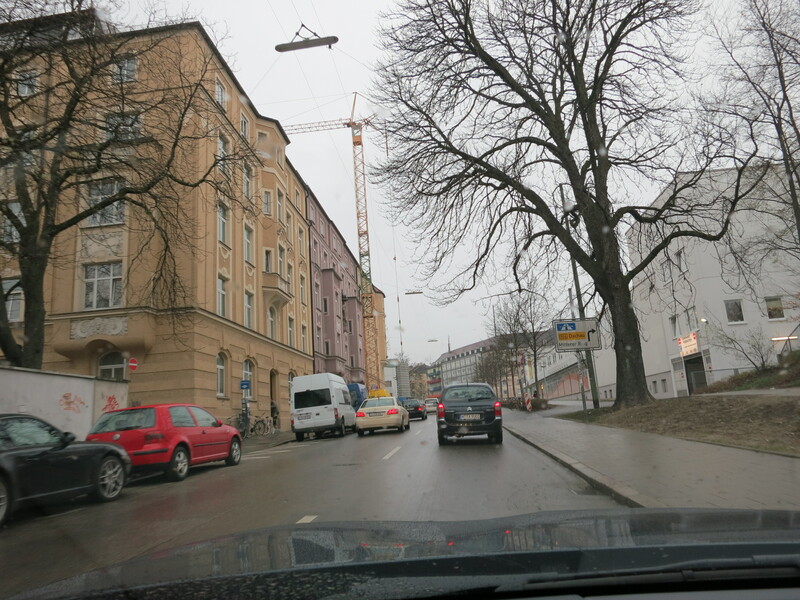 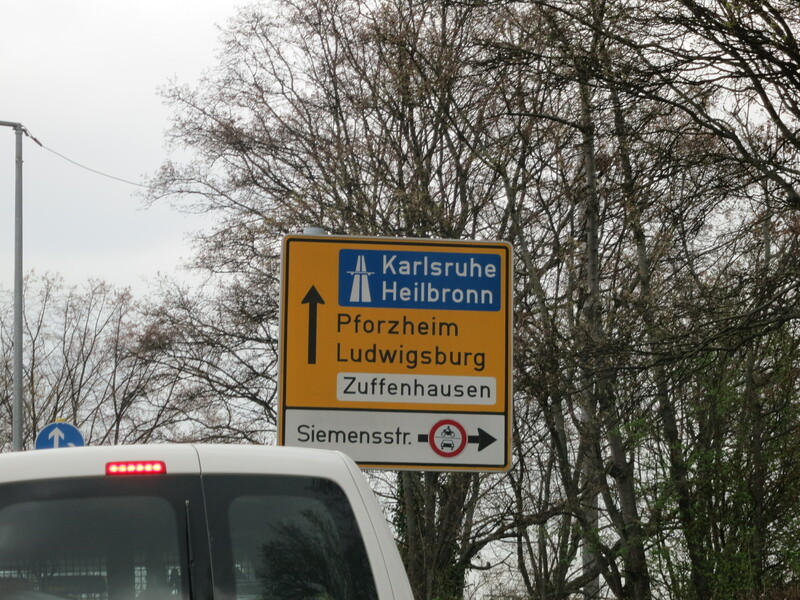 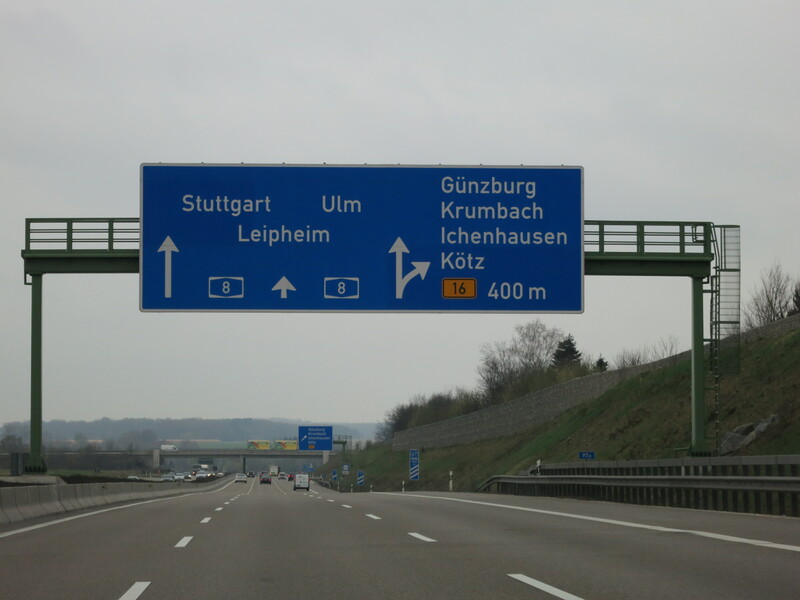 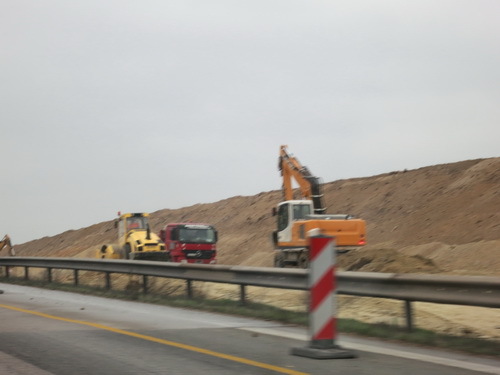 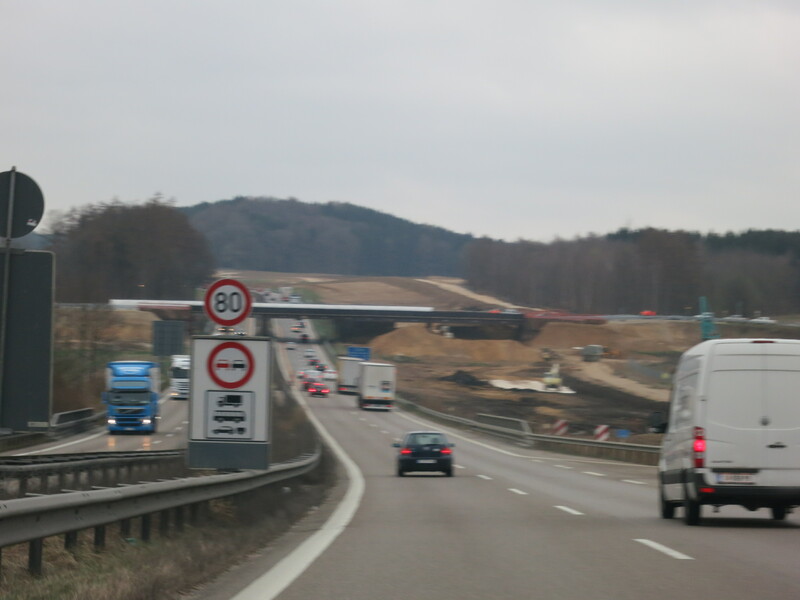 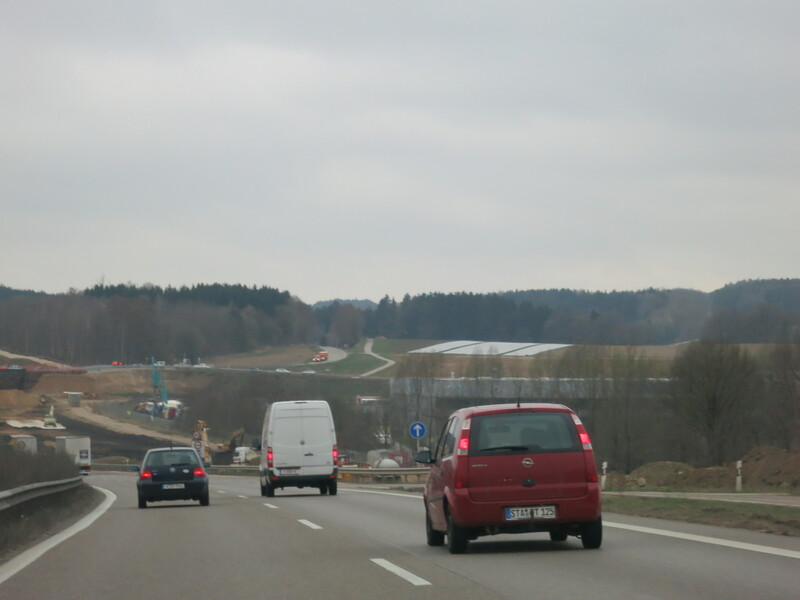 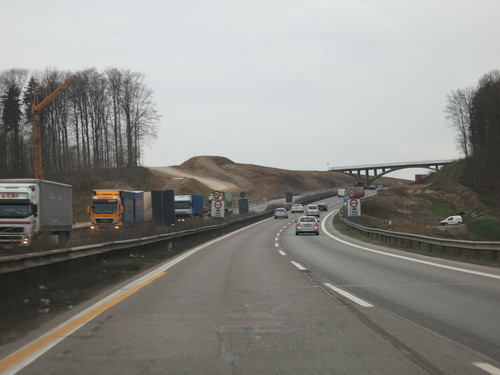 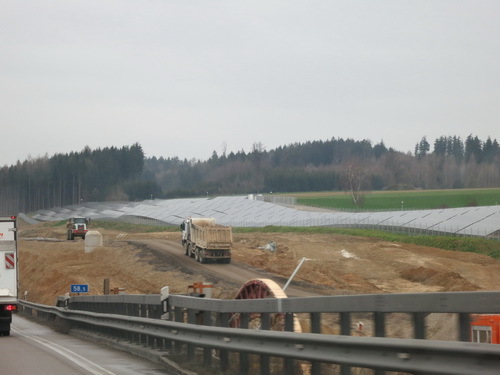 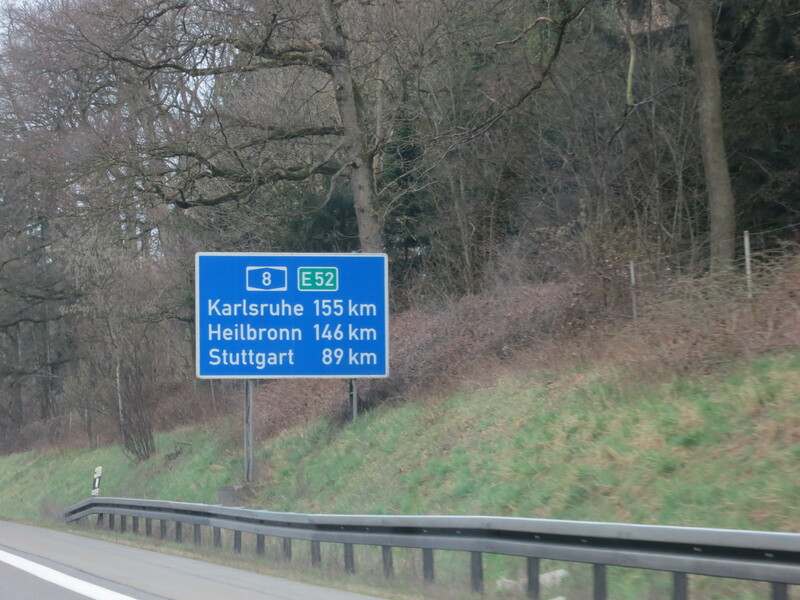 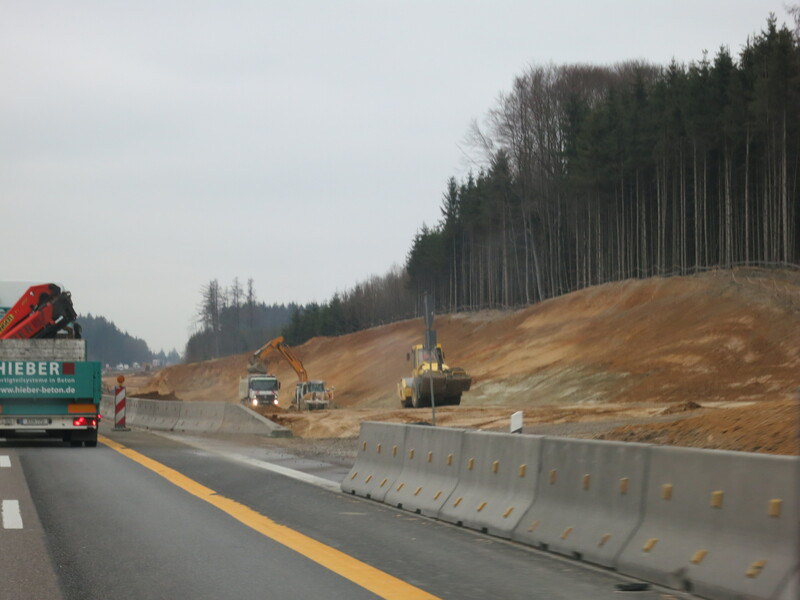 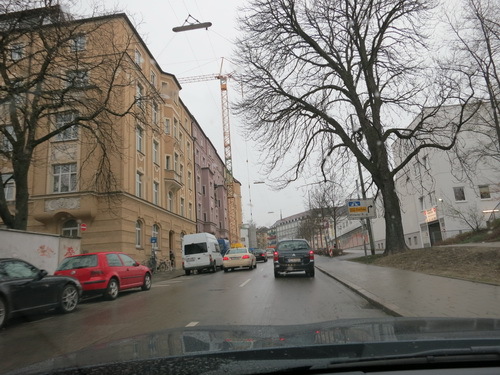 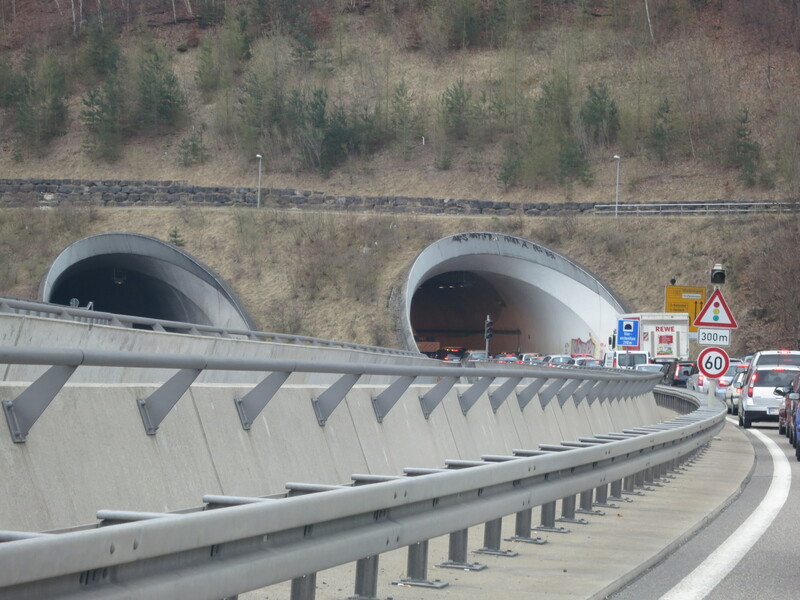 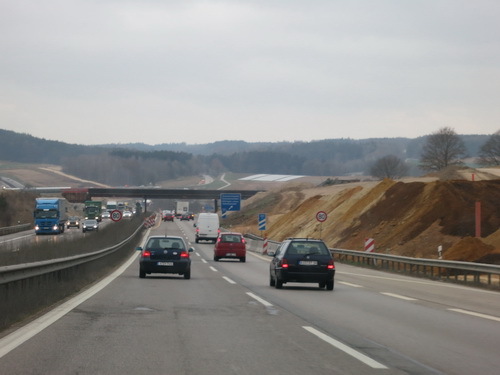 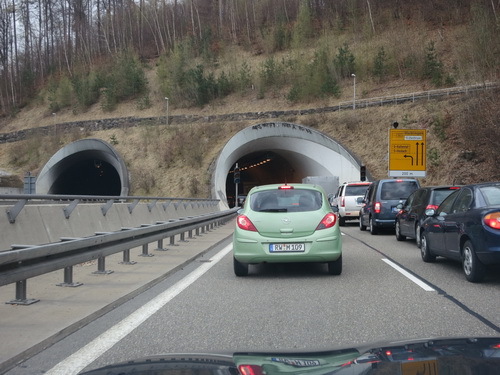 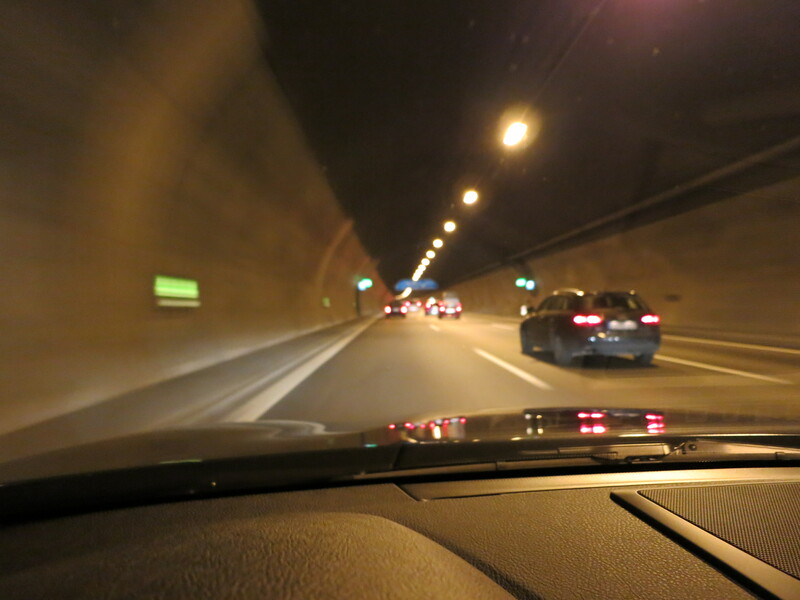 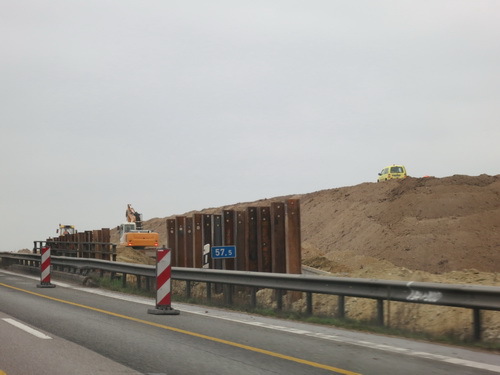 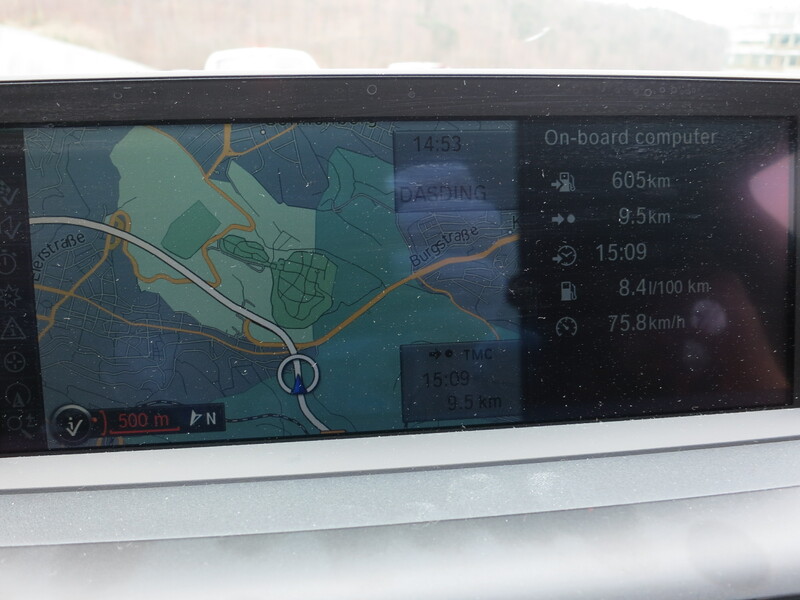 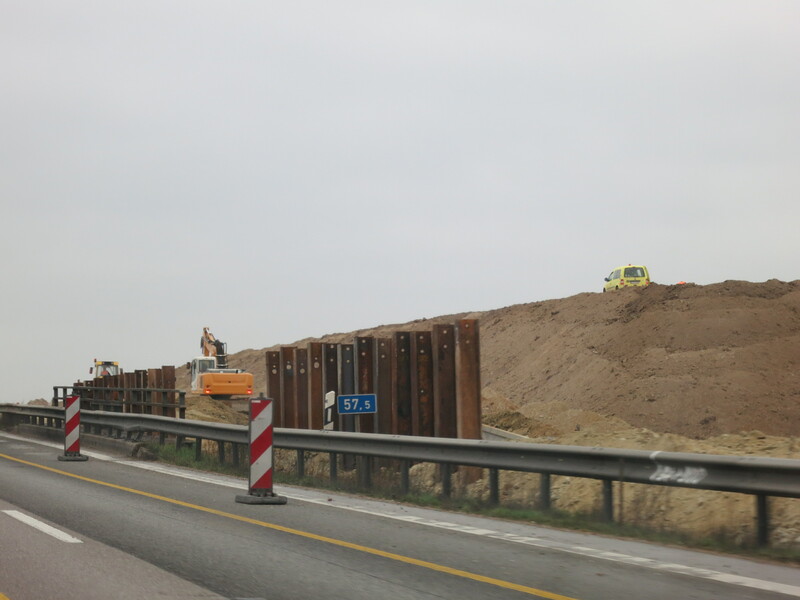 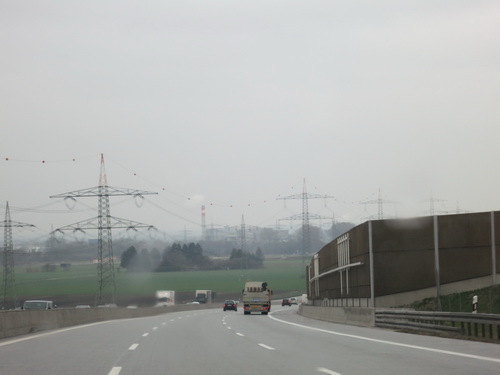 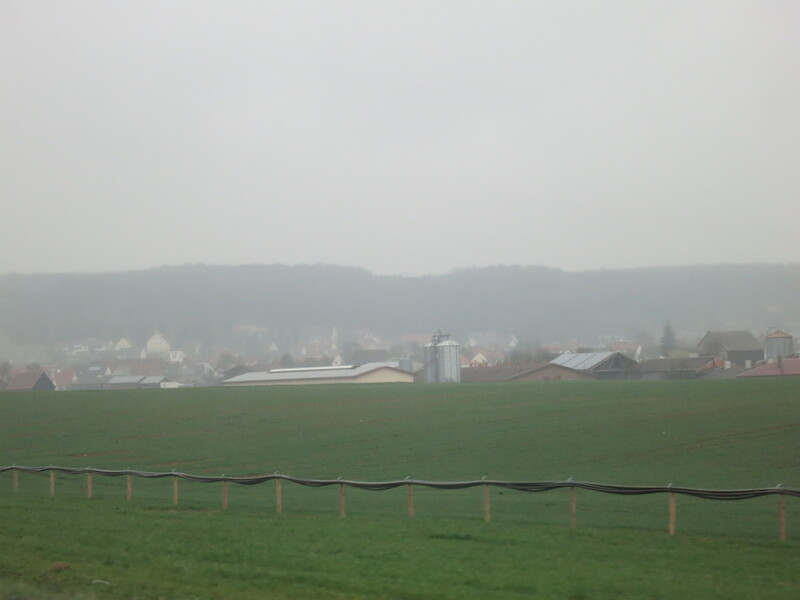 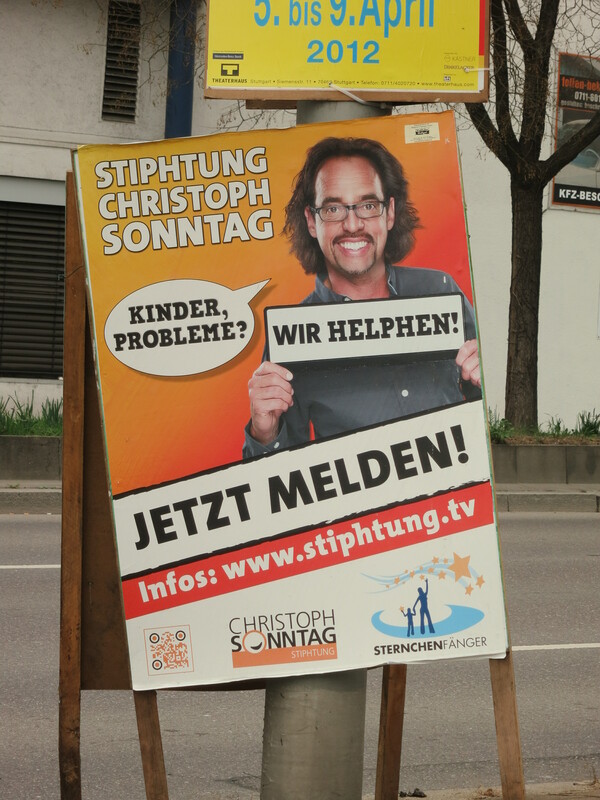 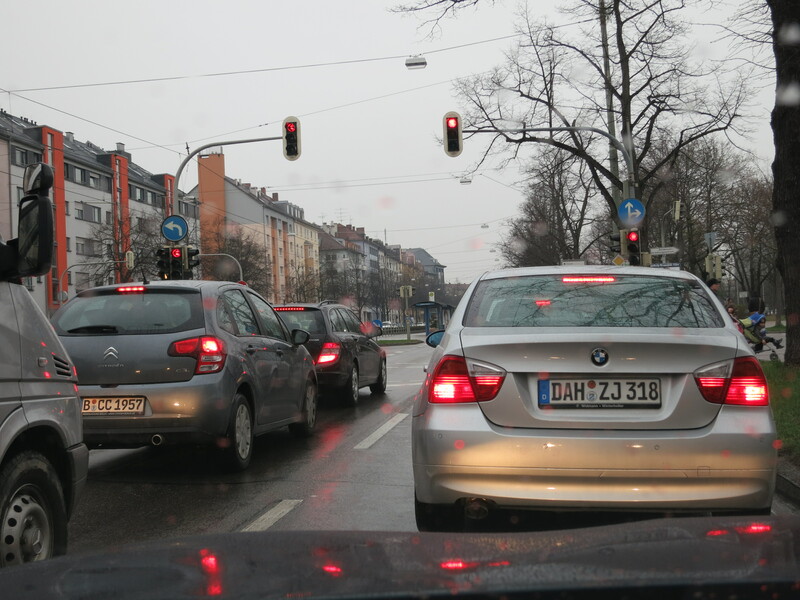 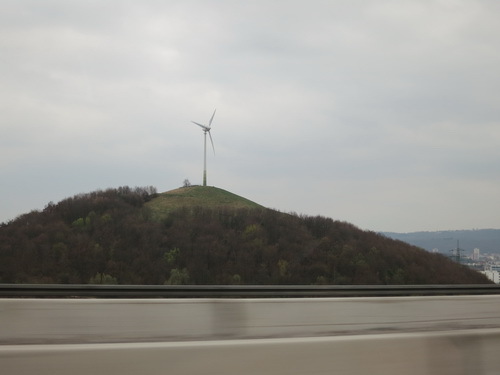 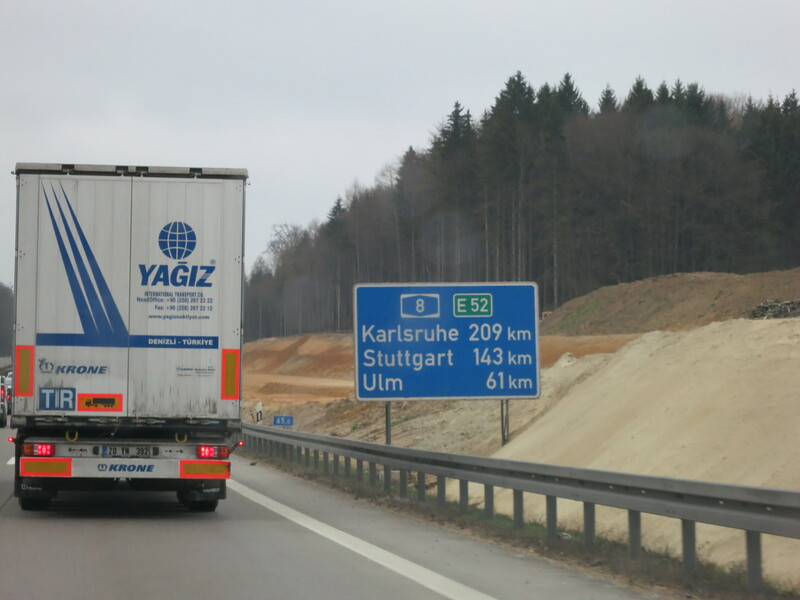 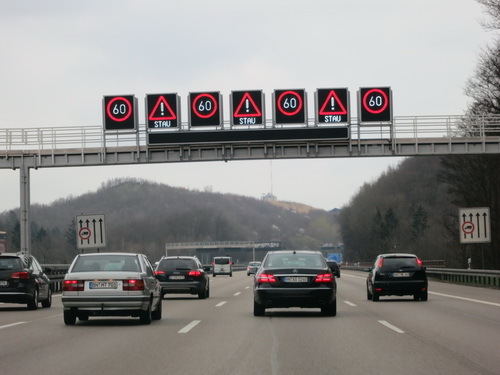 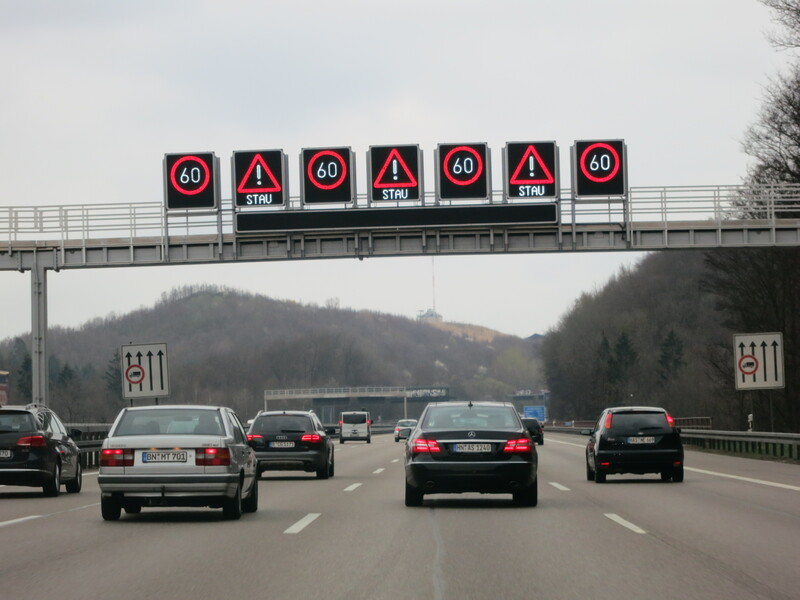 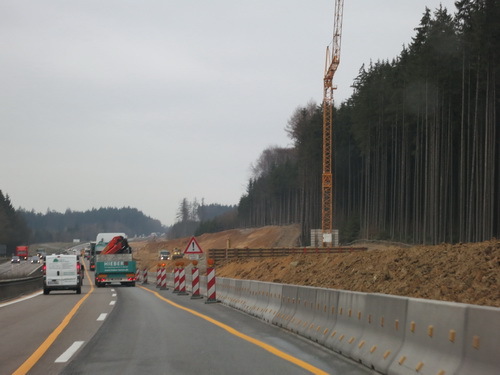 There was a lot of road construction along the A8 -- it looks like they are widening the Autobahn. 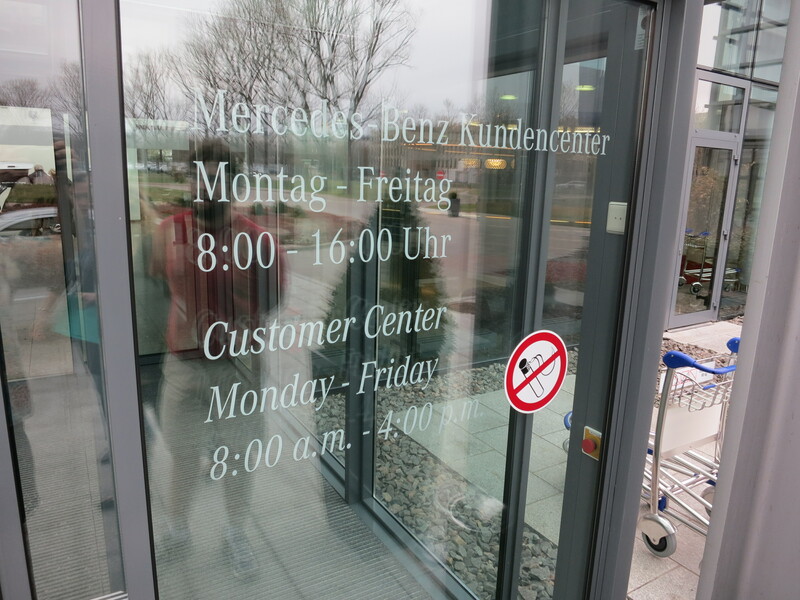 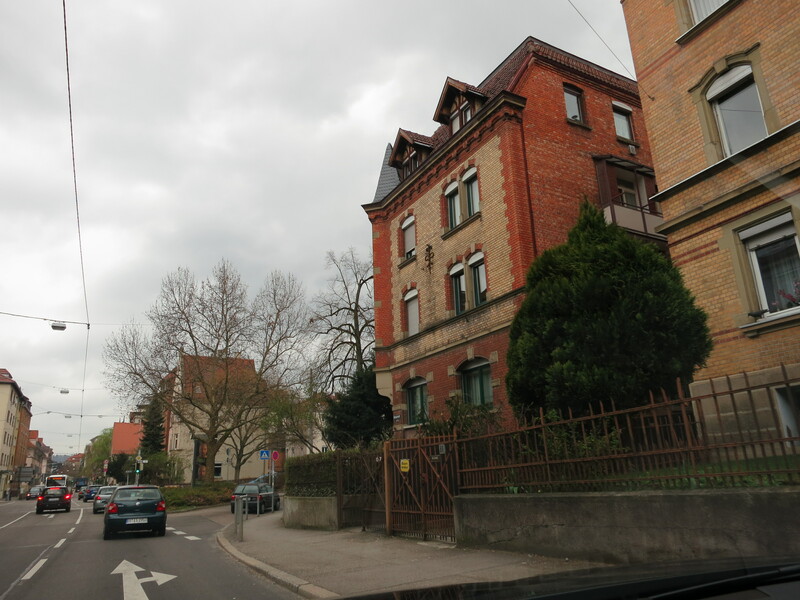 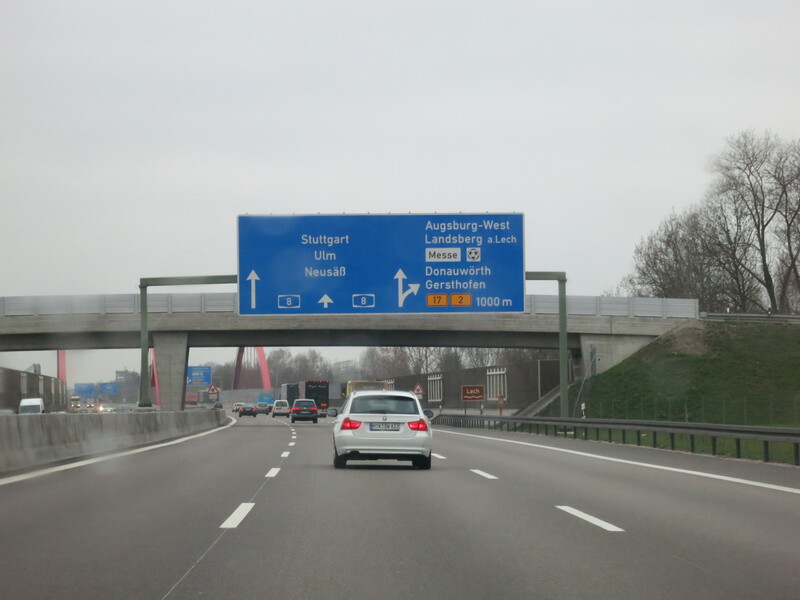 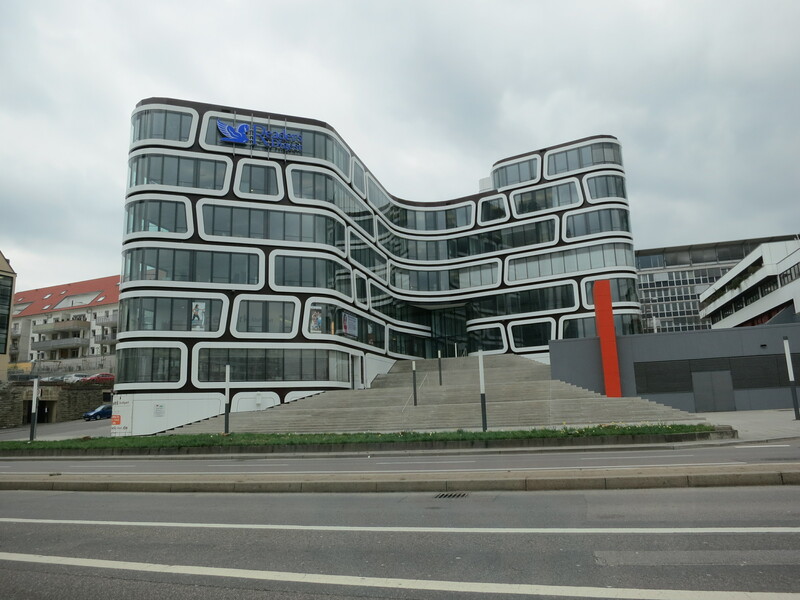 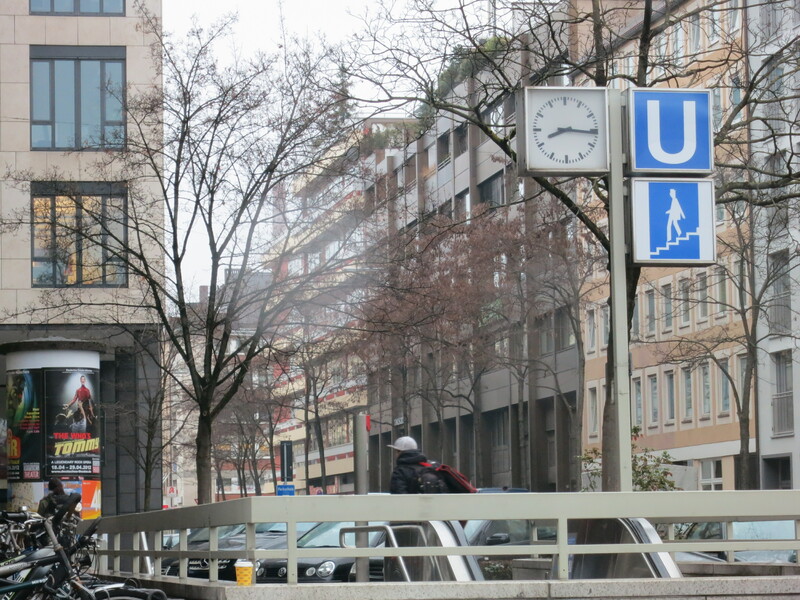 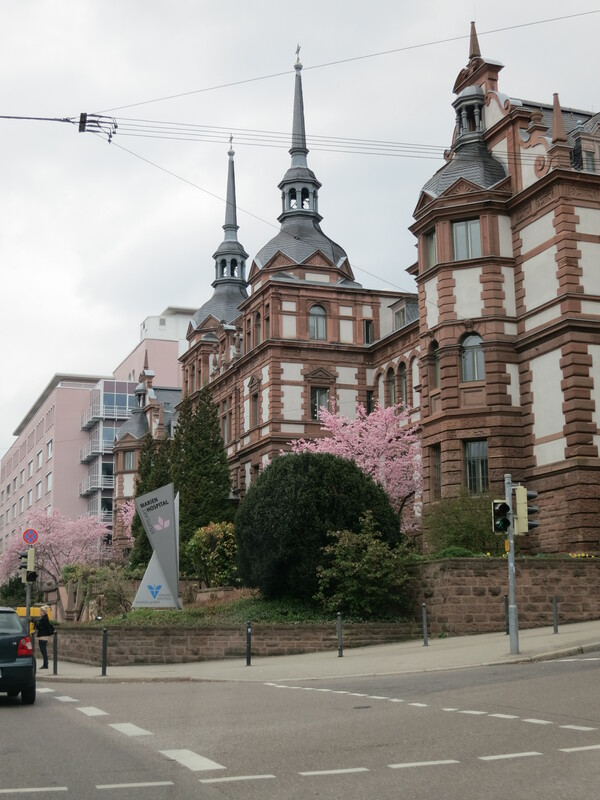 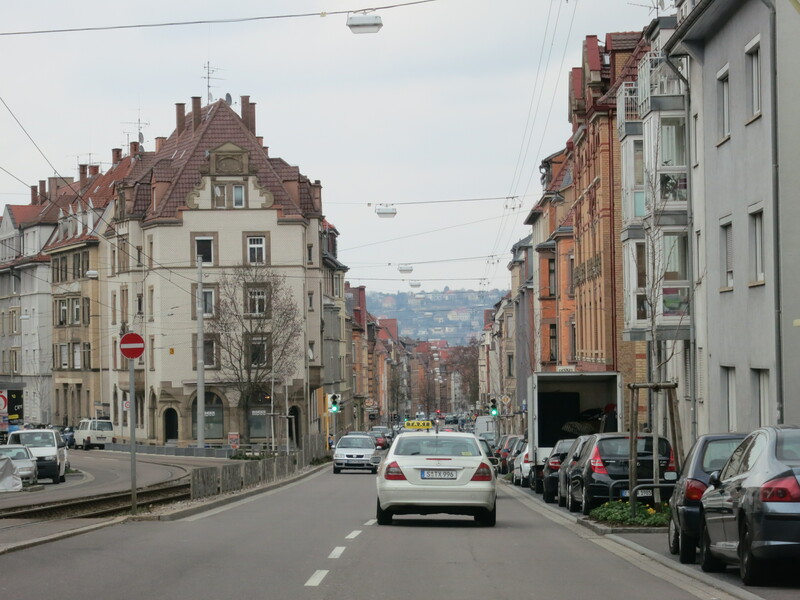 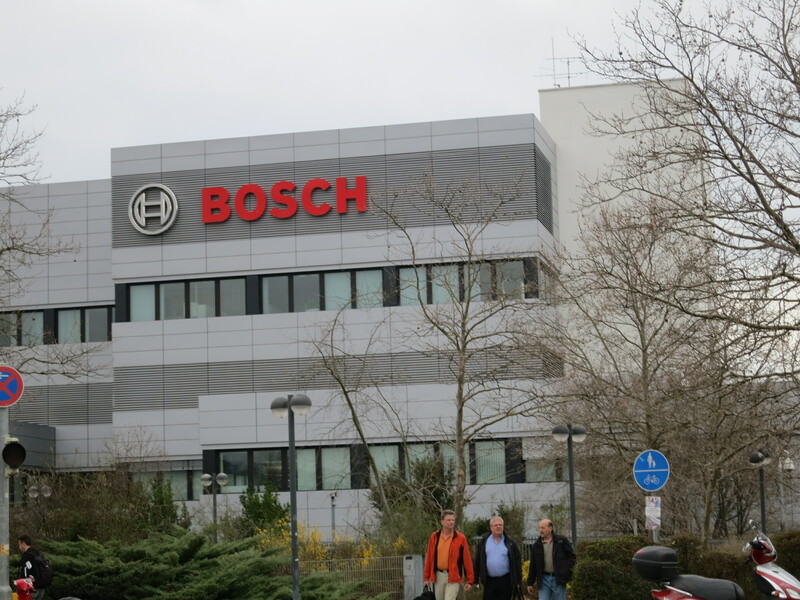 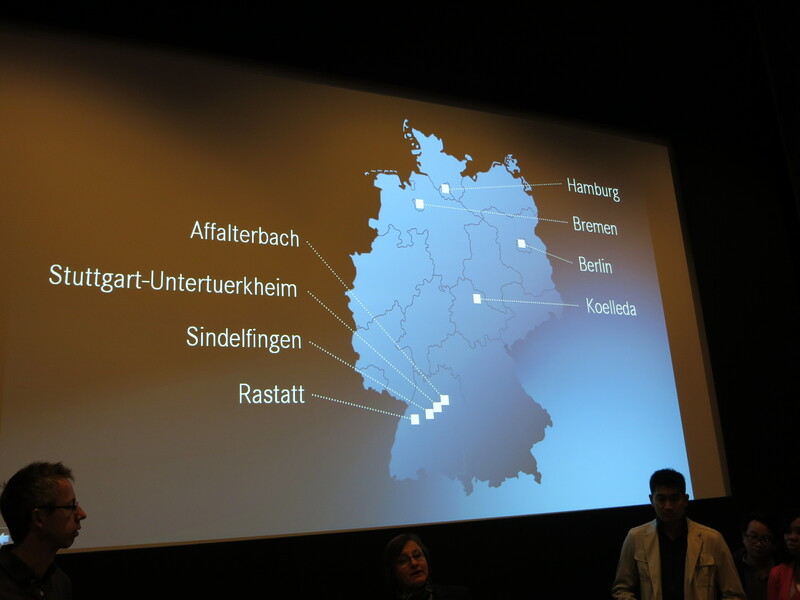 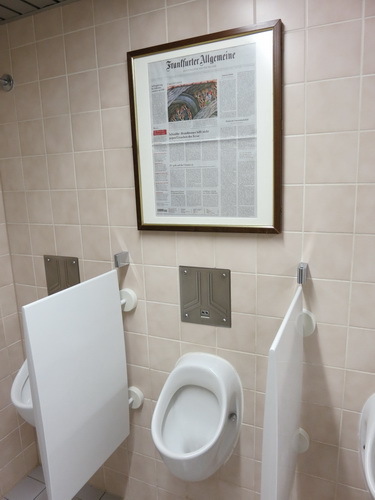 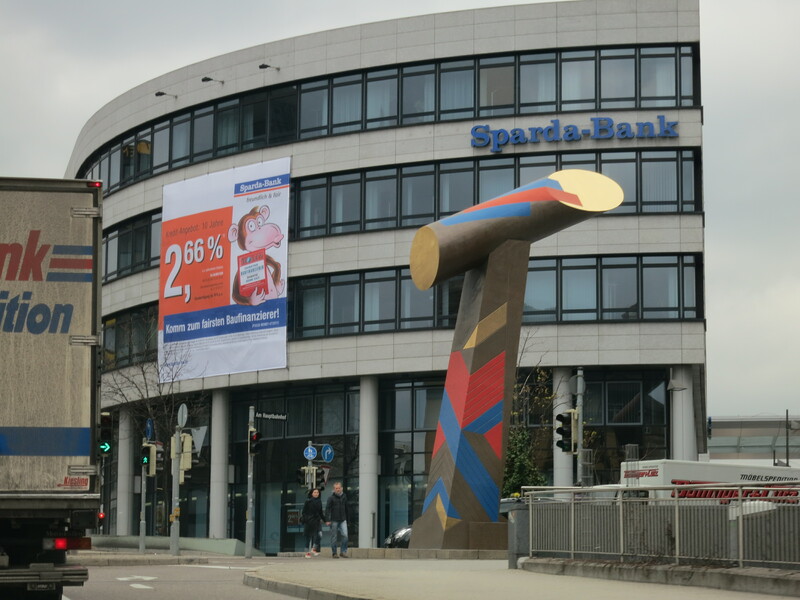 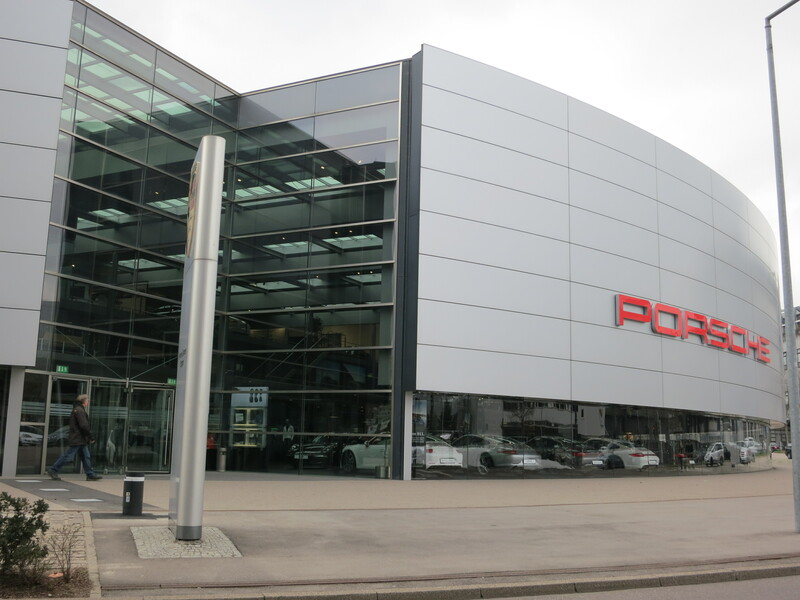 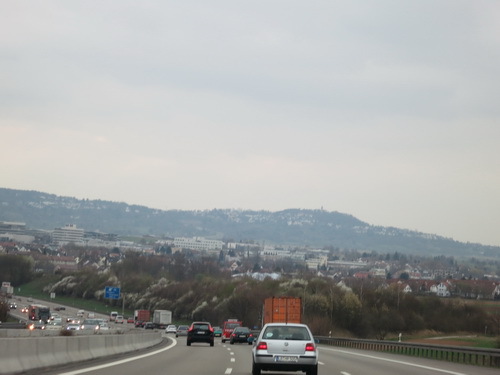 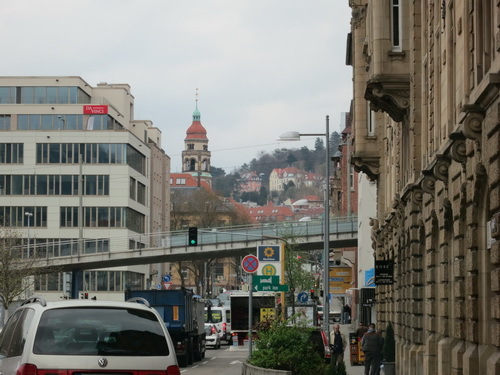 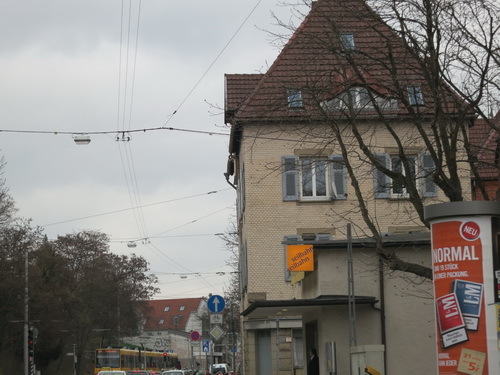 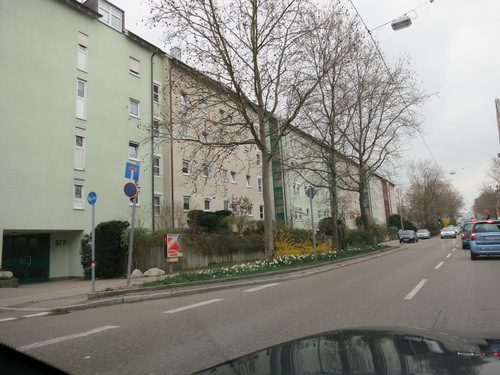 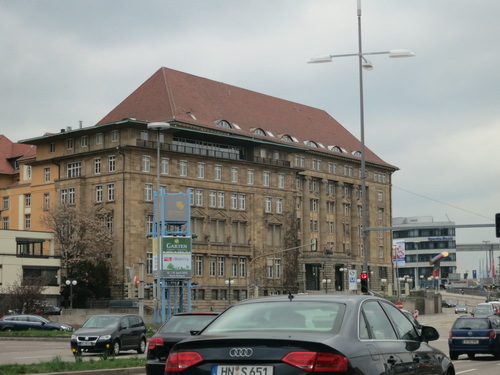 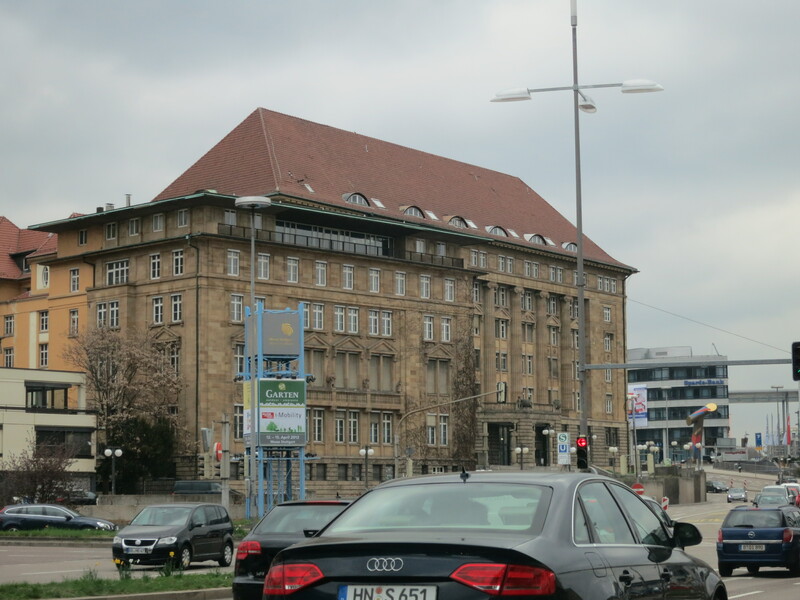 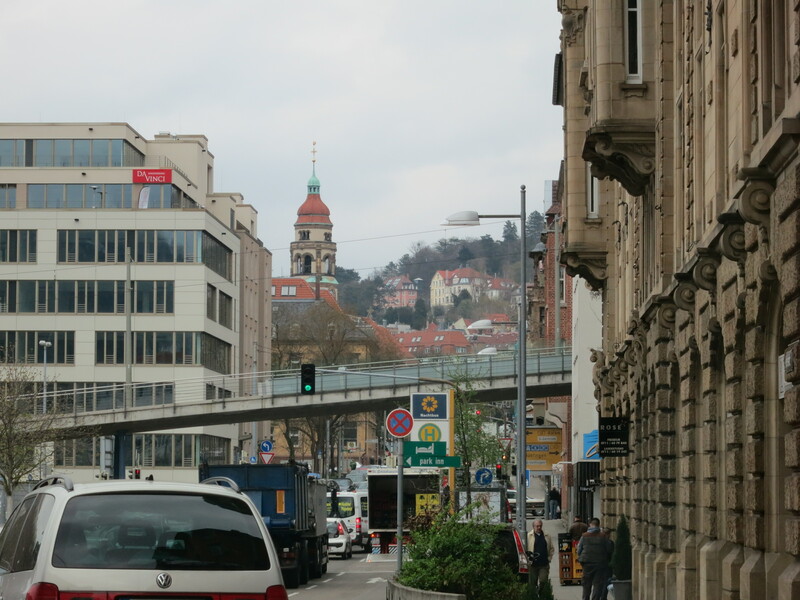 We arrived at the Stuttgart Marriott Hotel Sindelfingen at 10:30 a.m., stowed our bags, and then drove on the few kilometers to the M-B factory. 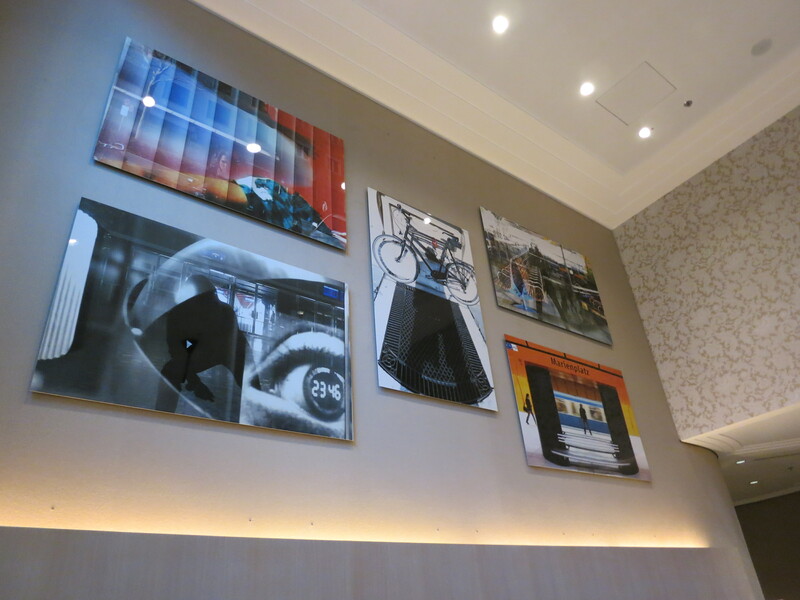 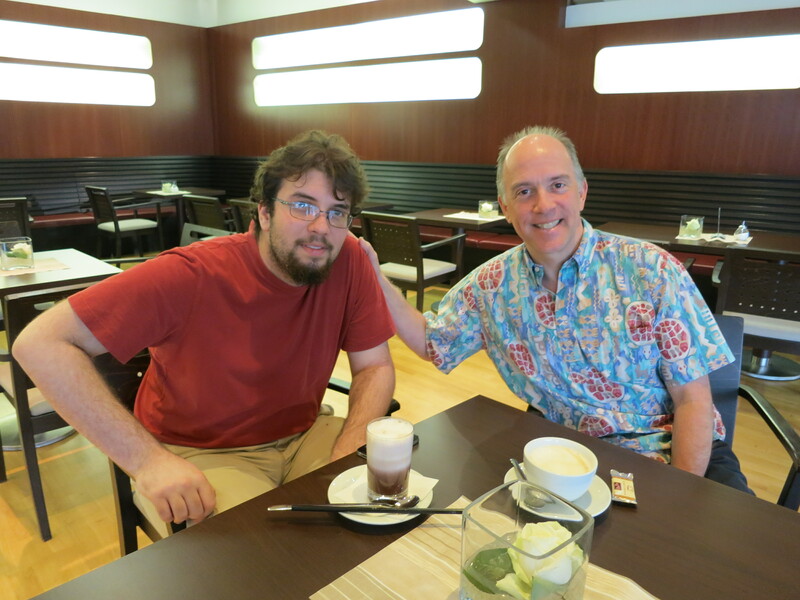 We had plenty of time before the tour so we had a coffee and hot chocolate and wandered around the displays. 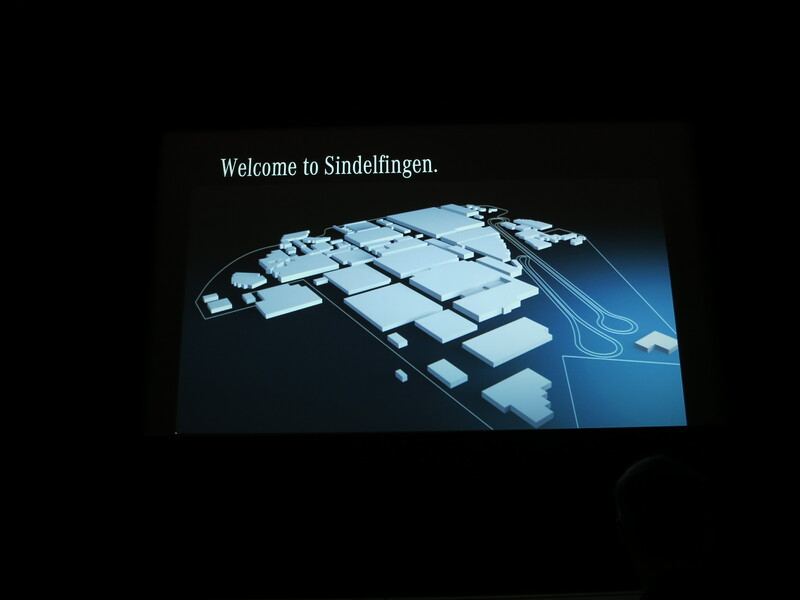 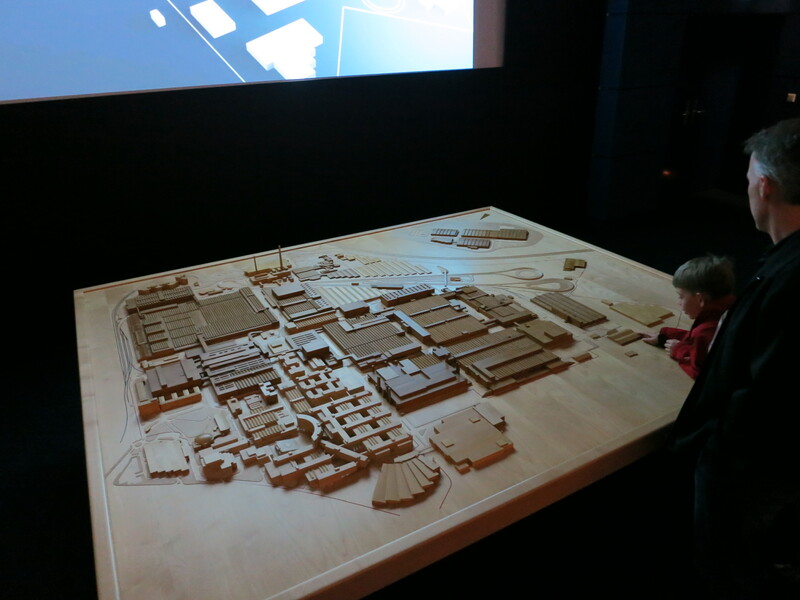 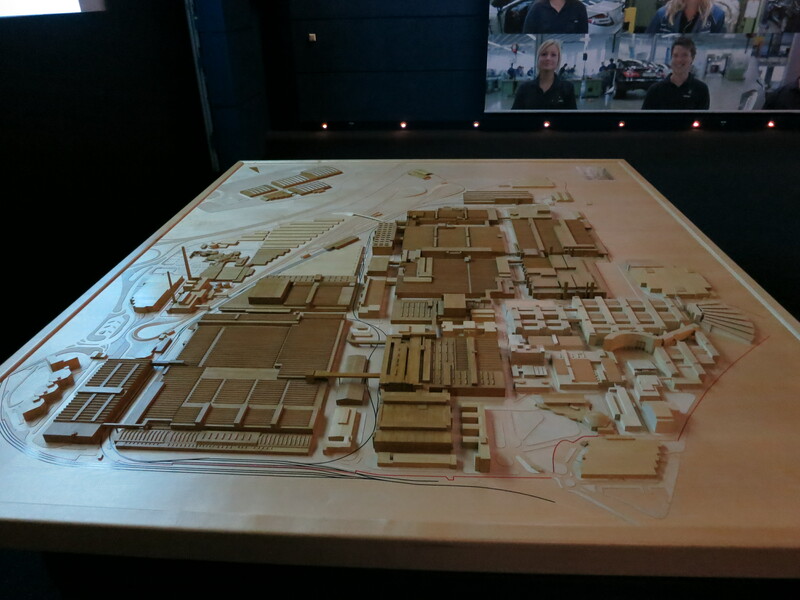 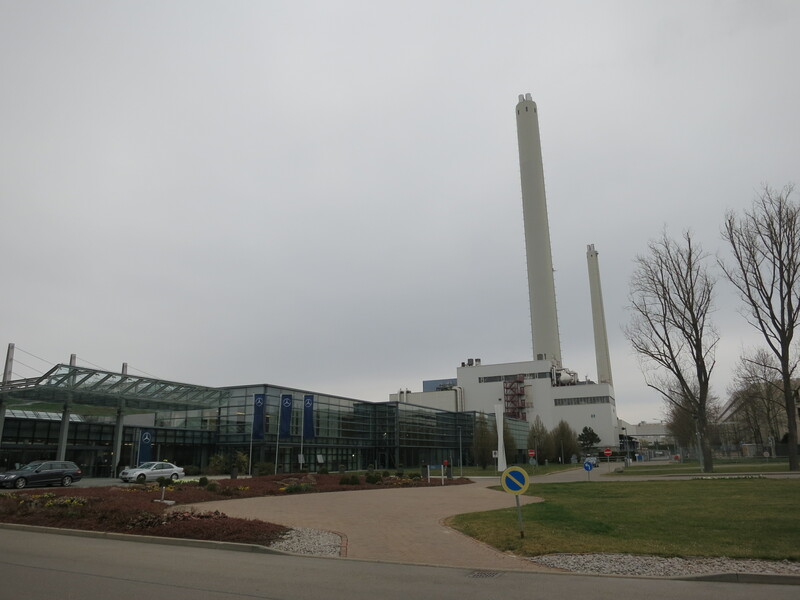 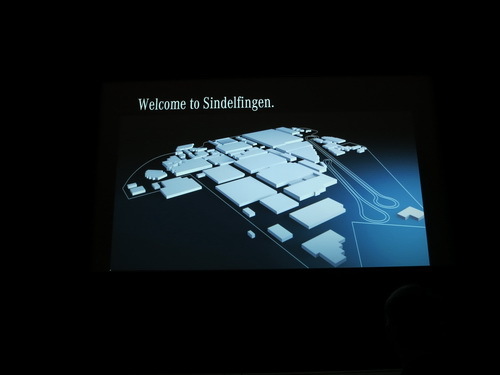 The Sindelfingen plant is largest single M-B plant. 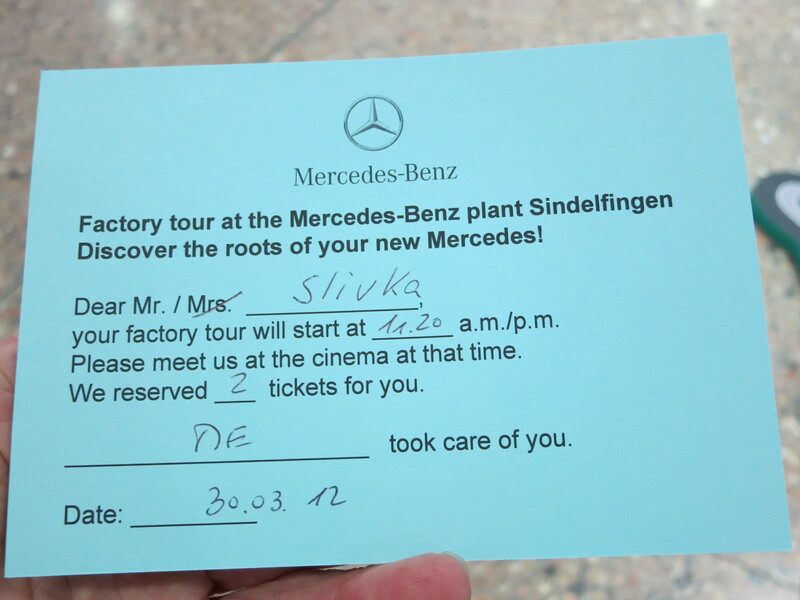 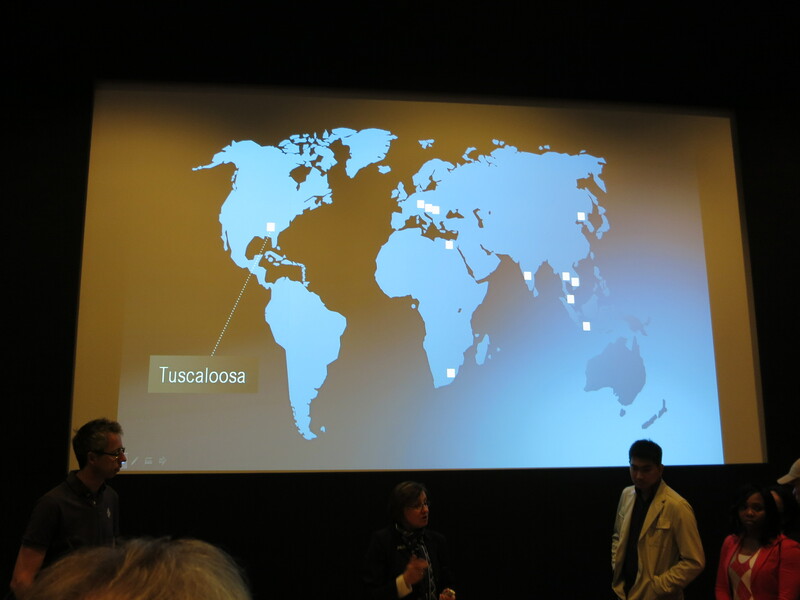 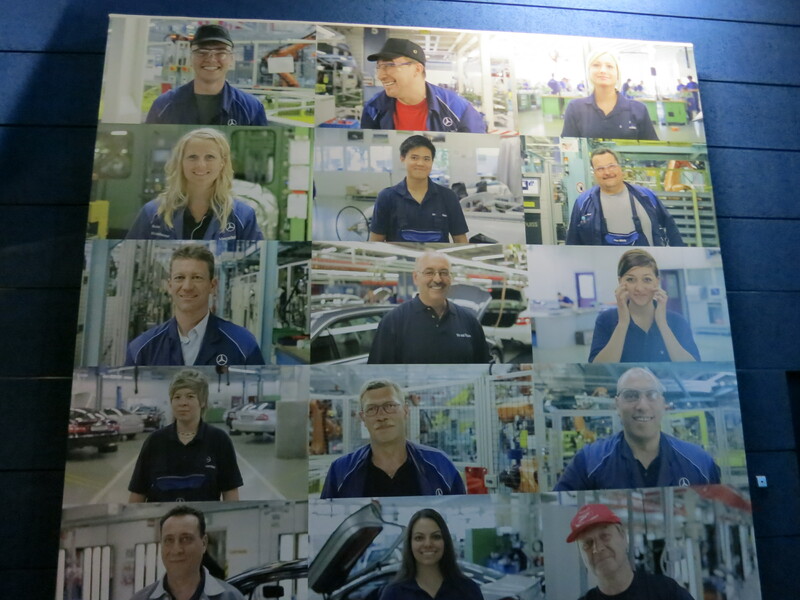 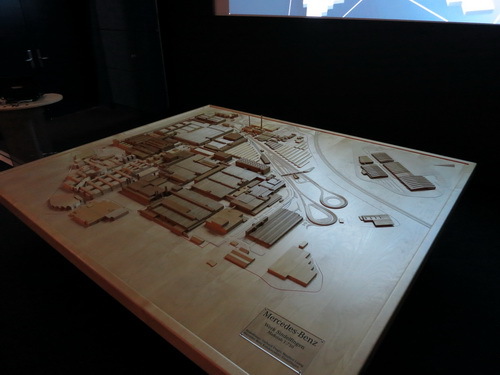 Our tour started with a video about M-B cars and production, then we toured the C-class assembly area. 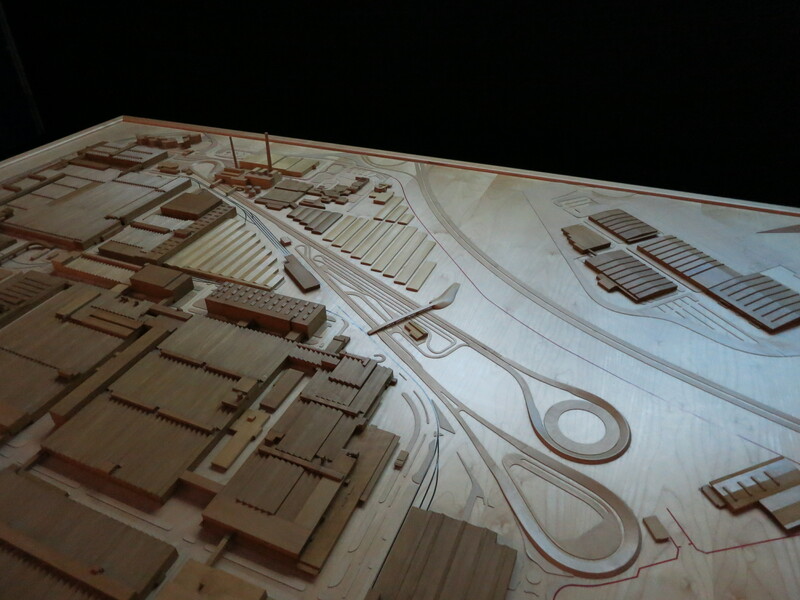 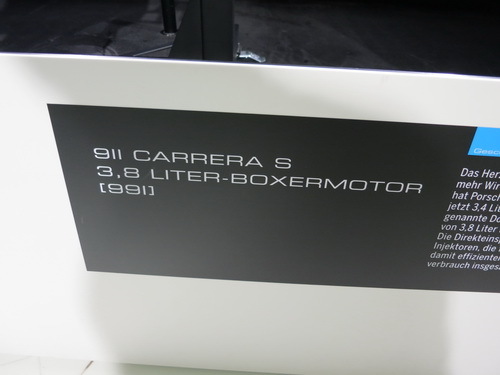 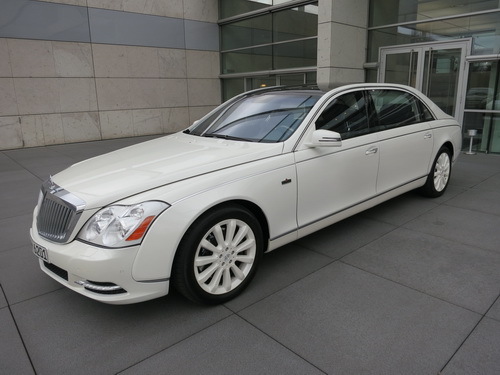 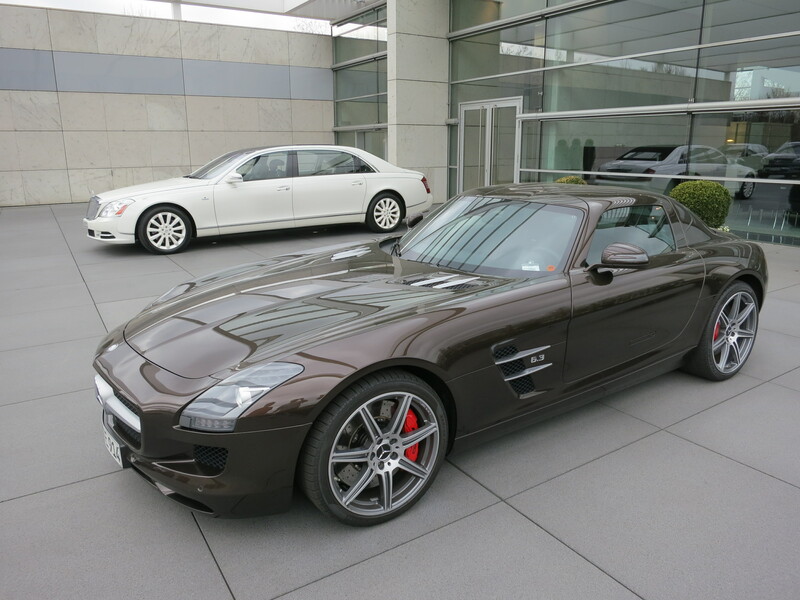 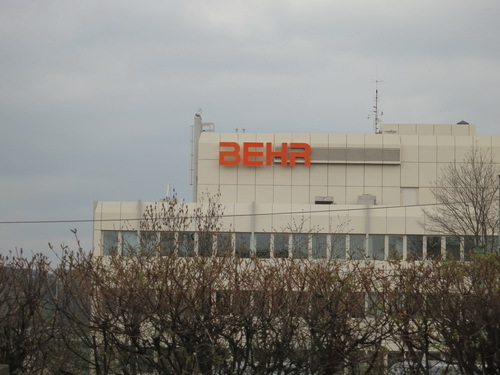 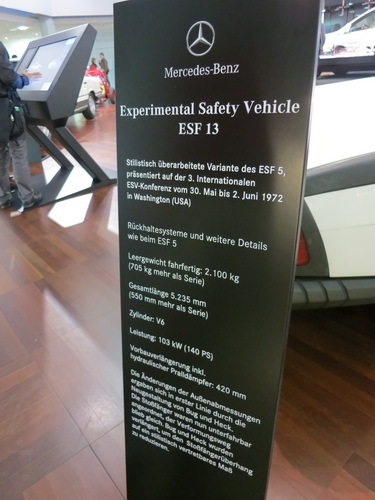 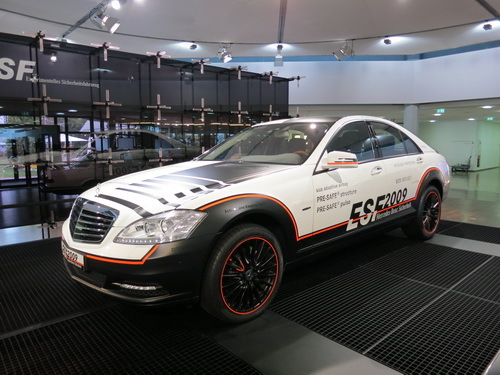 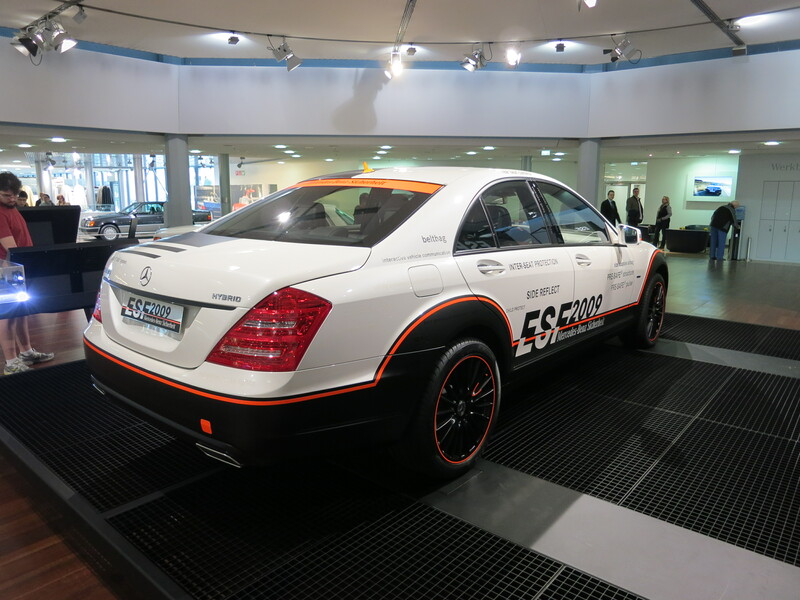 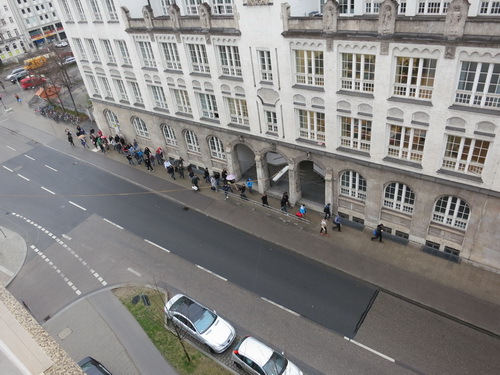 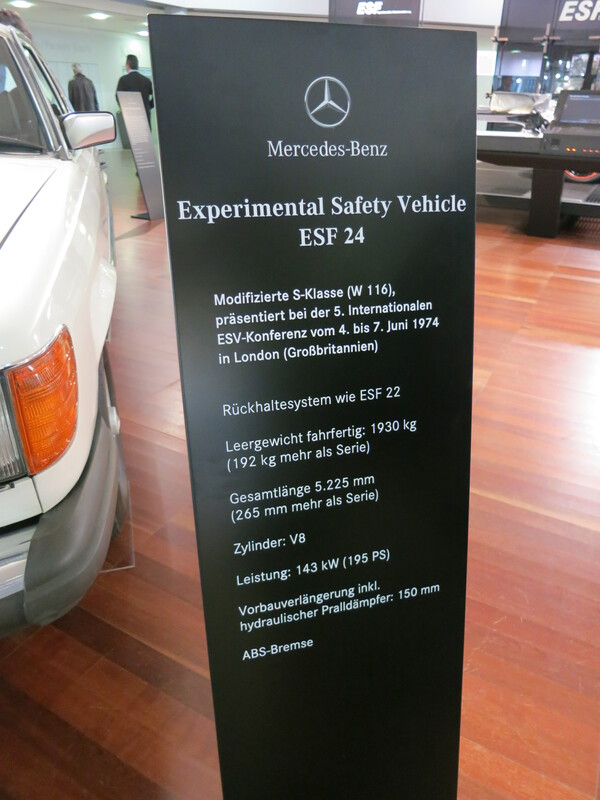 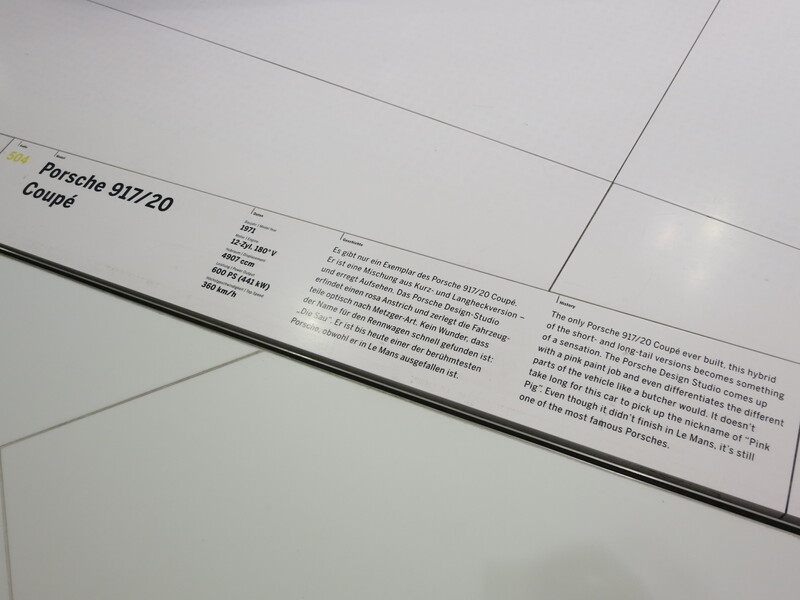 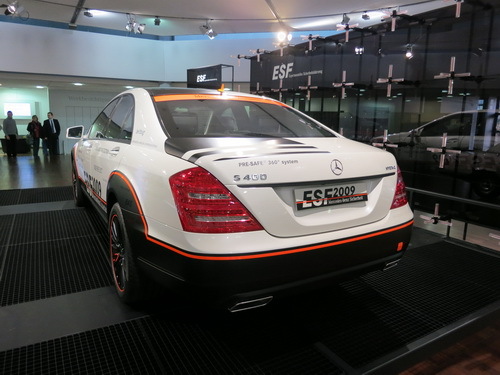 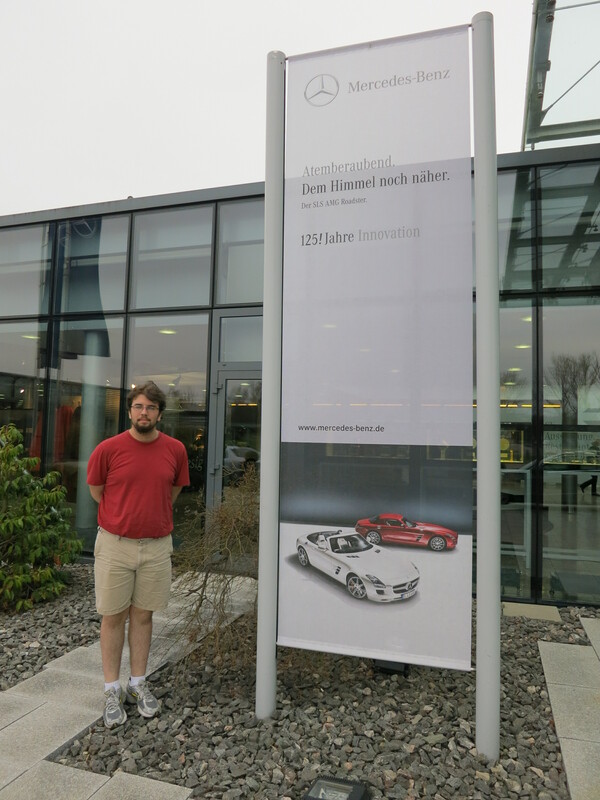 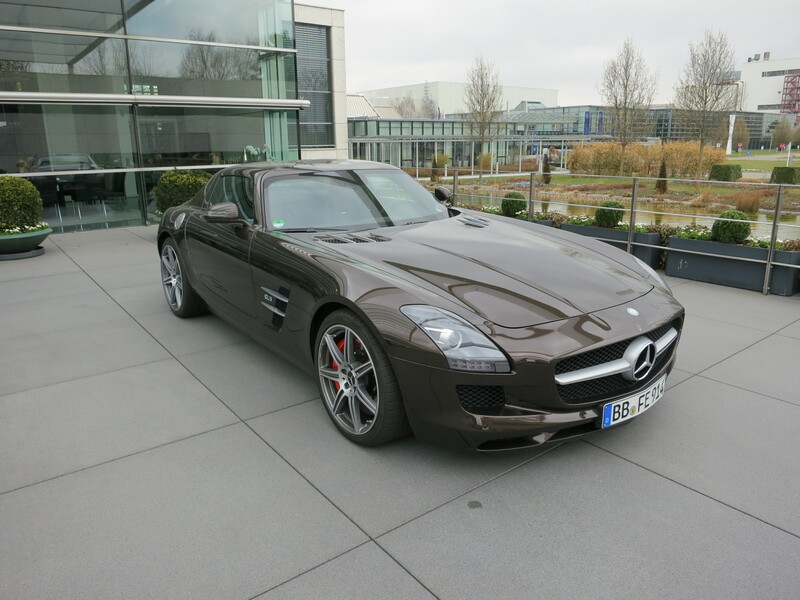 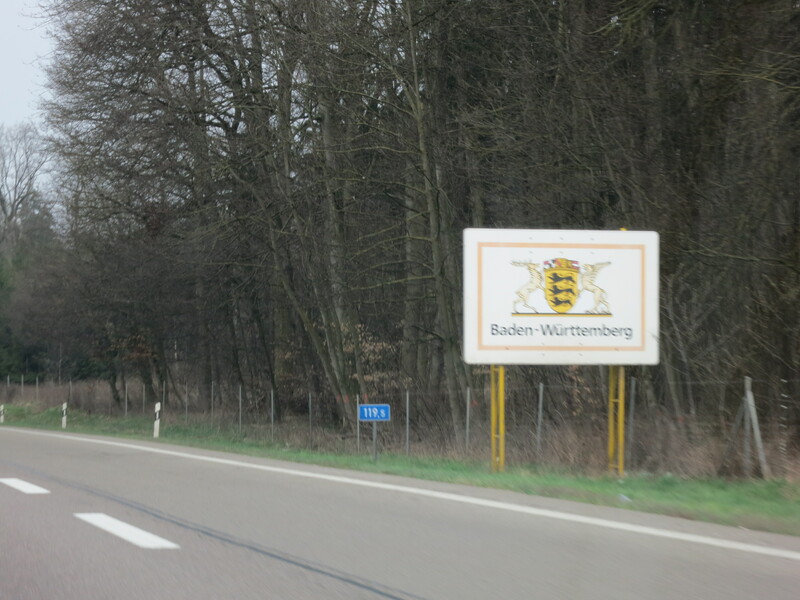 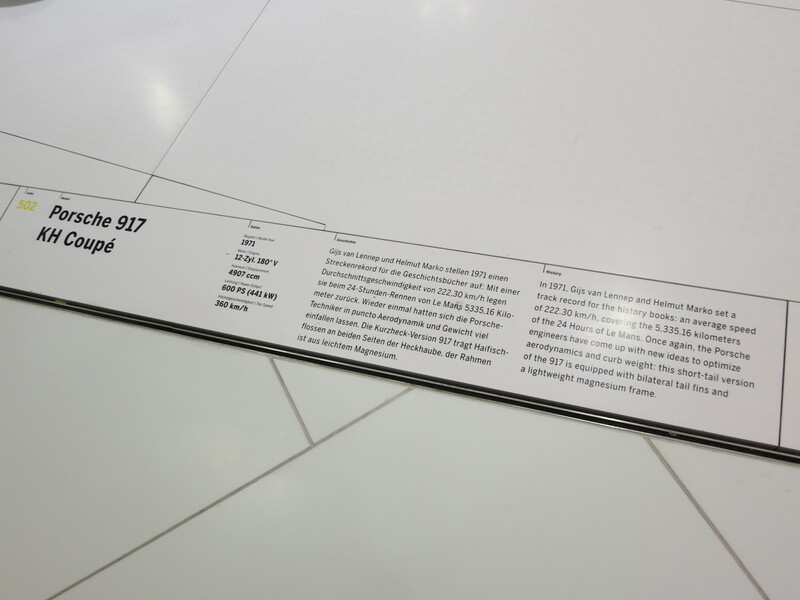 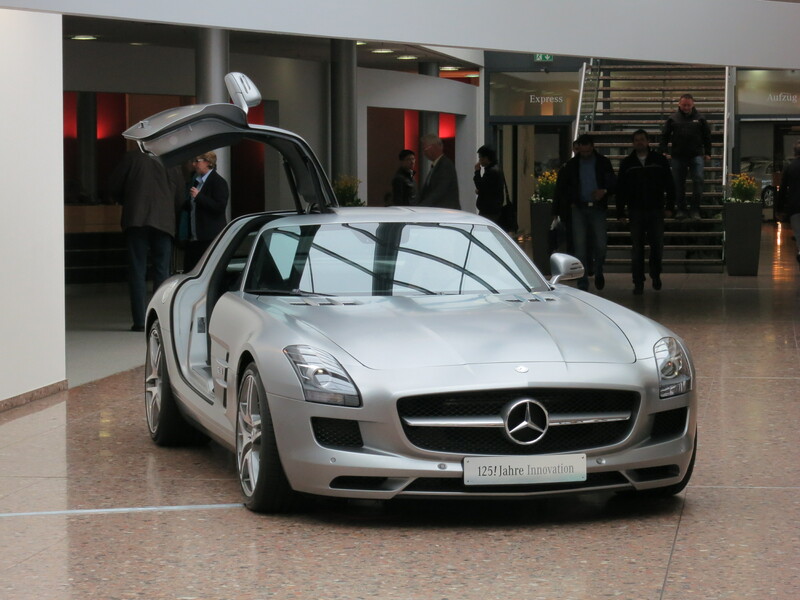 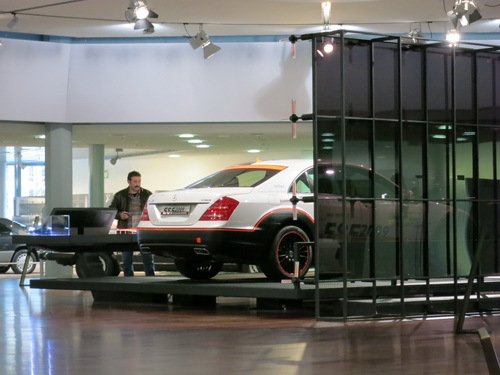 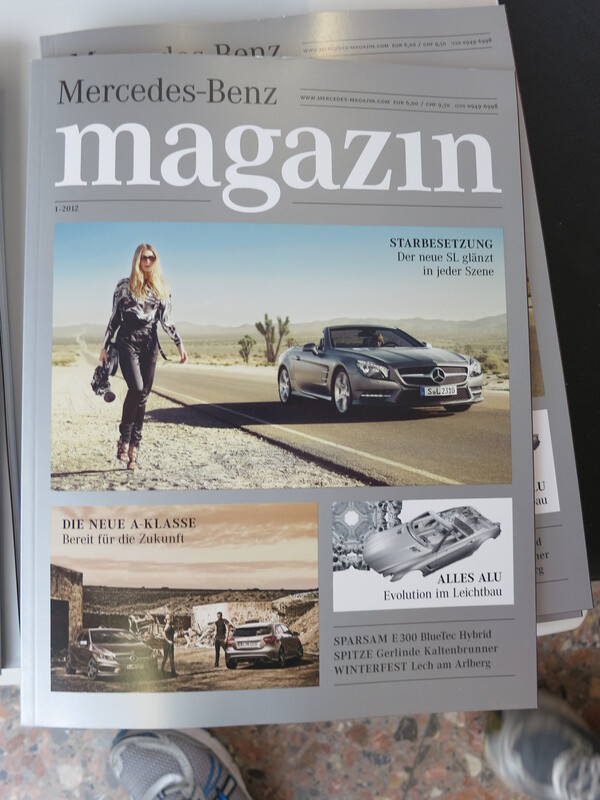 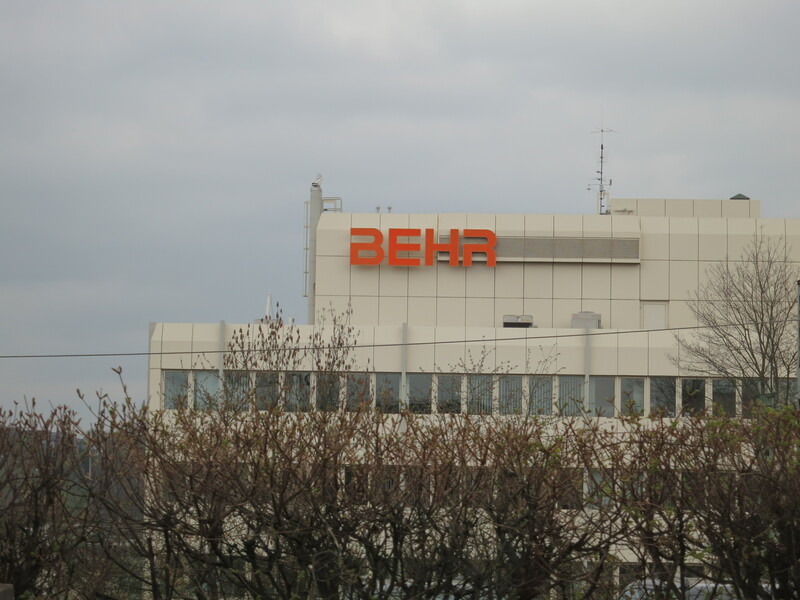 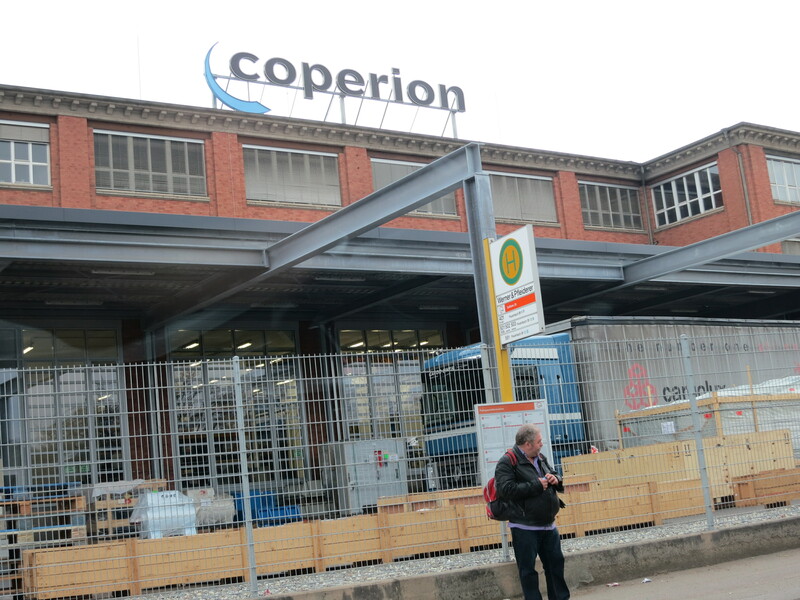 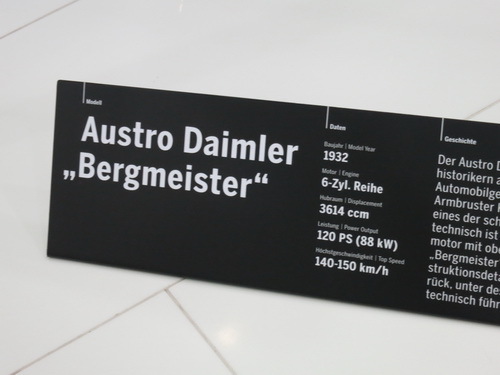 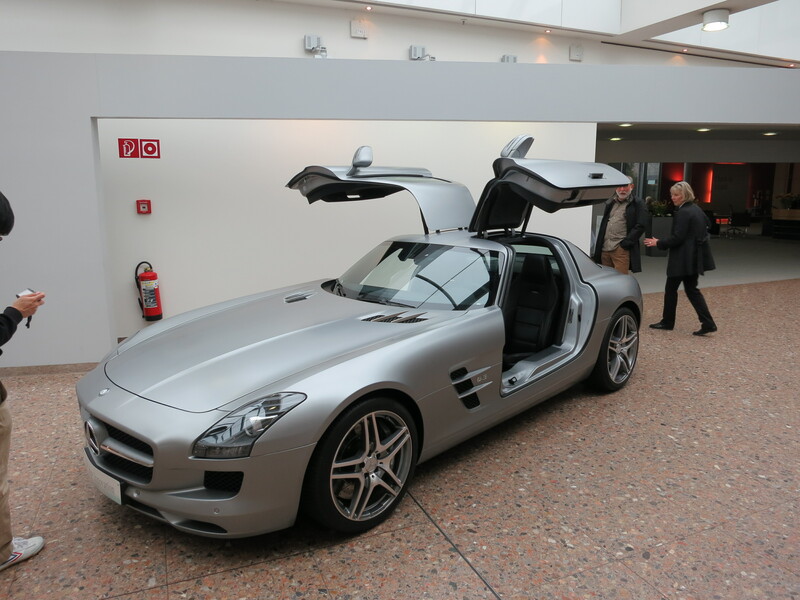 E-Class, S-Class, SLS (gullwing), and Maybach ("my-bock") are also made here. 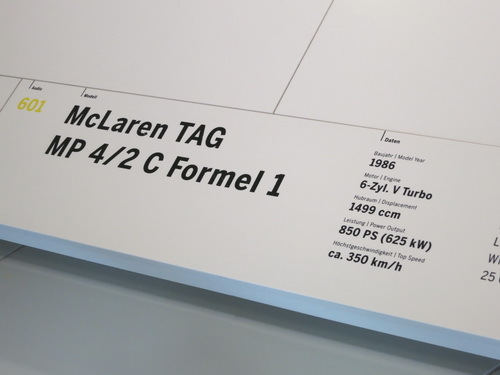 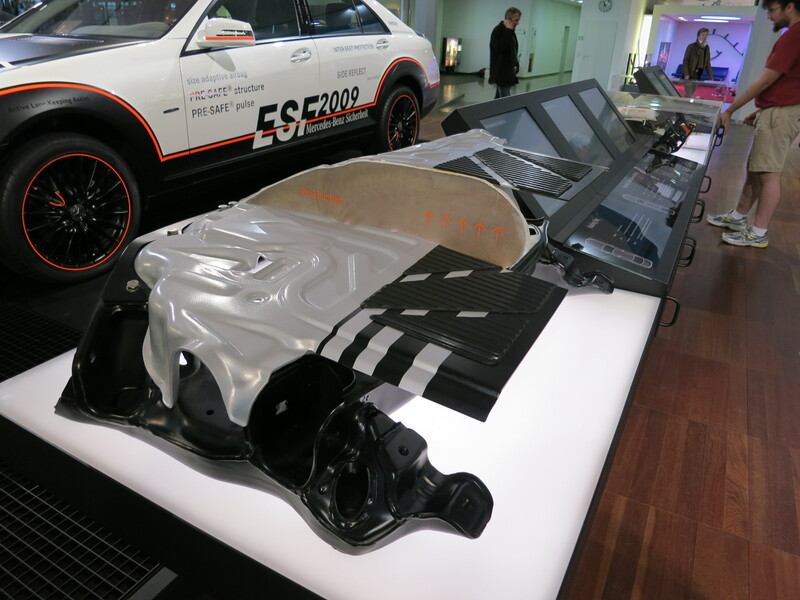 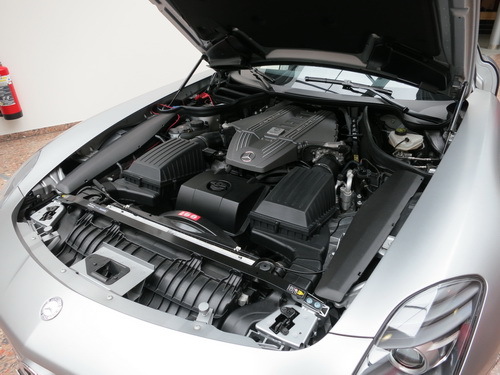 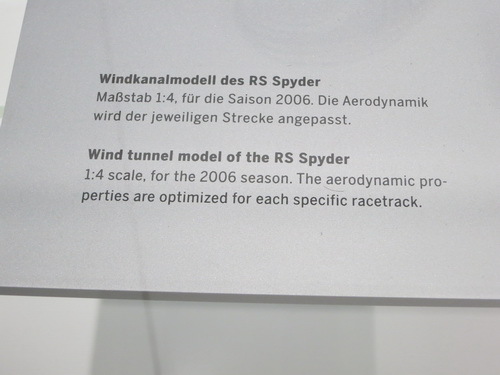 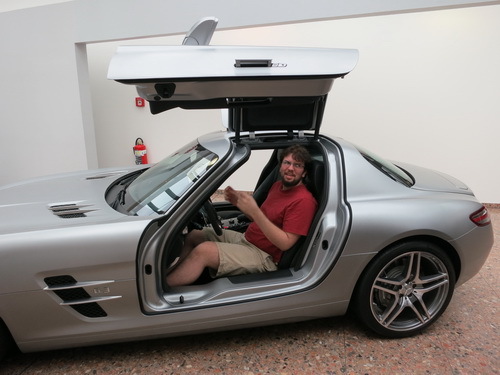 2K cars/day produced -- only ~15 CLK/day, maybe 30 SLS. 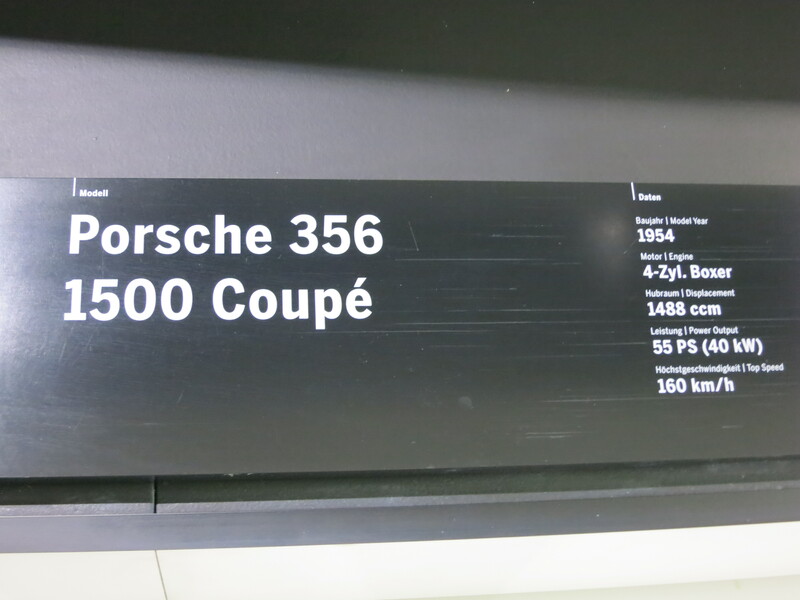 350 cars being picked up by owners today -- their cars would have been been completed 24-48 hours earlier. 1200 apprentices, 3 year program, they start at 15 years old. 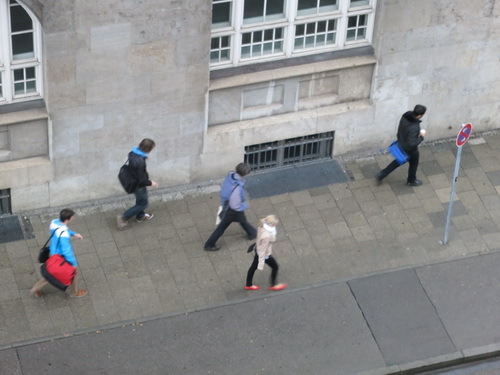 M-B likes to hire them permanently. 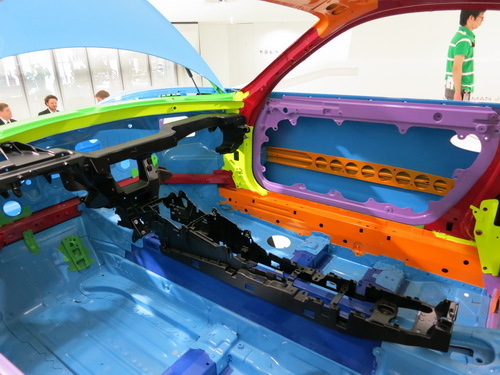 Robots assemble monocoque chassis by welding (and sometimes gluing) ~400 individual stampings. 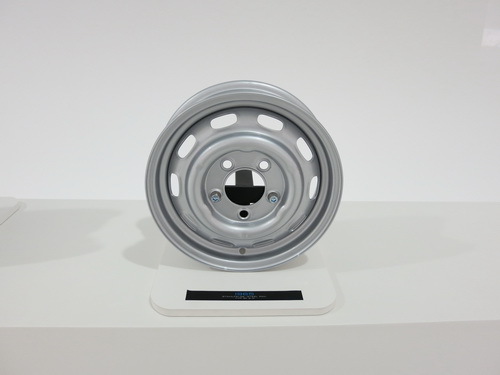 Robots pick up pieces and whip them around through the air. 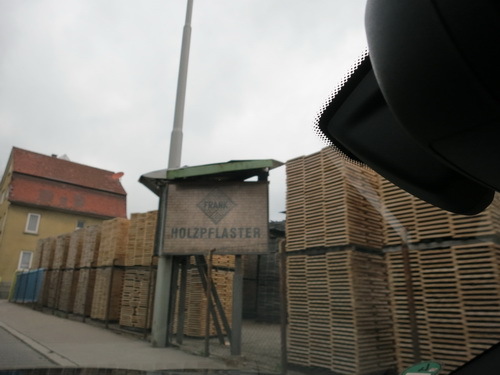 Stampings come from another plant. 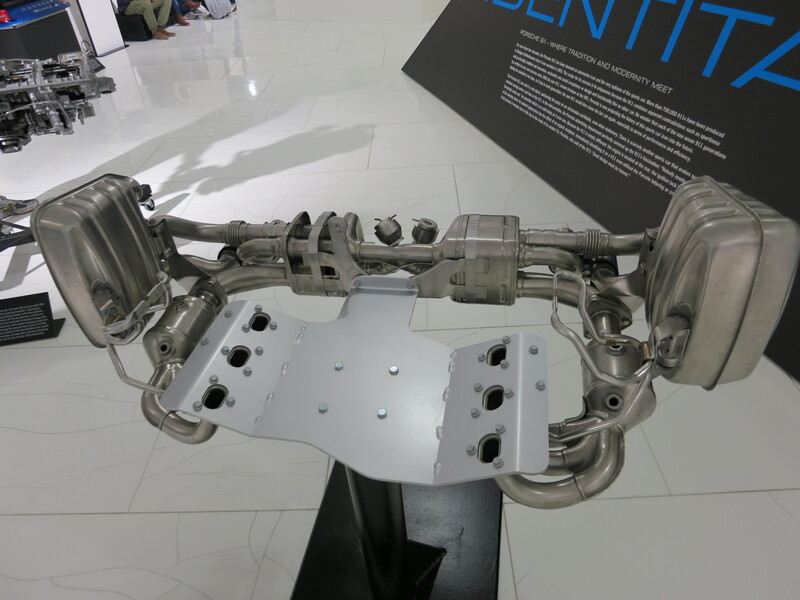 Robots place them on stands which may have "static" spot welding points and/or separate robot welding "arms" that move around. 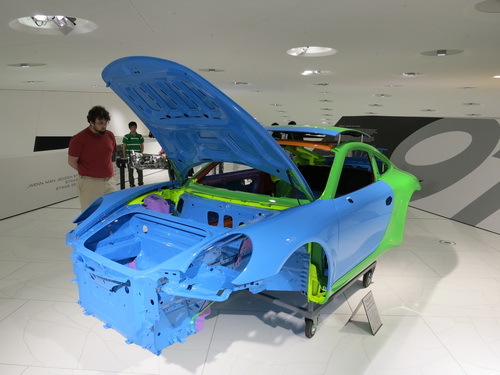 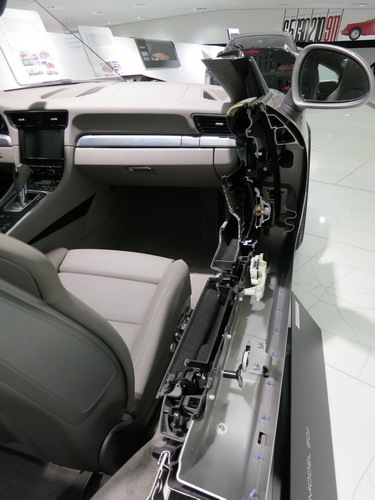 Takes 1 day to builld a chassis, 2 days to assemble the rest of the car by adding/connecting parts (much of it by hand). 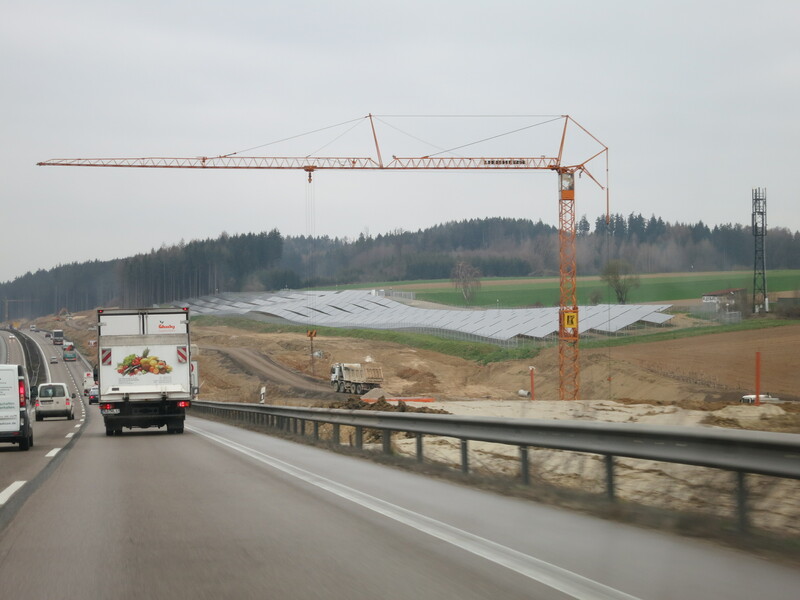 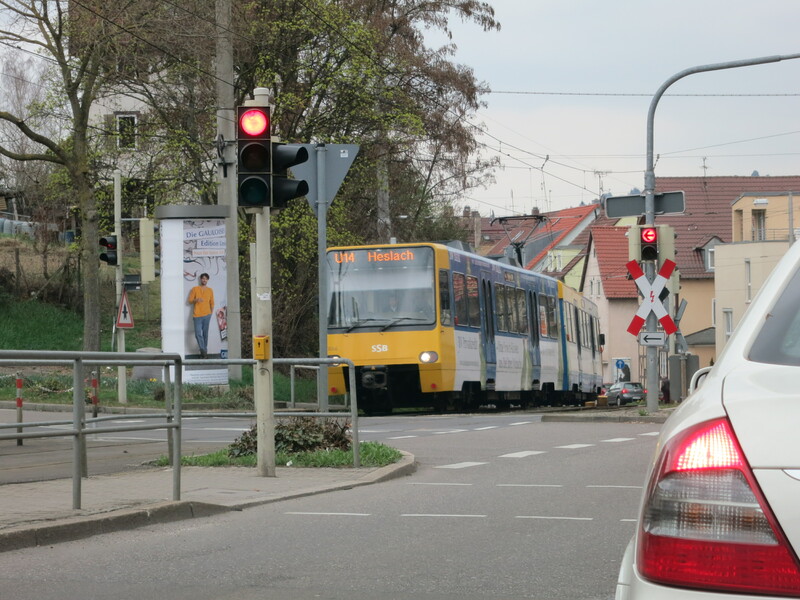 Doors are removed (by robots) after painting, follow in snaking overhead lines above their associated chassis. Dashboard (w/o switches, panels, displays, etc.) is intalled by a robot "arm" that screws in 4 bolts (I assume). 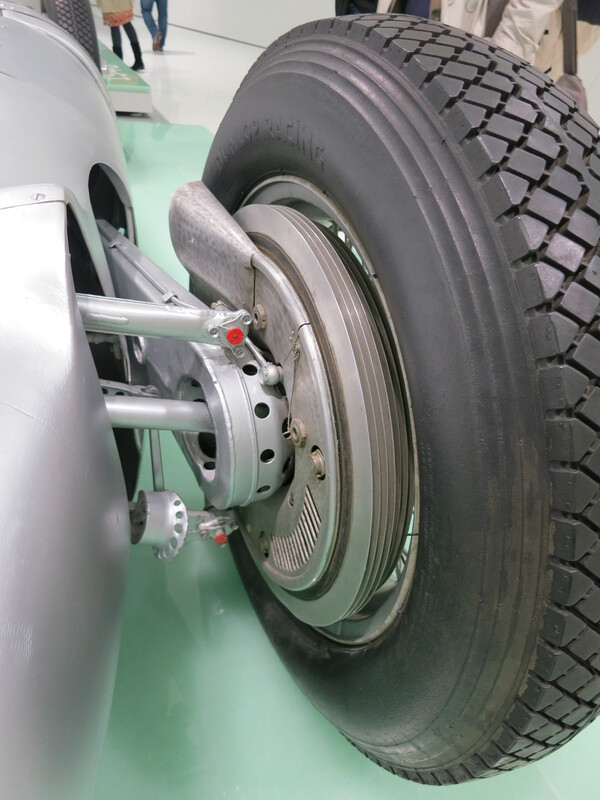 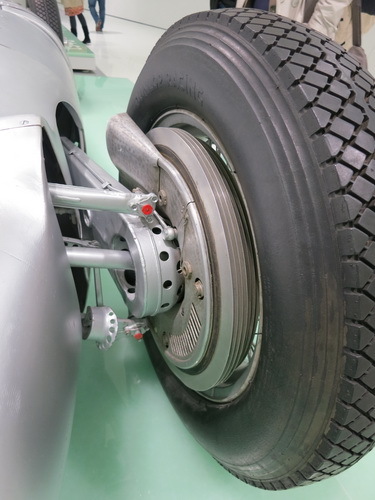 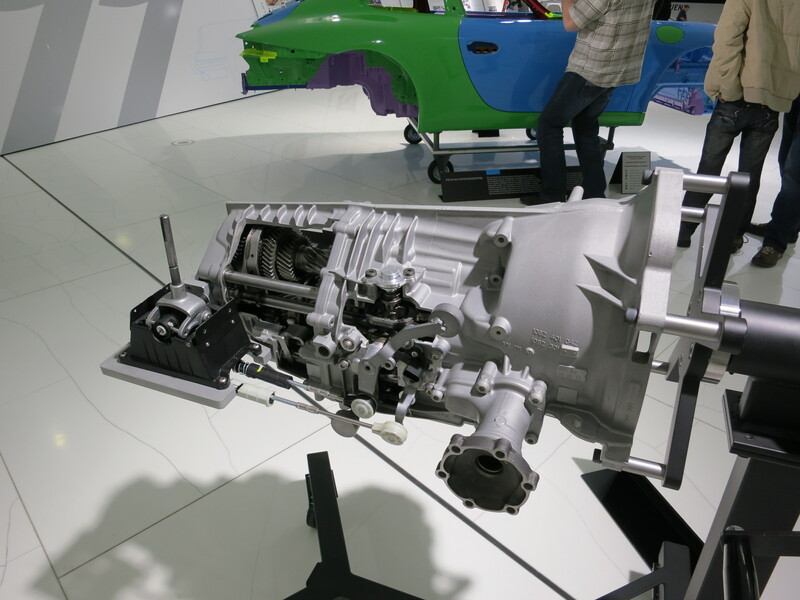 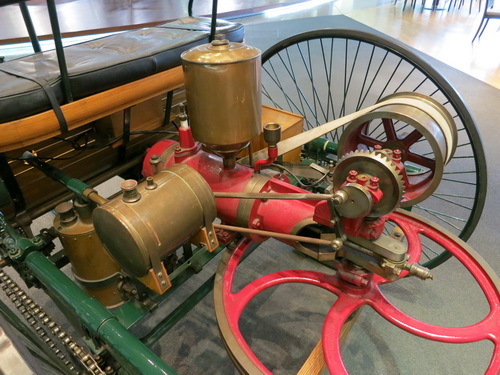 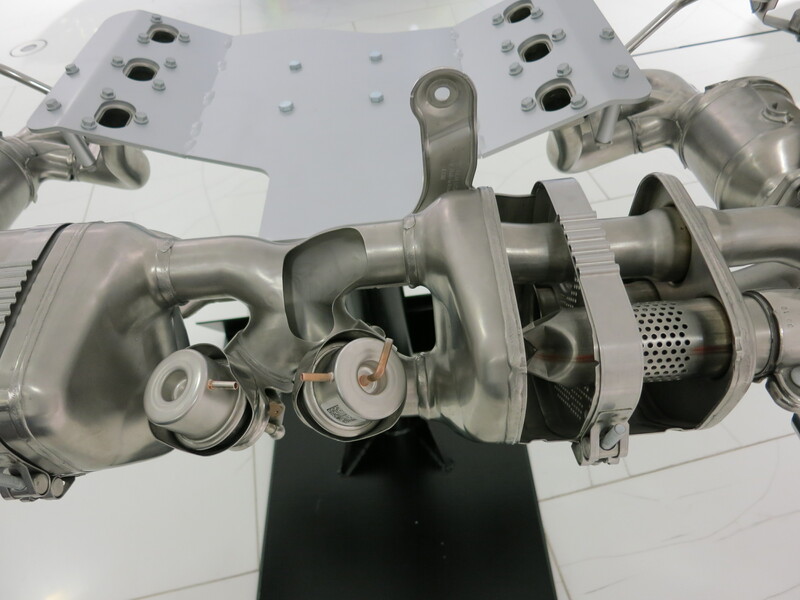 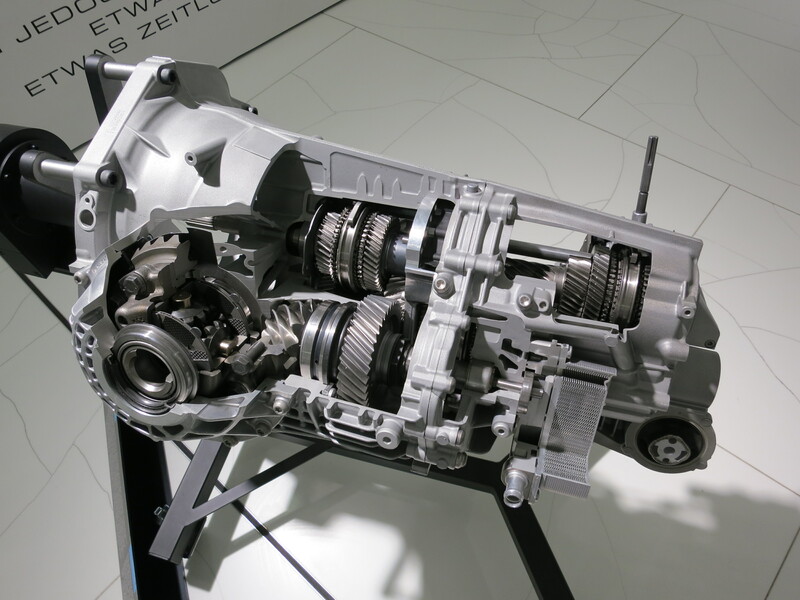 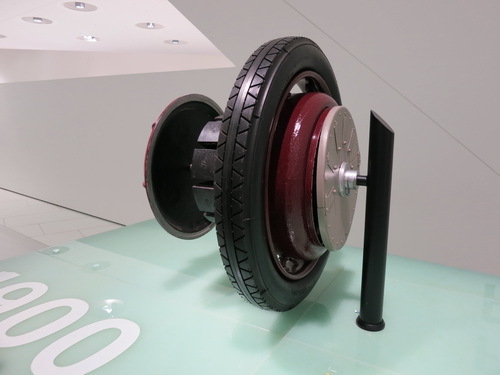 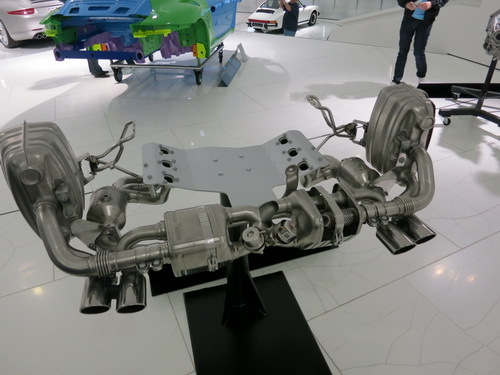 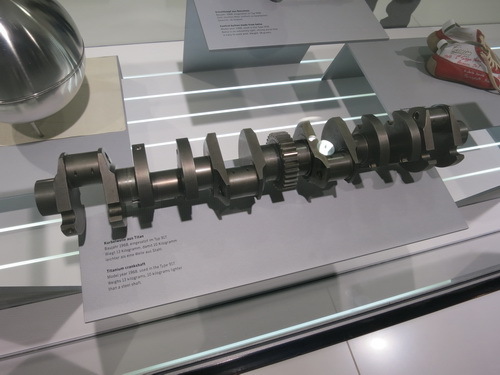 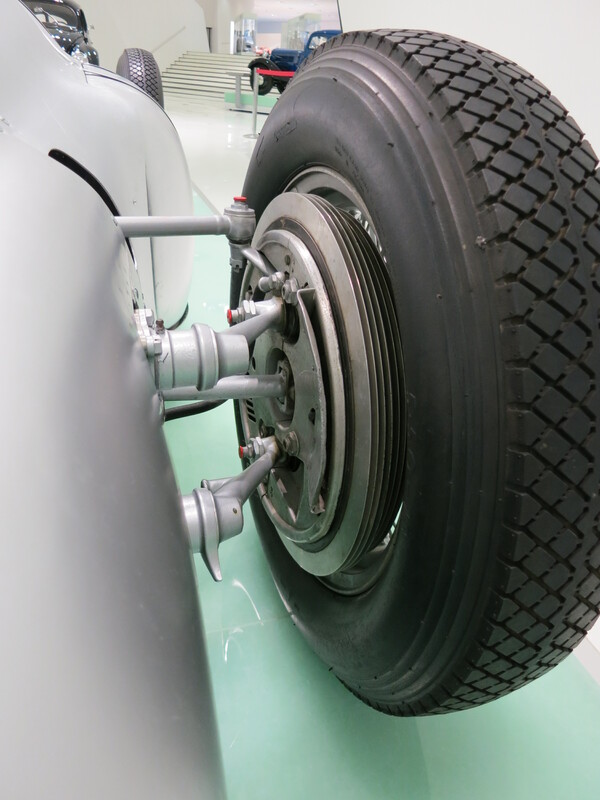 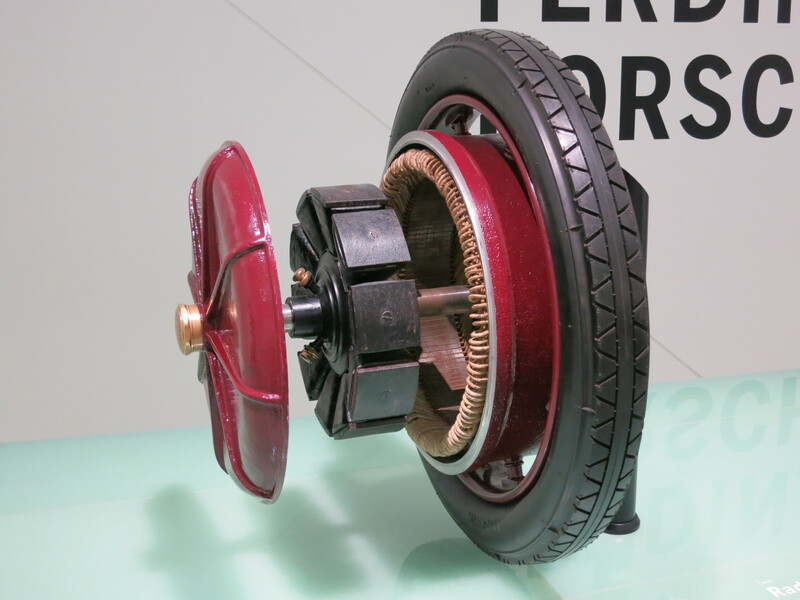 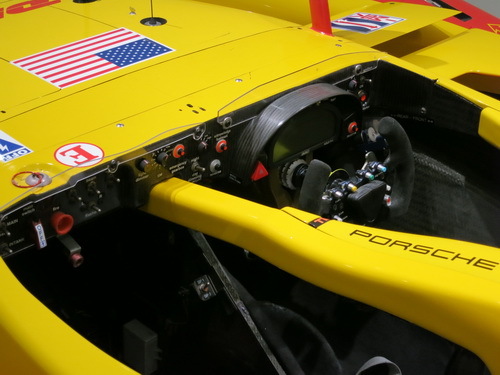 Driveline is "married" to the chassis -- human beings place the springs manually and then the driveline is pushed up into contact with the chassis. 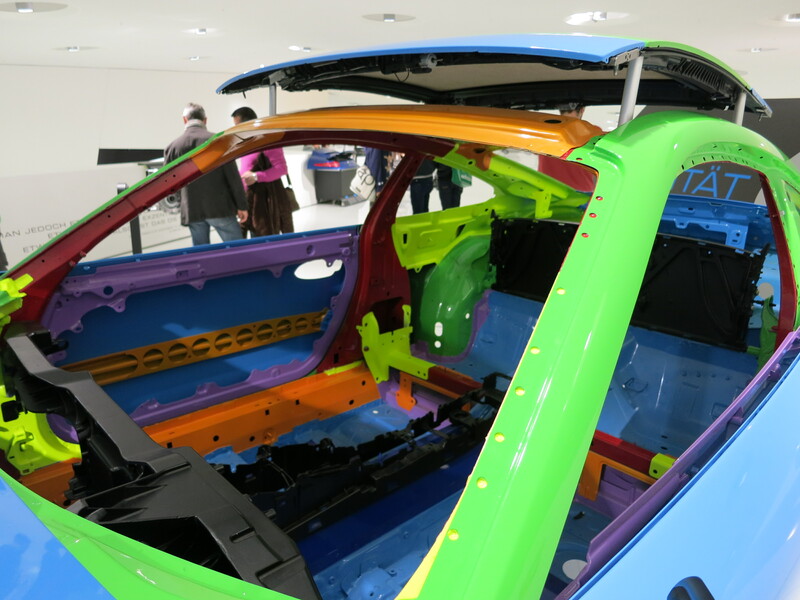 In the final portion of the assembly line (just before electronics checks)) there is a hooded station bristling inside with cameras (and other sensors) to automatically measure body gaps (and other fit and finish). 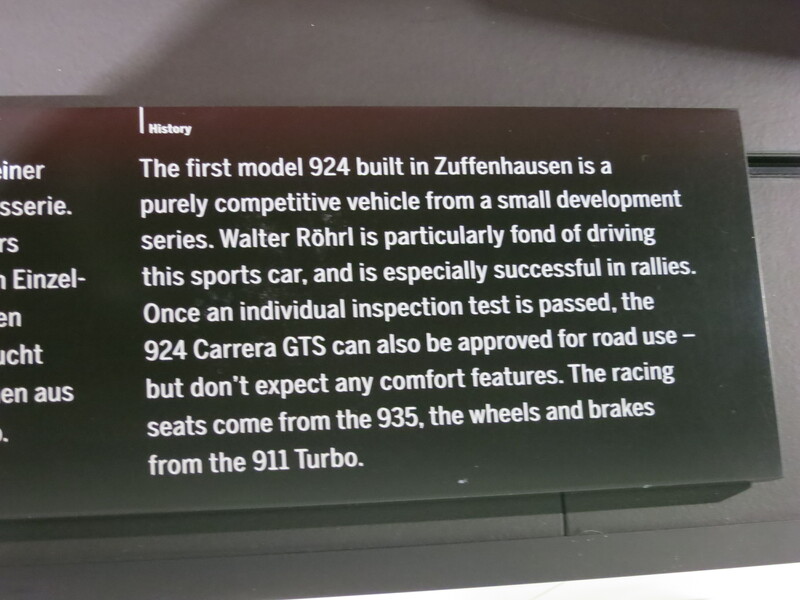 We saw a few test "mules" (pre-production cars) on the test track and grounds. 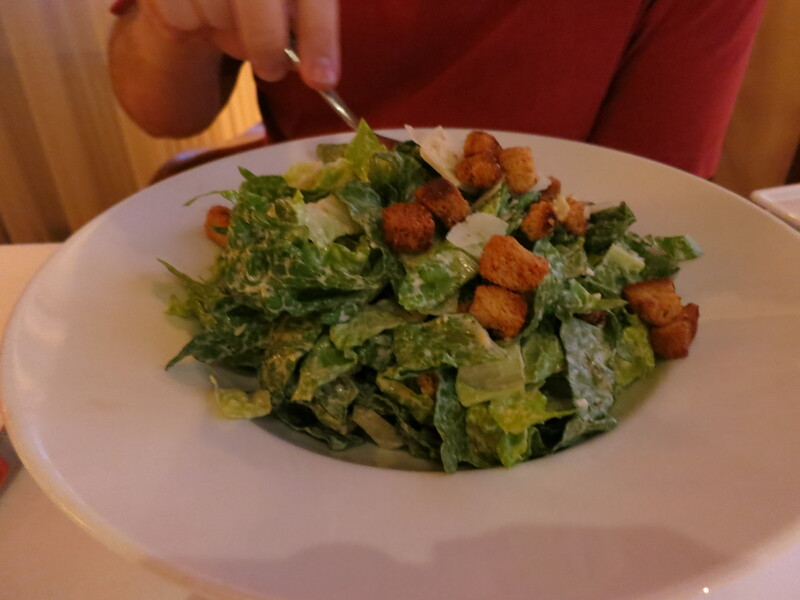 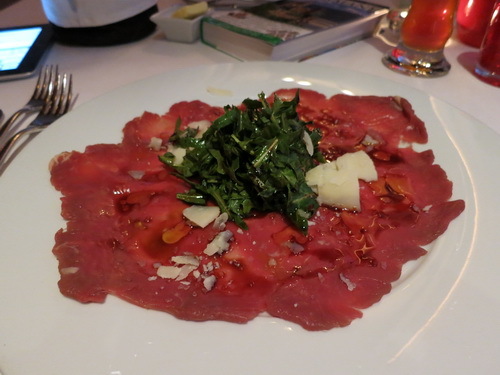 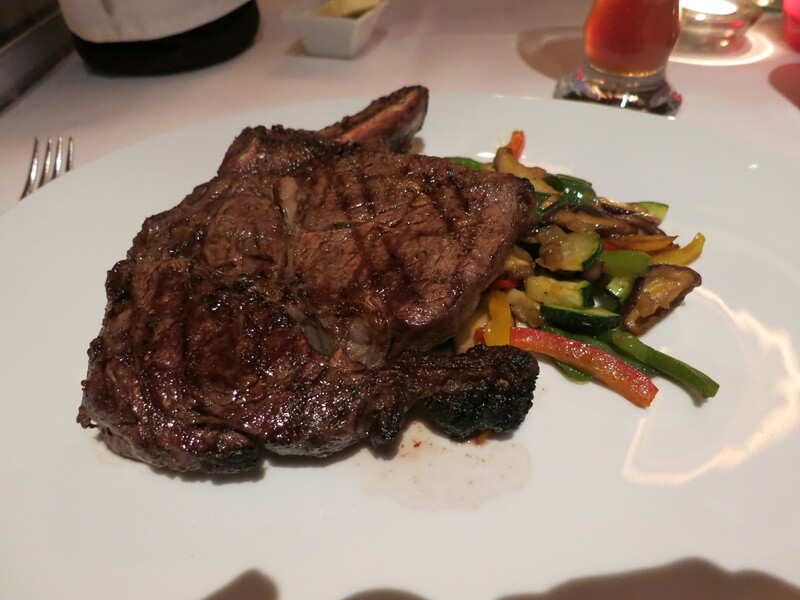 After the tour we ate lunch at the M-B restaurant. 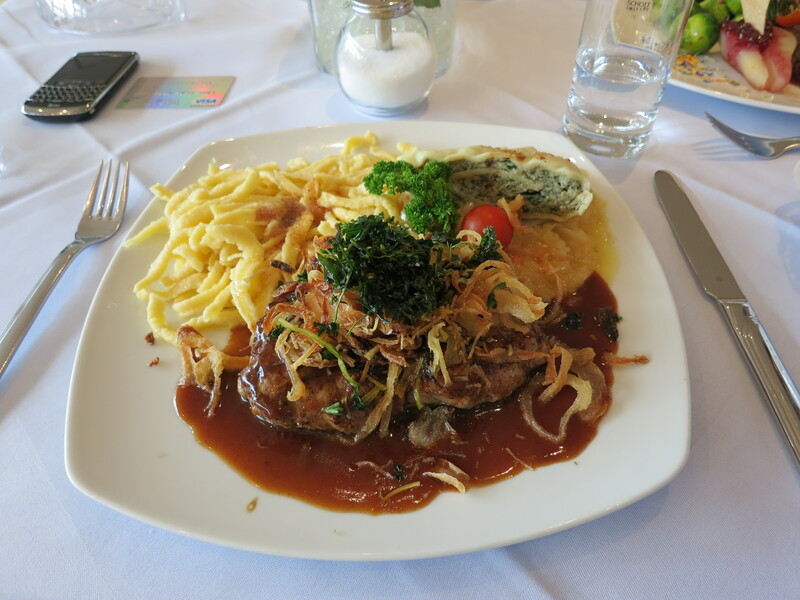 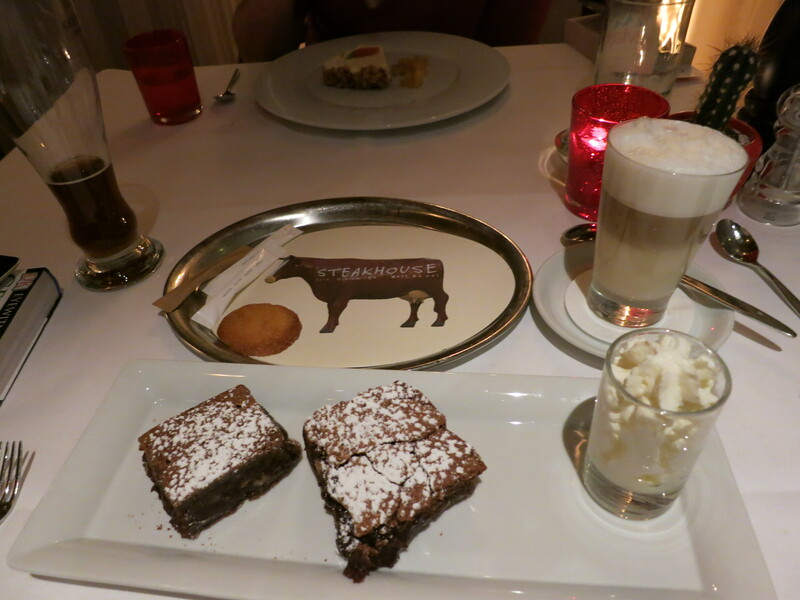 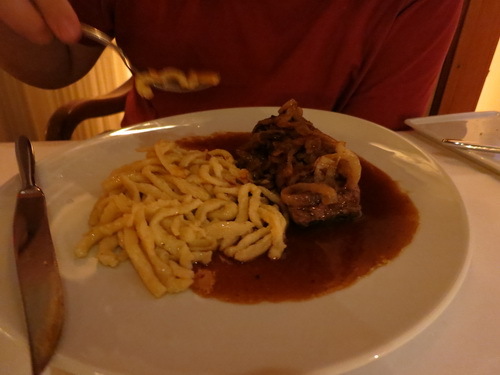 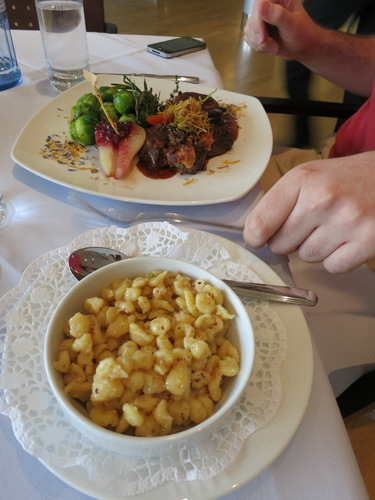 Typical Swabian fare: beef, noodles, sauerkraut for Ben, venison, noodles, and Brussels Sprouts for Nate. 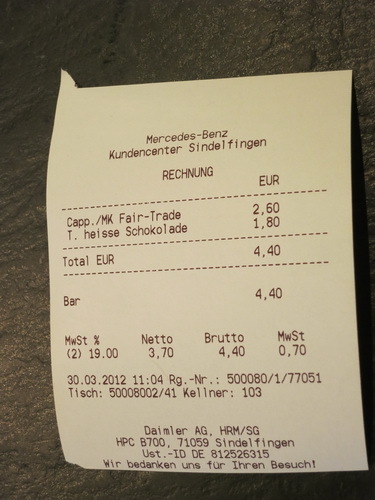 We finished lunch about 2:20 p.m. and started driving toward the Mercedes-Benz Museum. 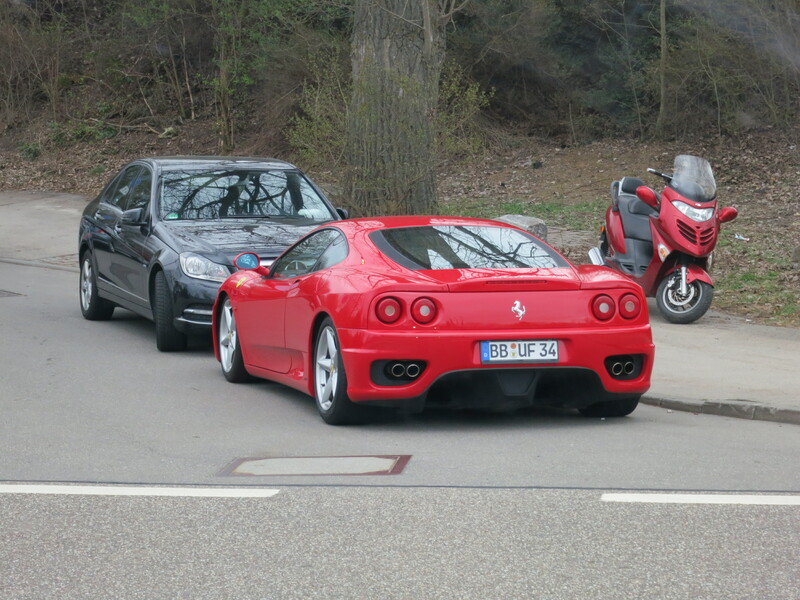 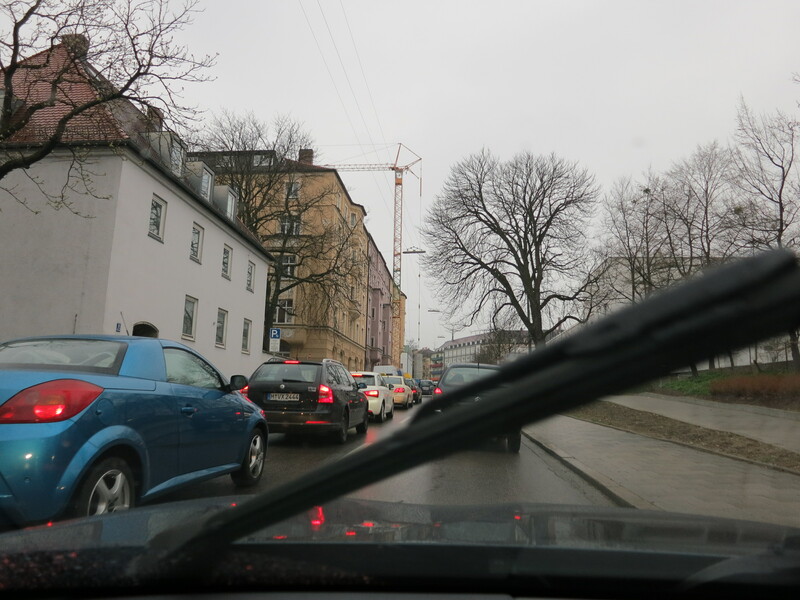 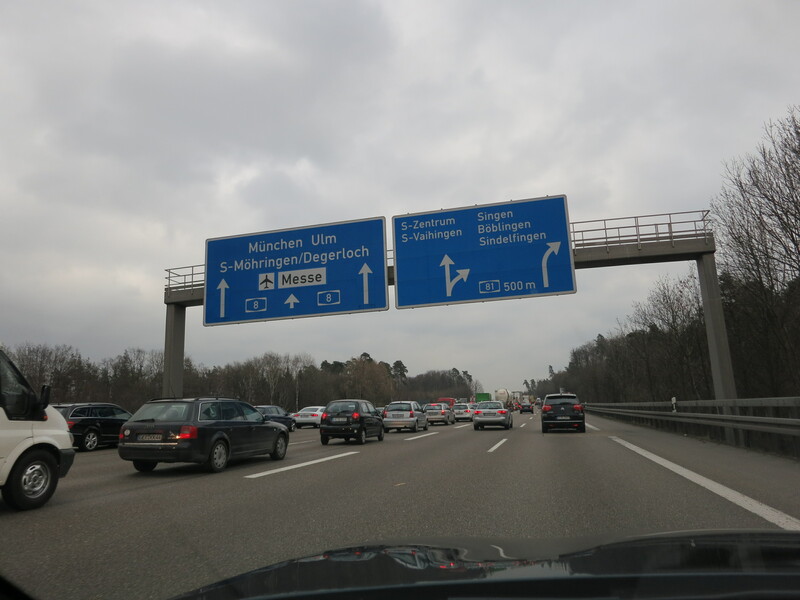 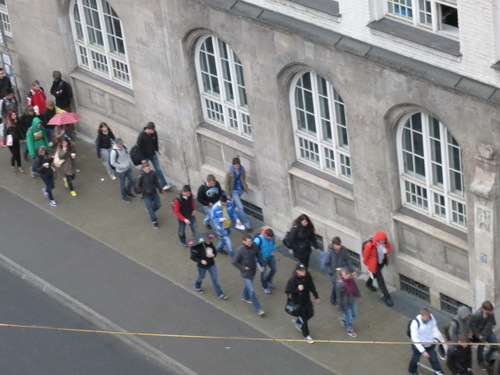 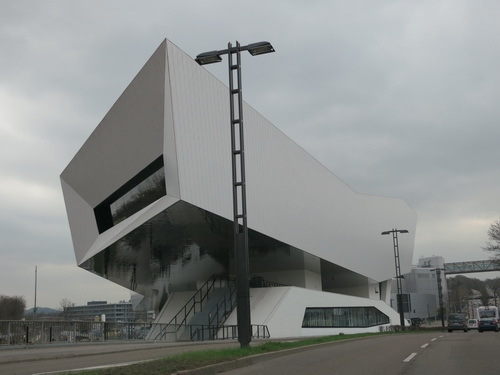 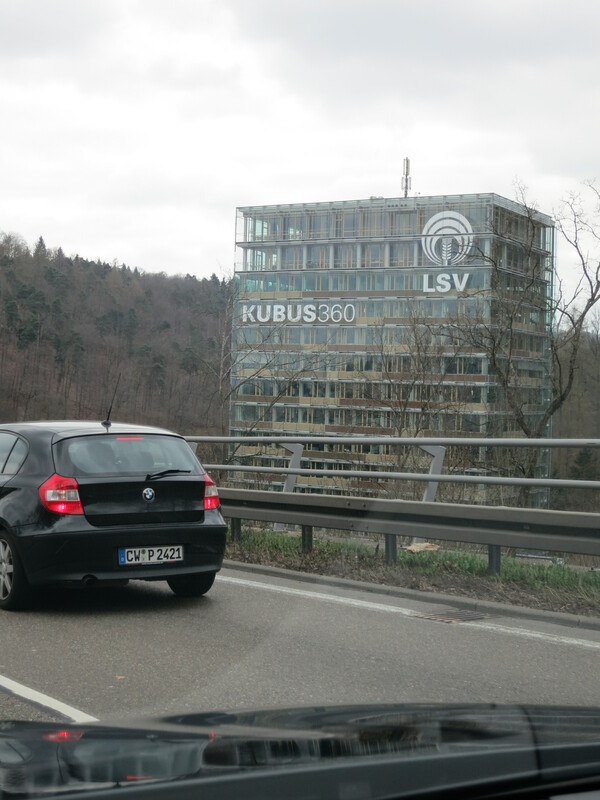 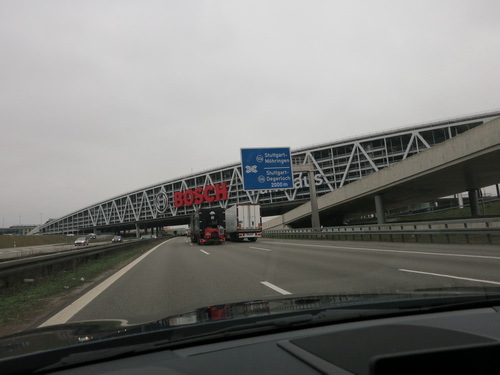 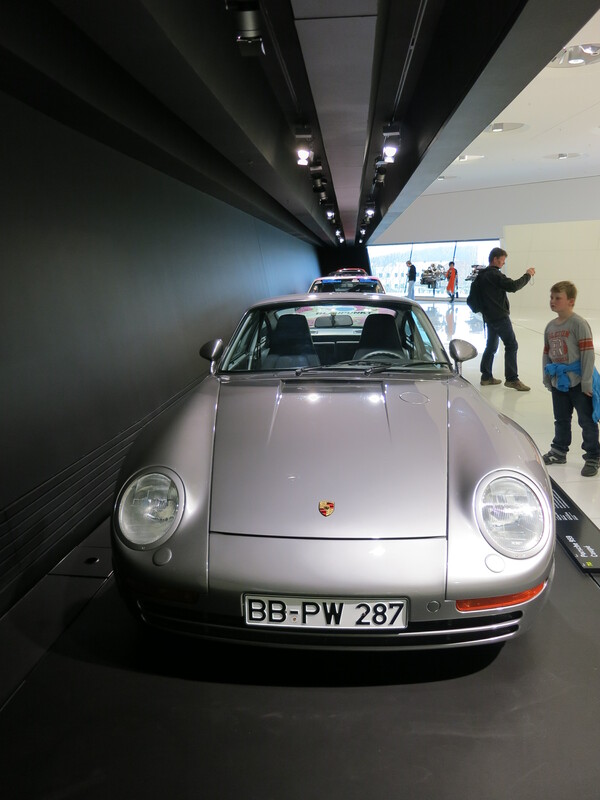 But we encountered heavy traffic (Friday afternoon on a vacation weekend) and we decided to head to the Porsche Museum instead. 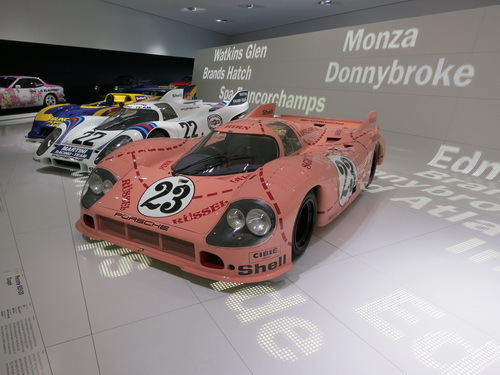 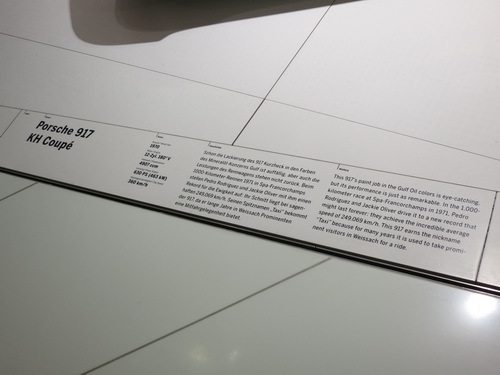 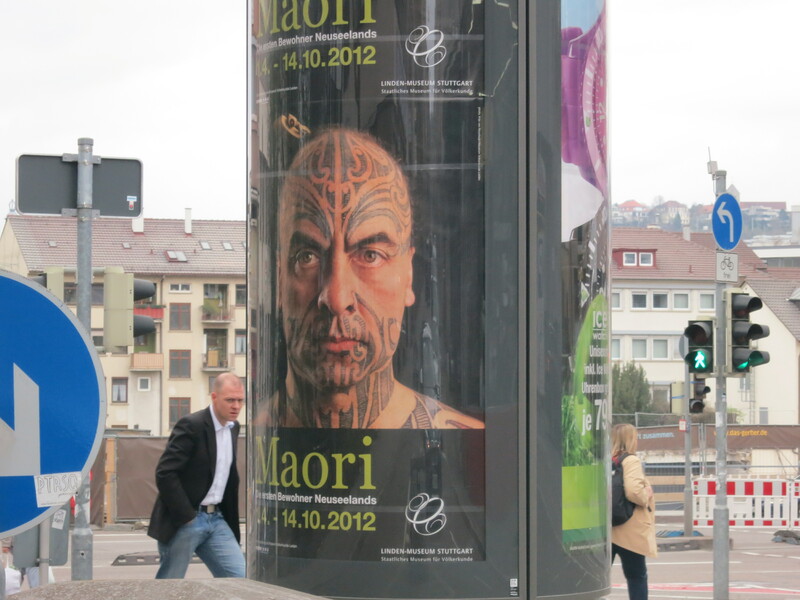 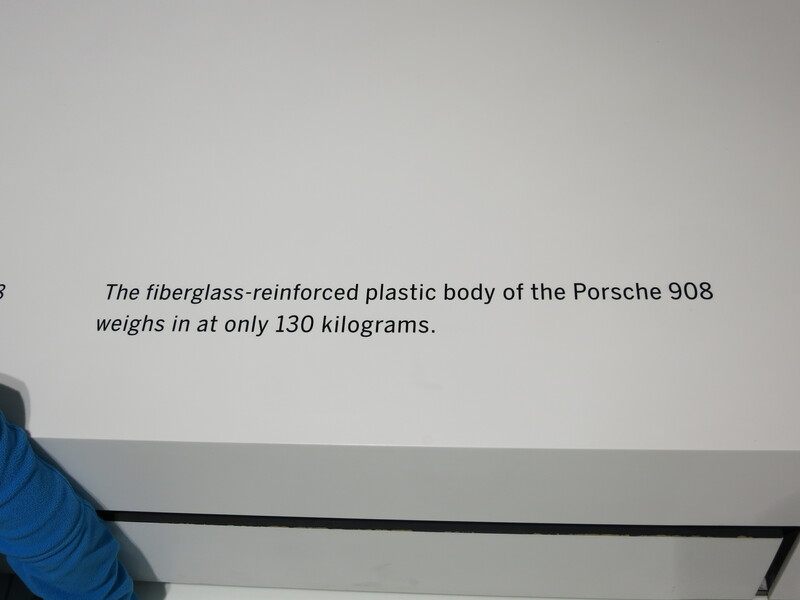 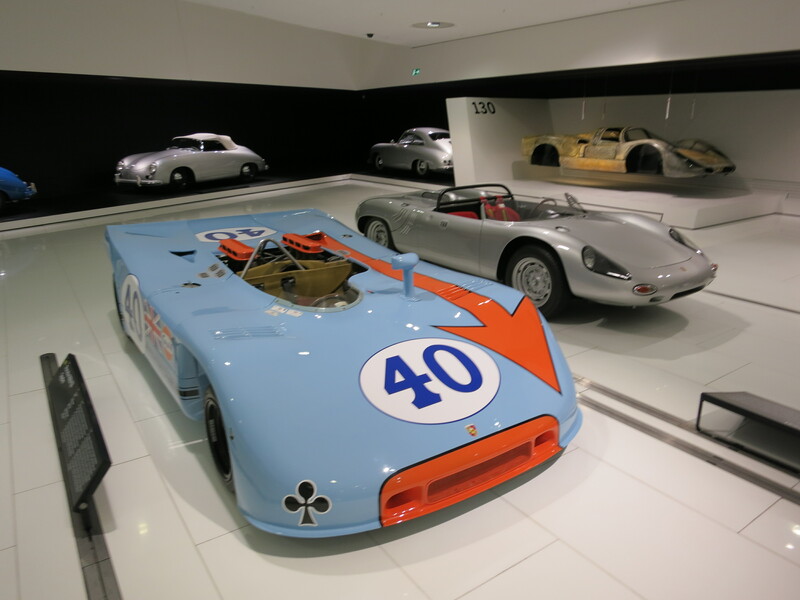 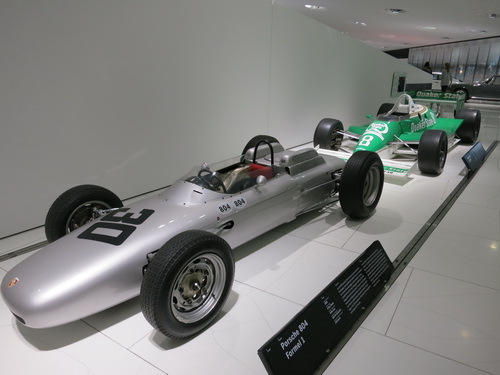 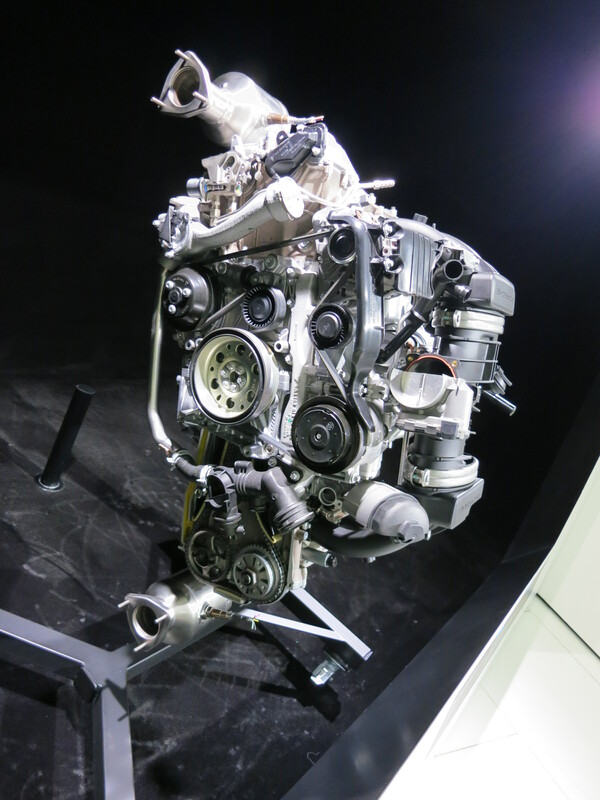 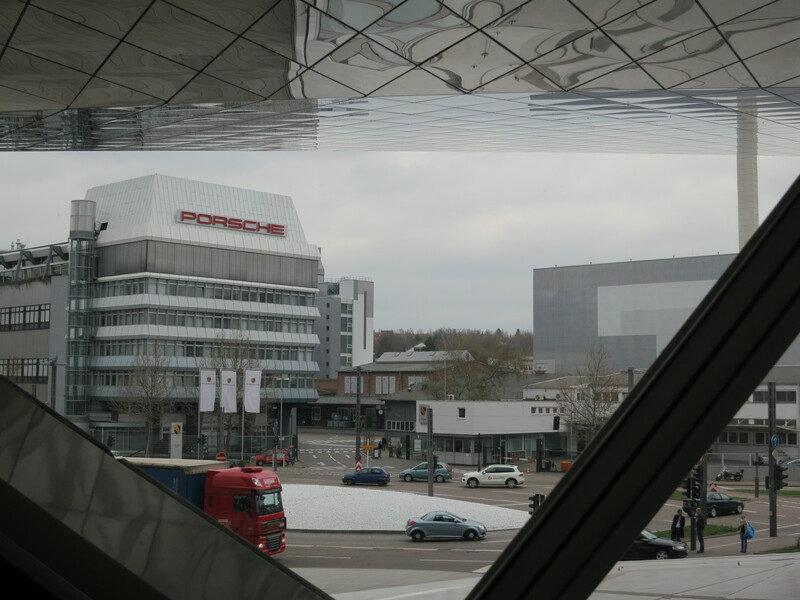 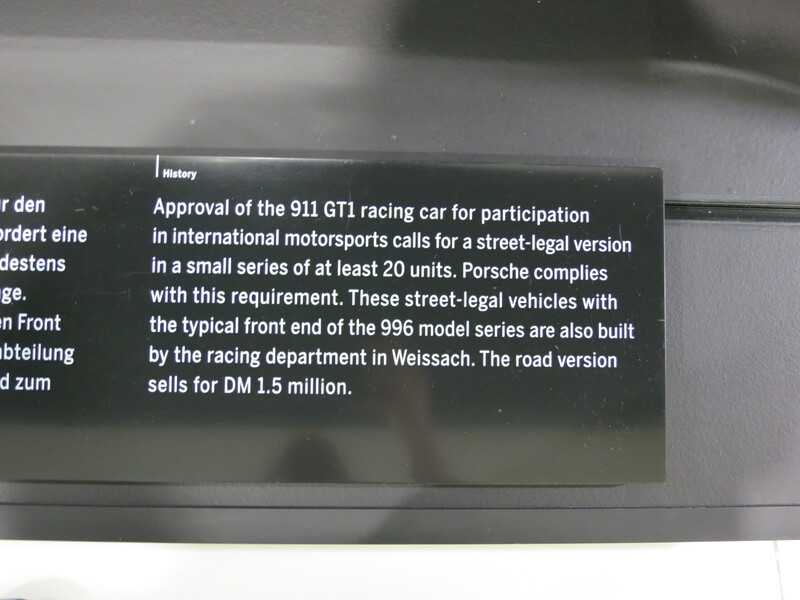 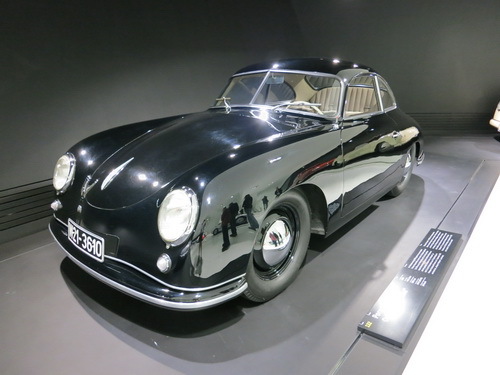 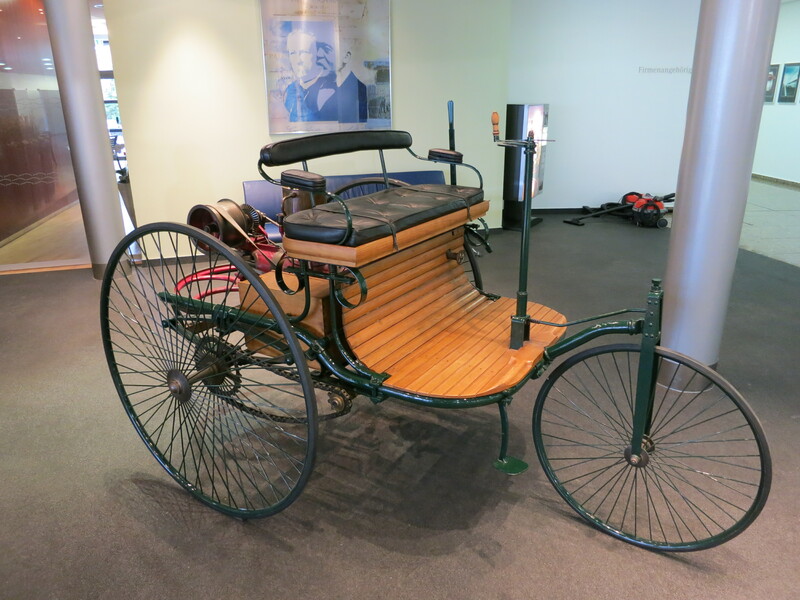 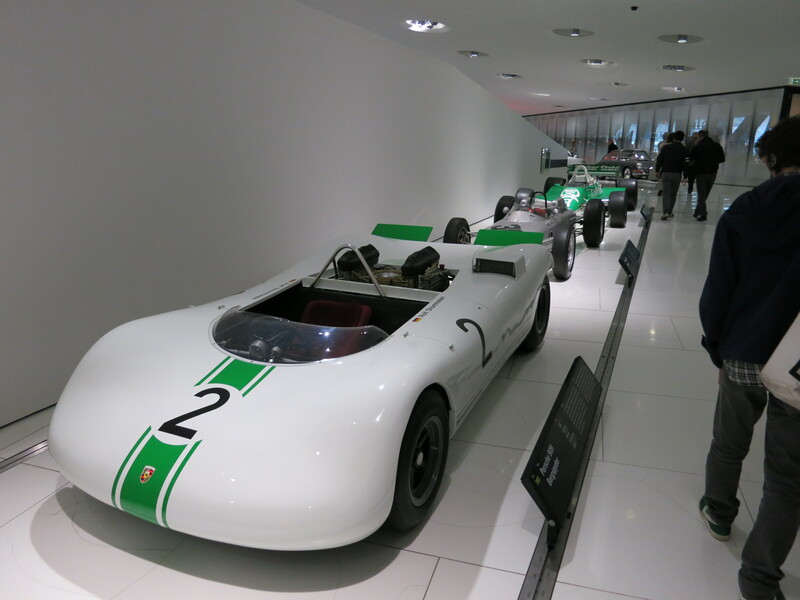 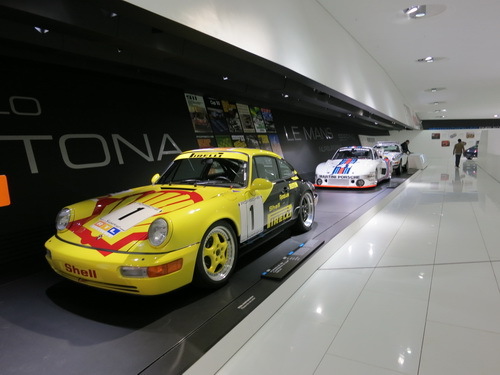 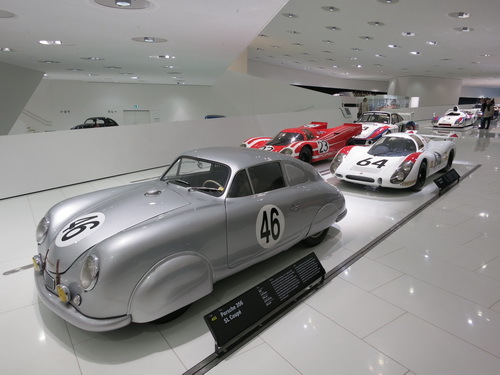 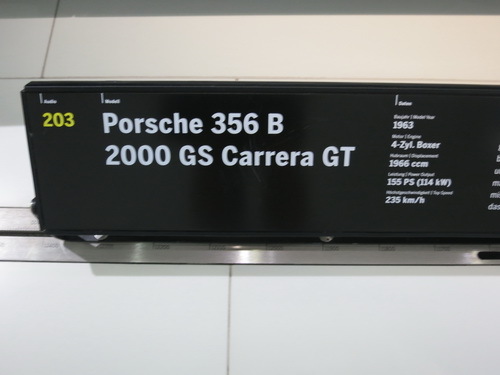 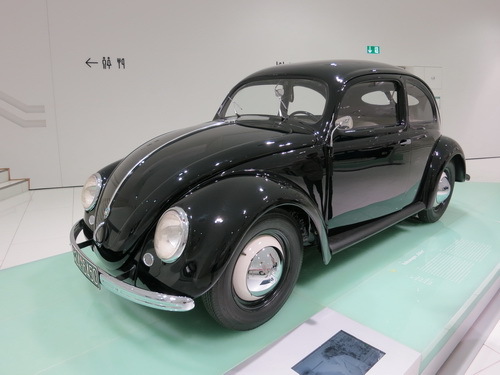 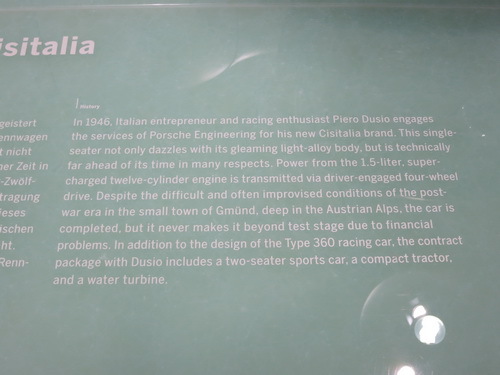 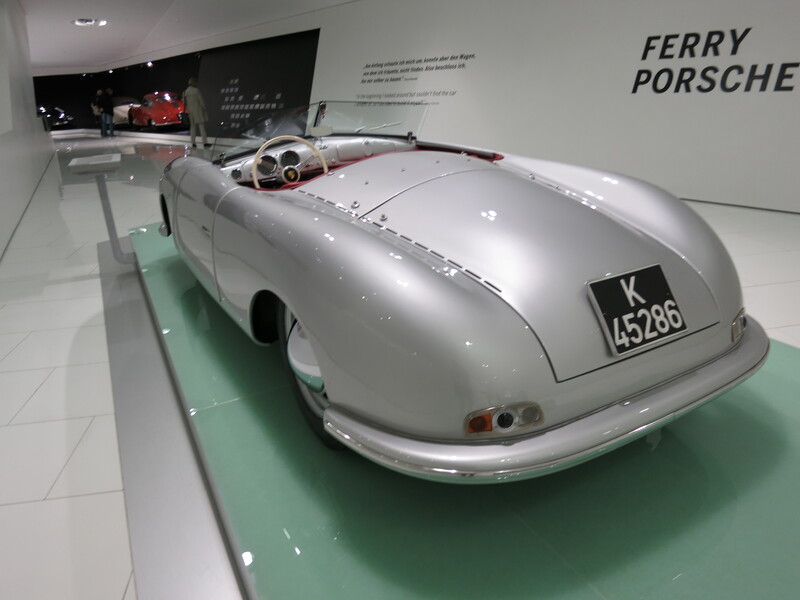 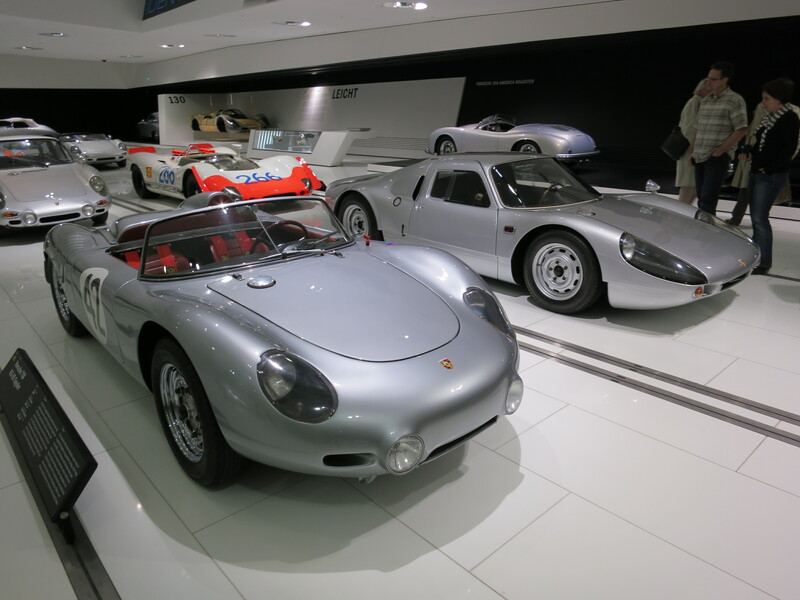 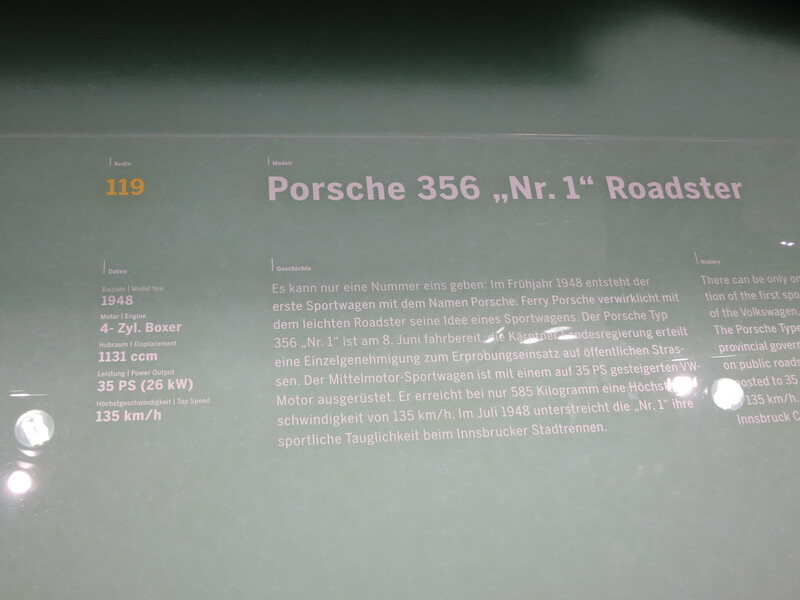 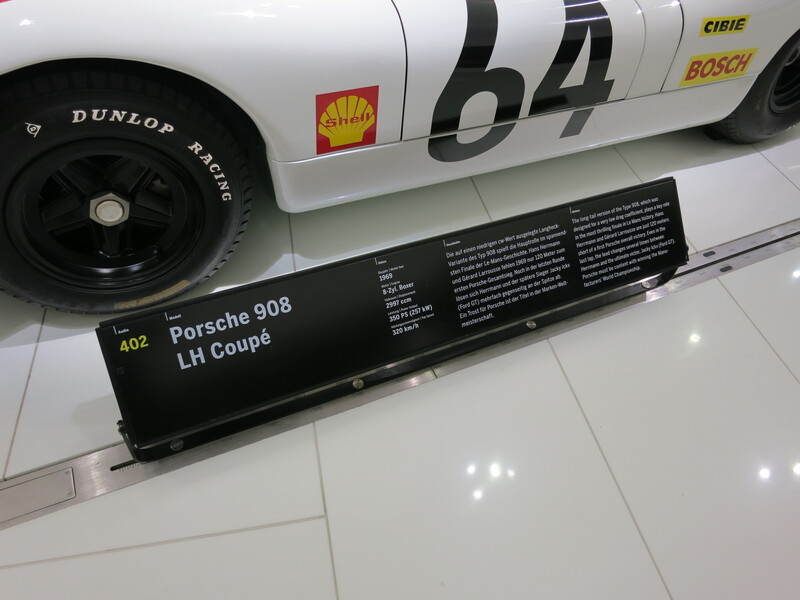 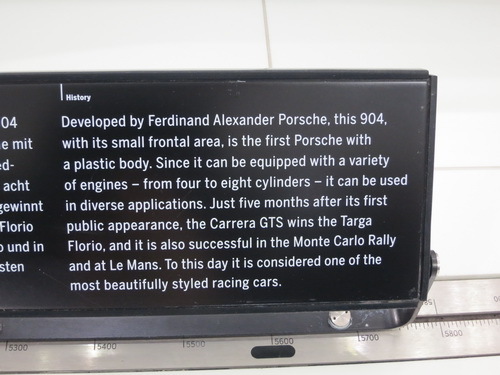 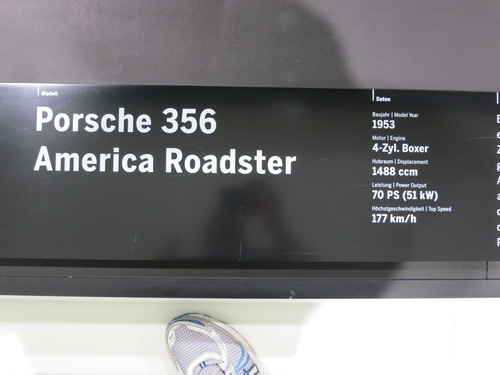 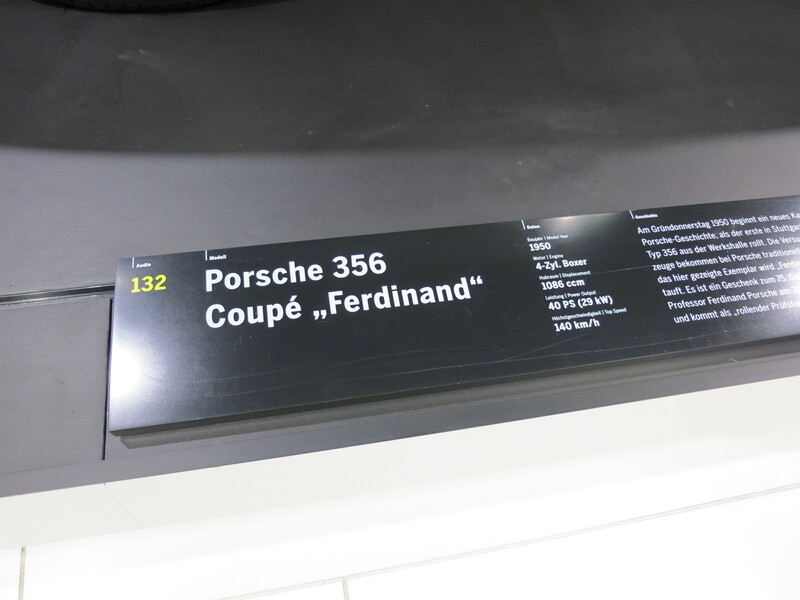 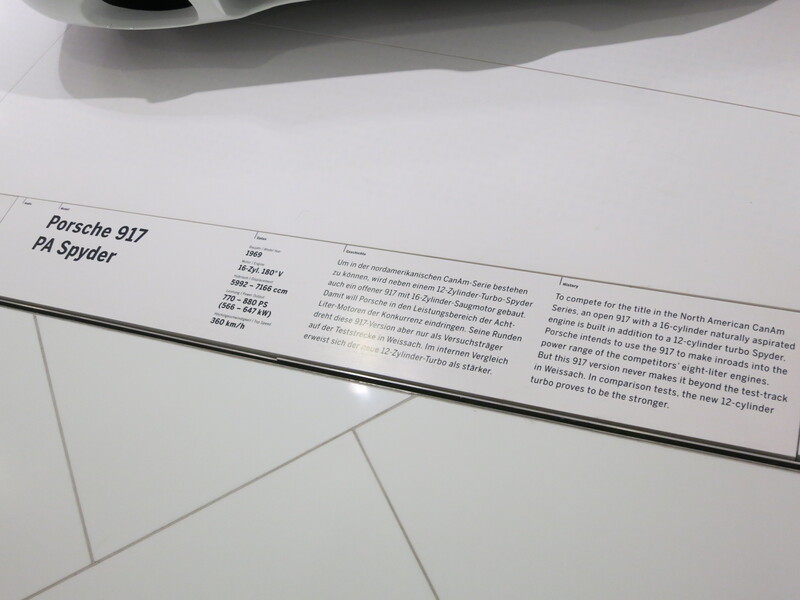 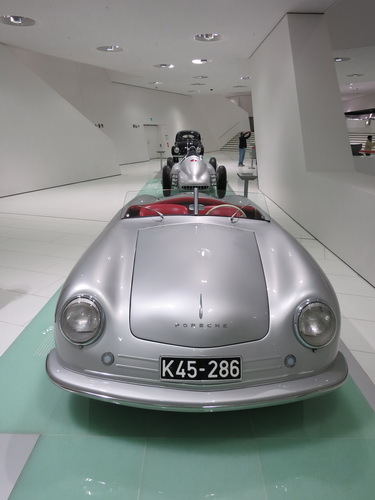 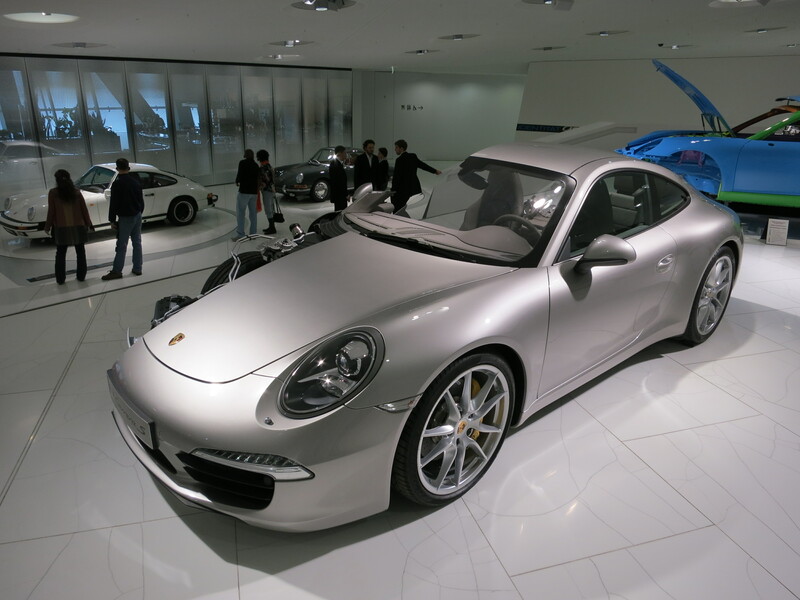 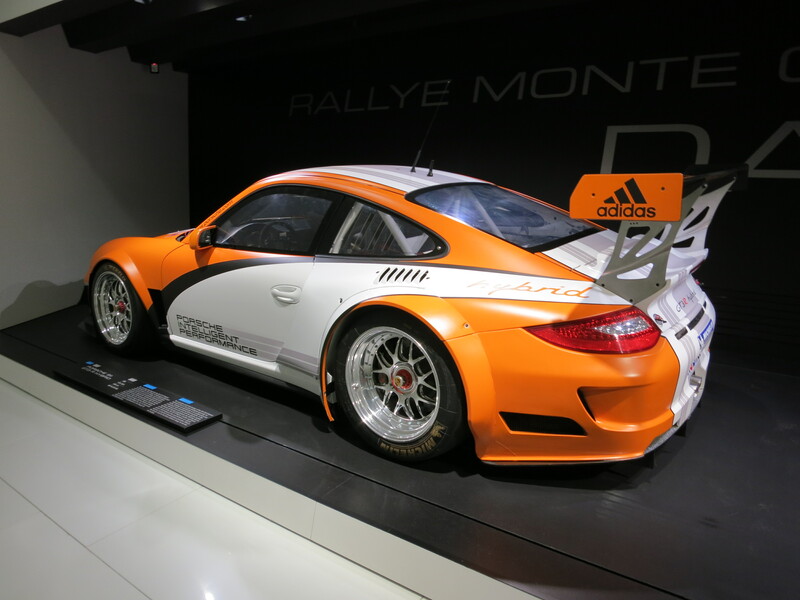 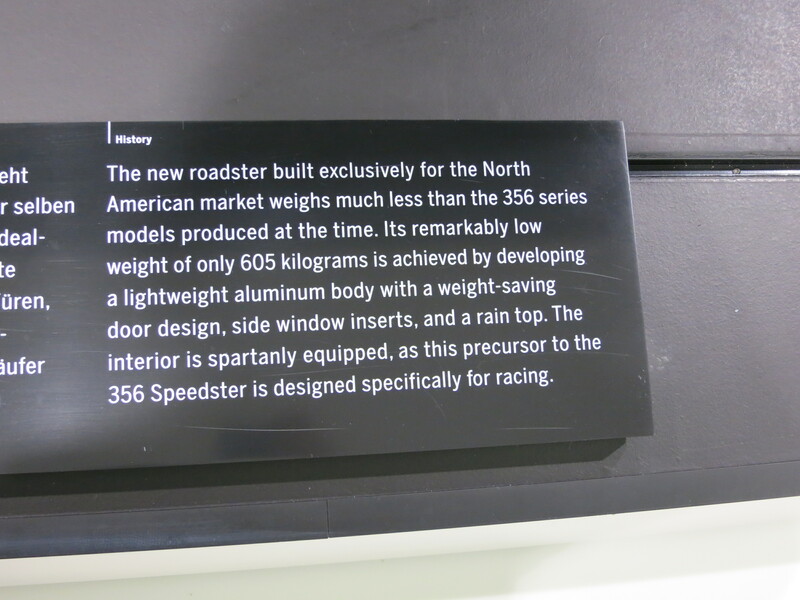 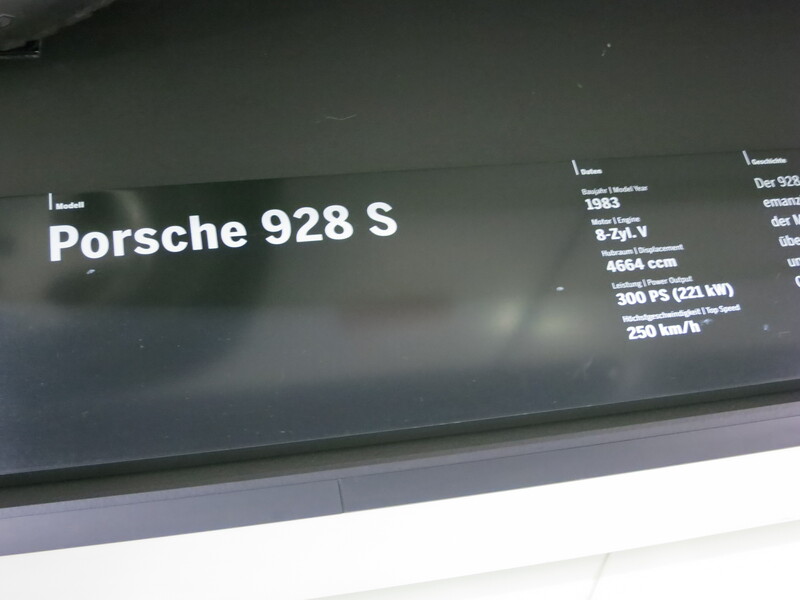 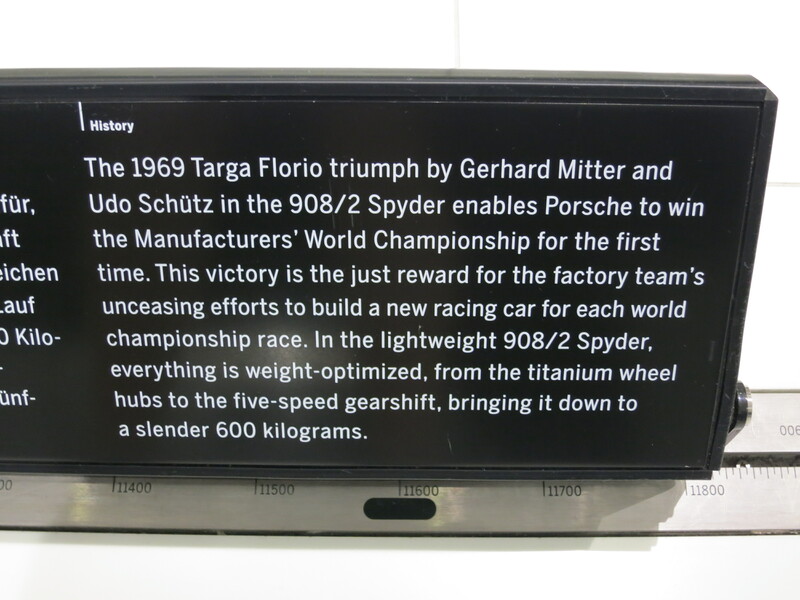 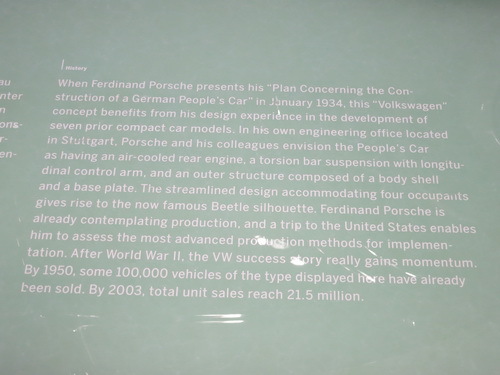 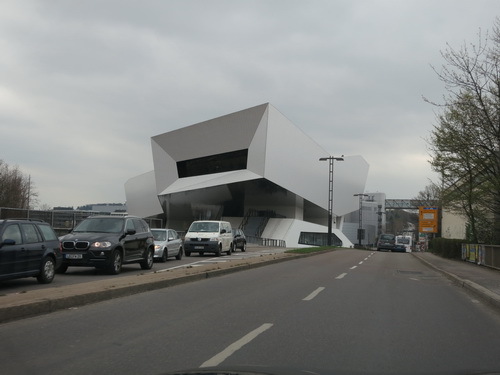 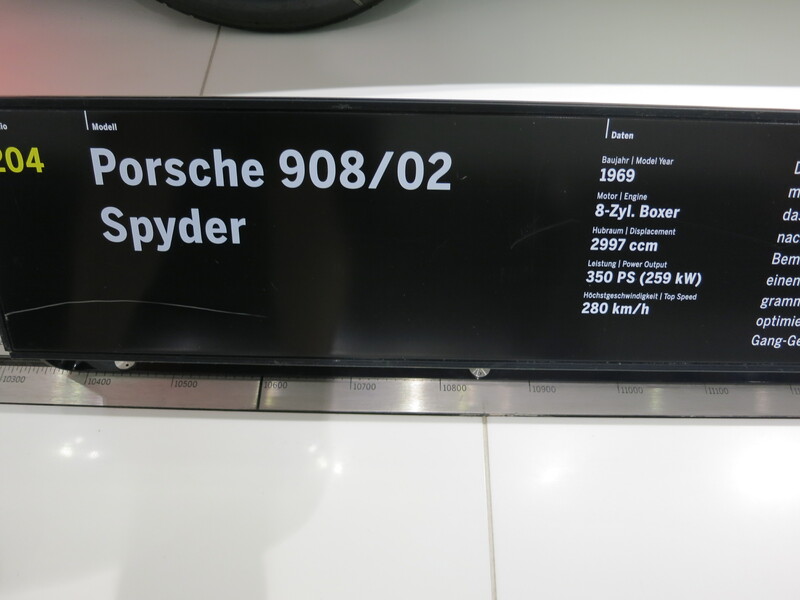 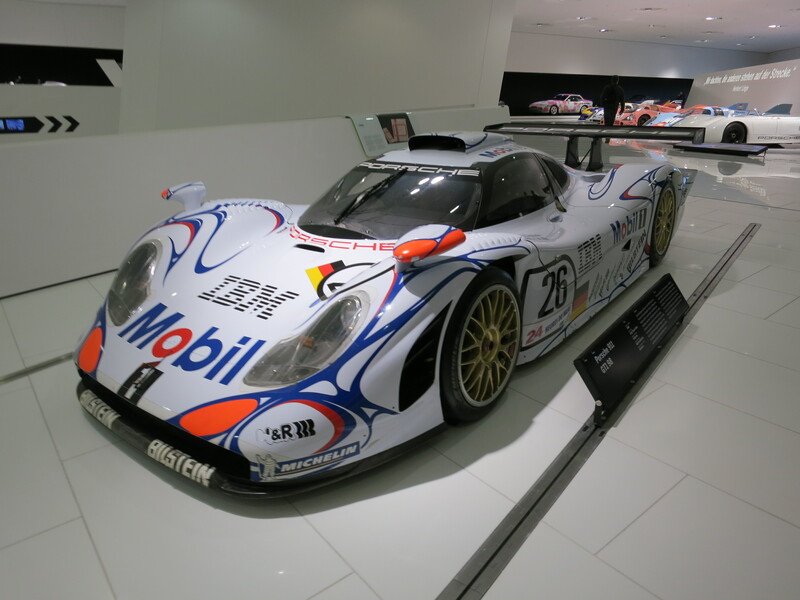 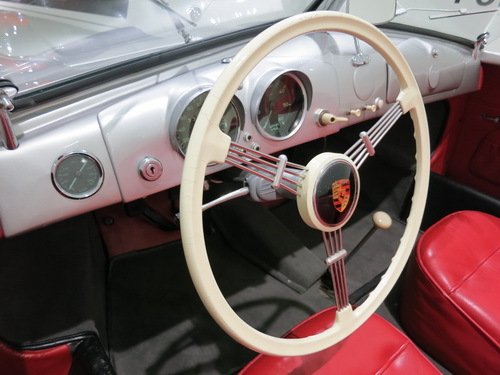 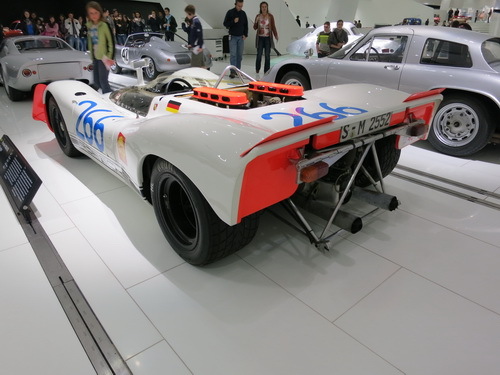 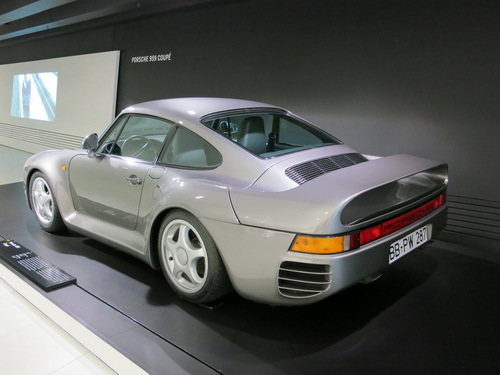 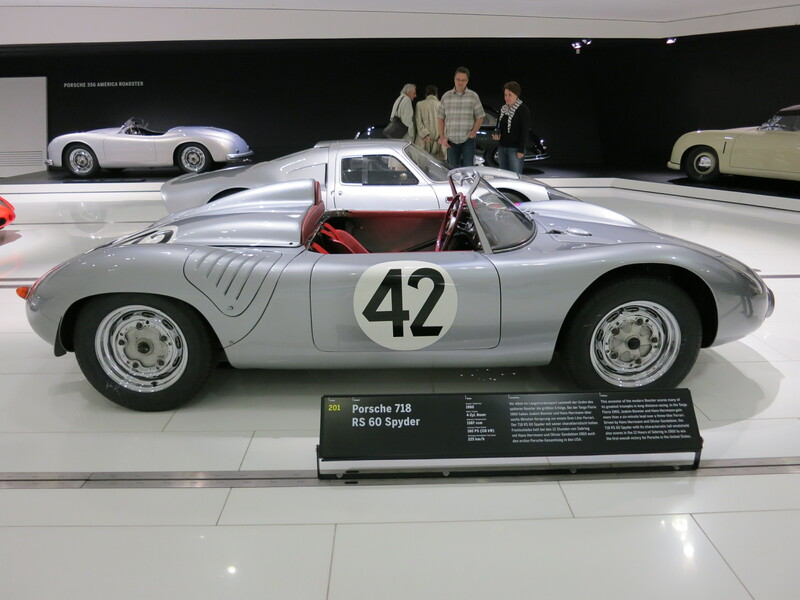 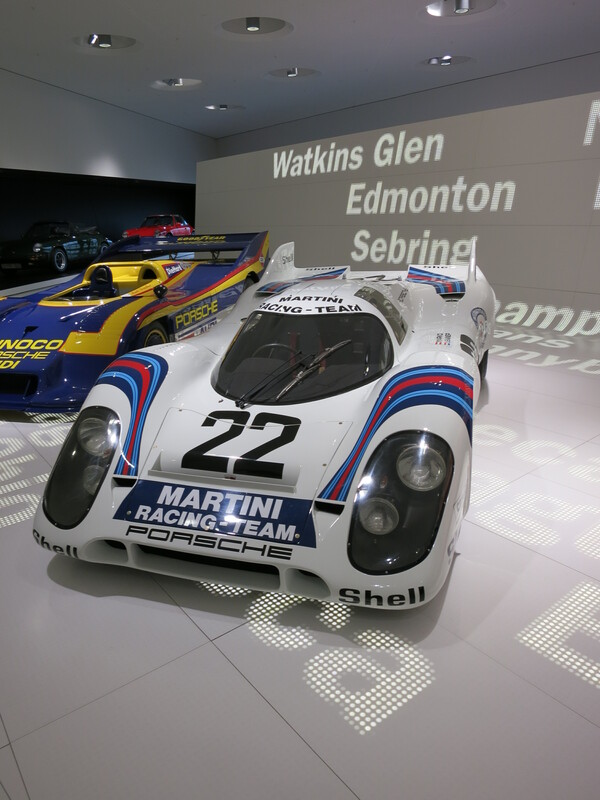 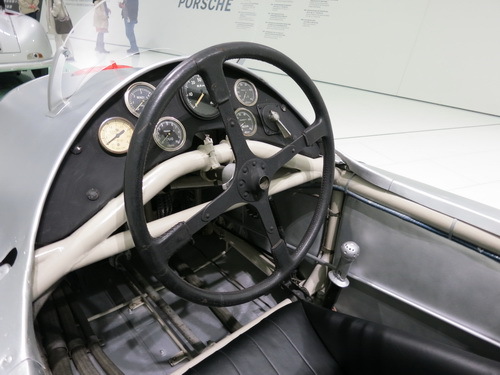 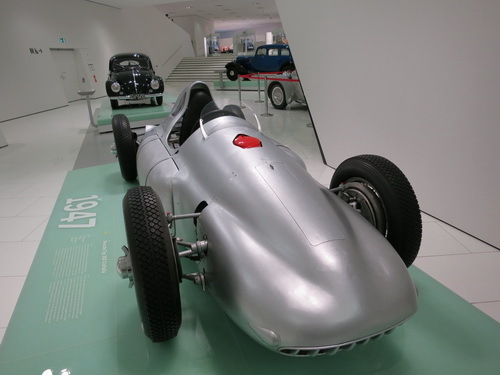 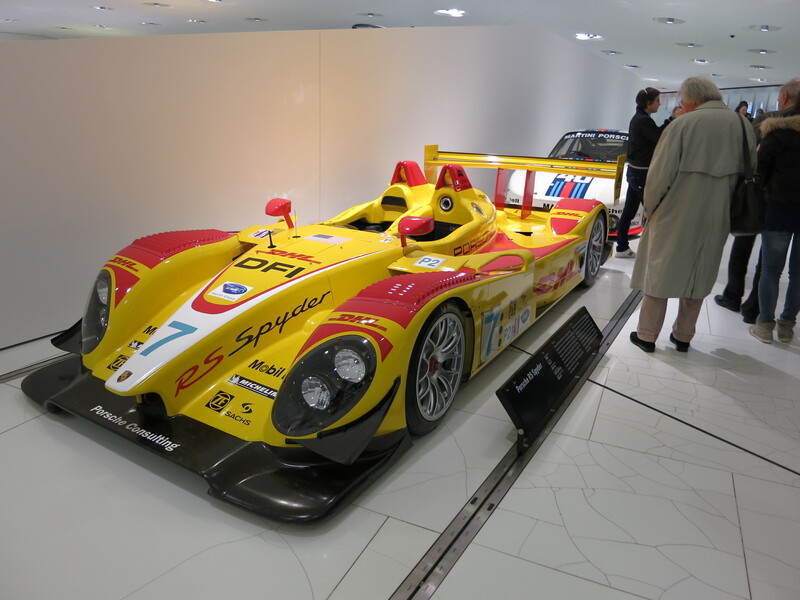 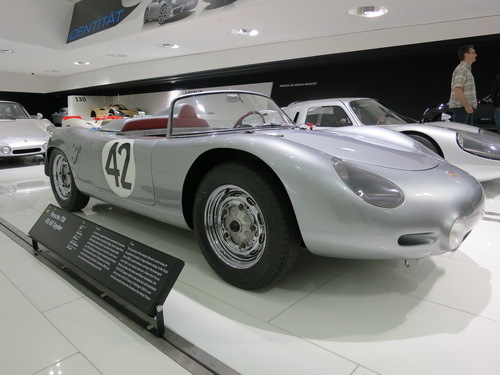 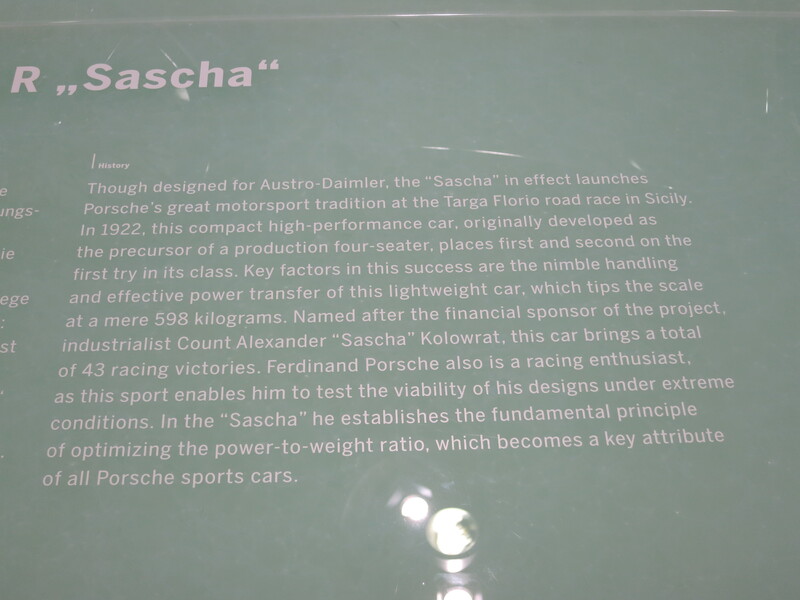 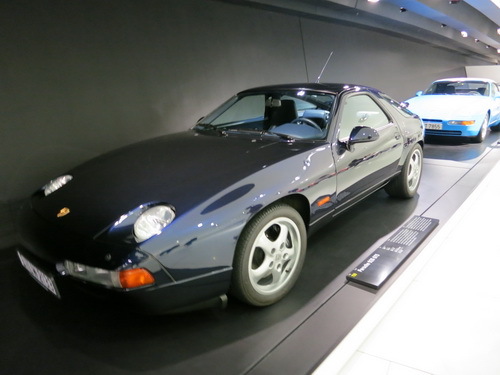 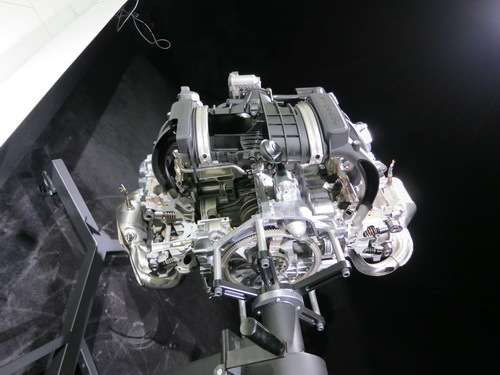 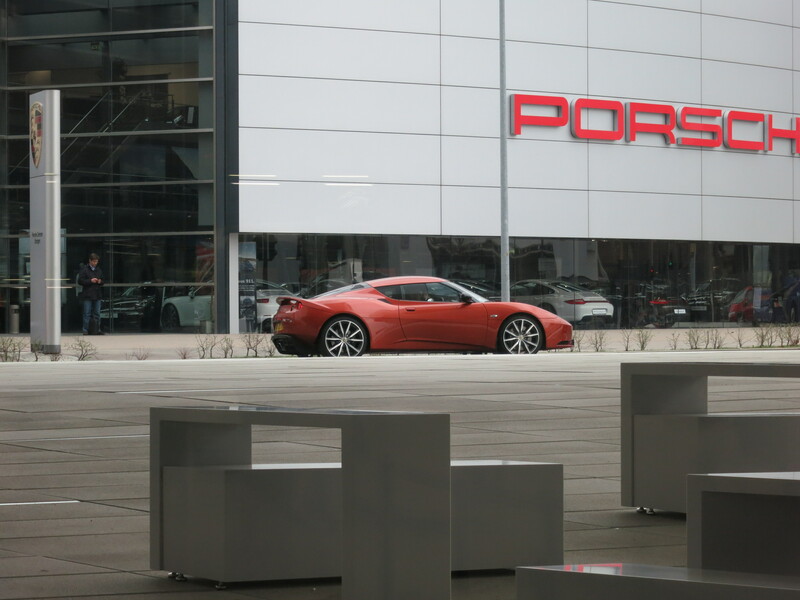 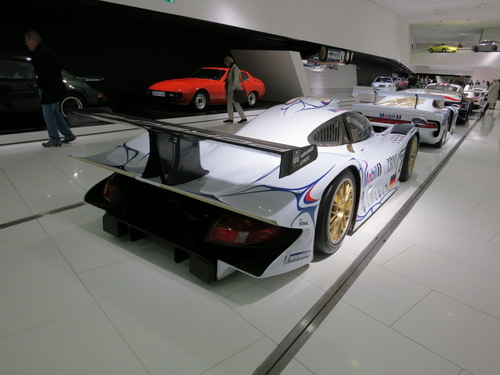 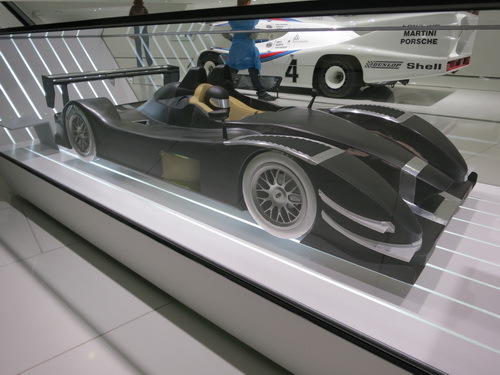 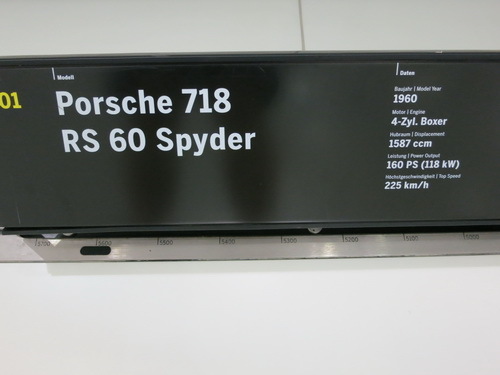 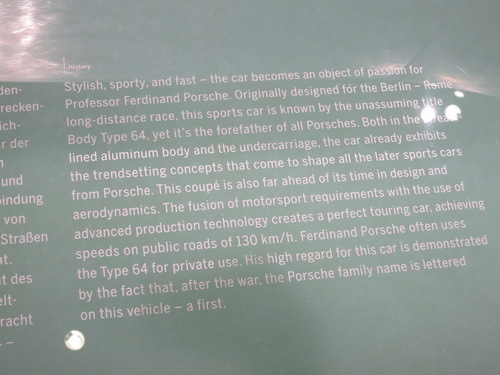 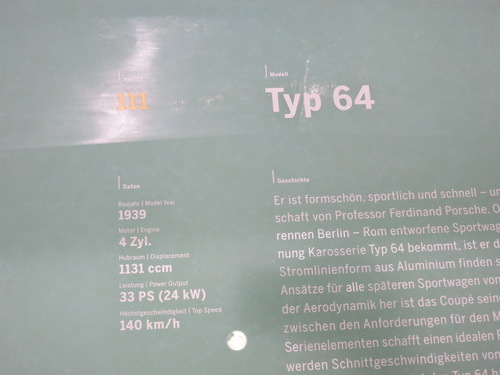 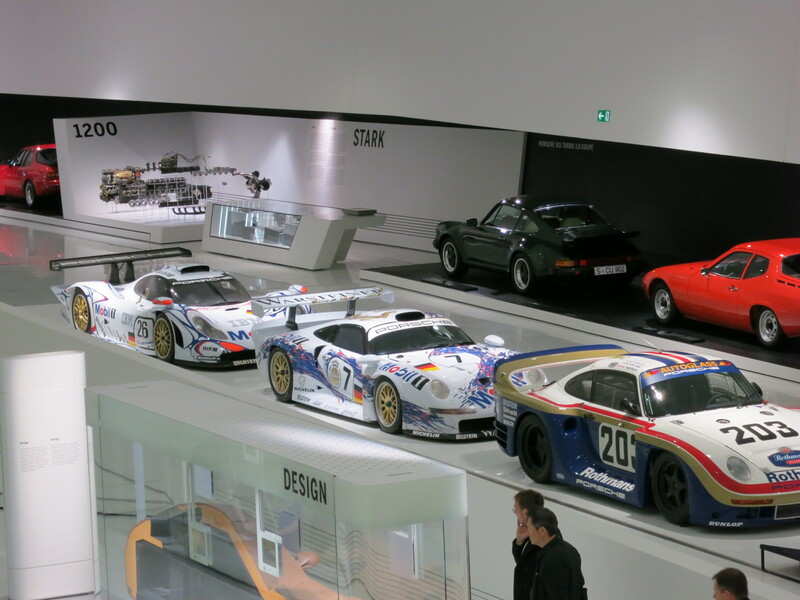 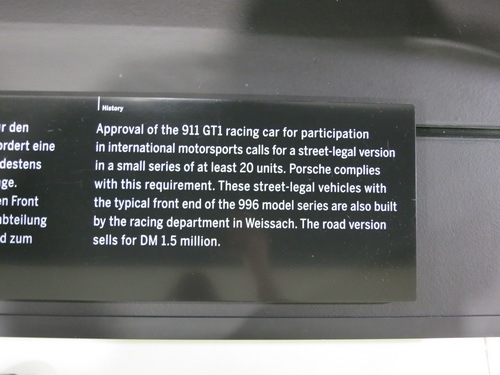 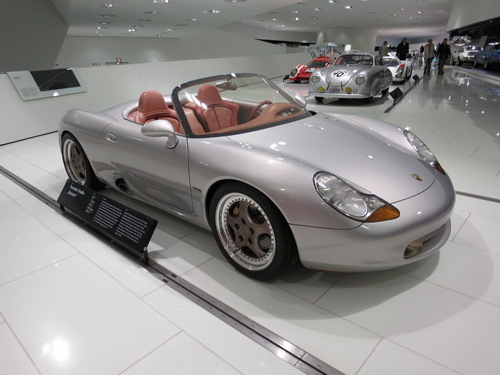 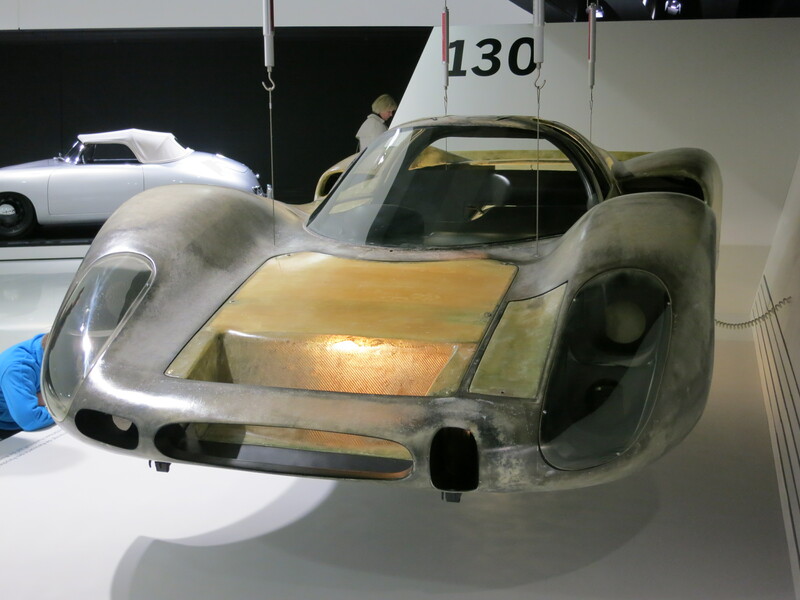 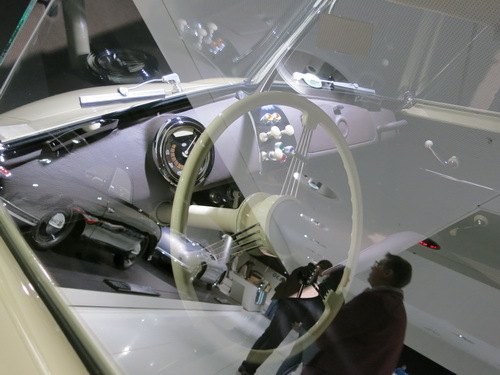 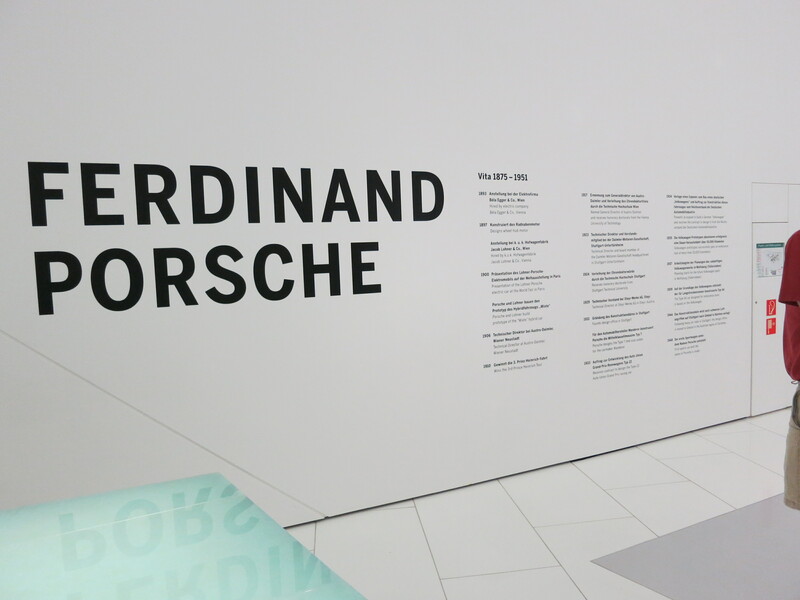 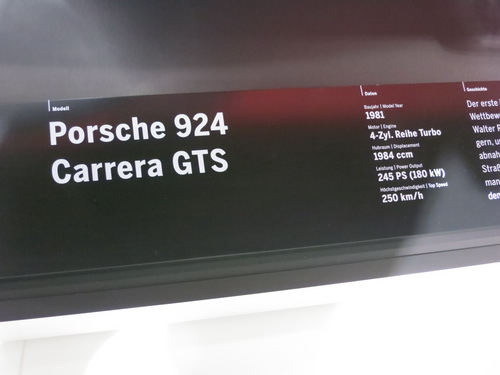 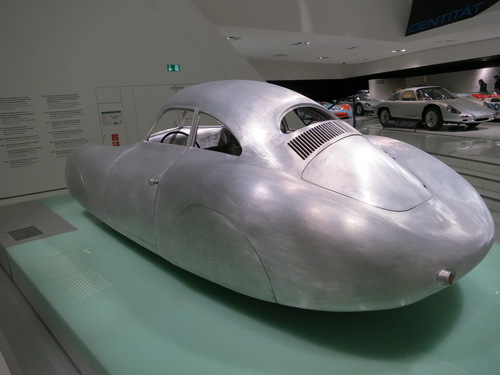 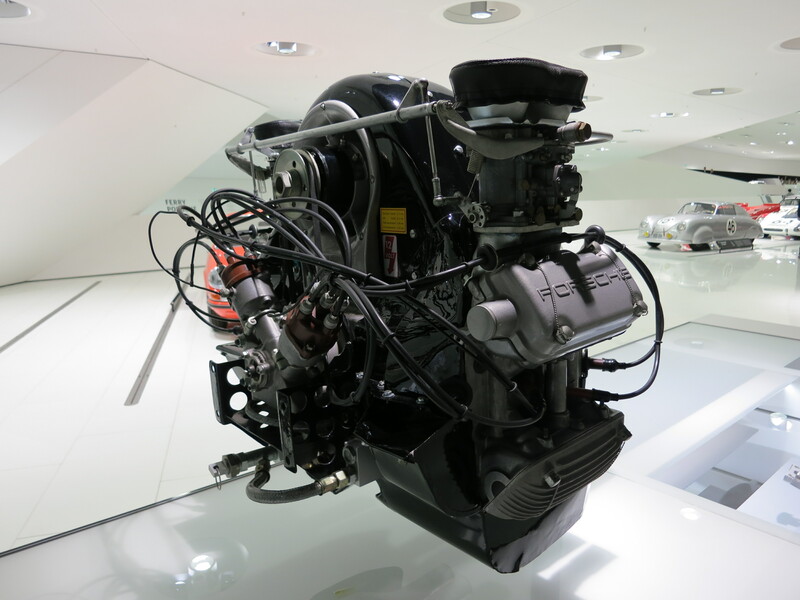 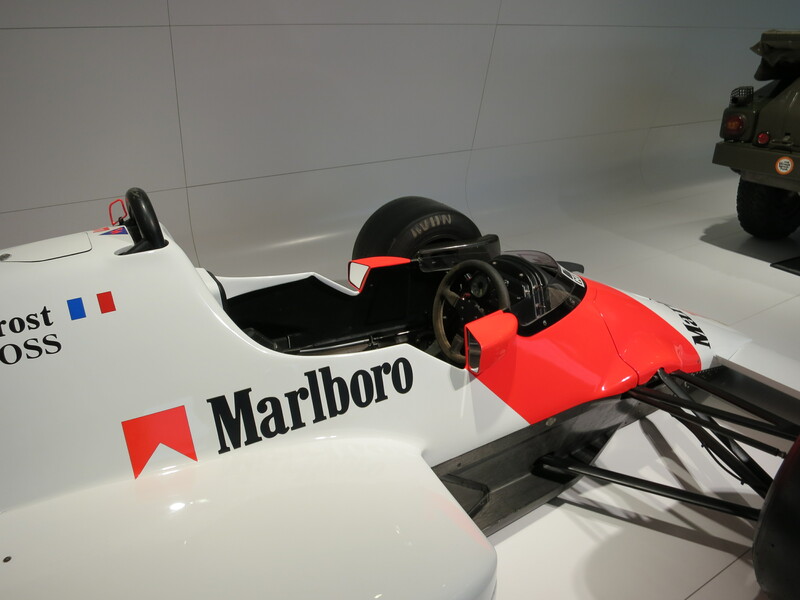 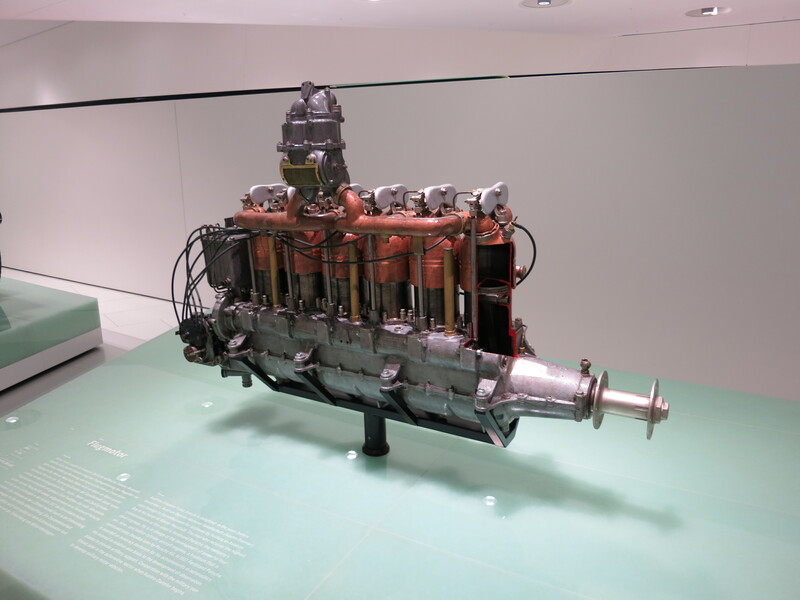 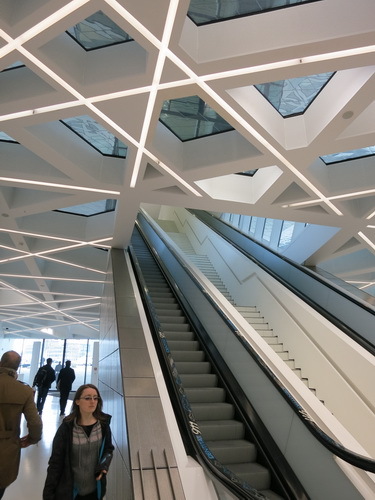 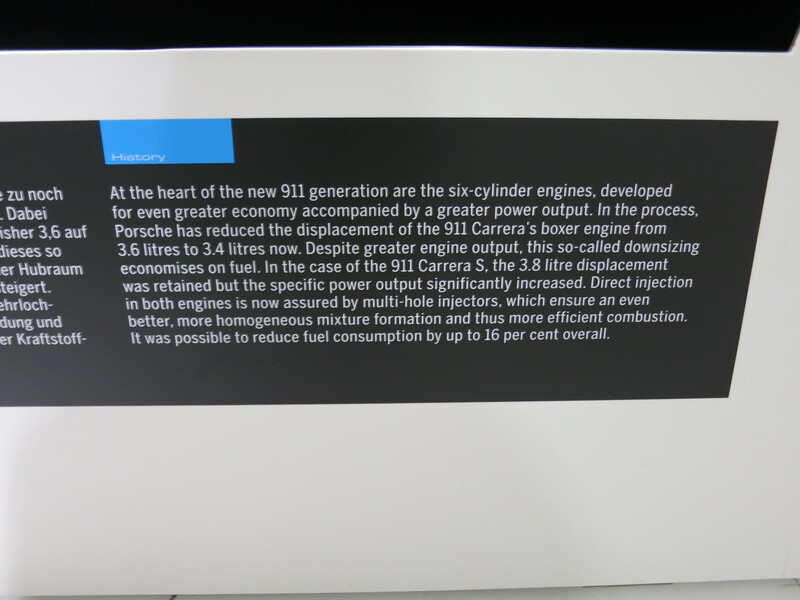 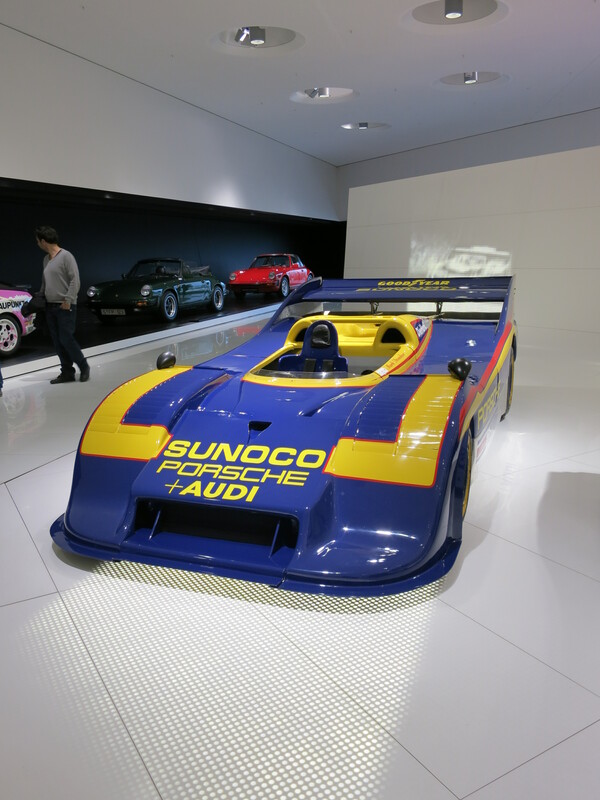 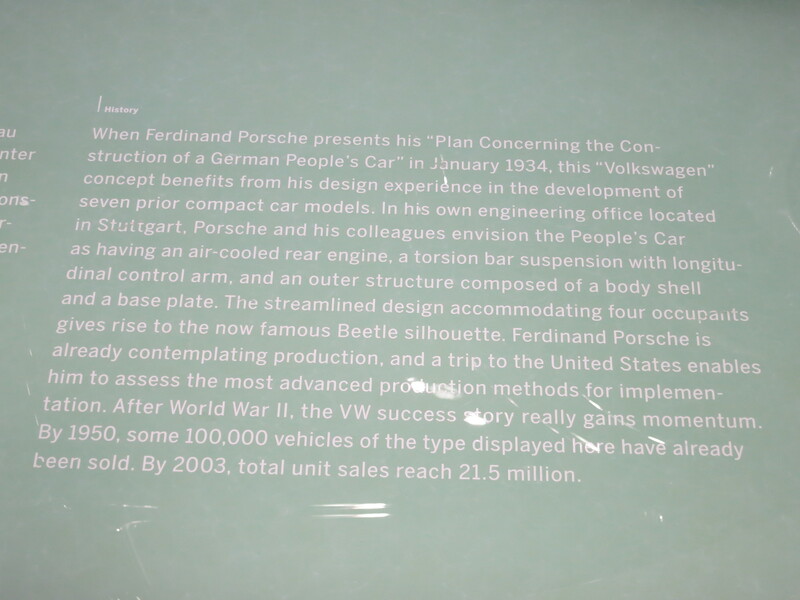 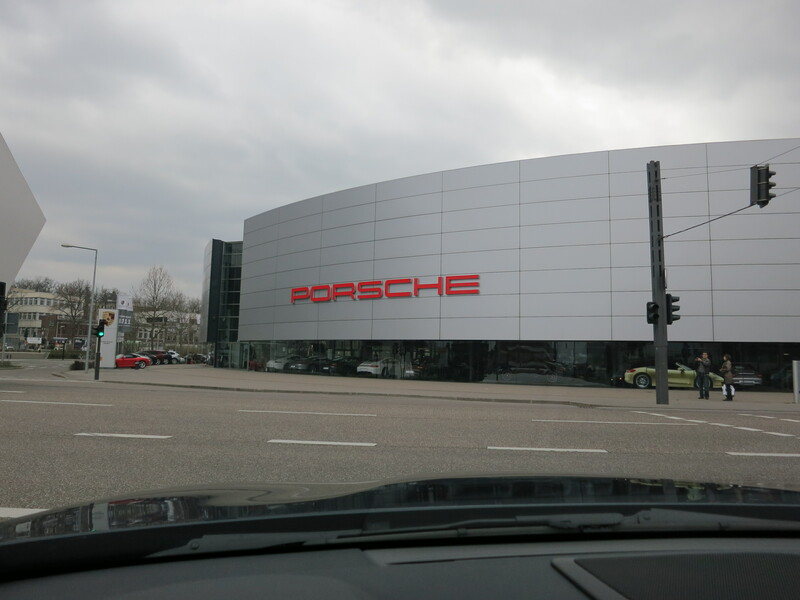 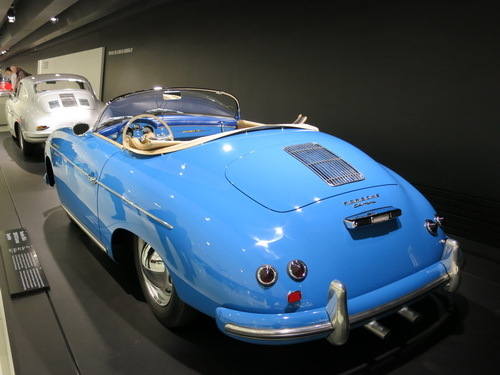 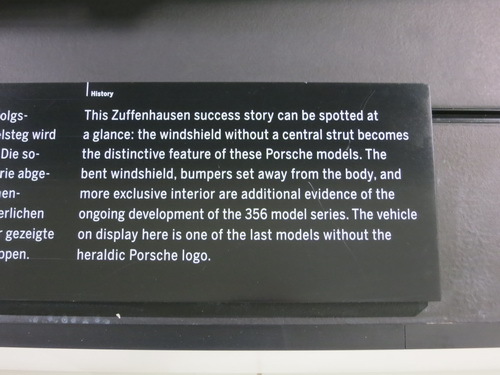 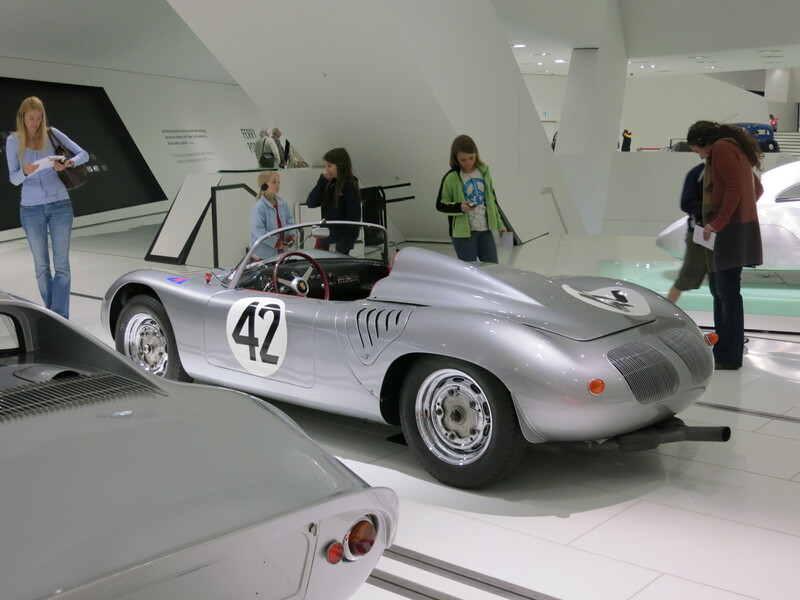 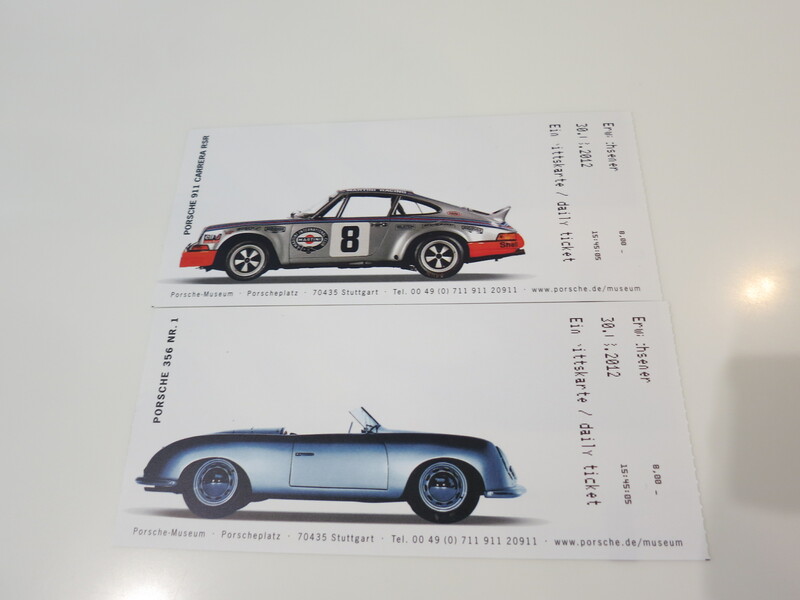 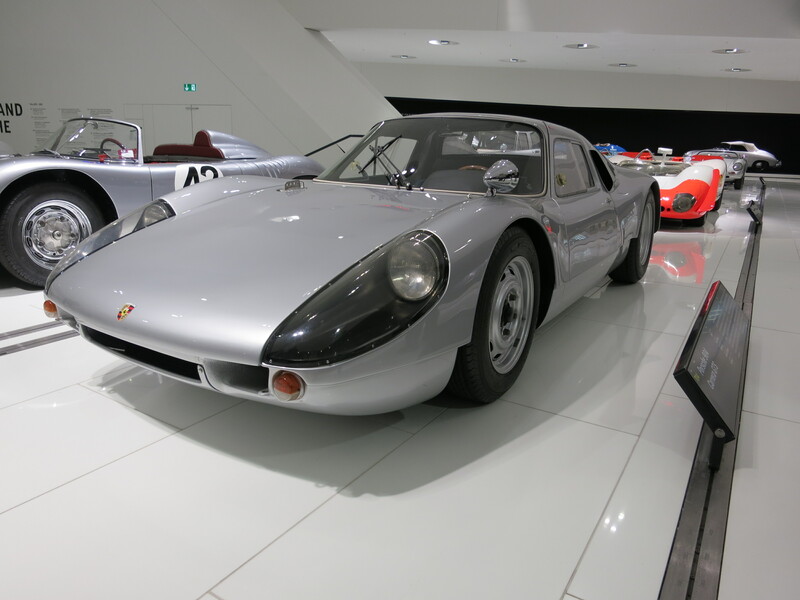 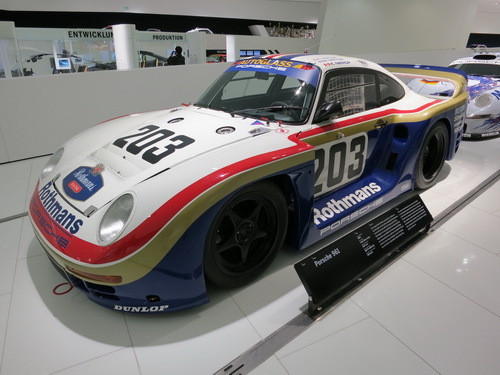 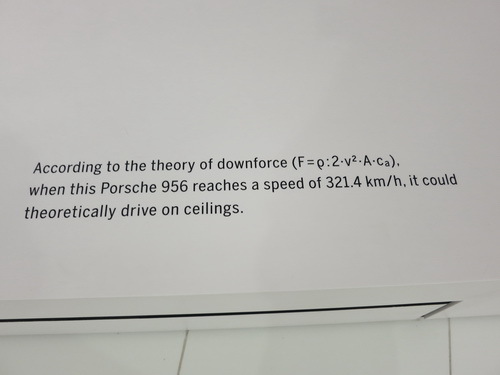 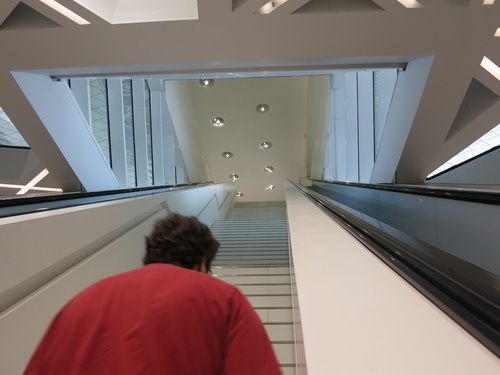 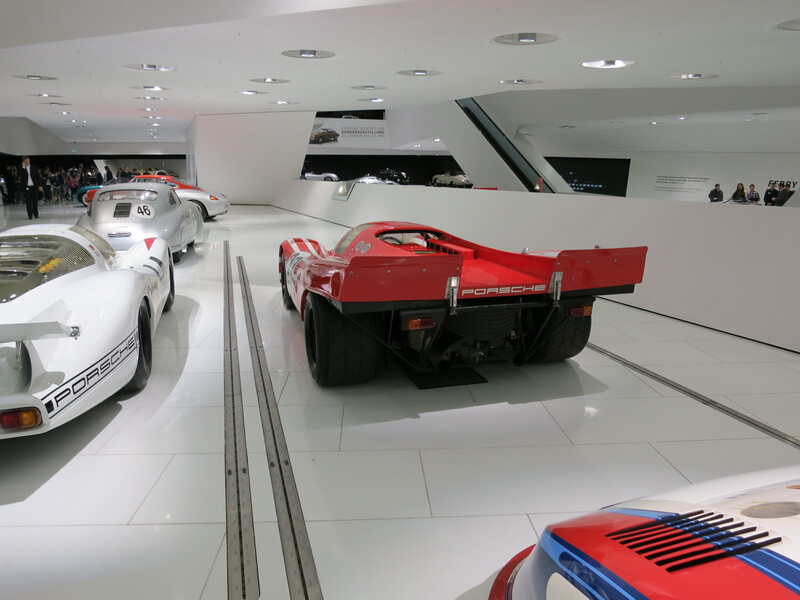 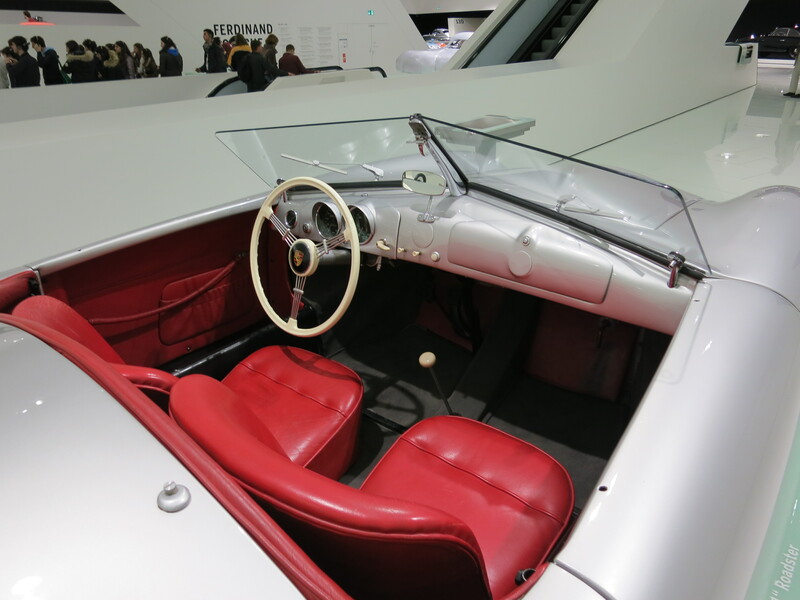 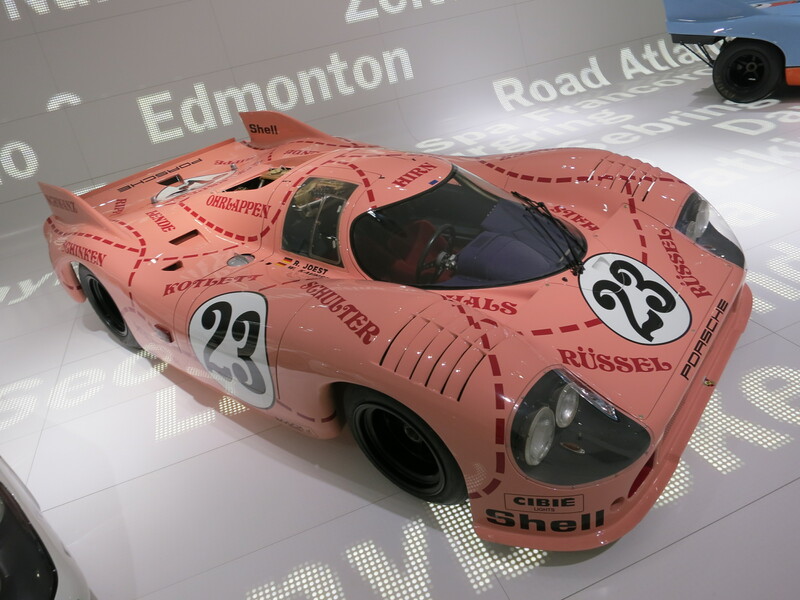 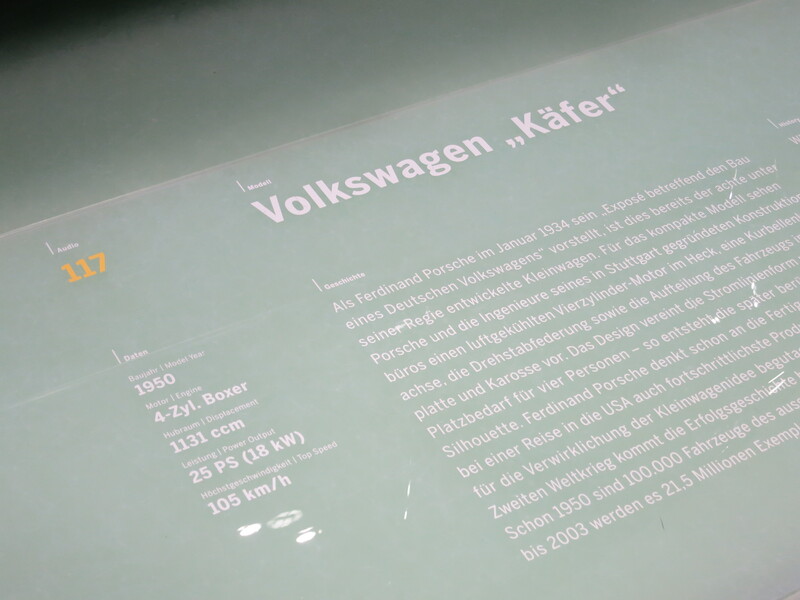 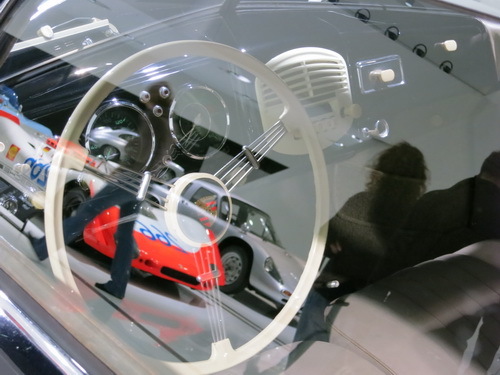 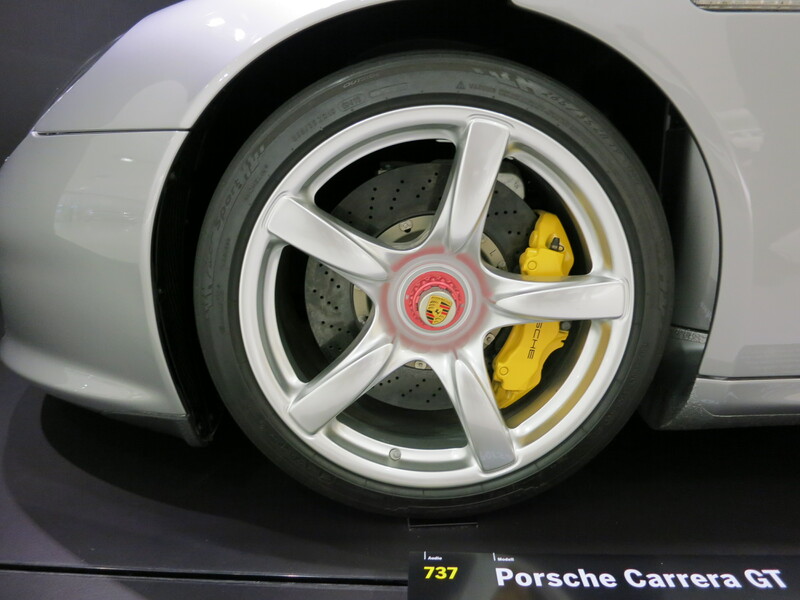 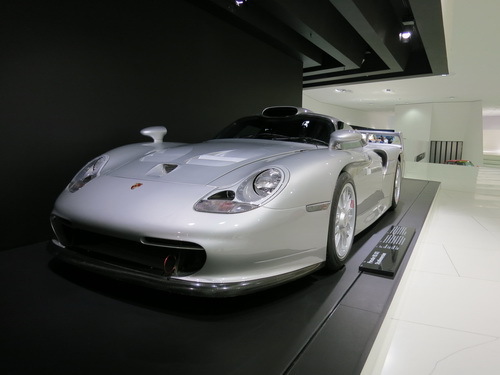 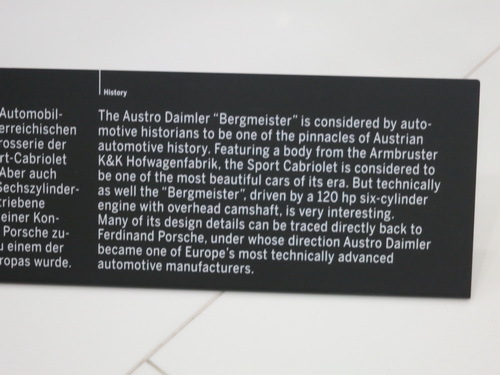 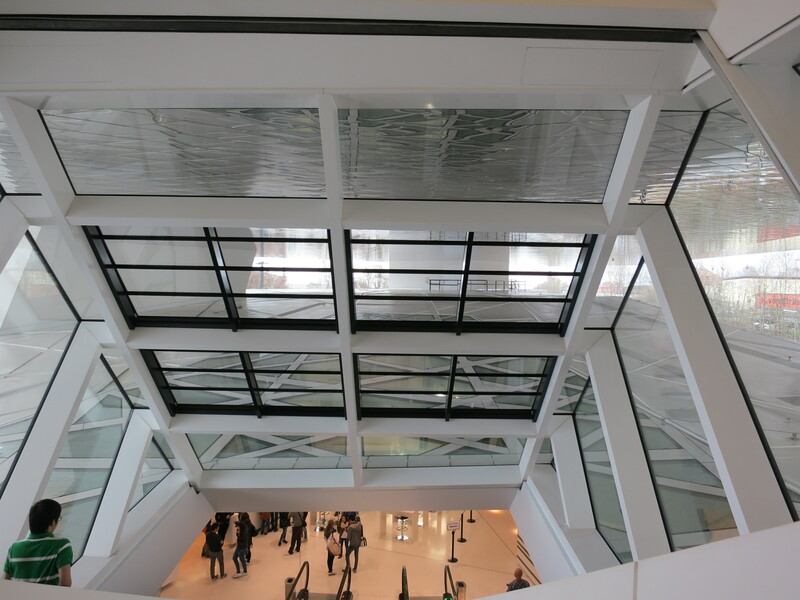 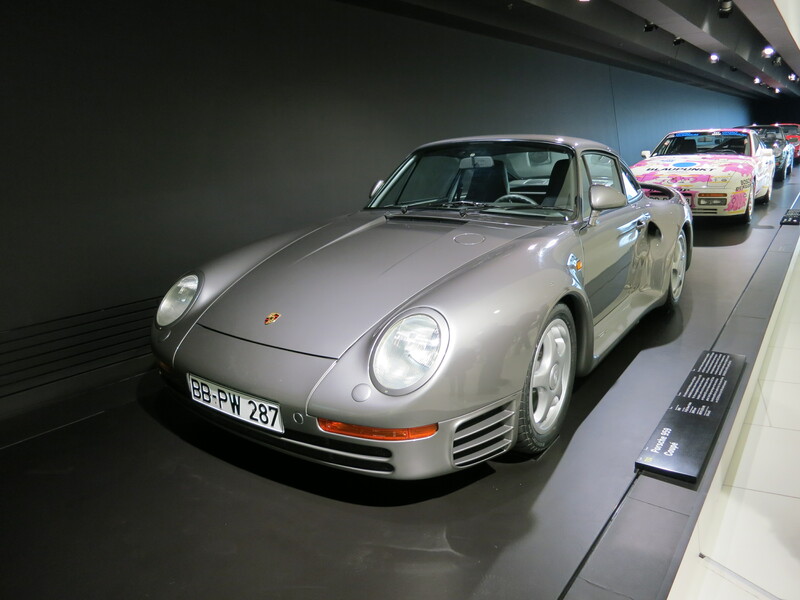 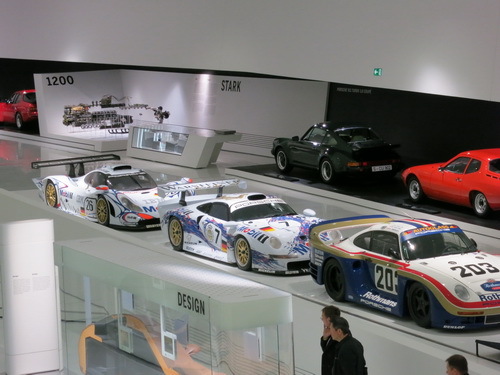 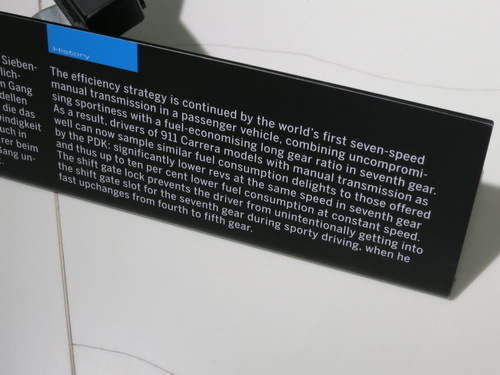 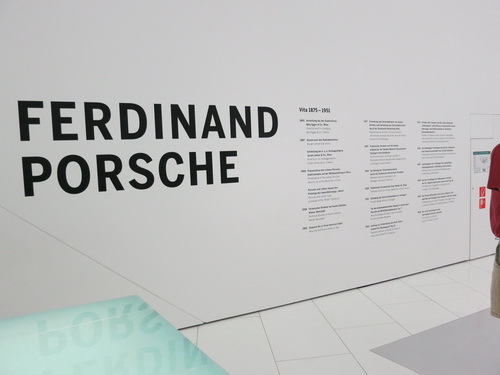 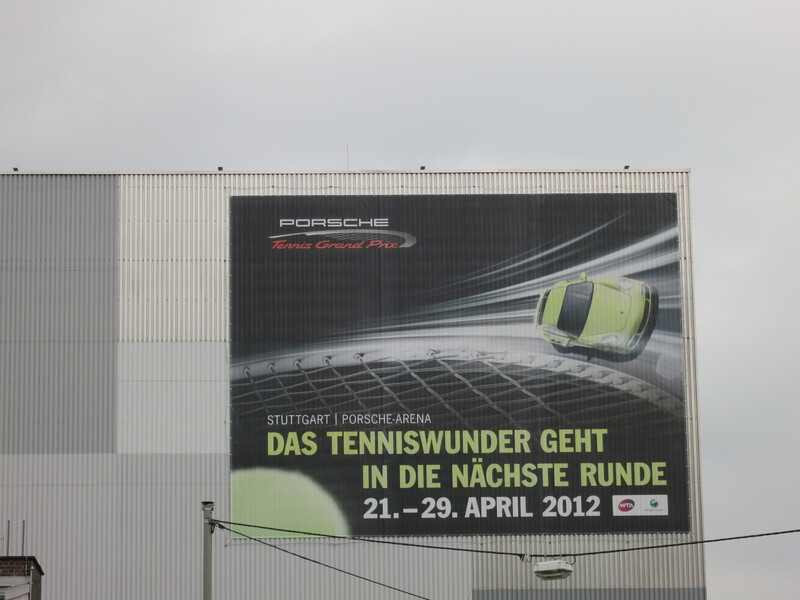 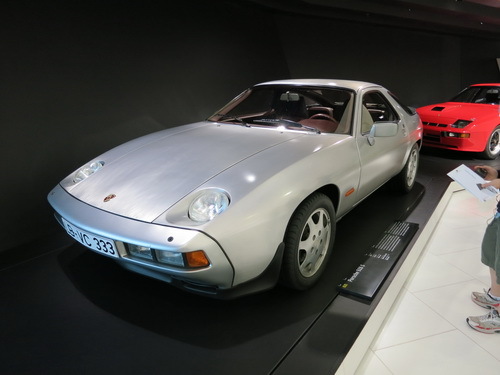 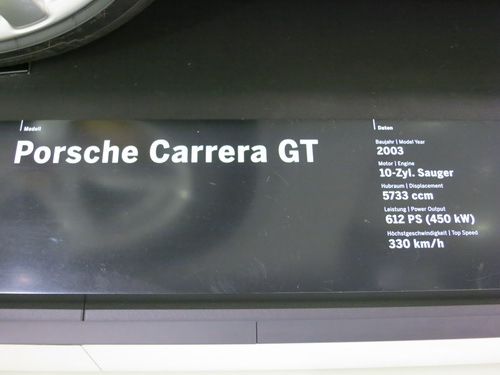 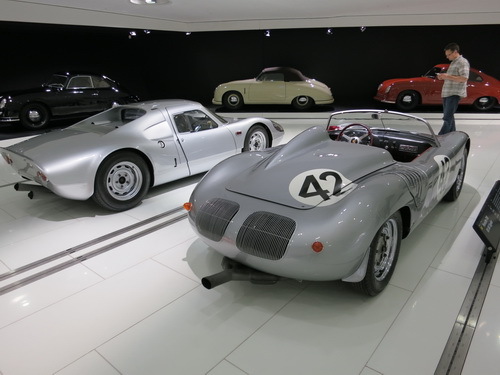 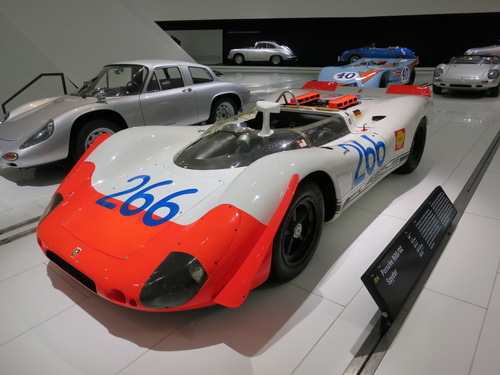 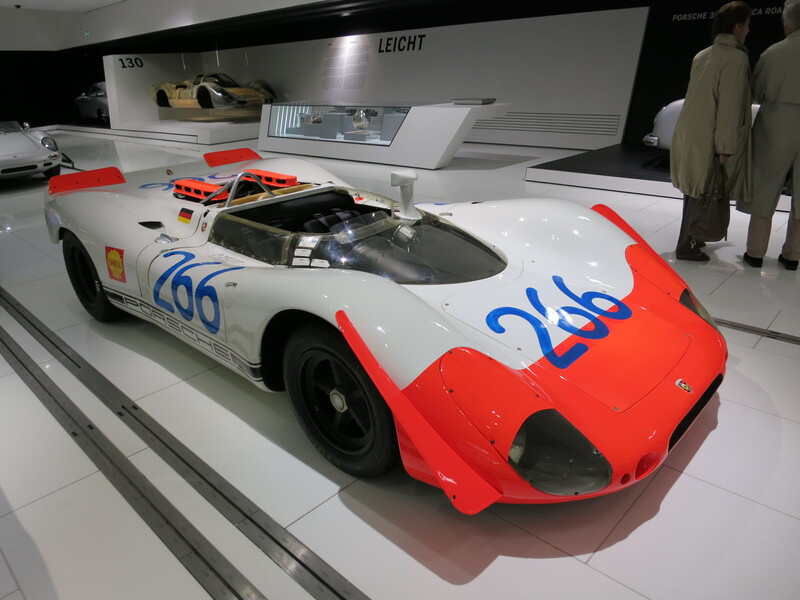 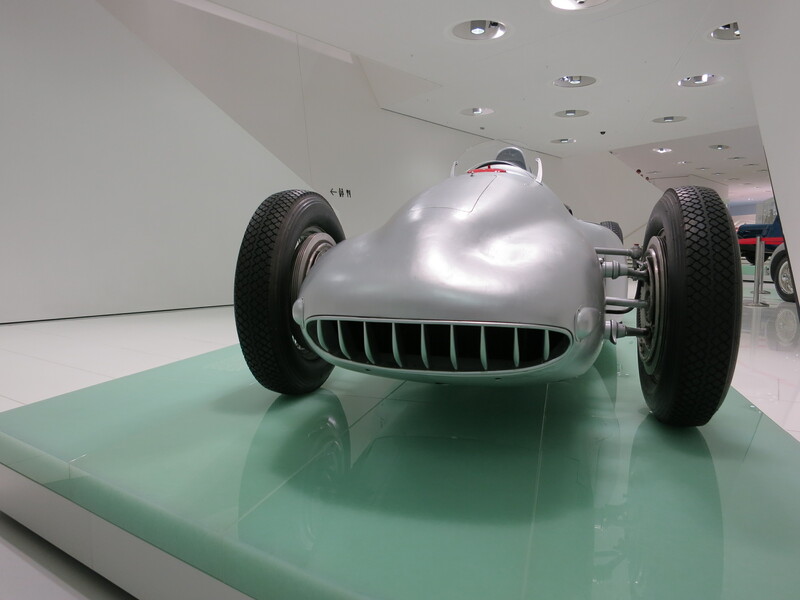 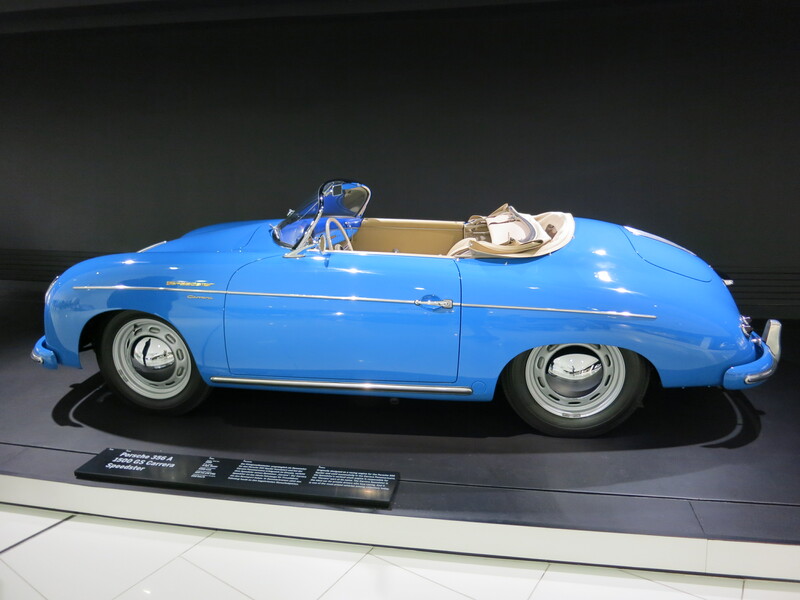 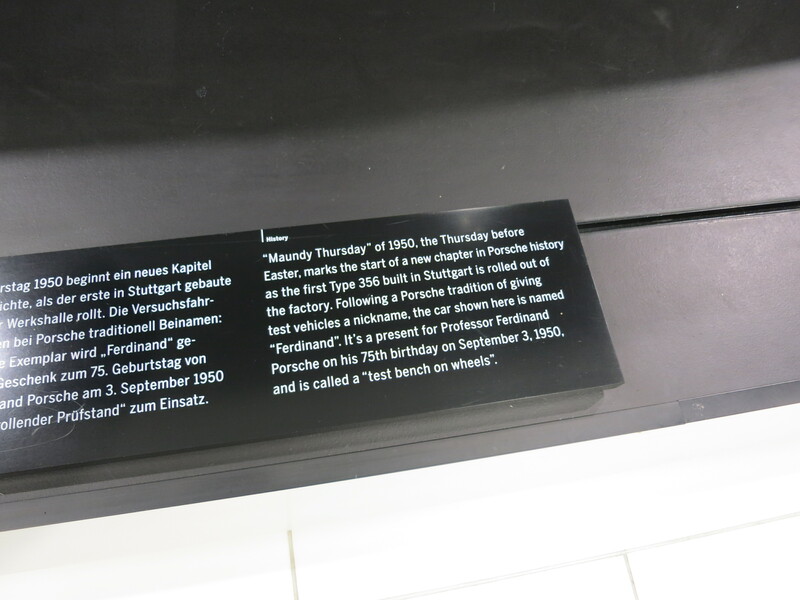 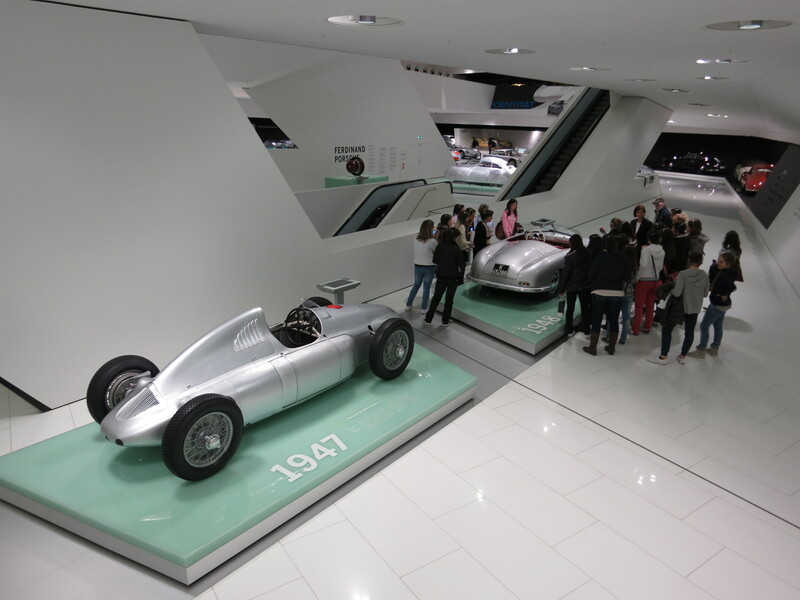 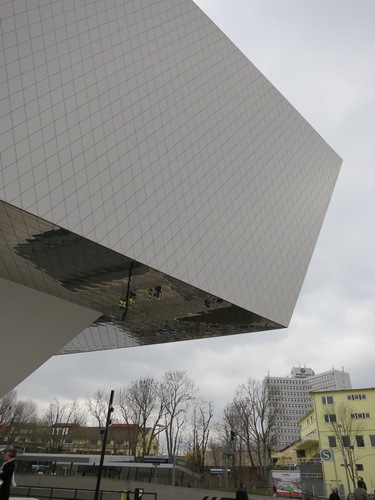 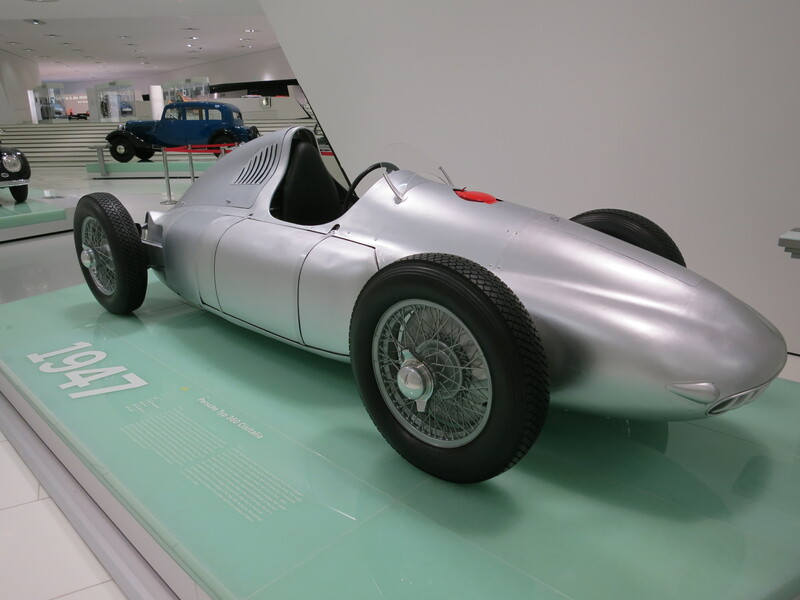 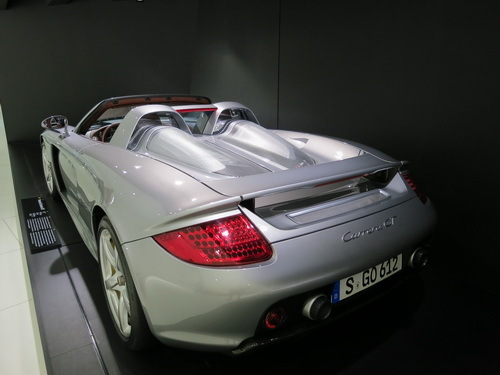 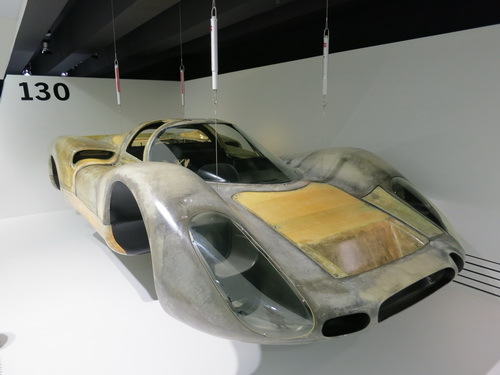 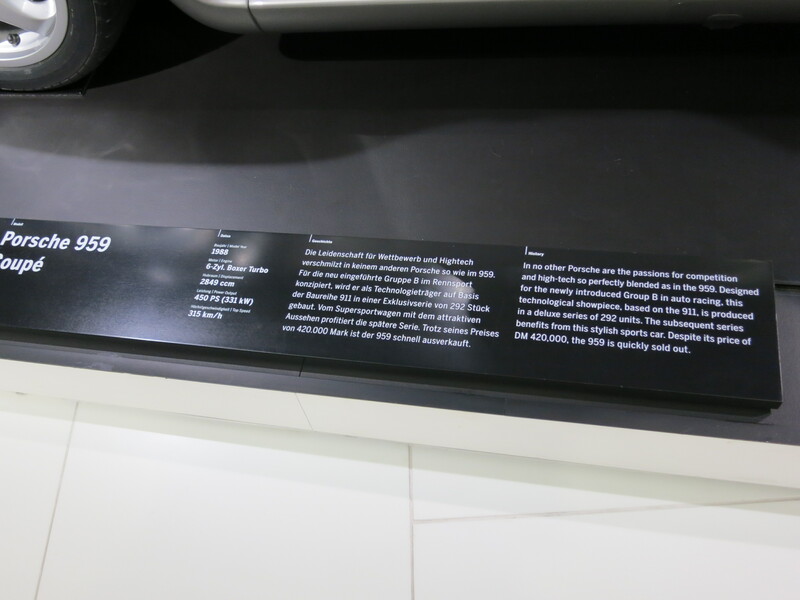 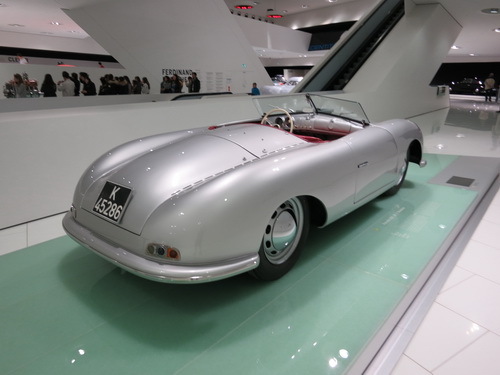 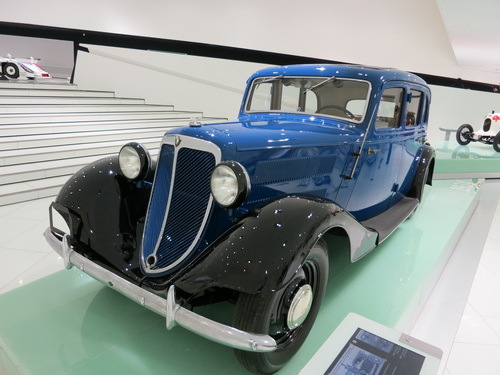 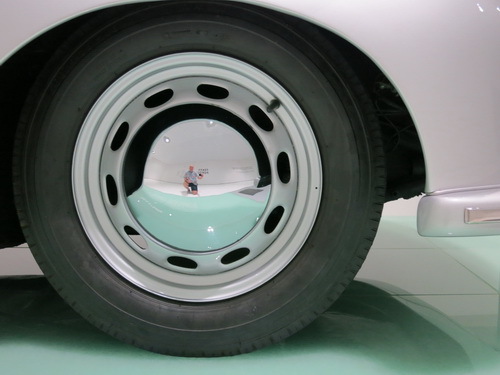 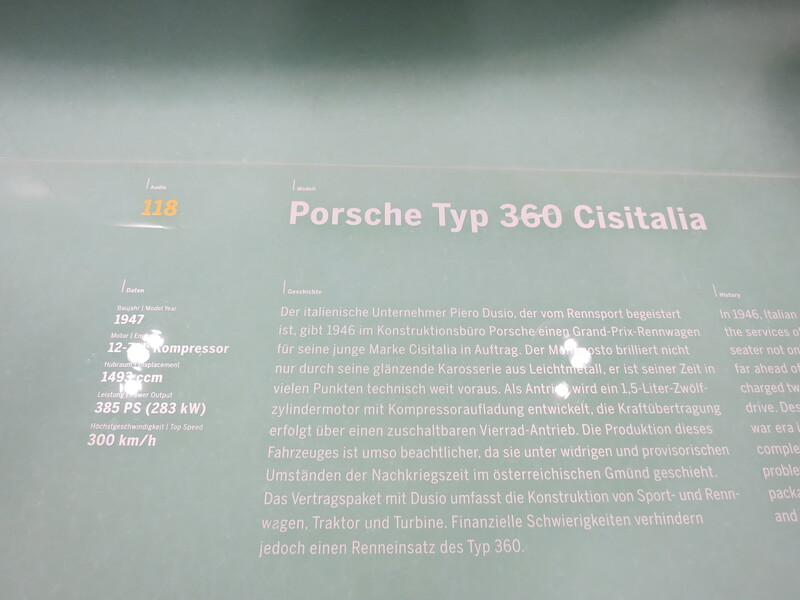 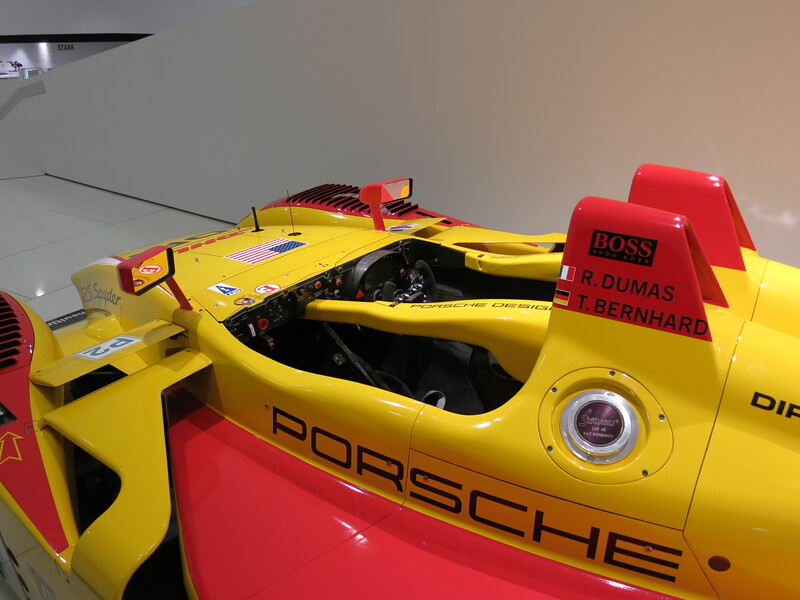 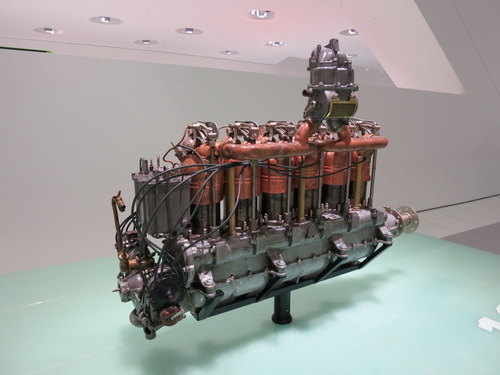 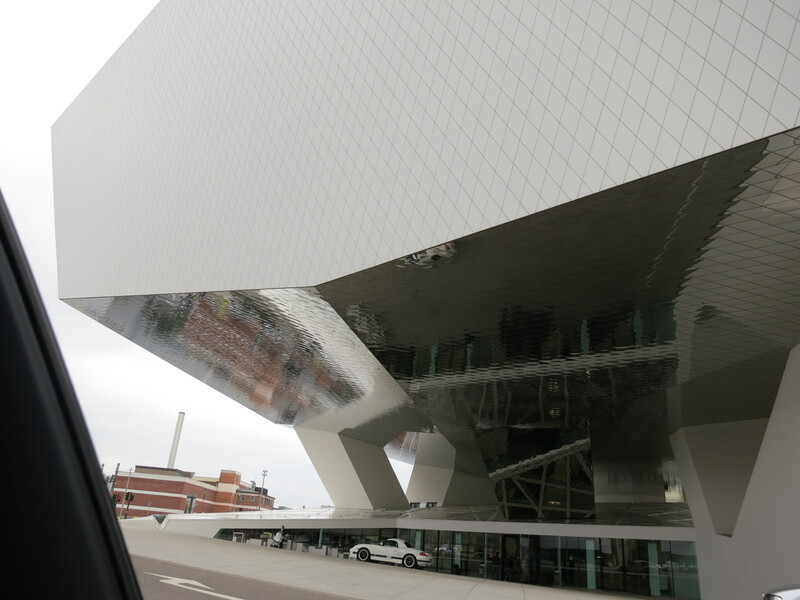 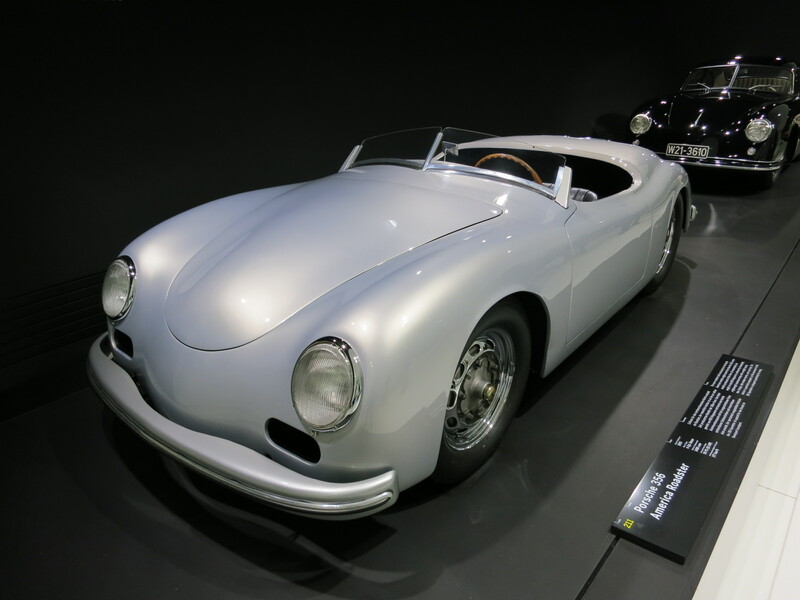 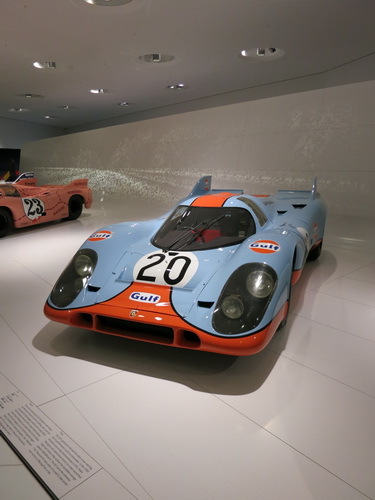 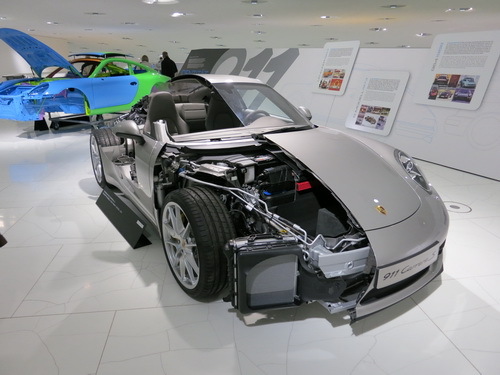 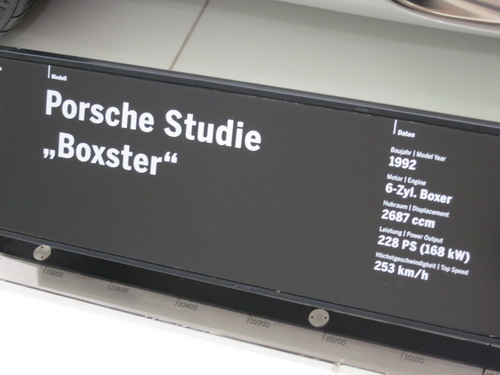 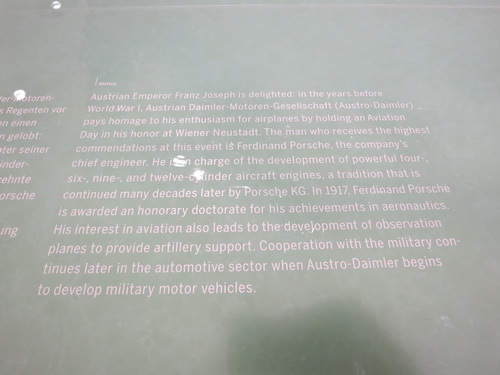 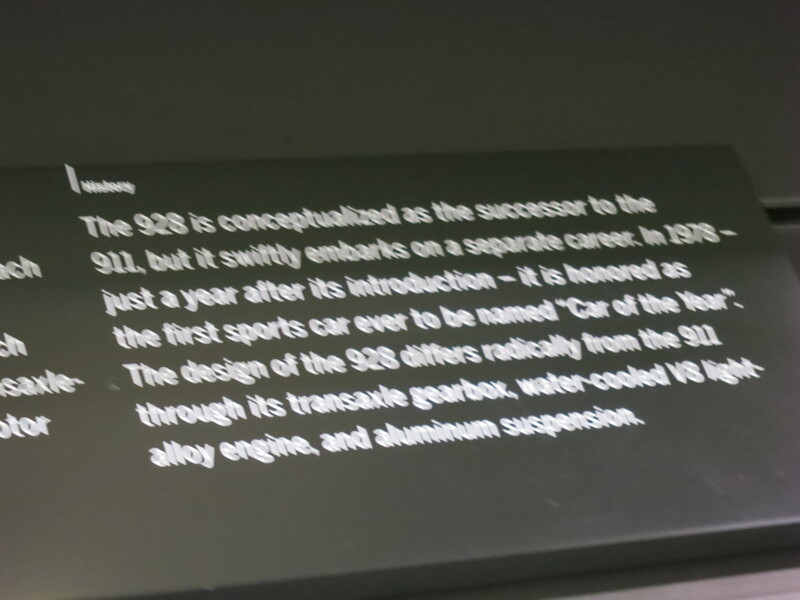 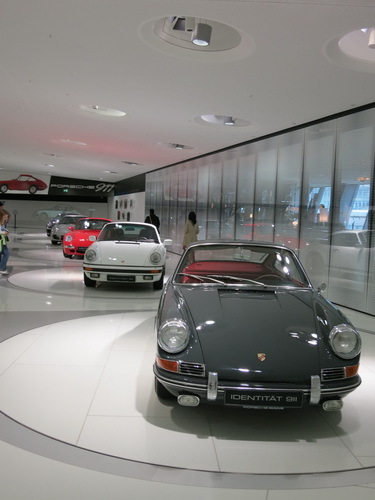 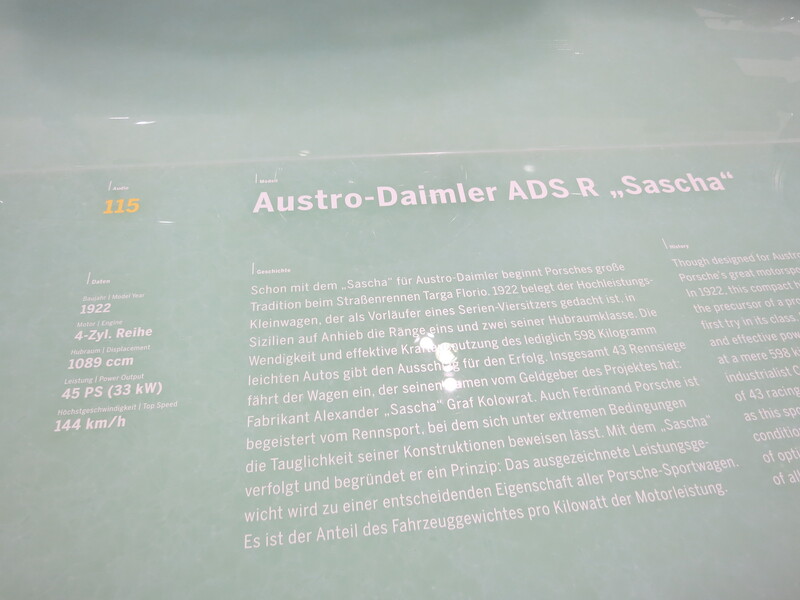 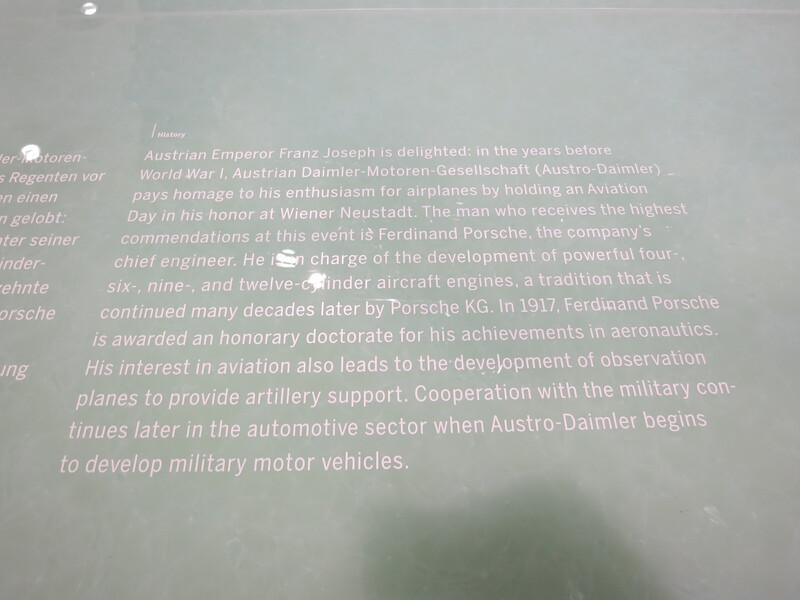 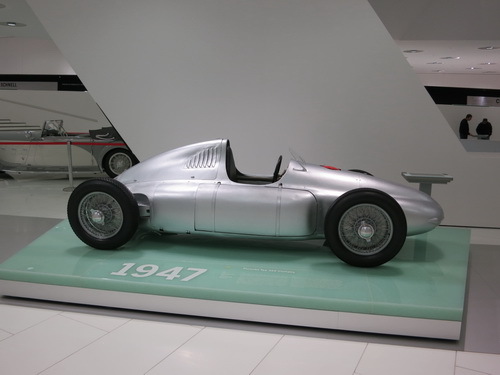 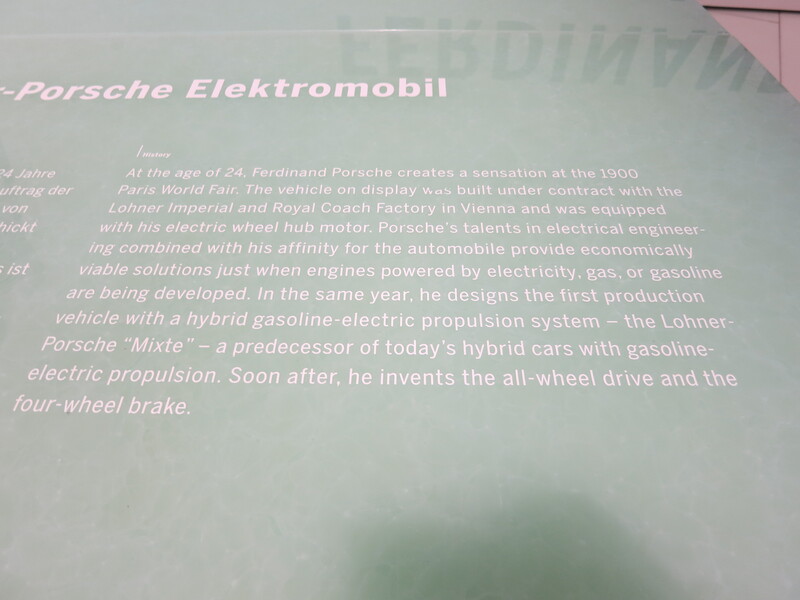 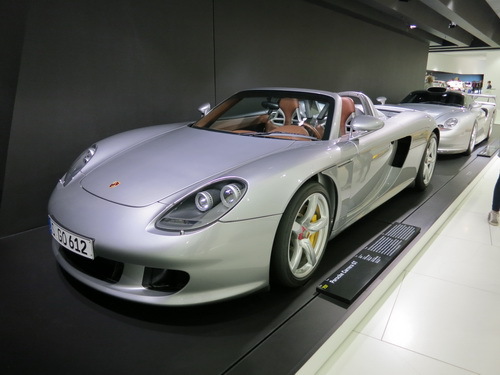 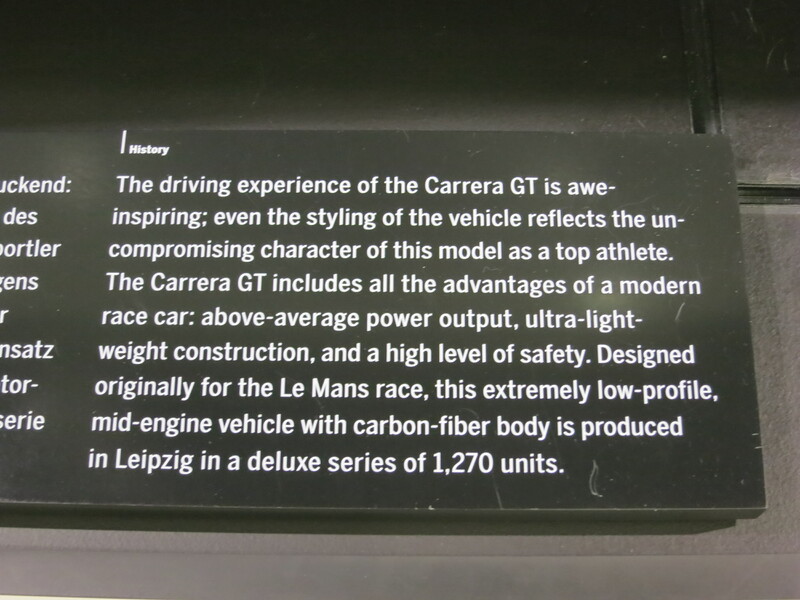 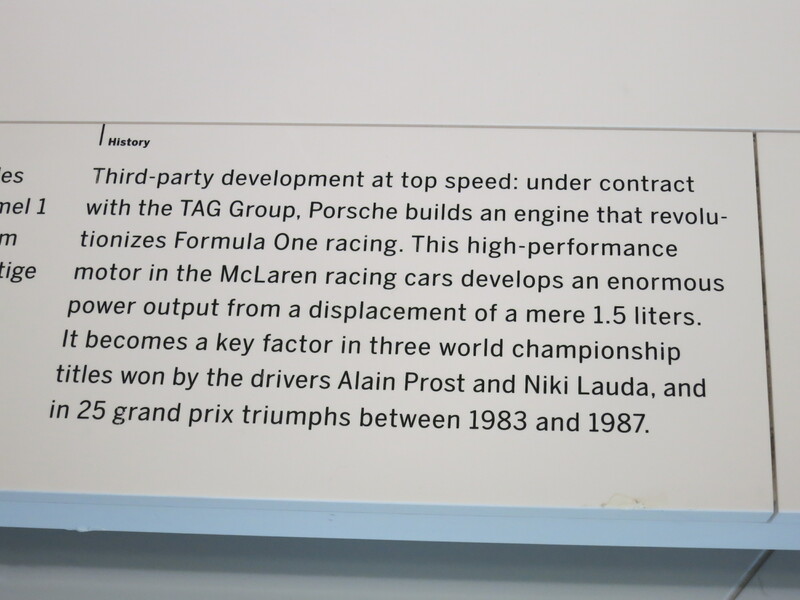 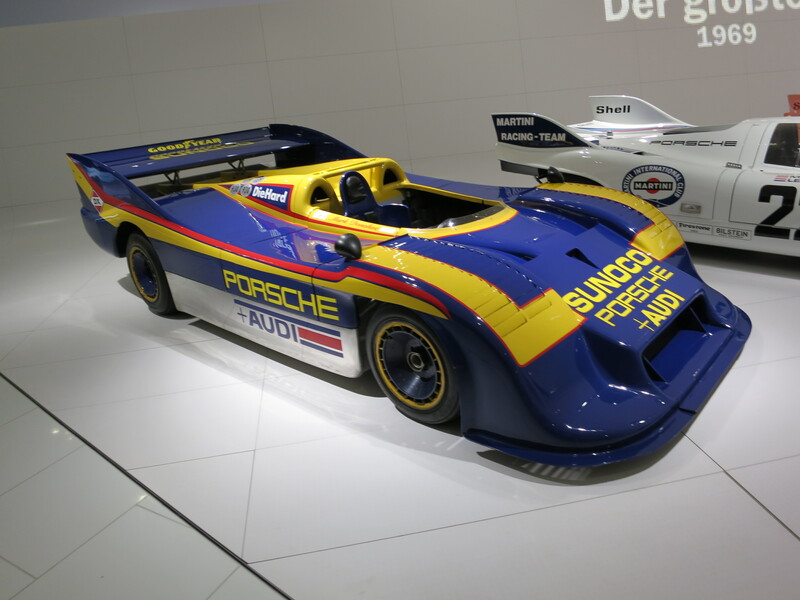 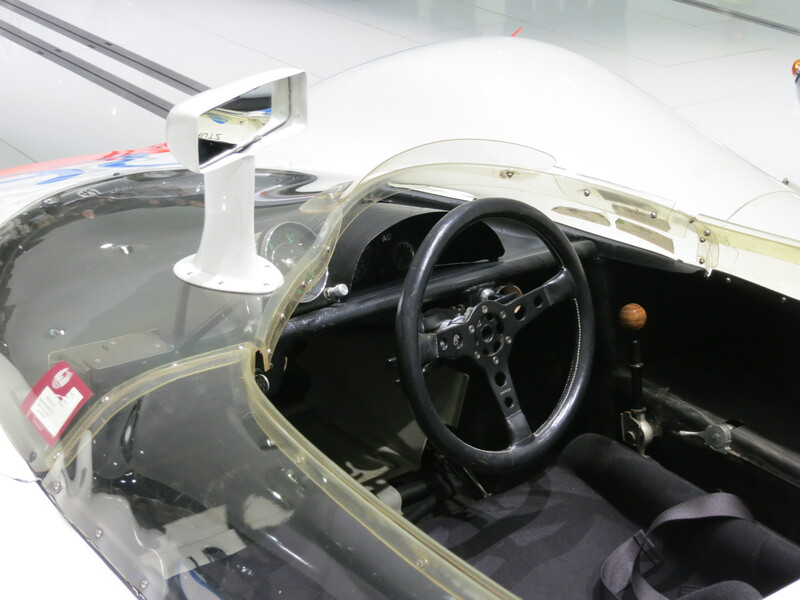 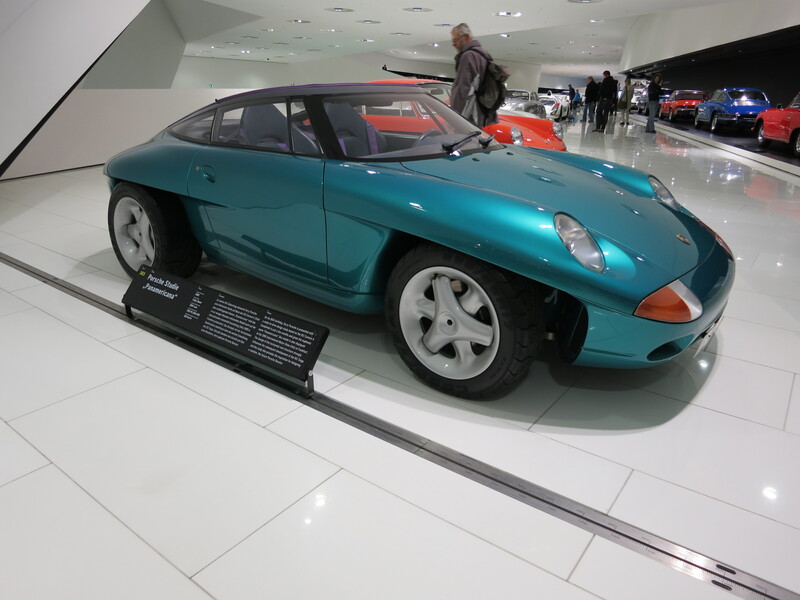 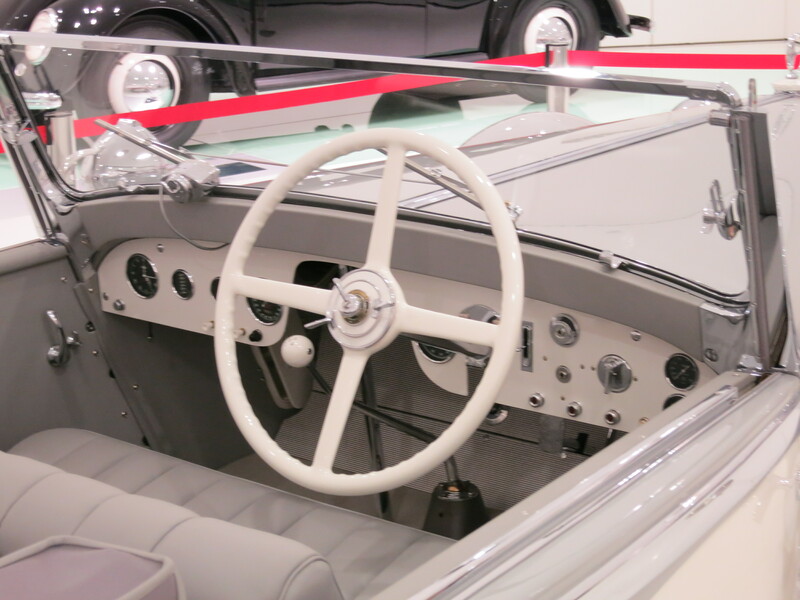 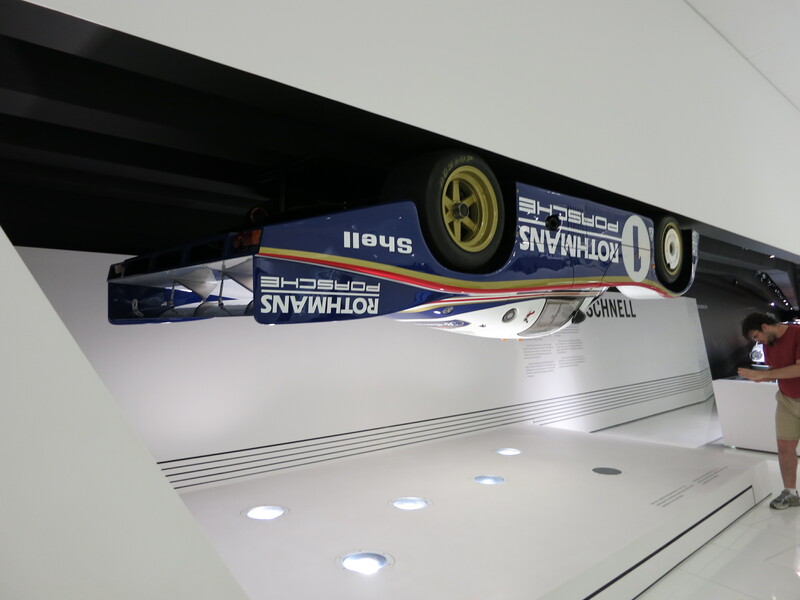 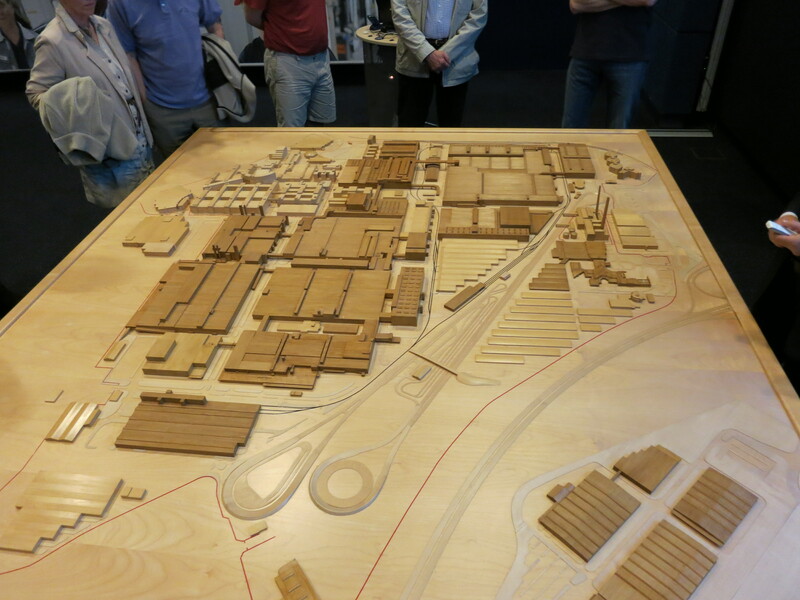 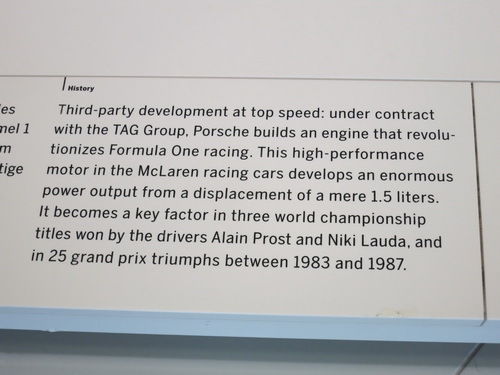 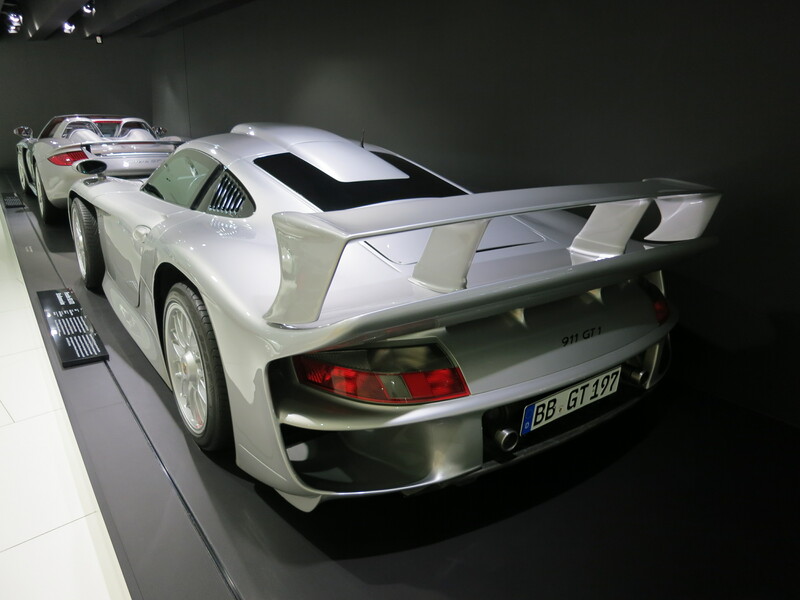 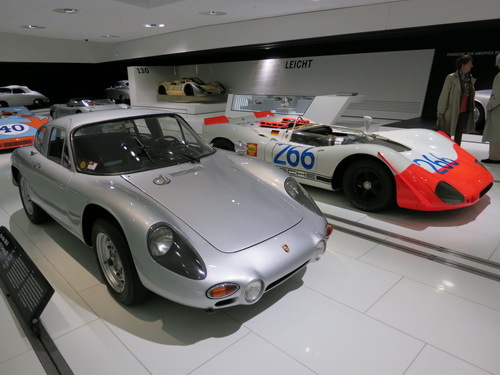 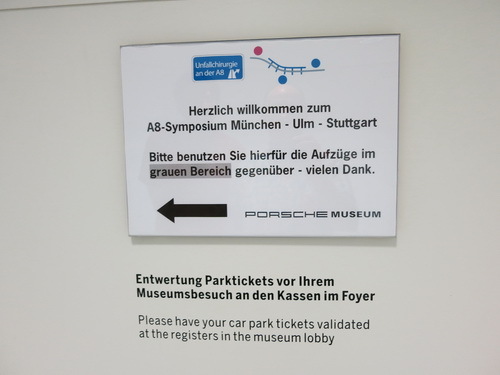 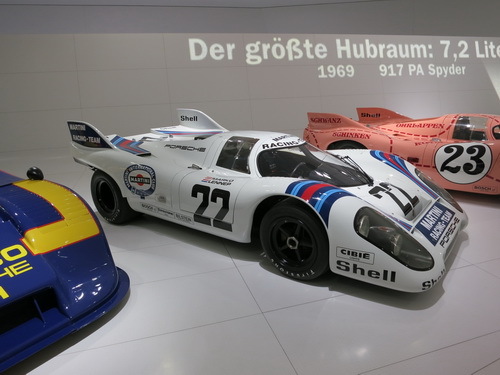 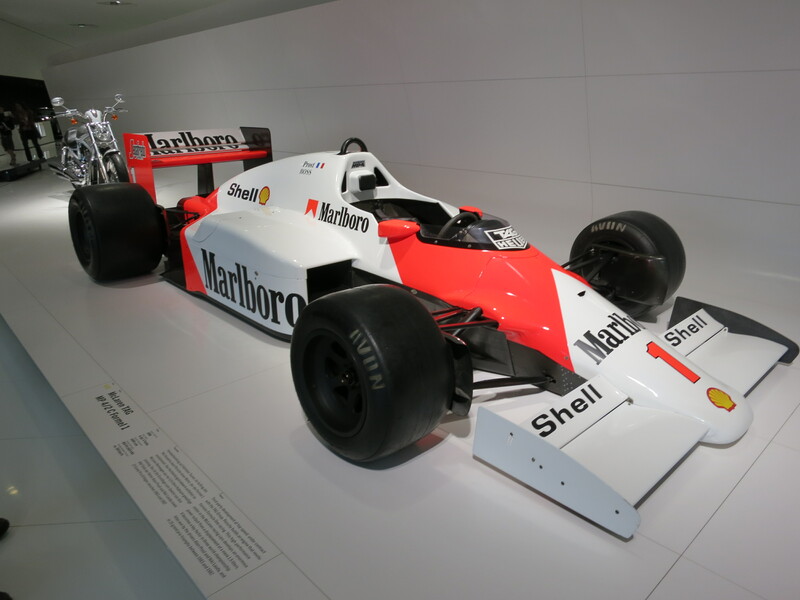 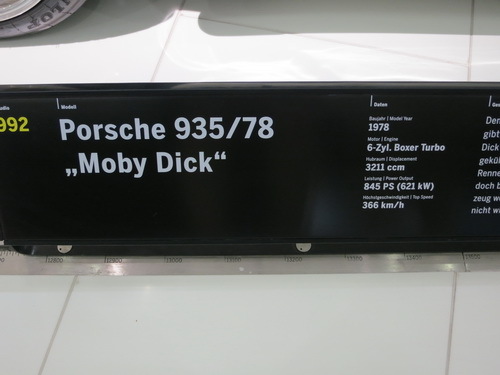 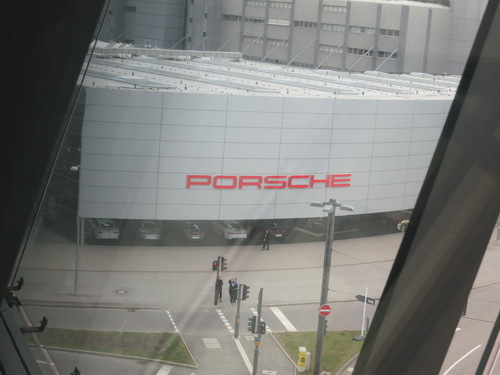 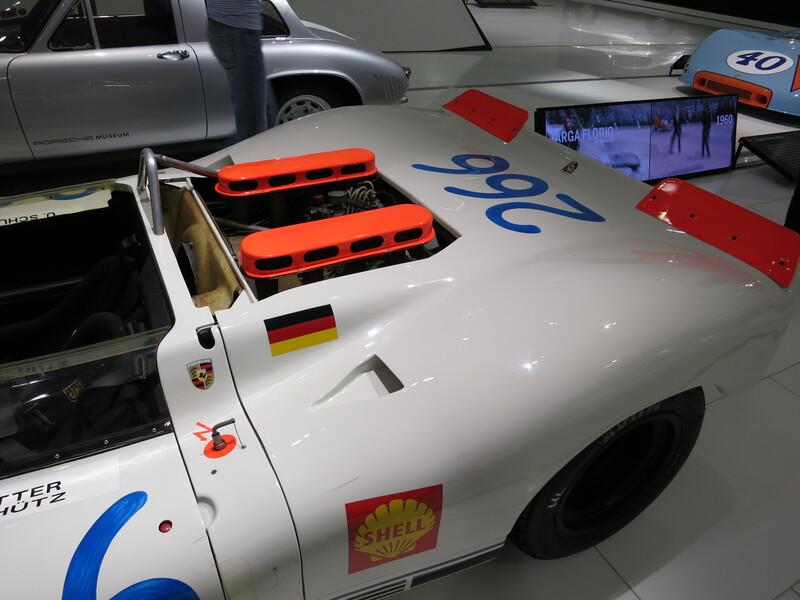 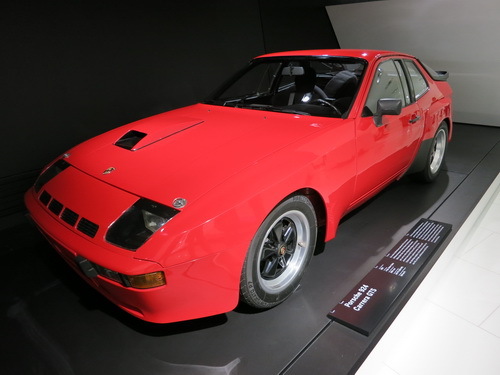 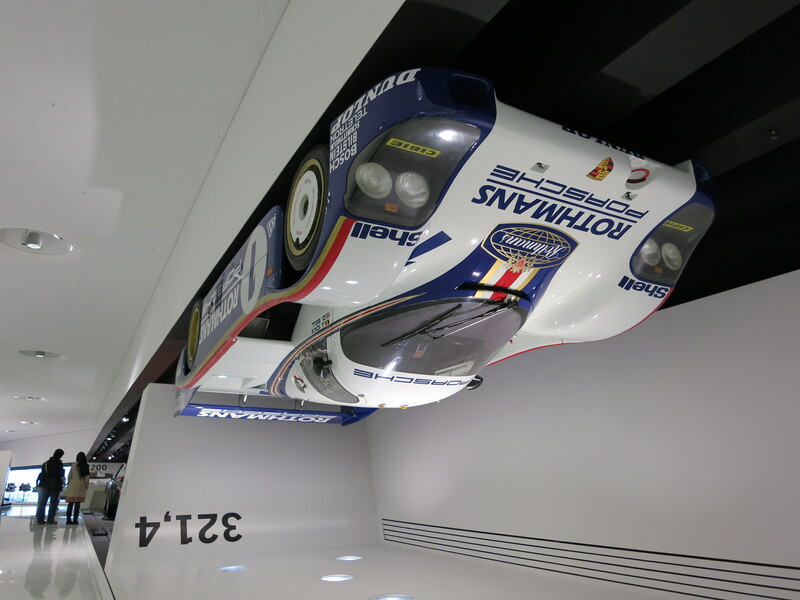 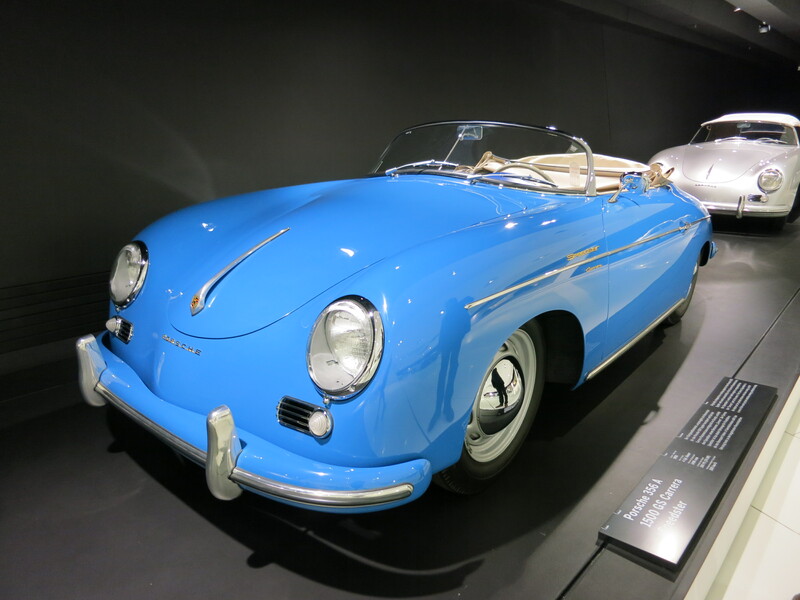 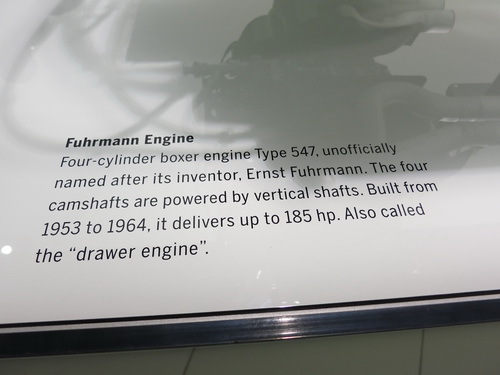 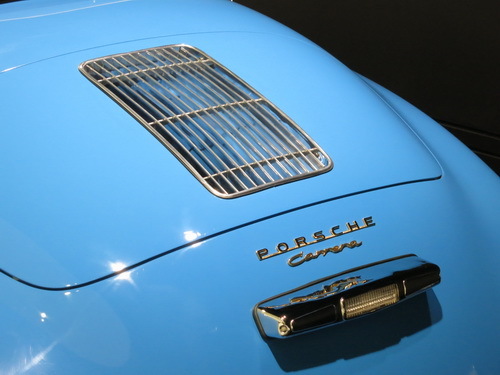 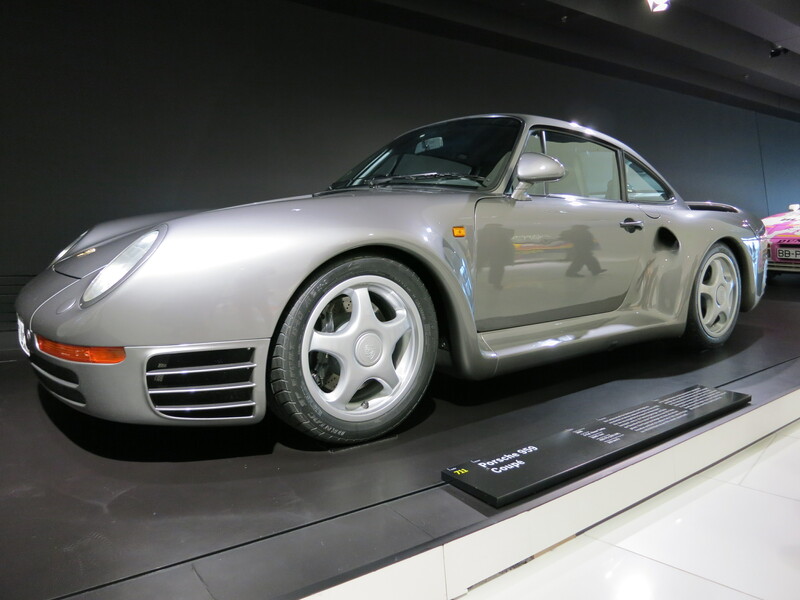 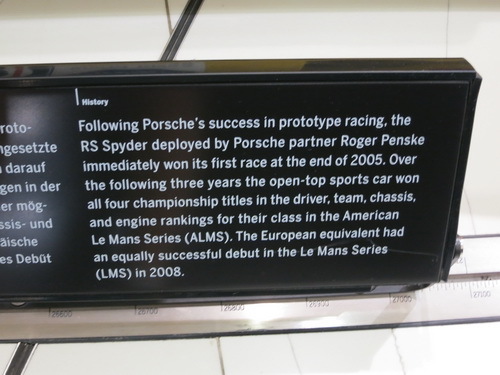 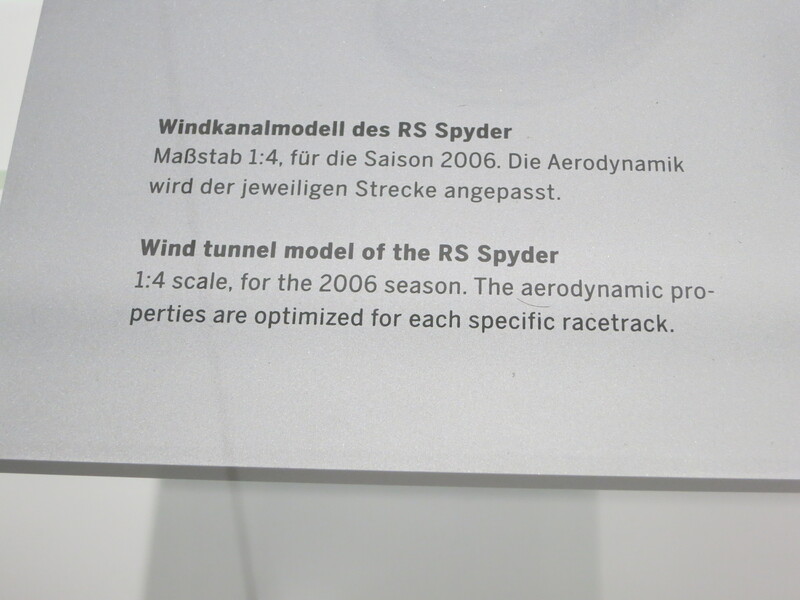 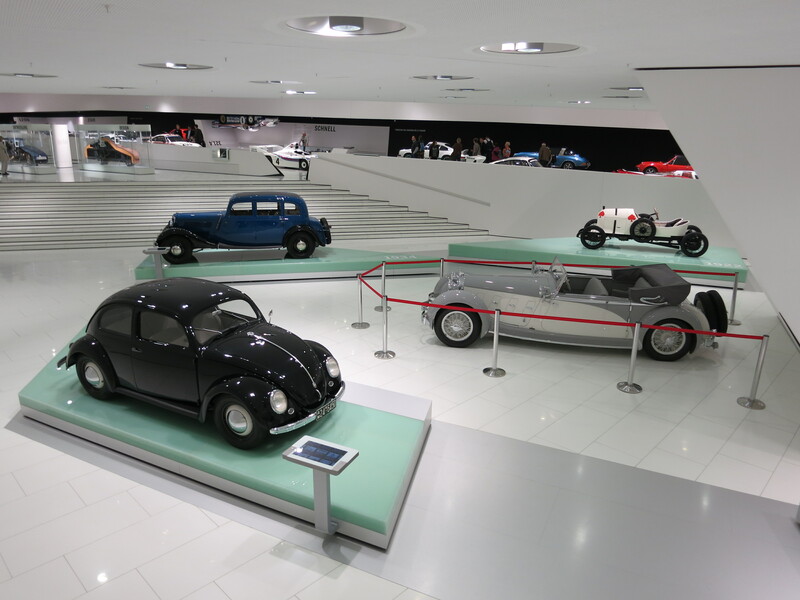 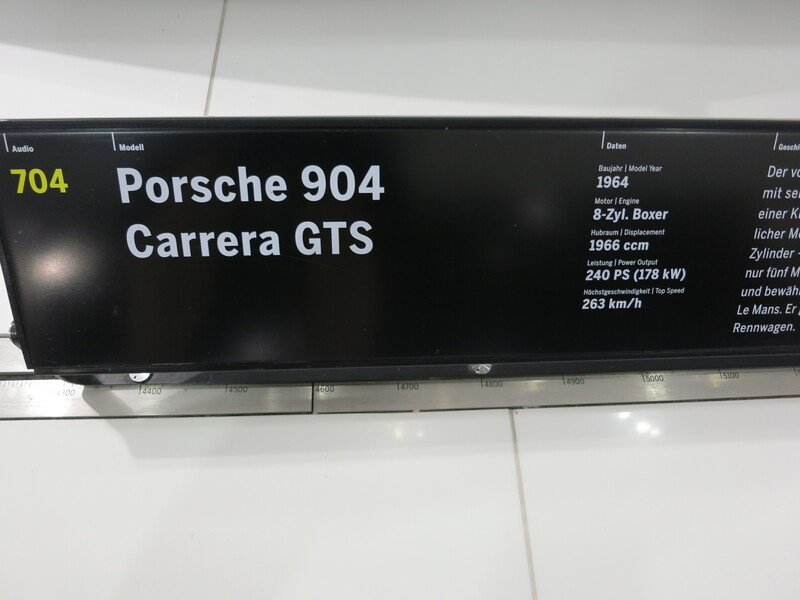 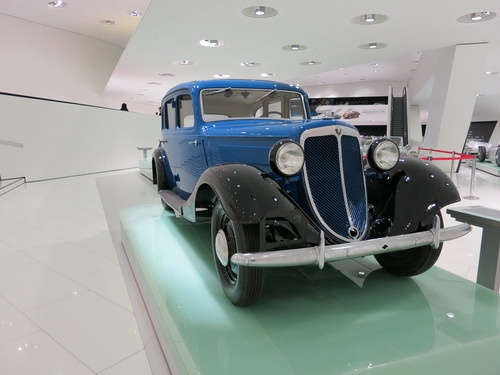 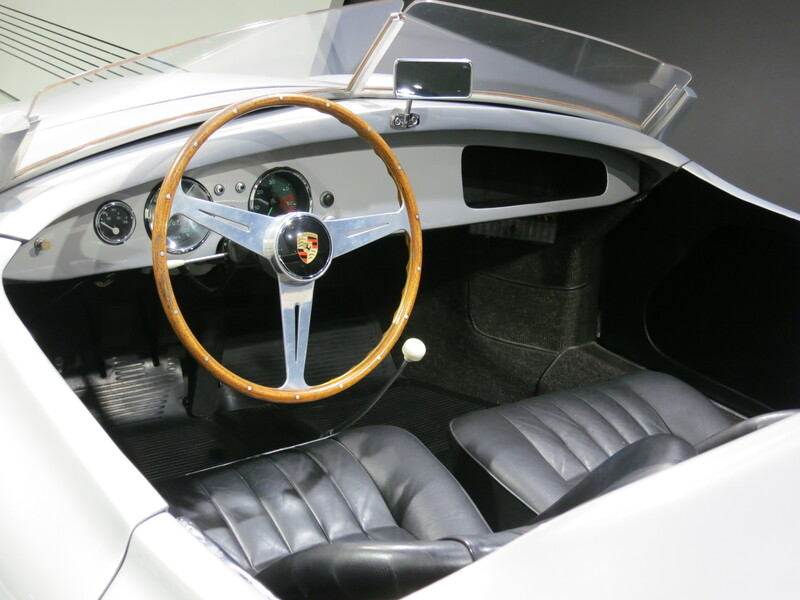 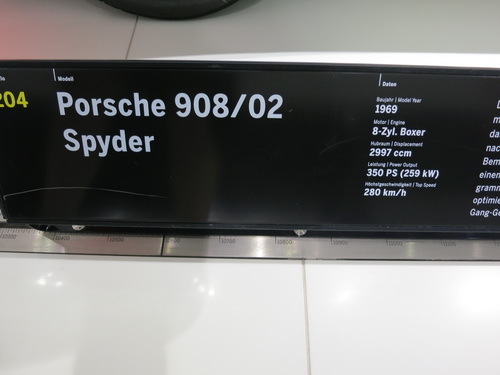 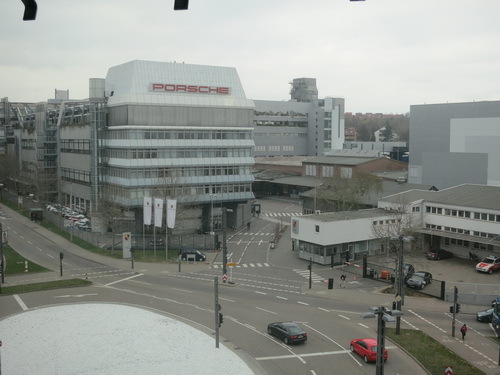 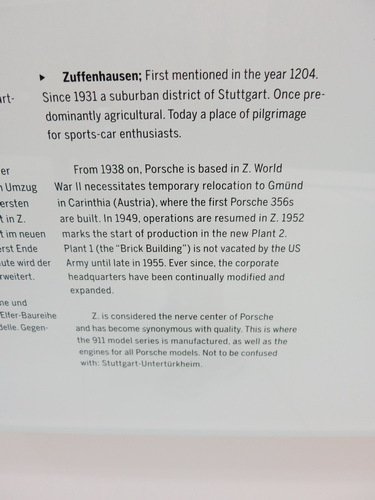 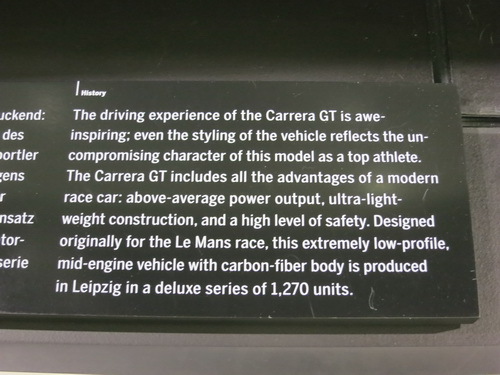 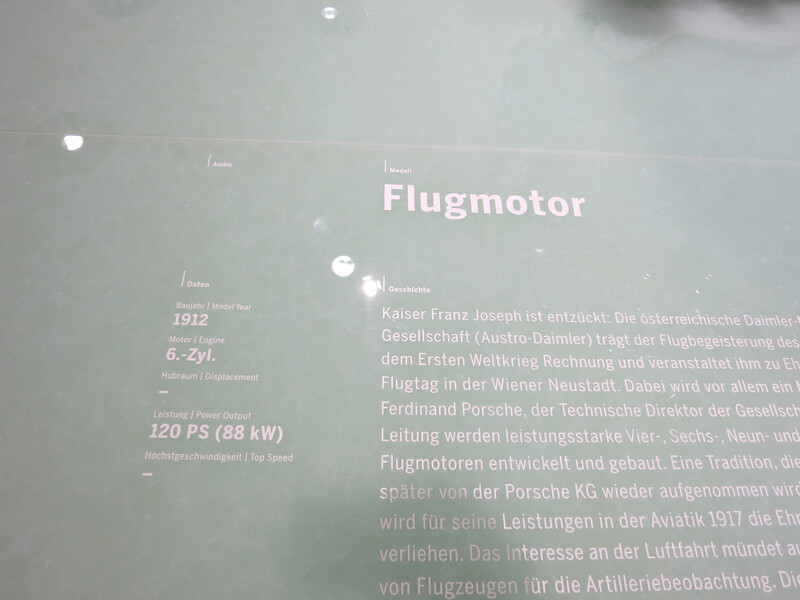 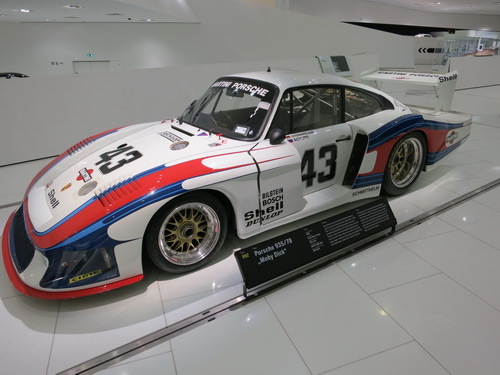 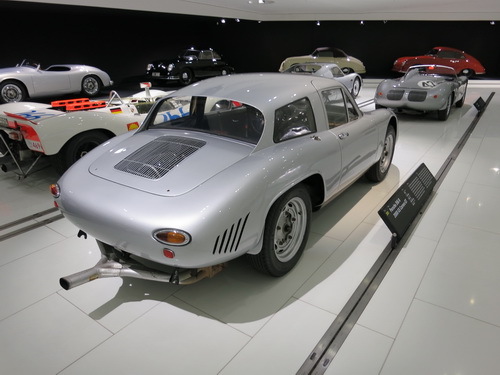 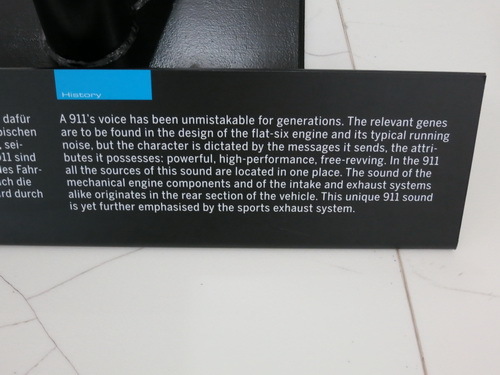 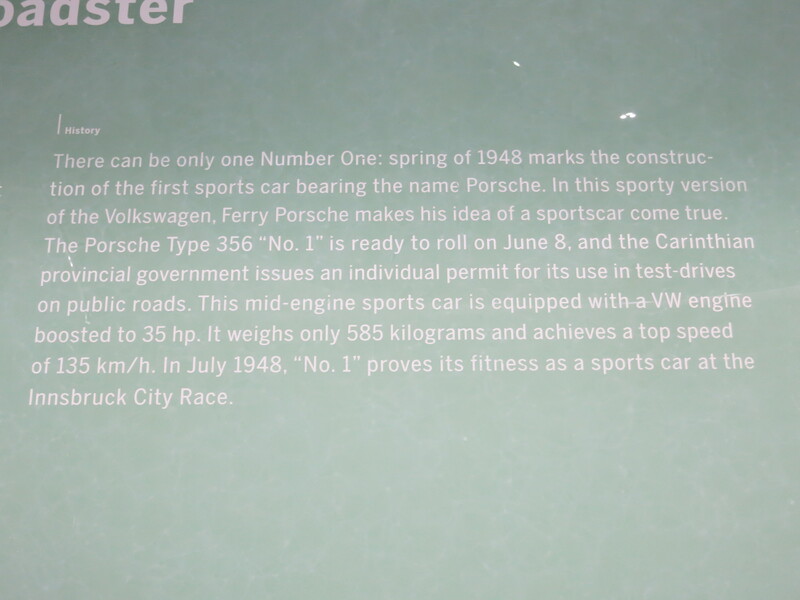 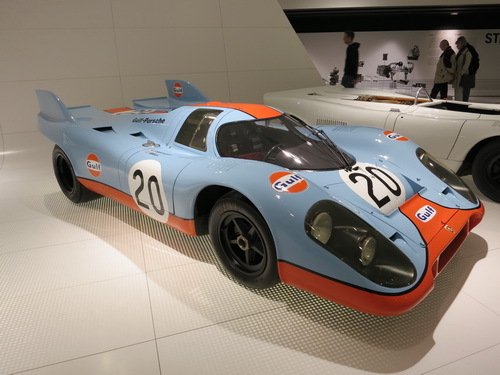 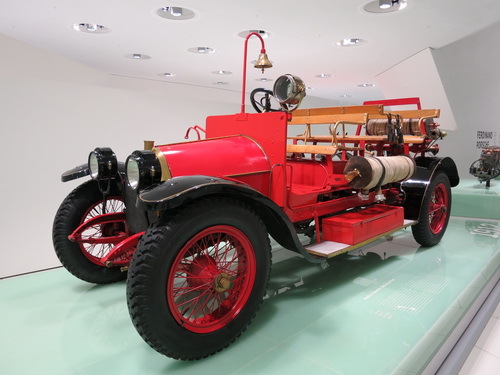 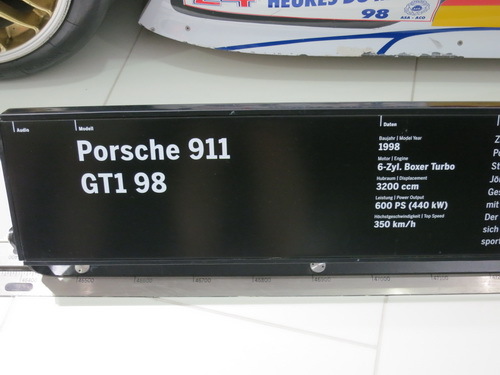 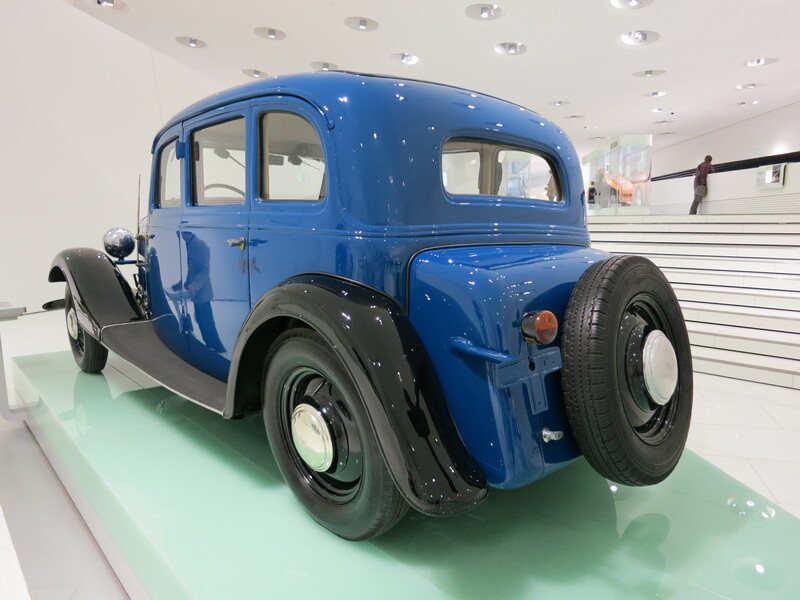 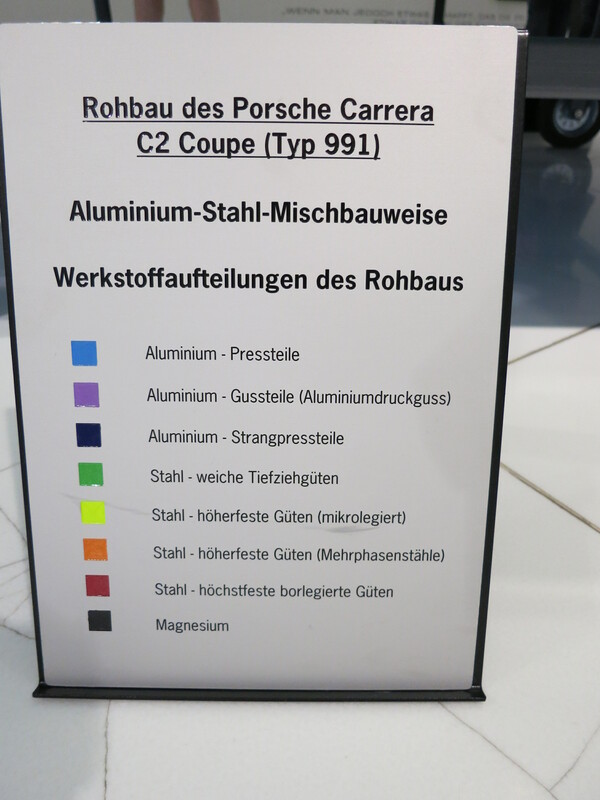 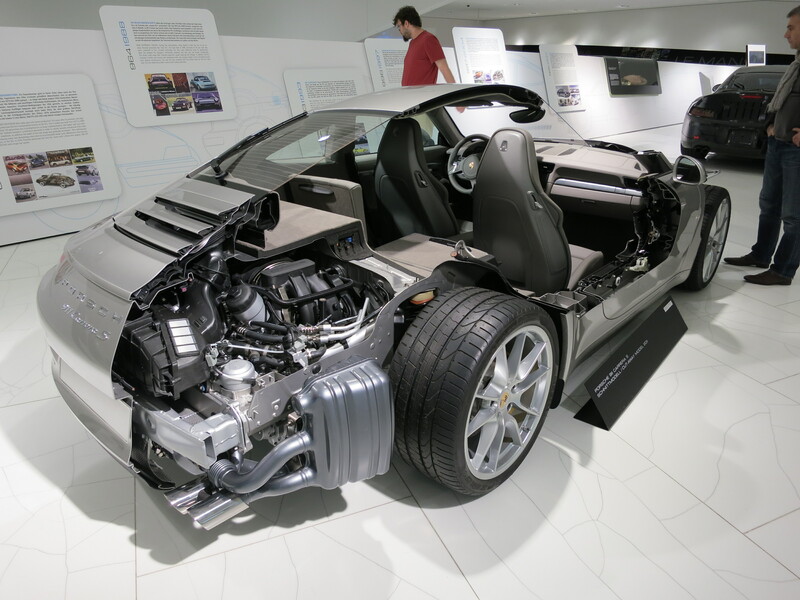 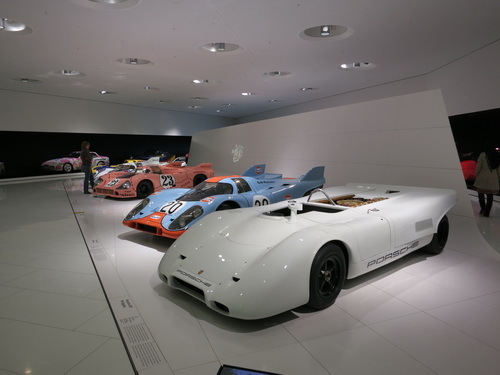 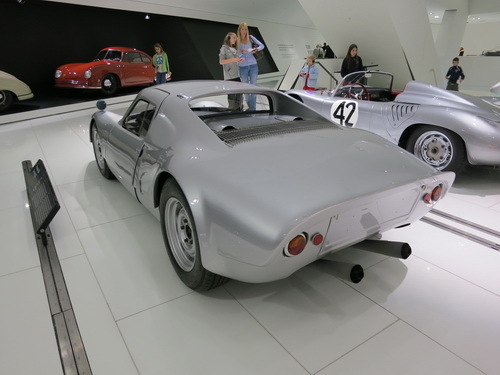 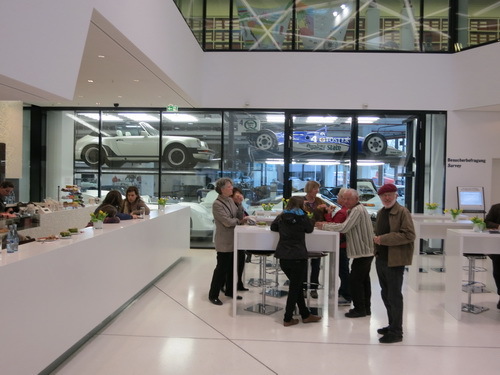 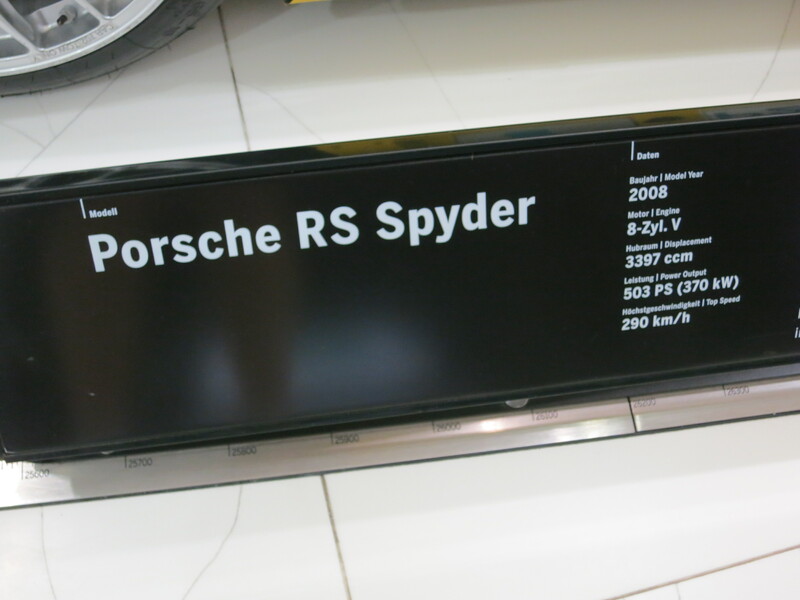 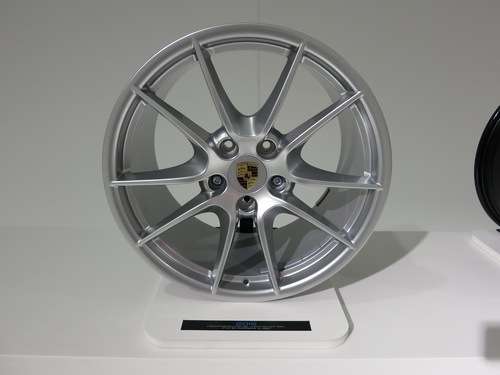 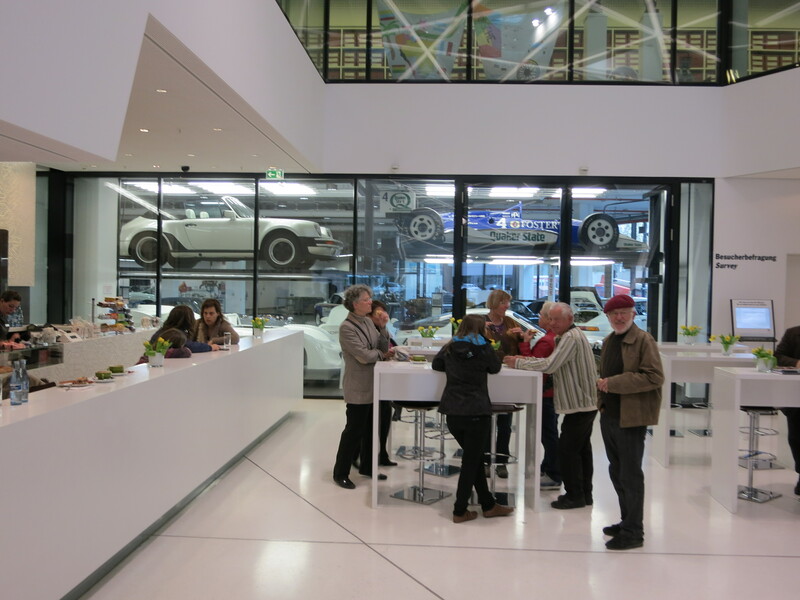 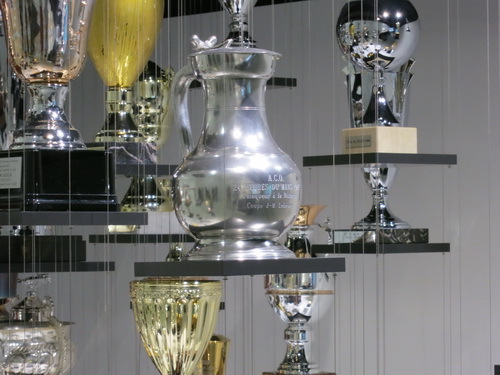 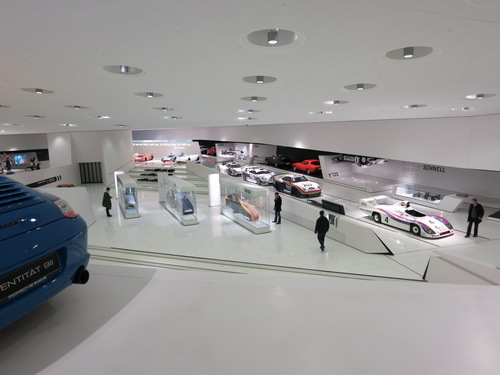 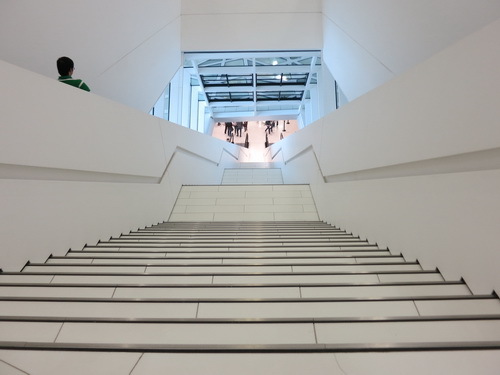 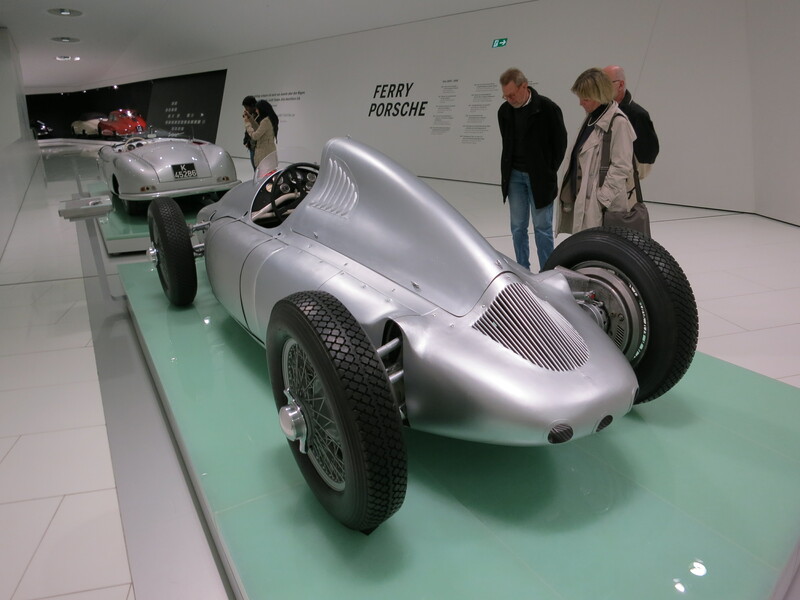 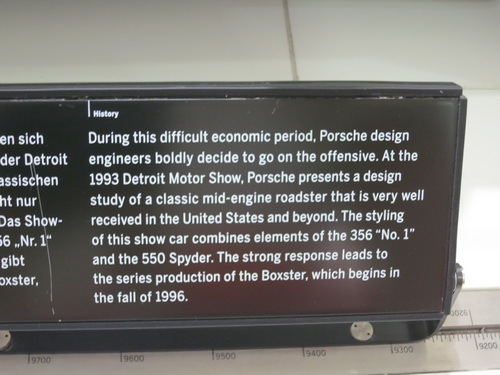 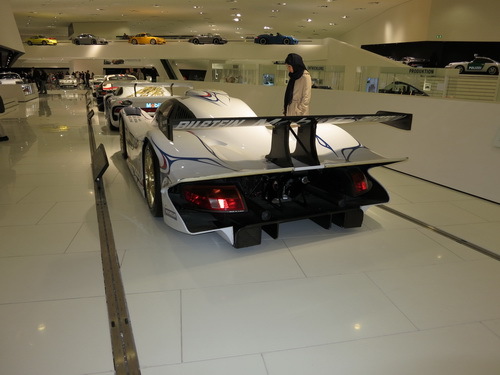 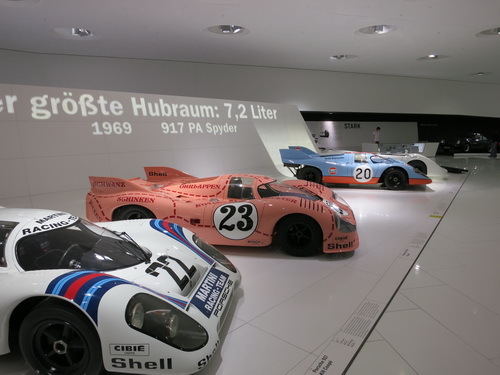 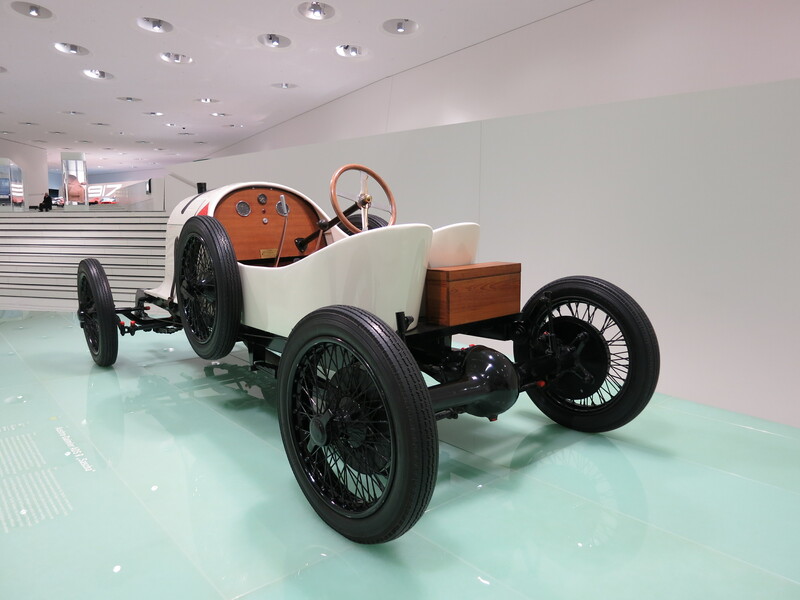 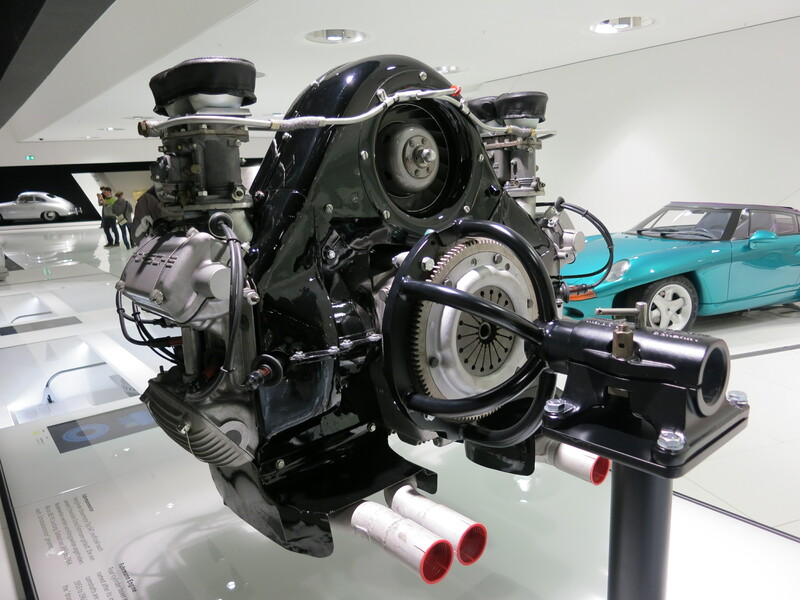 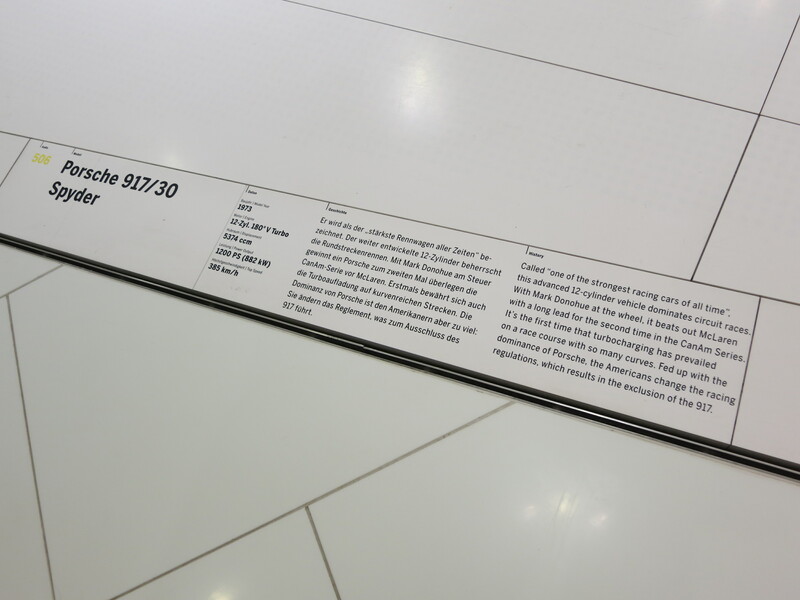 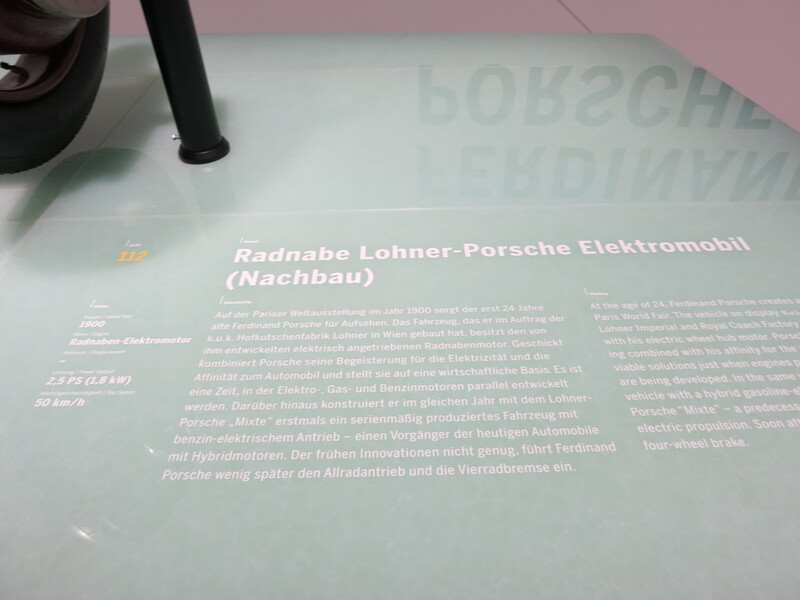 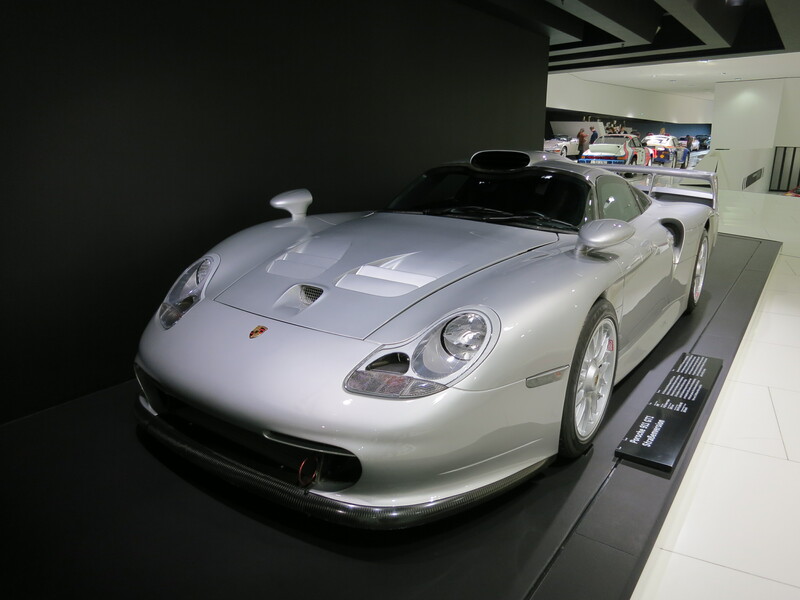 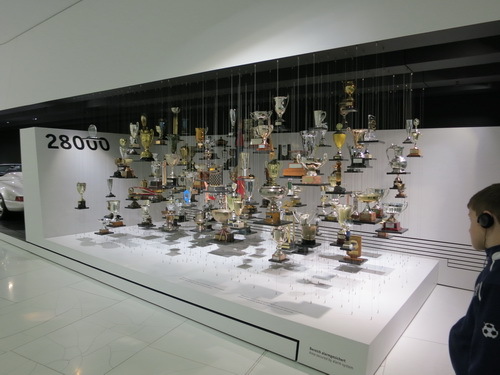 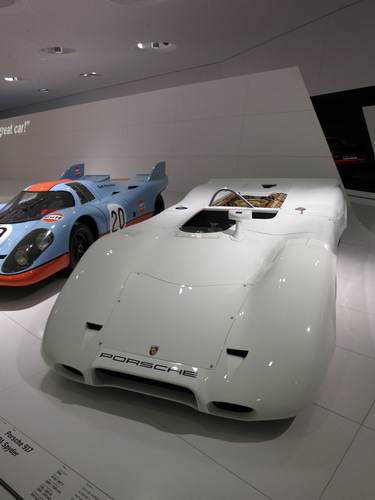 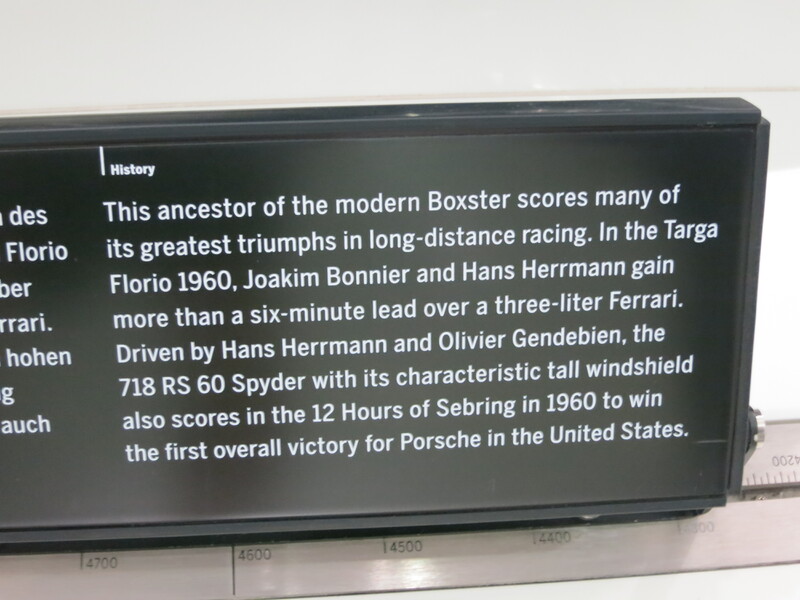 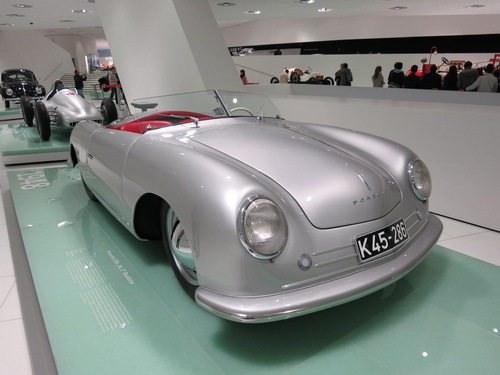 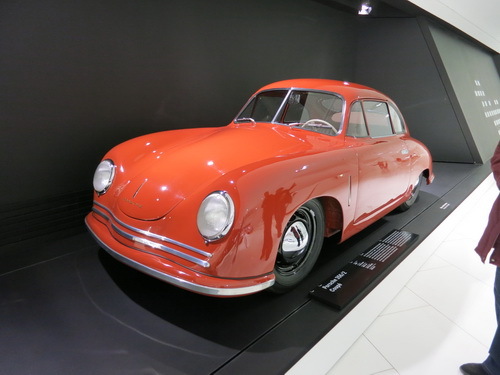 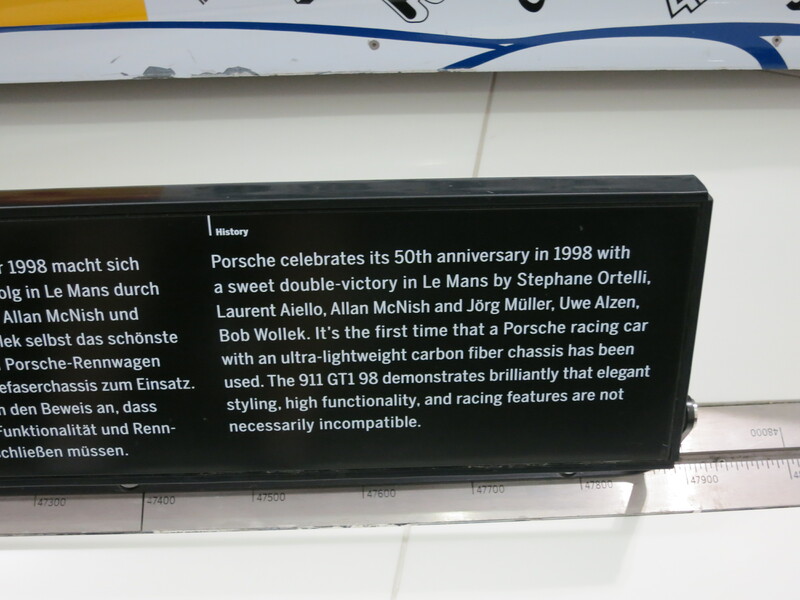 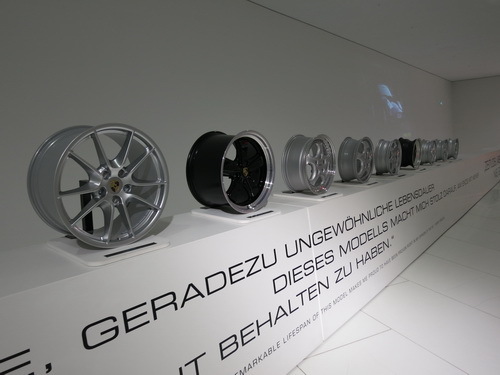 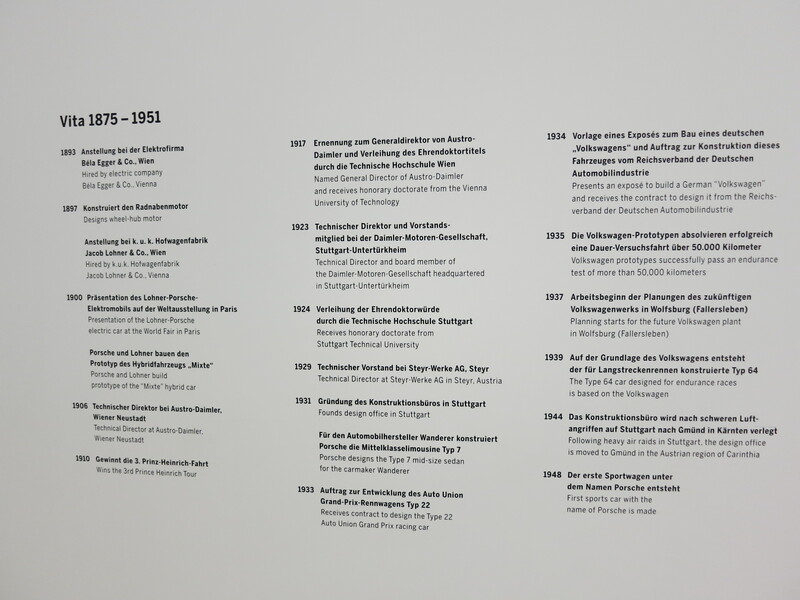 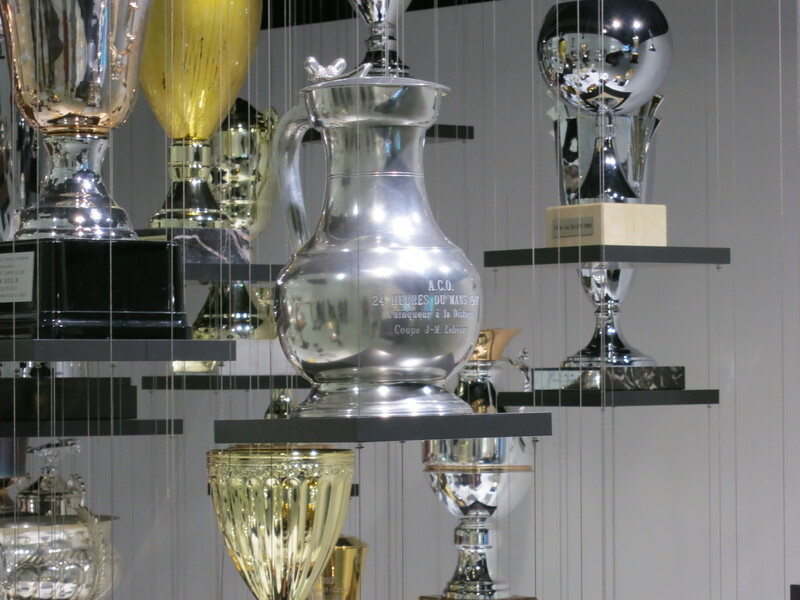 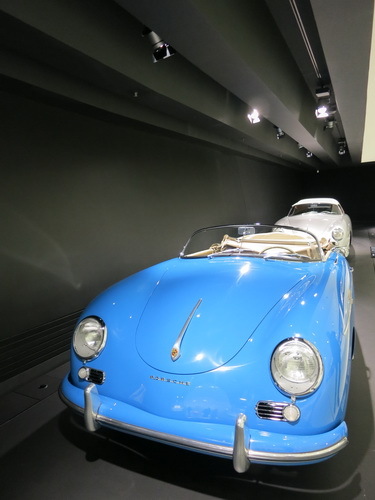 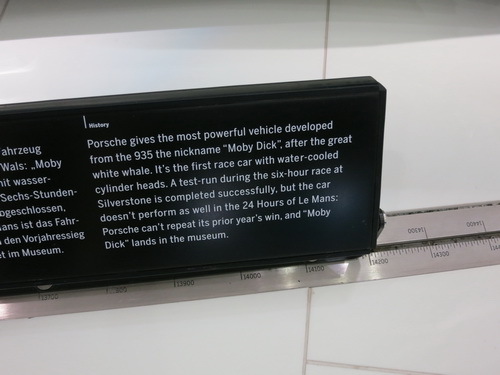 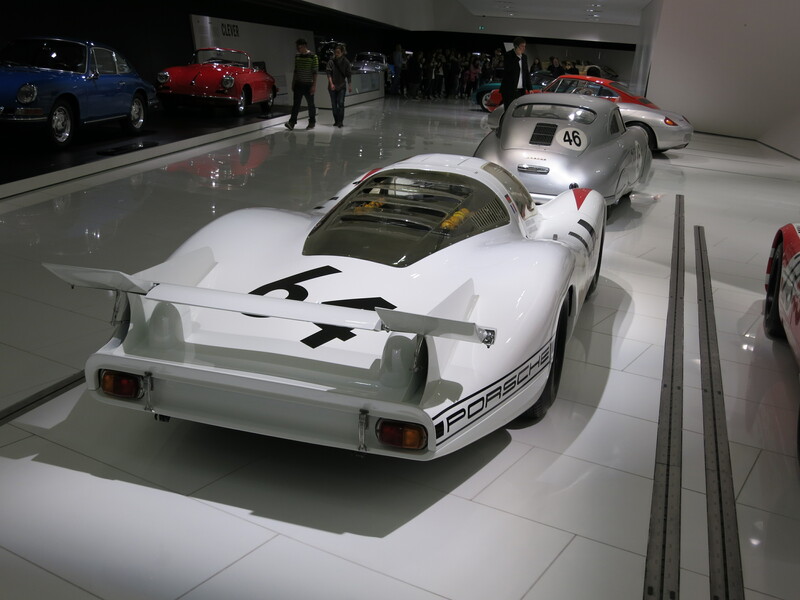 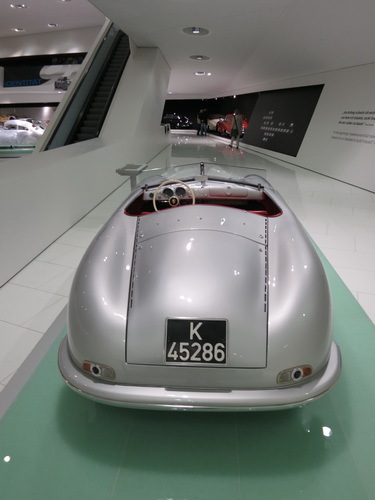 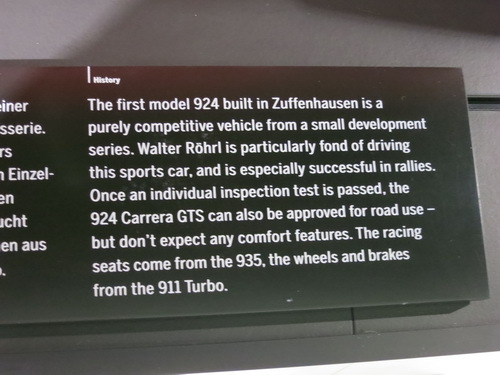 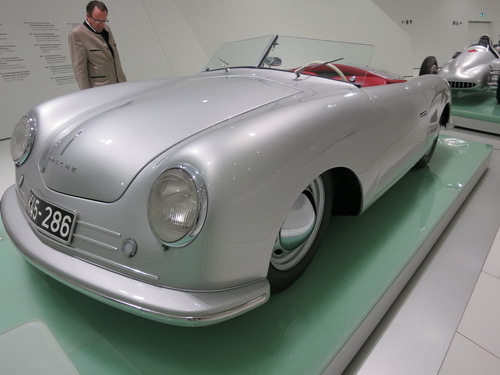 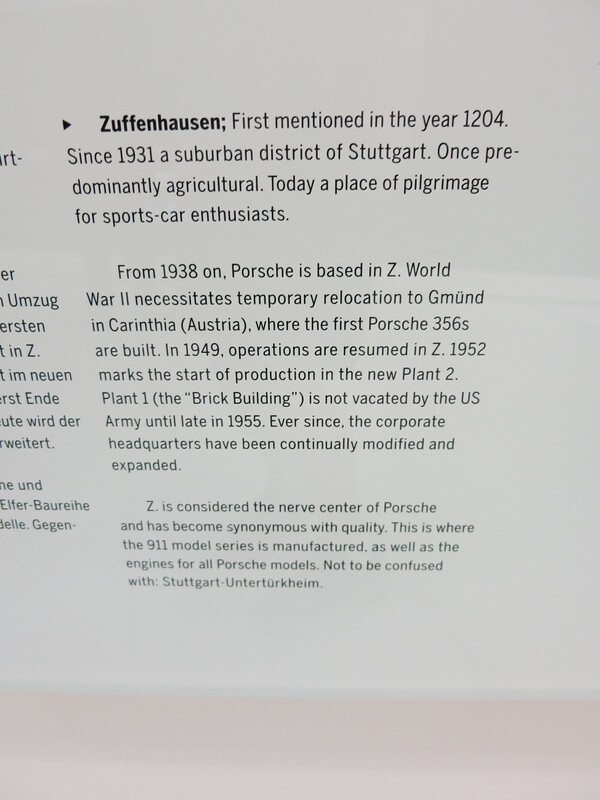 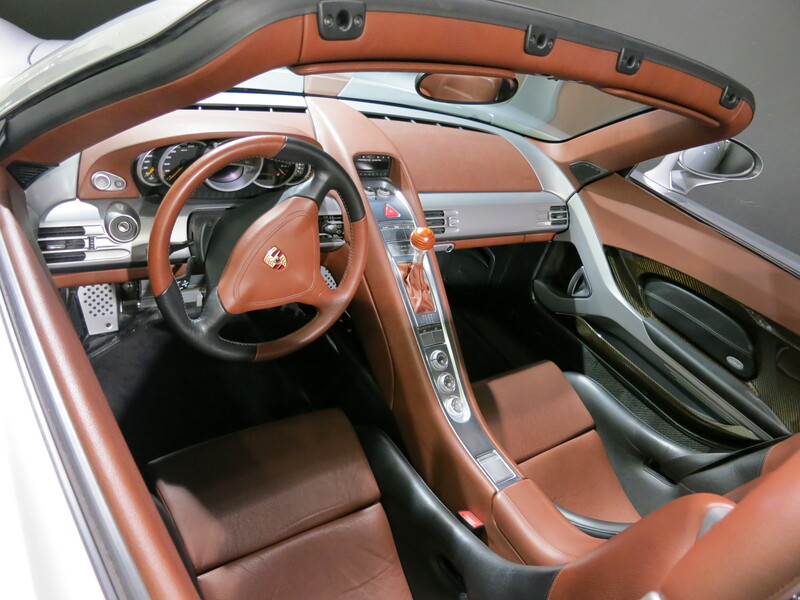 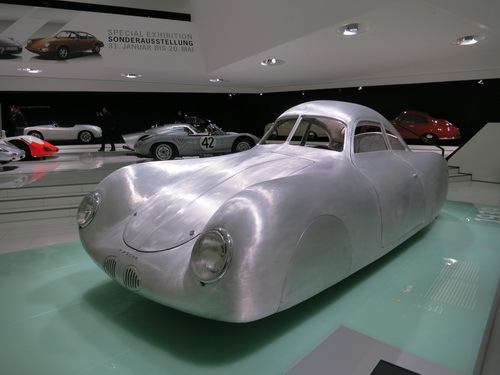 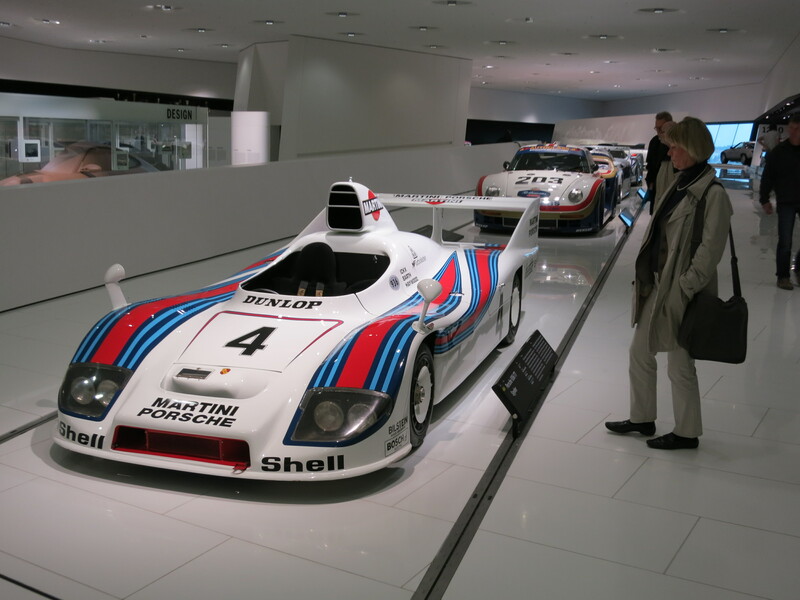 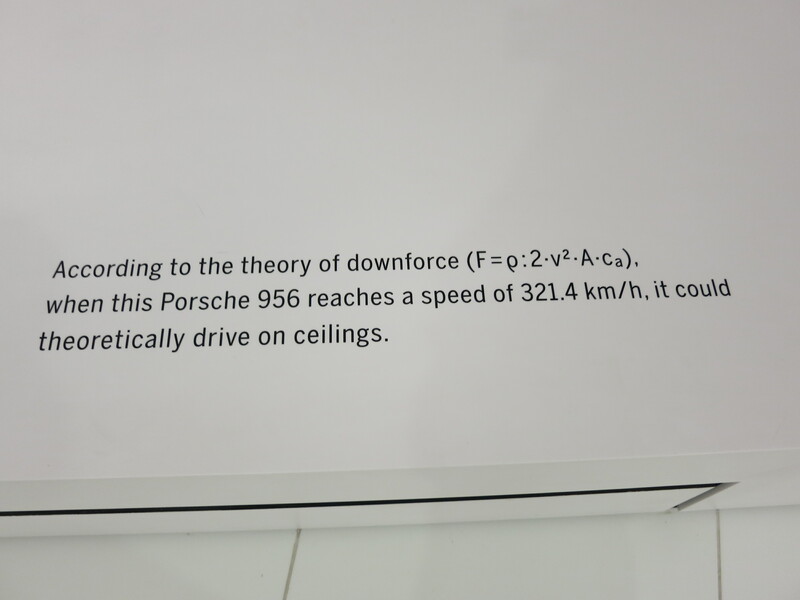 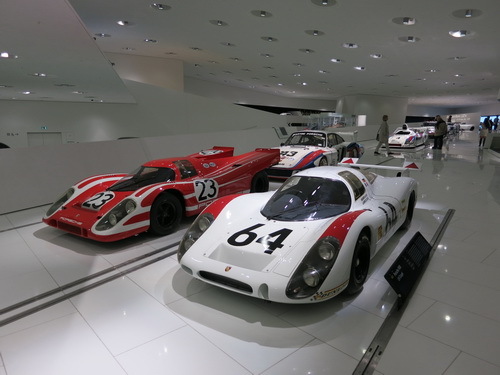 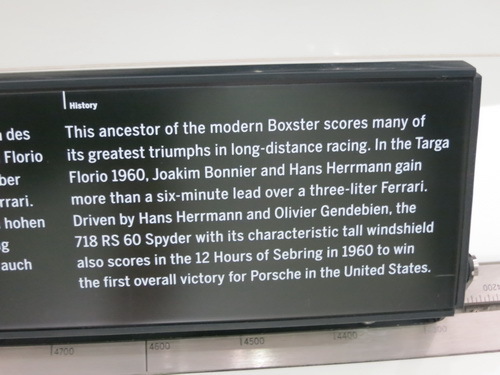 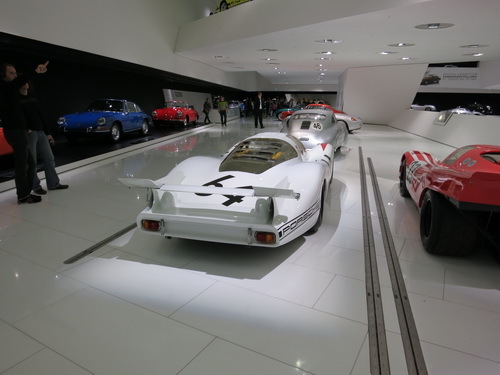 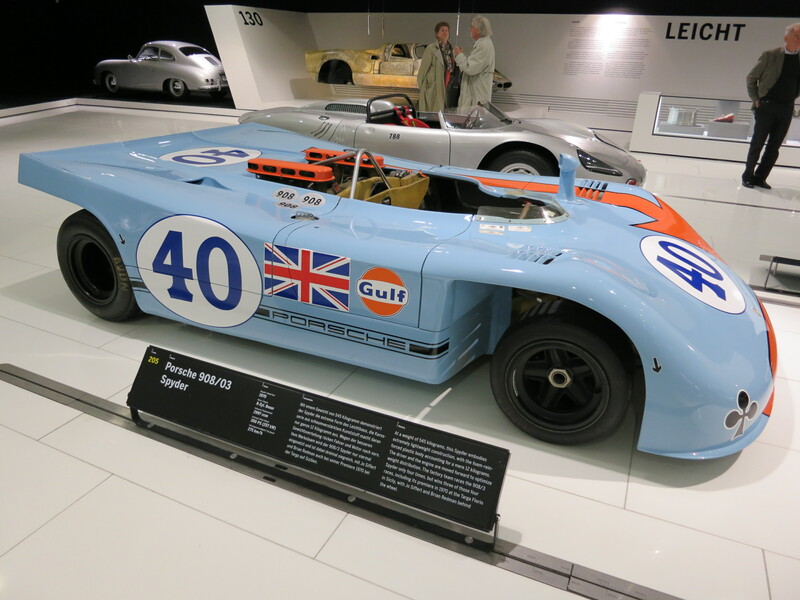 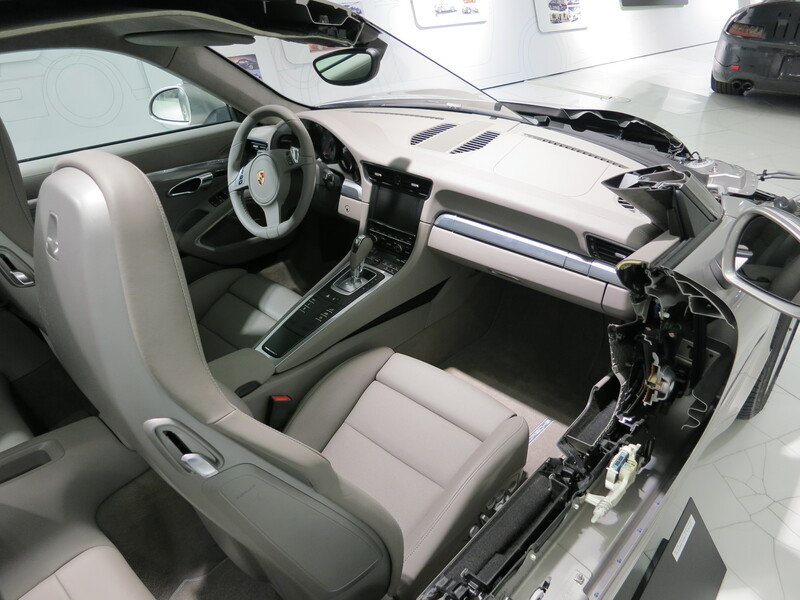 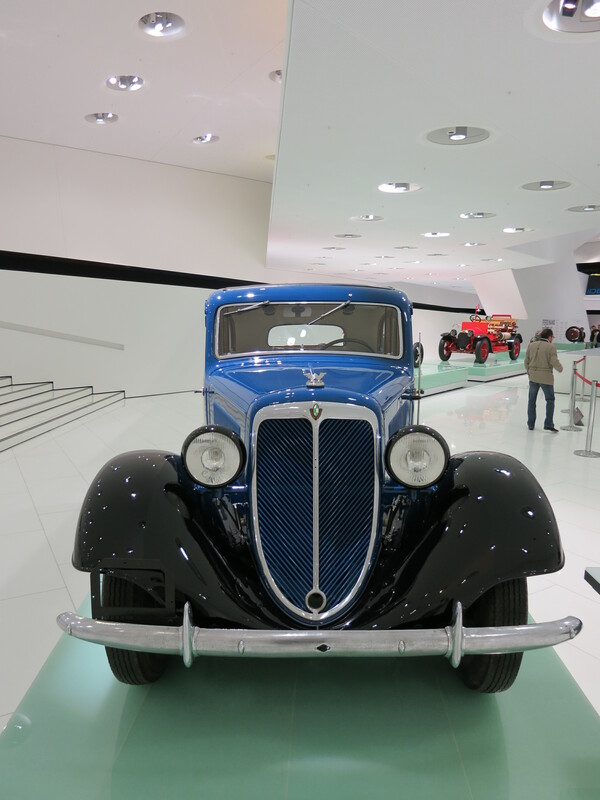 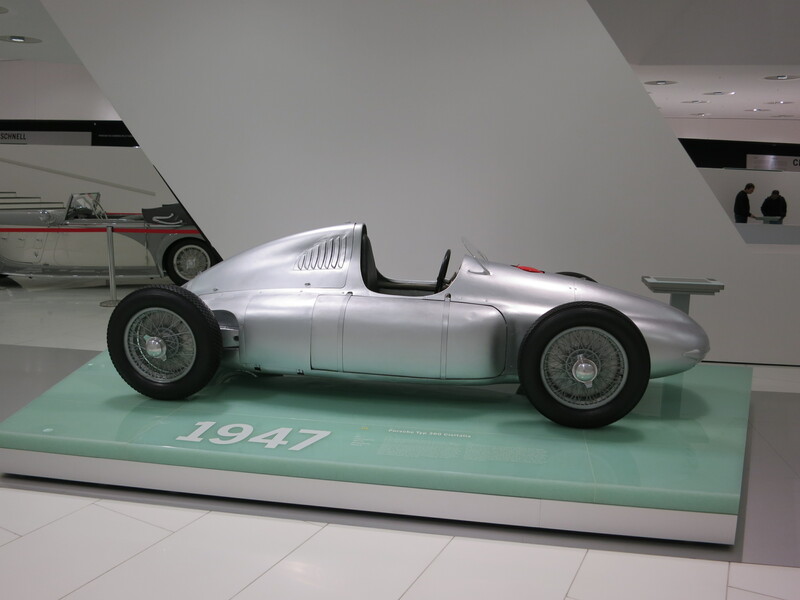 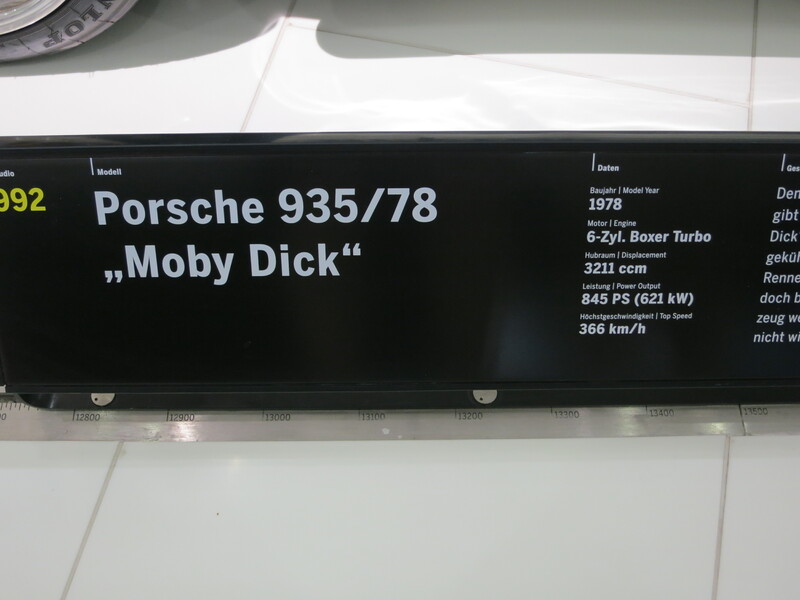 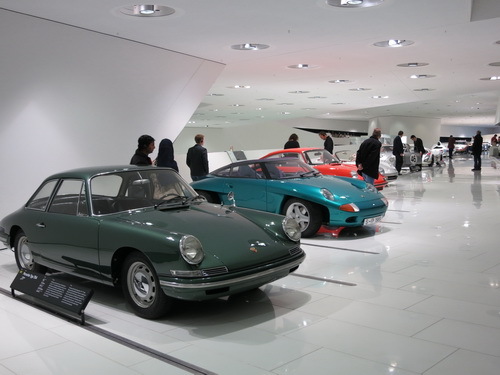 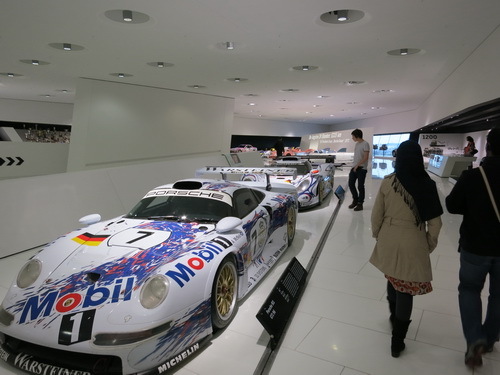 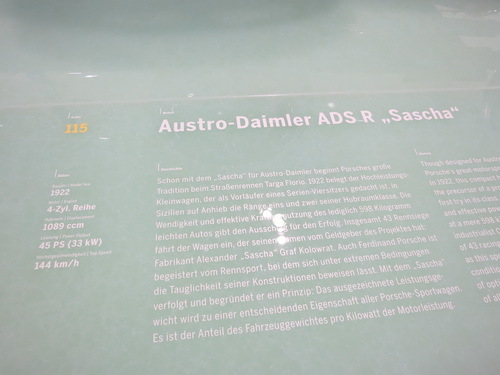 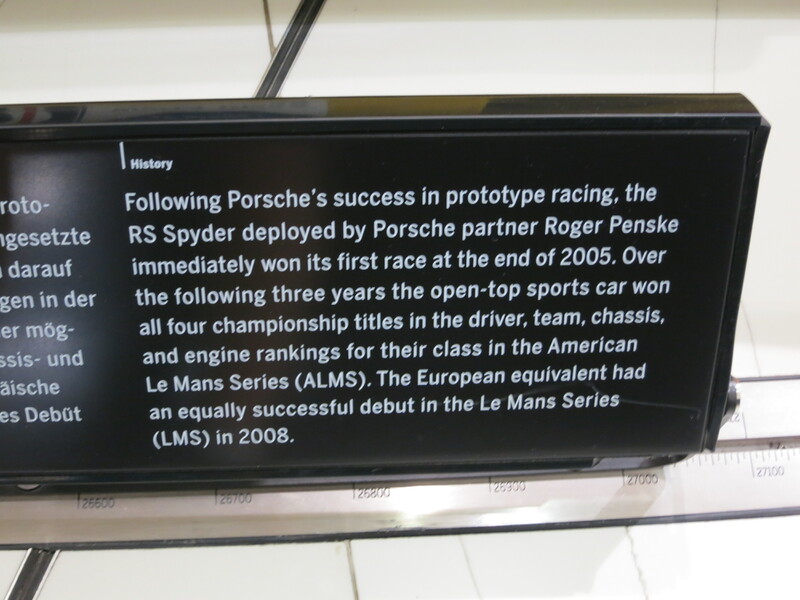 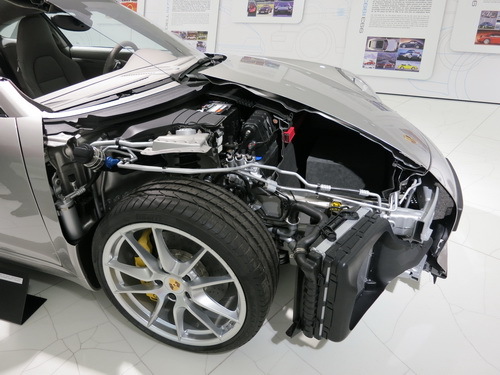 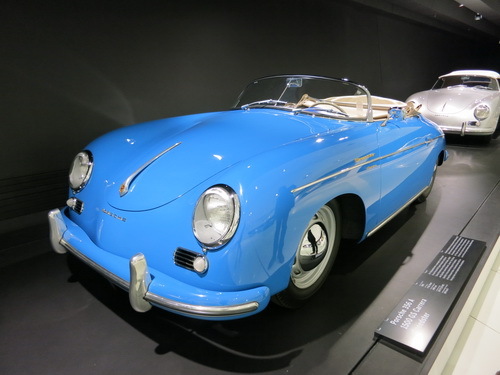 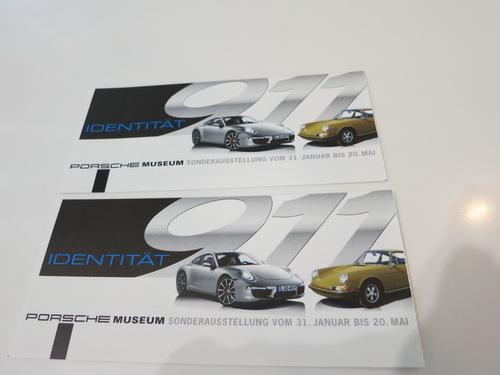 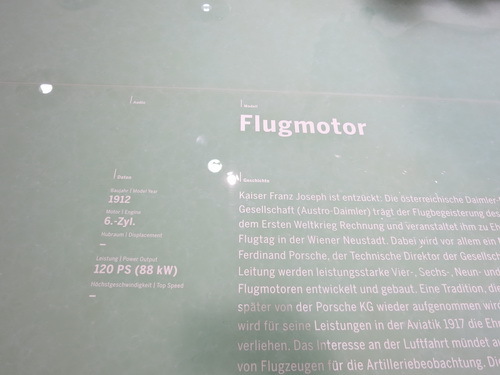 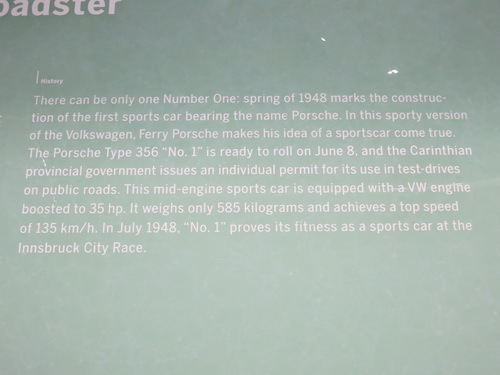 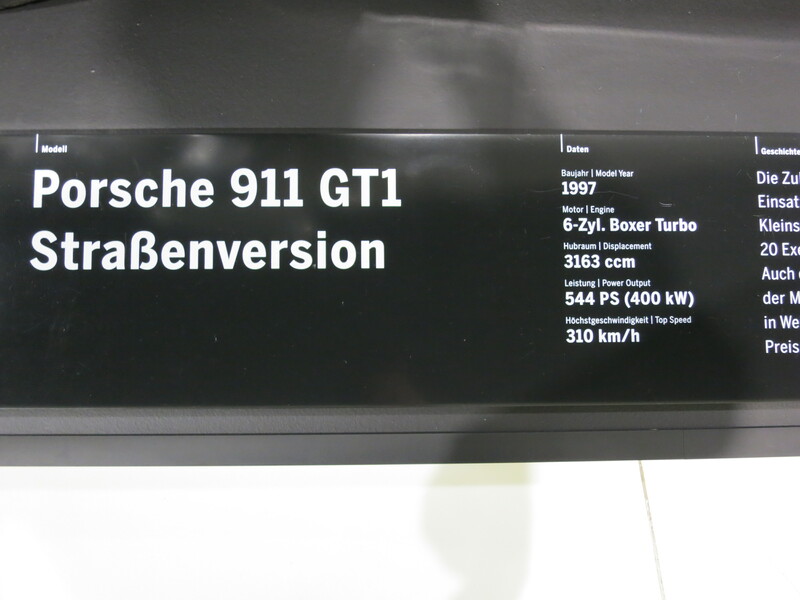 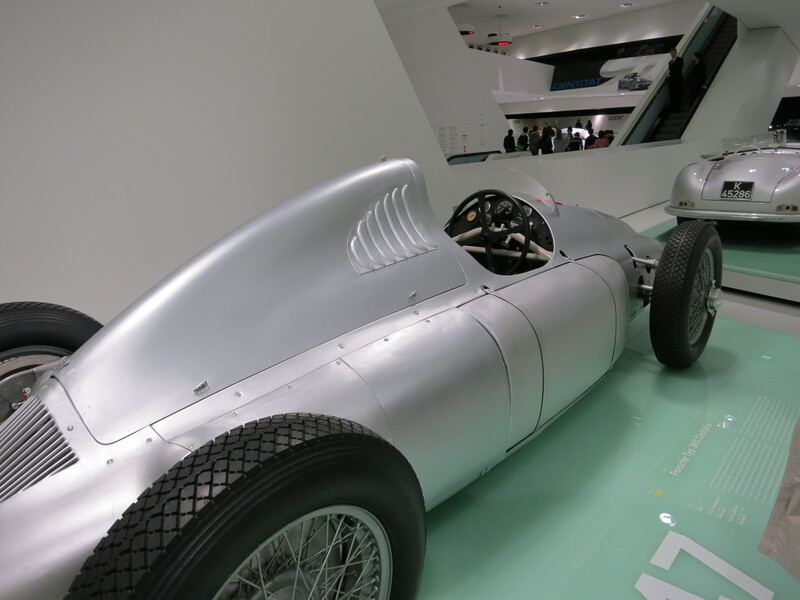 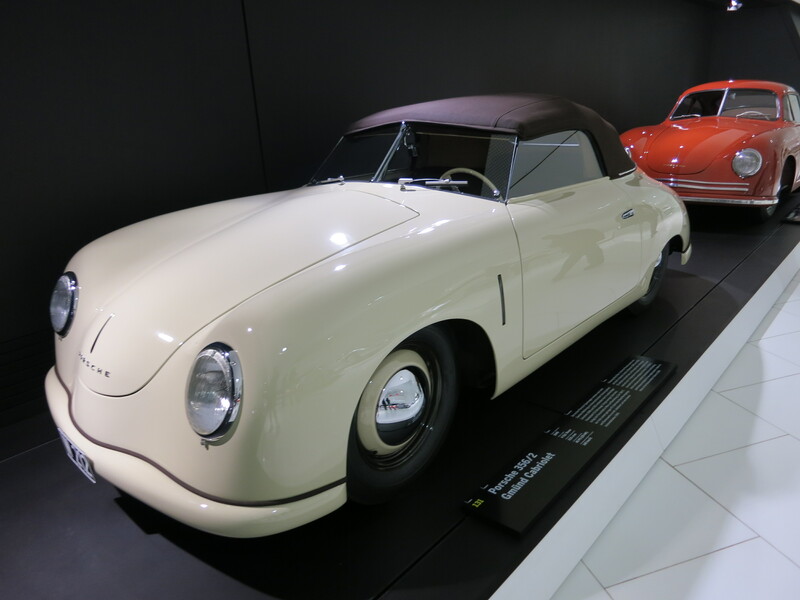 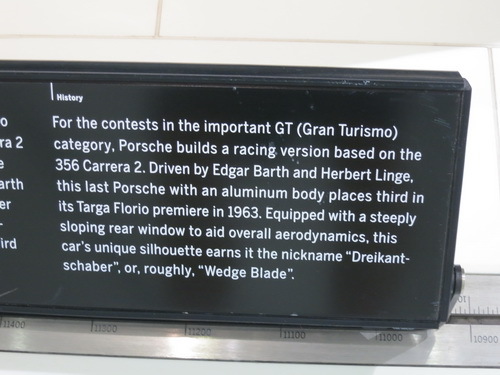 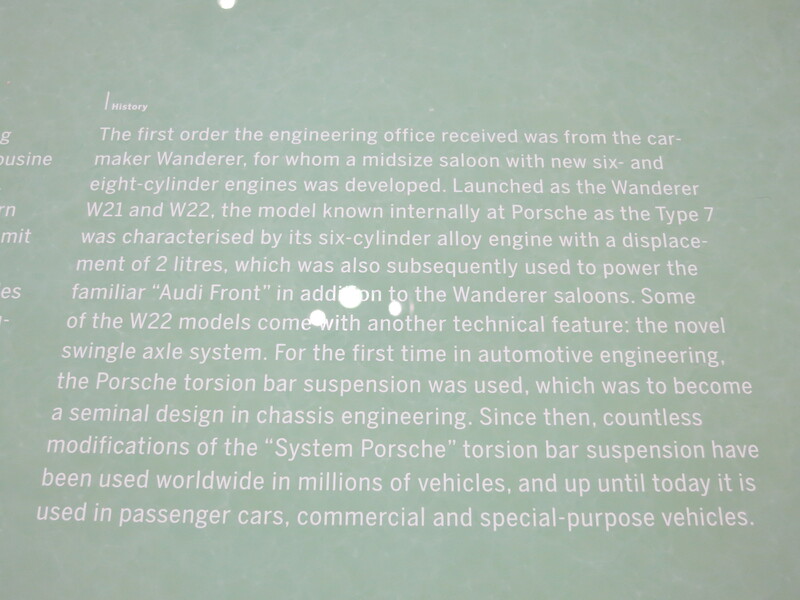 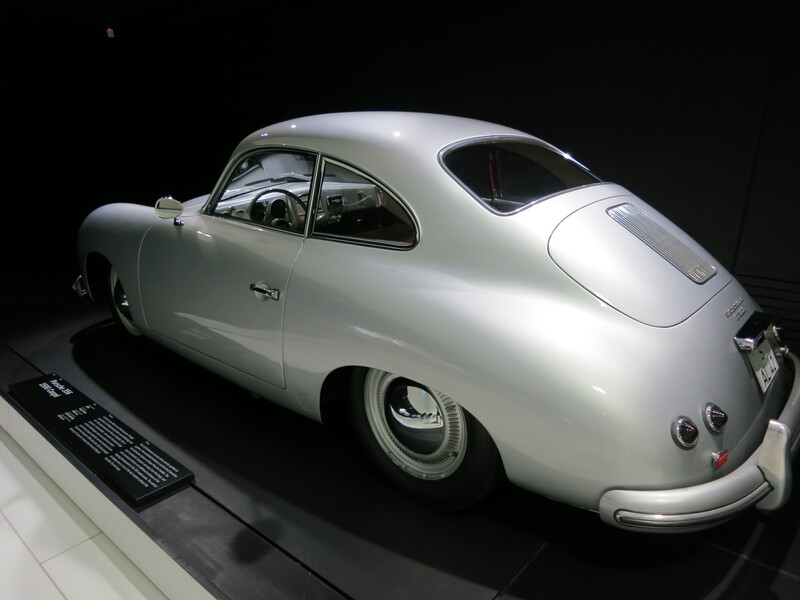 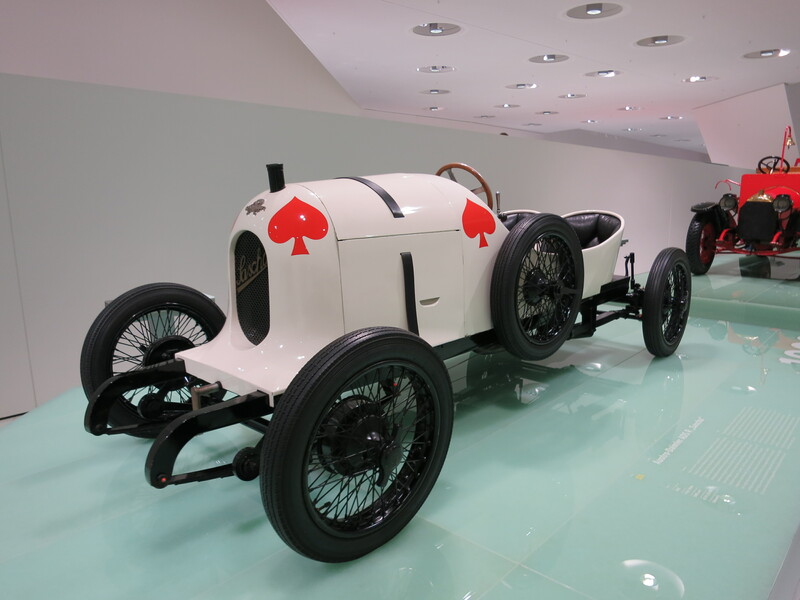 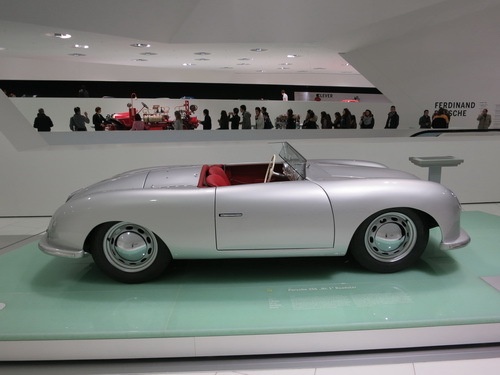 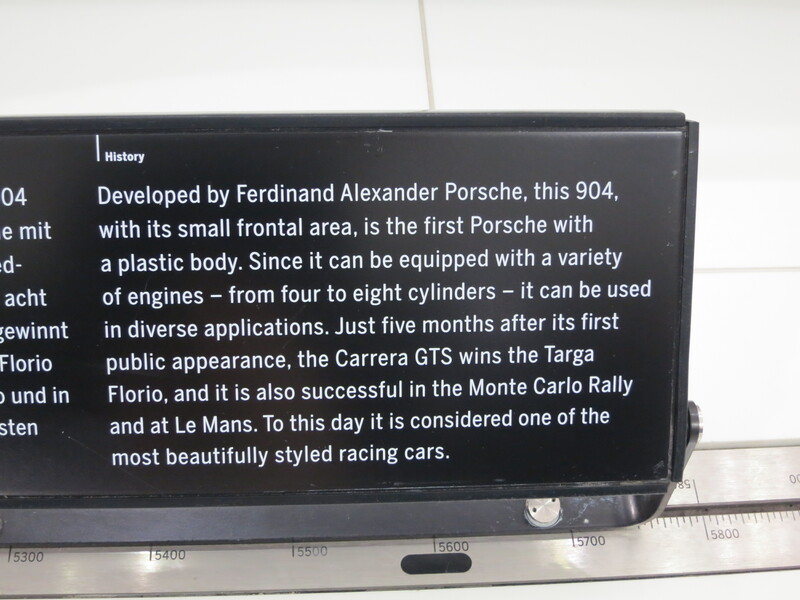 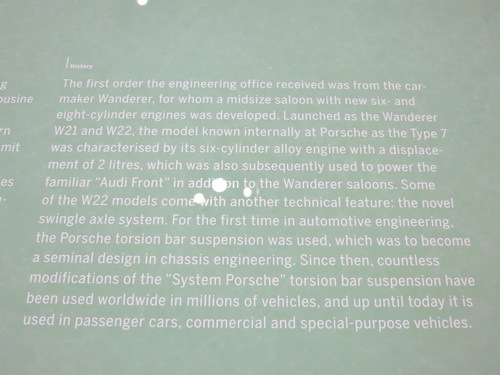 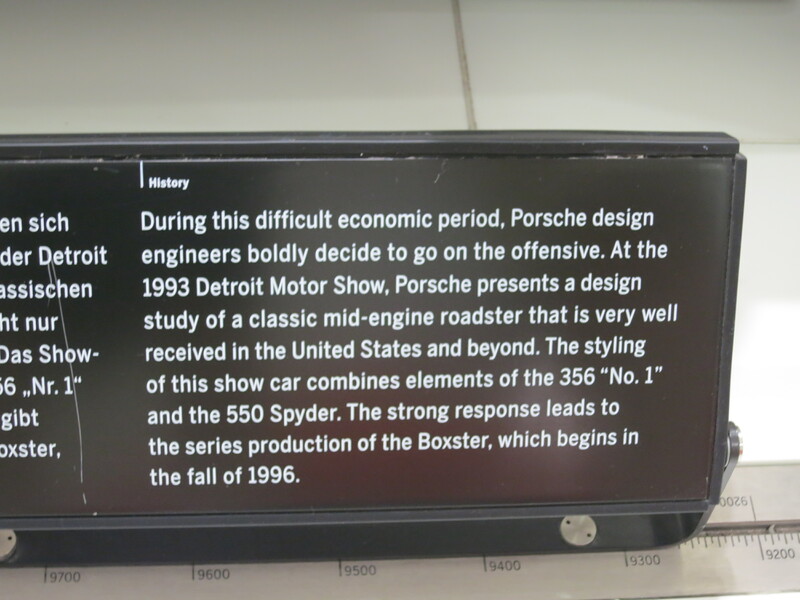 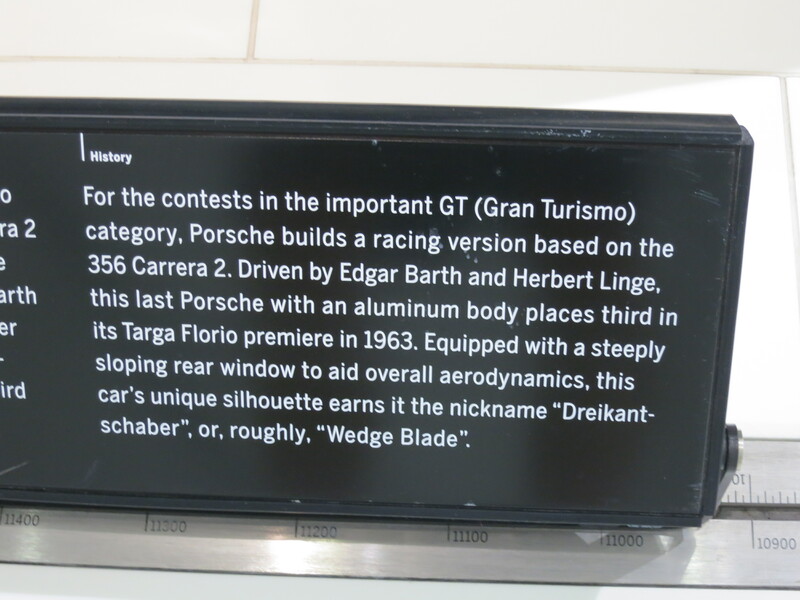 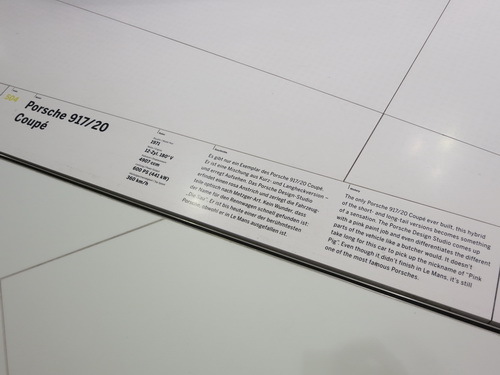 We got to the Porsche Museum at 3:40 p.m. and we spent nearly two hours examining the cars and the exhibits. 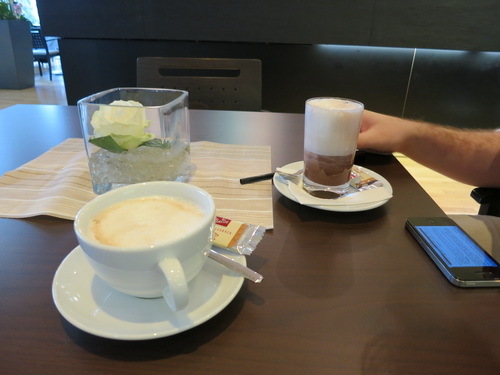 It only took us perhaps 30 minutes to get back to the hotel, we checked in, hung out for a little while, and then went downstairs for dinner and turned in early.